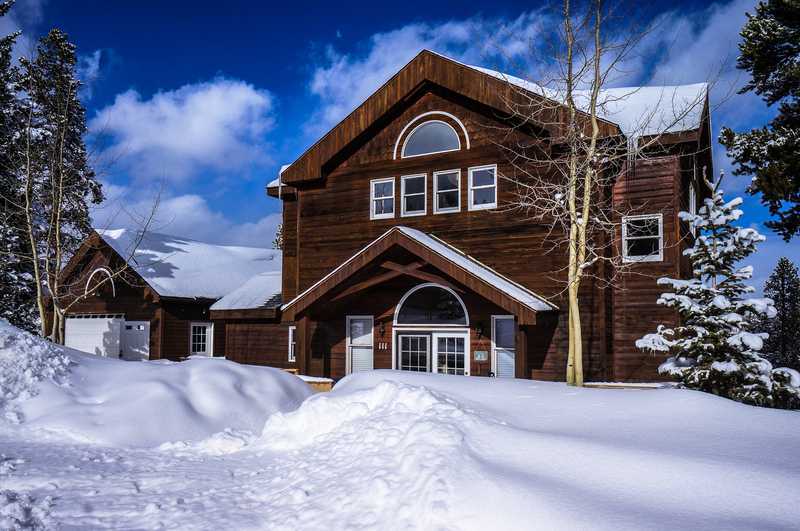 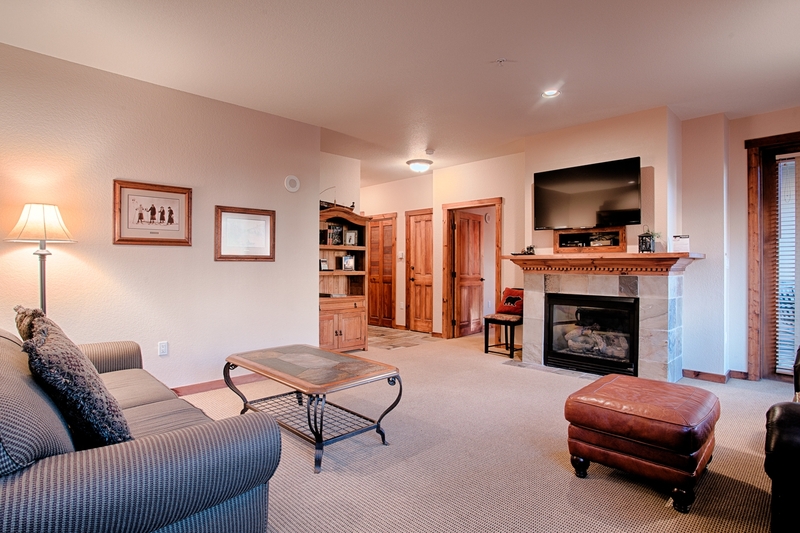 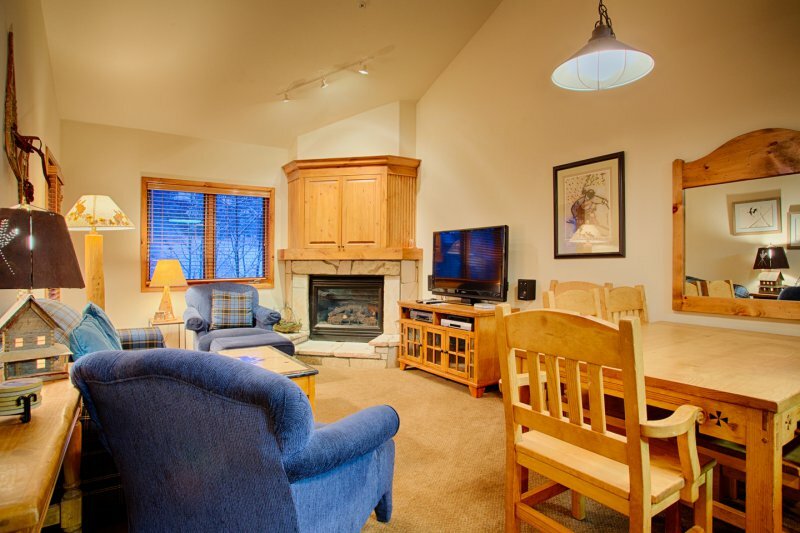 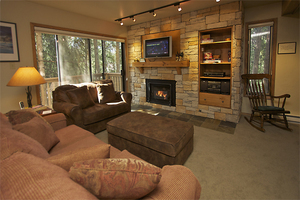 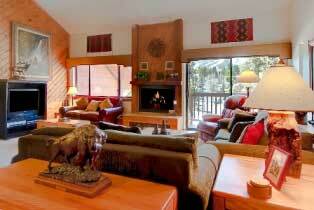 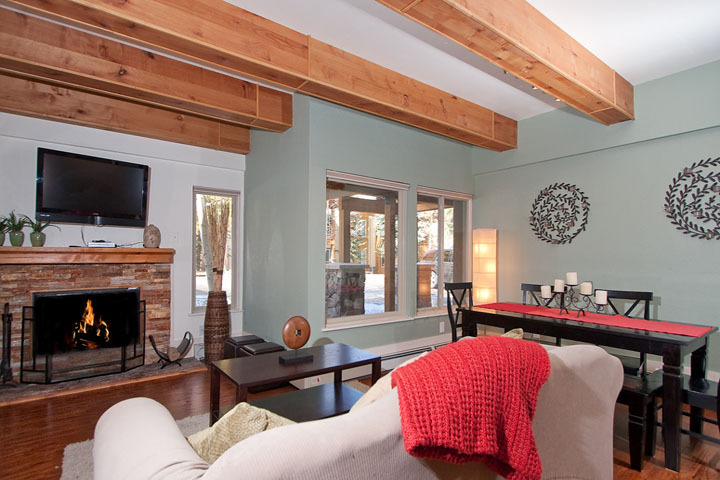 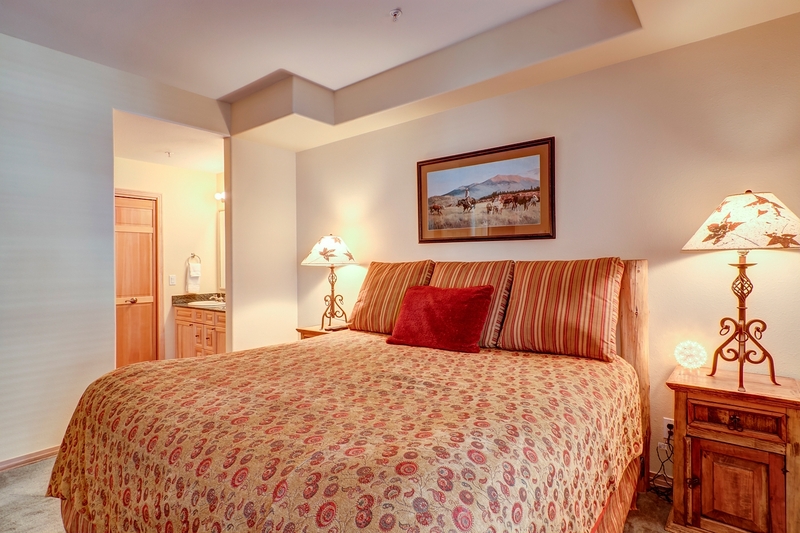 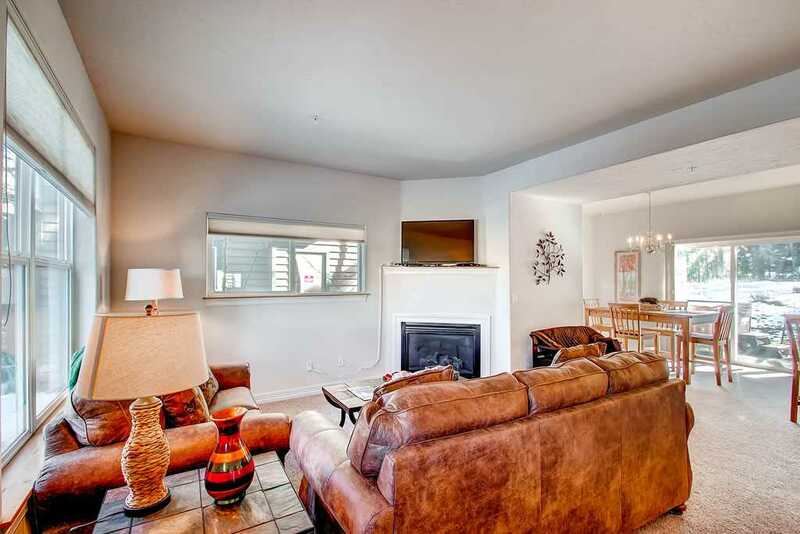 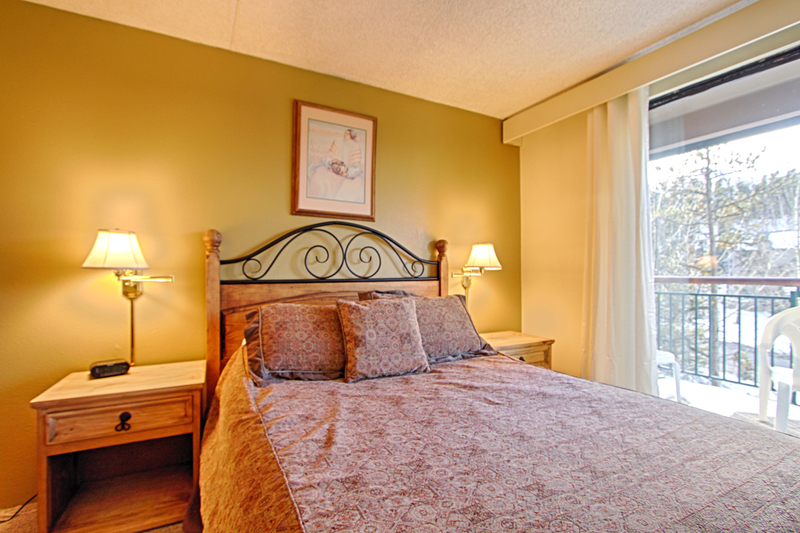 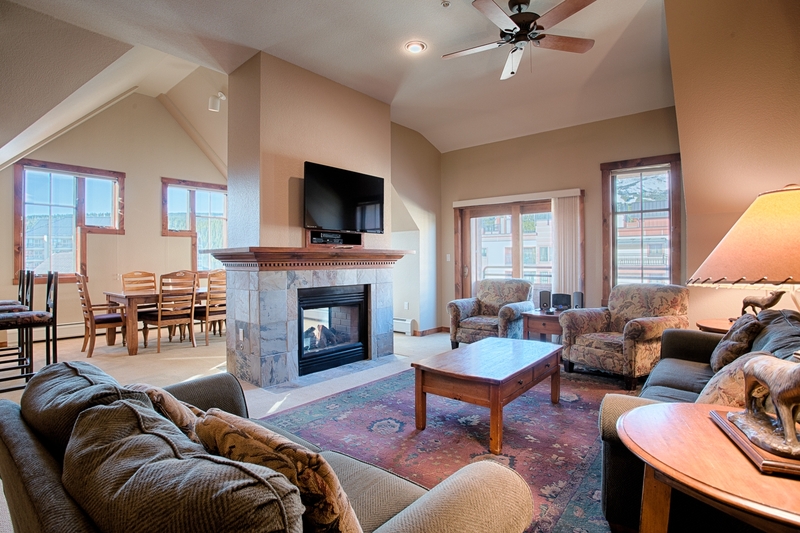 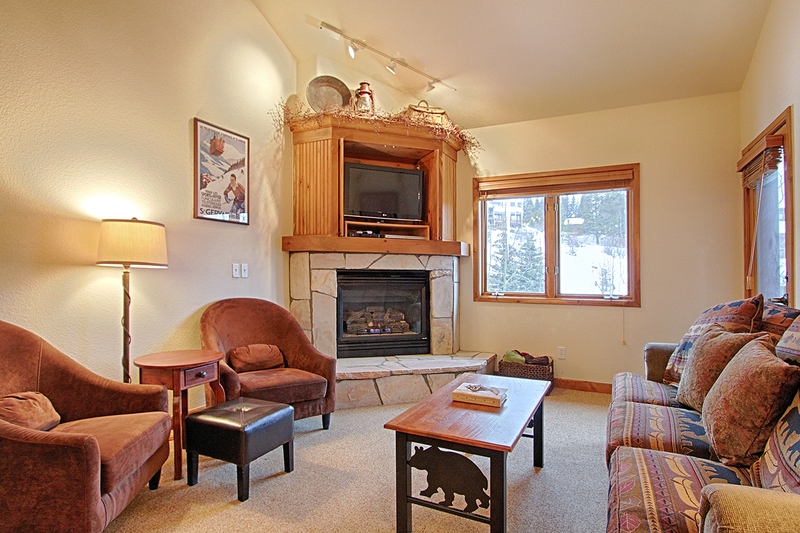 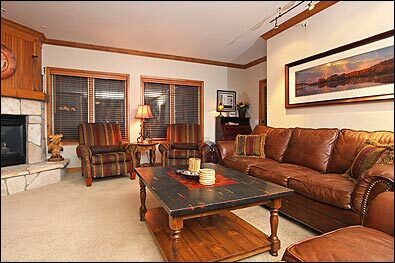 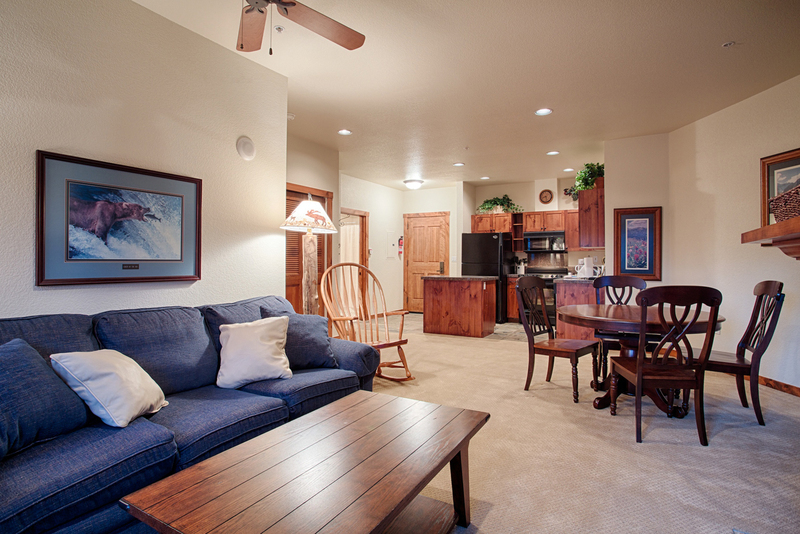 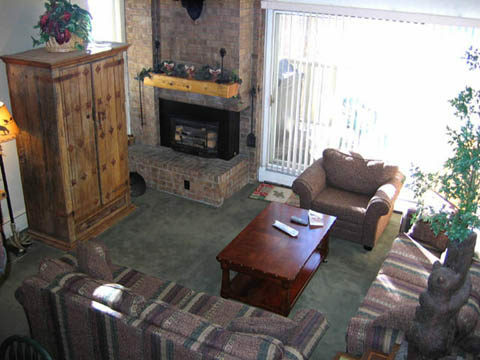 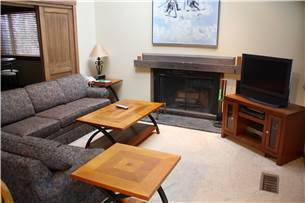 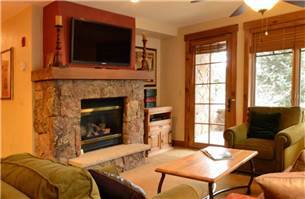 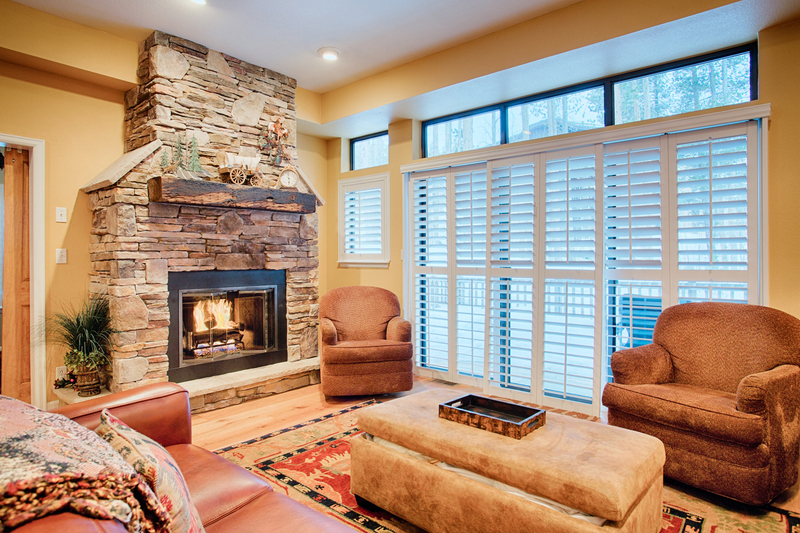 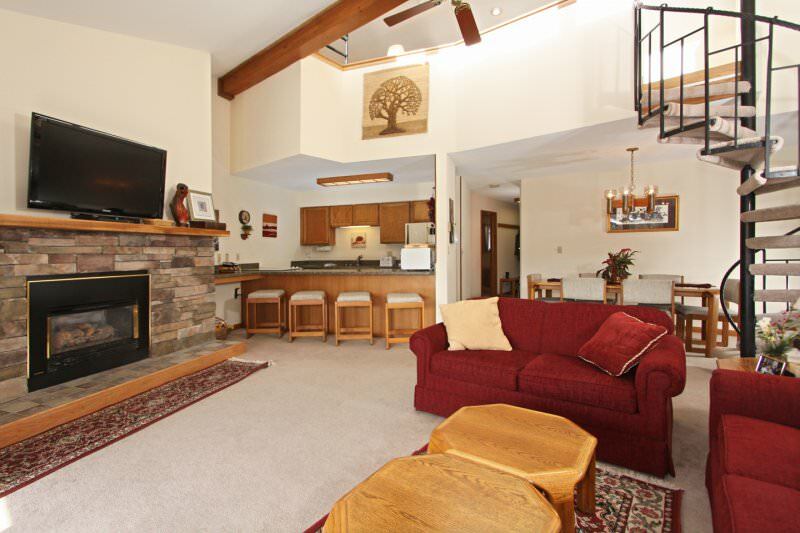 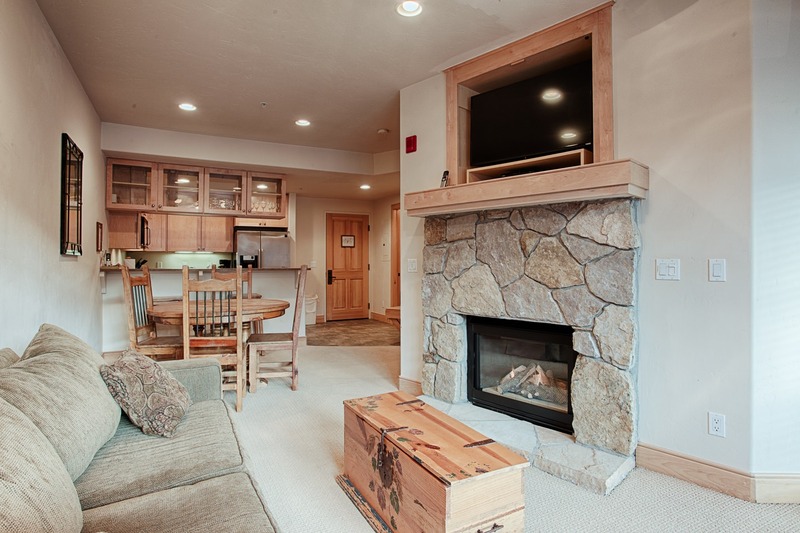 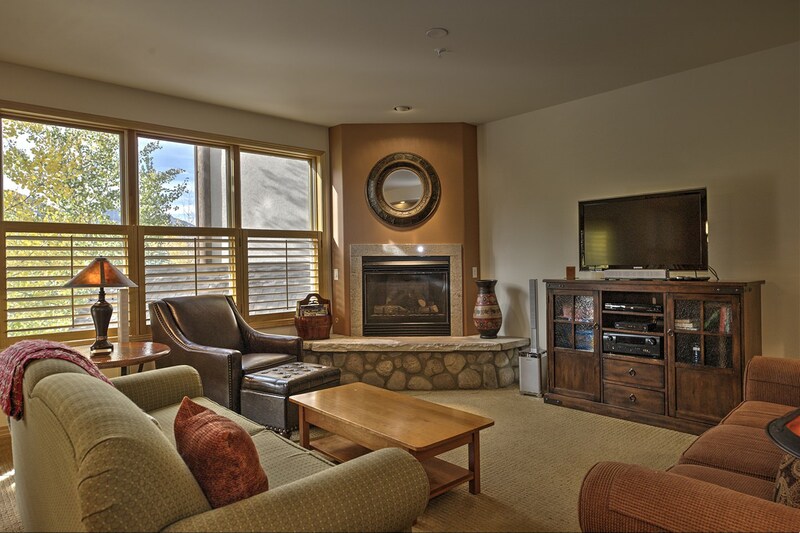 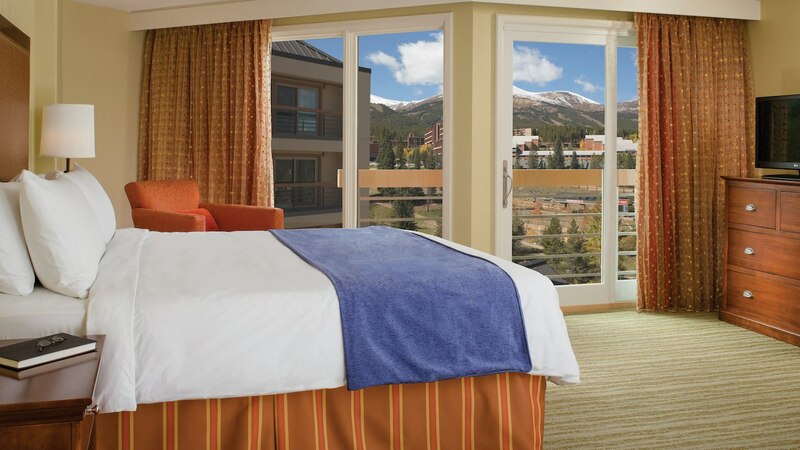 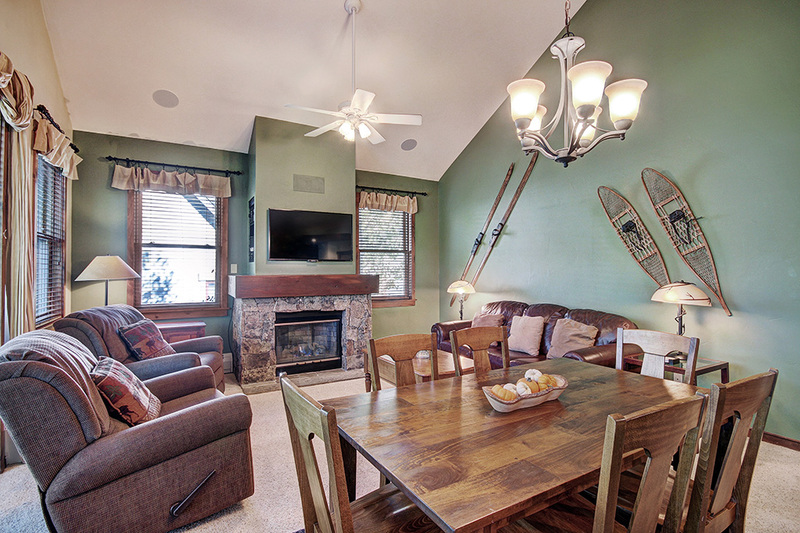 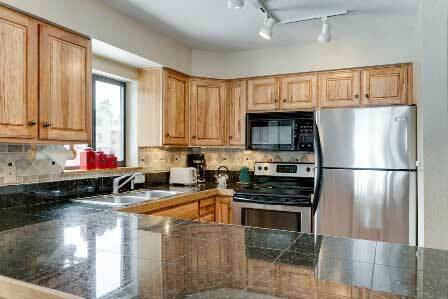 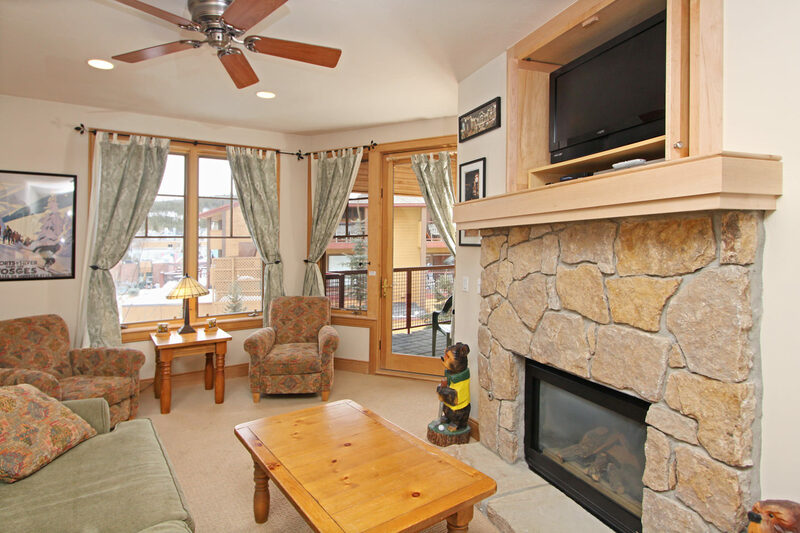 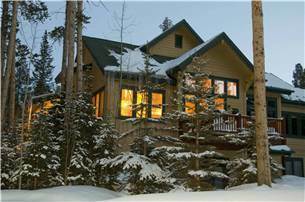 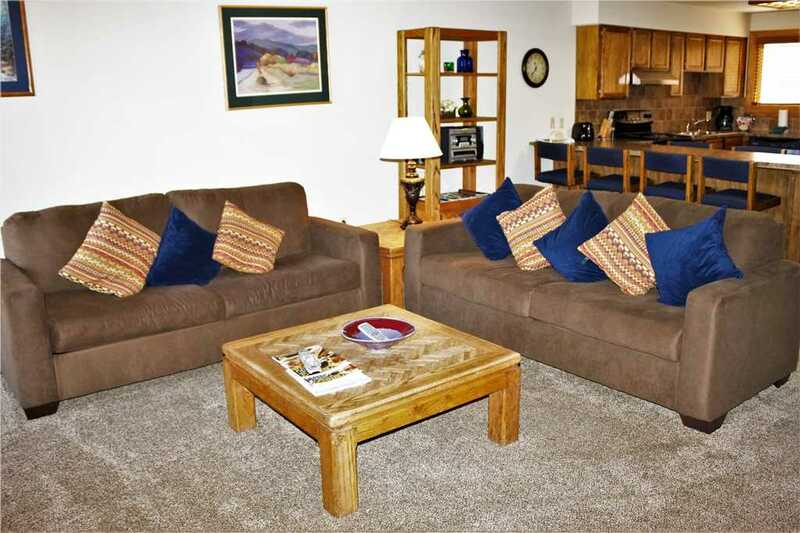 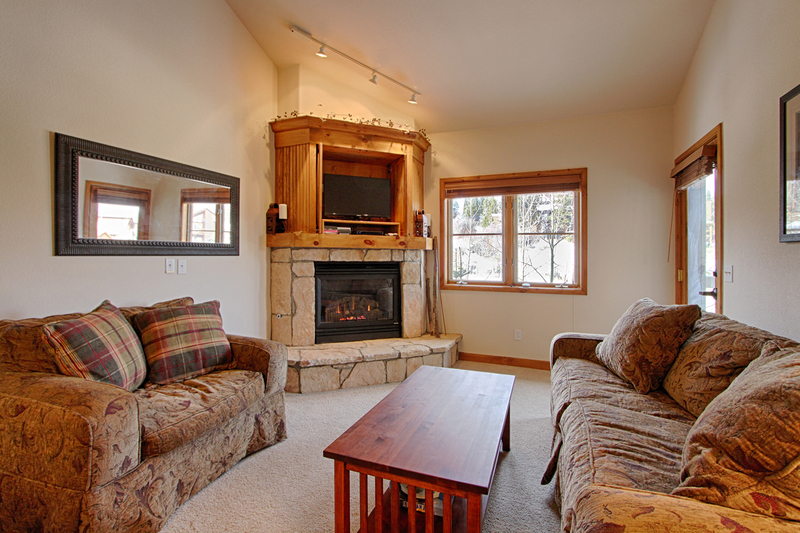 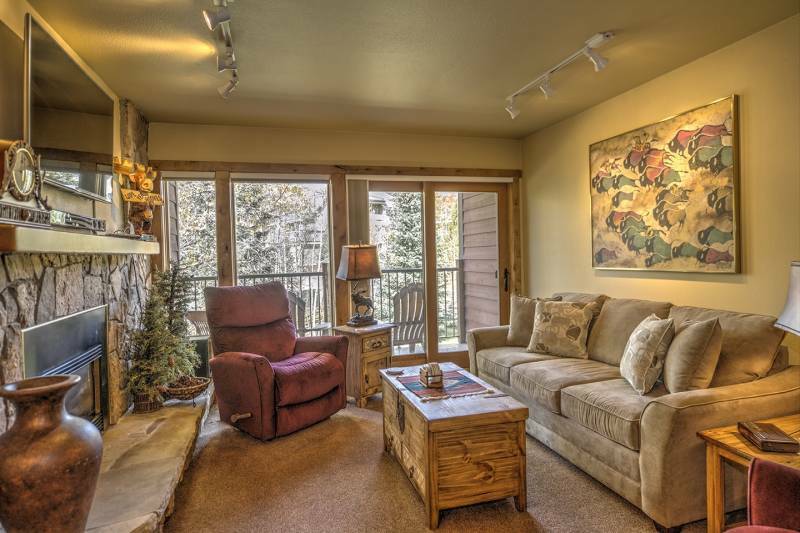 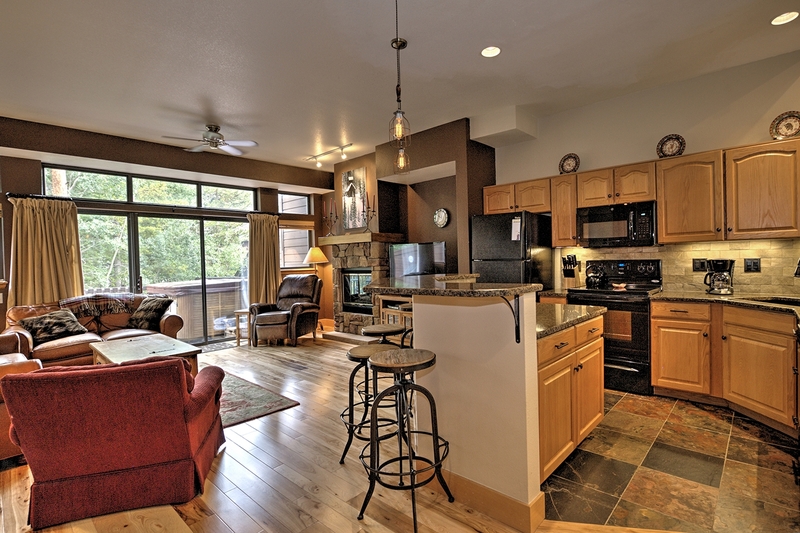 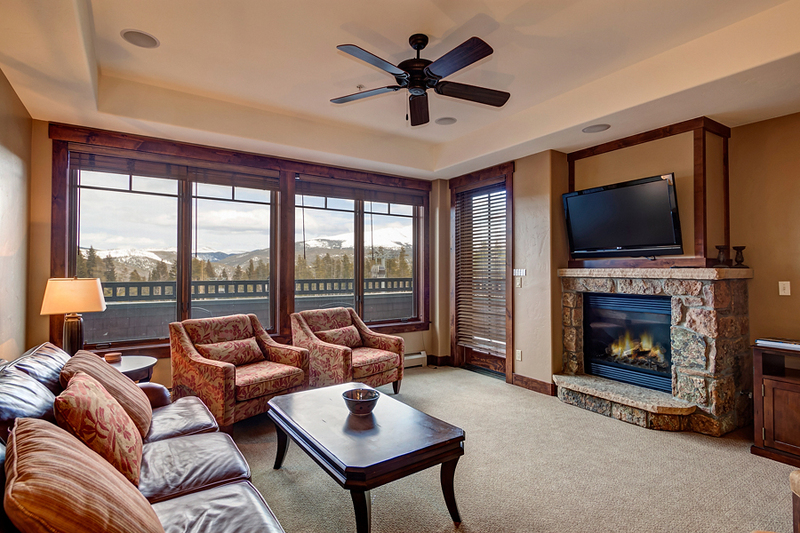 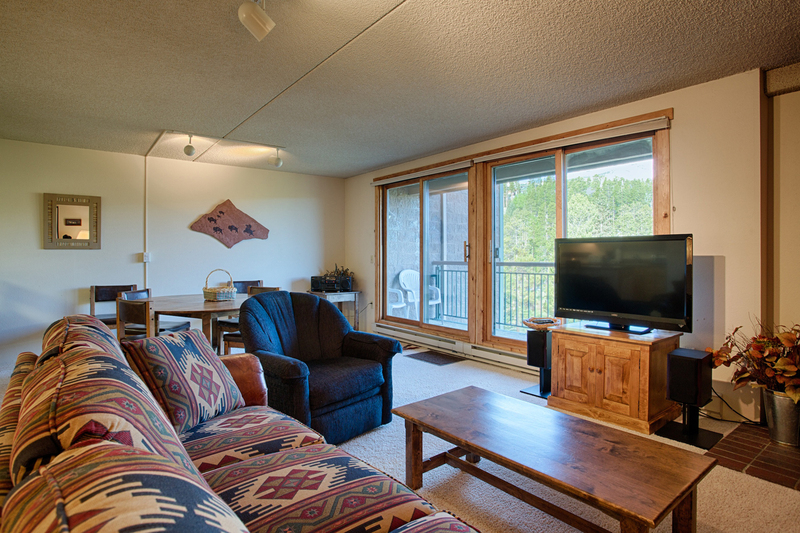 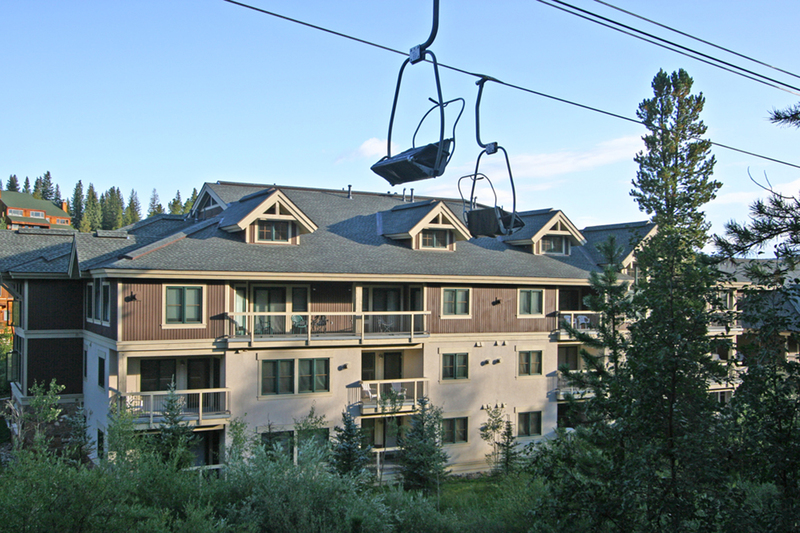 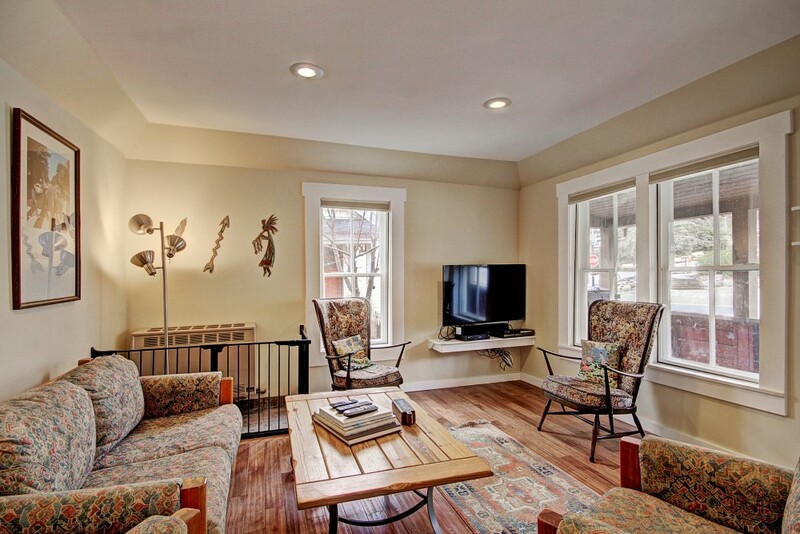 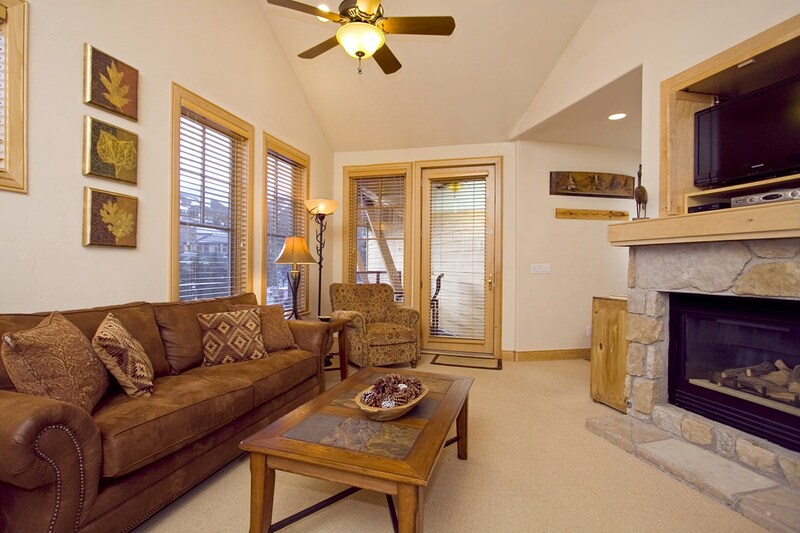 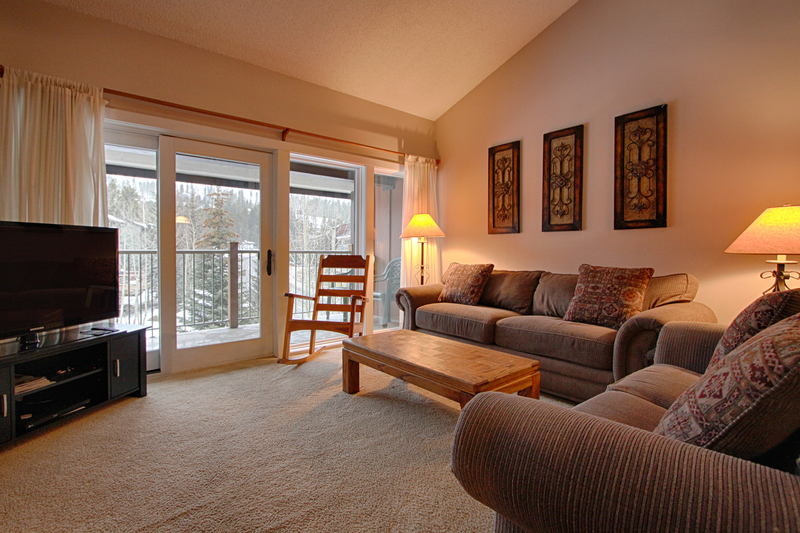 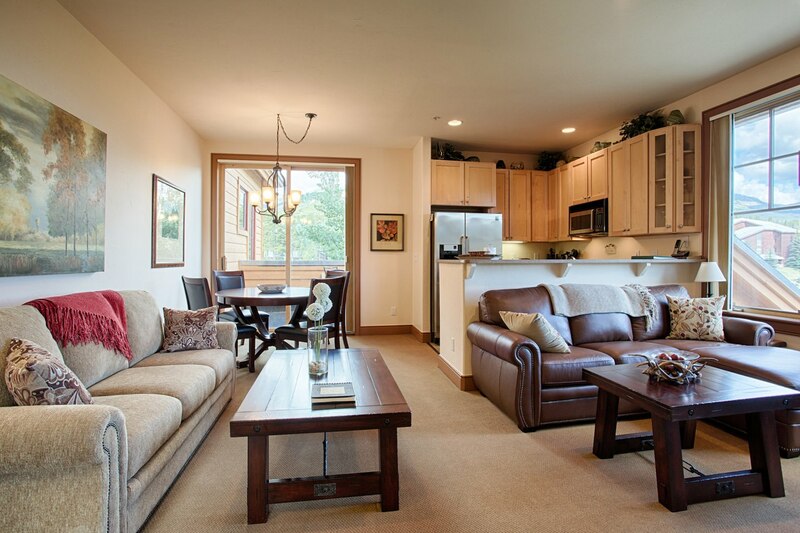 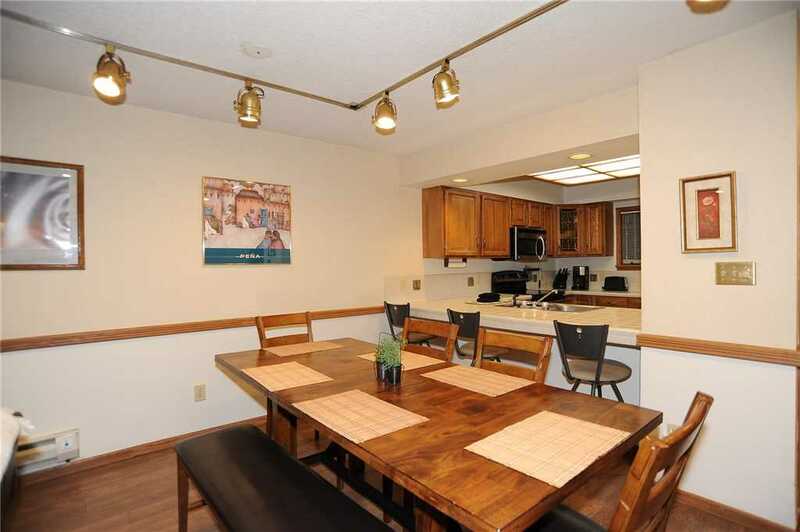 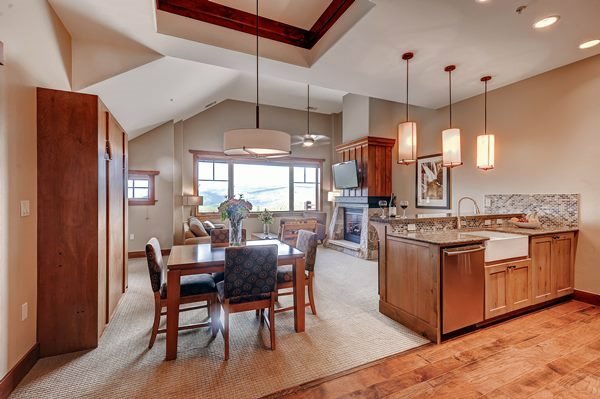 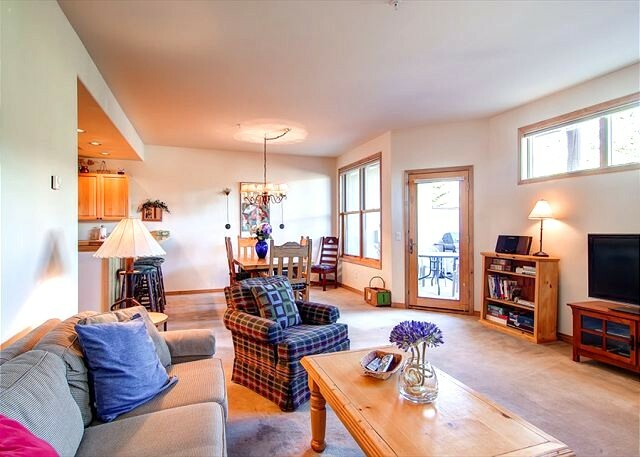 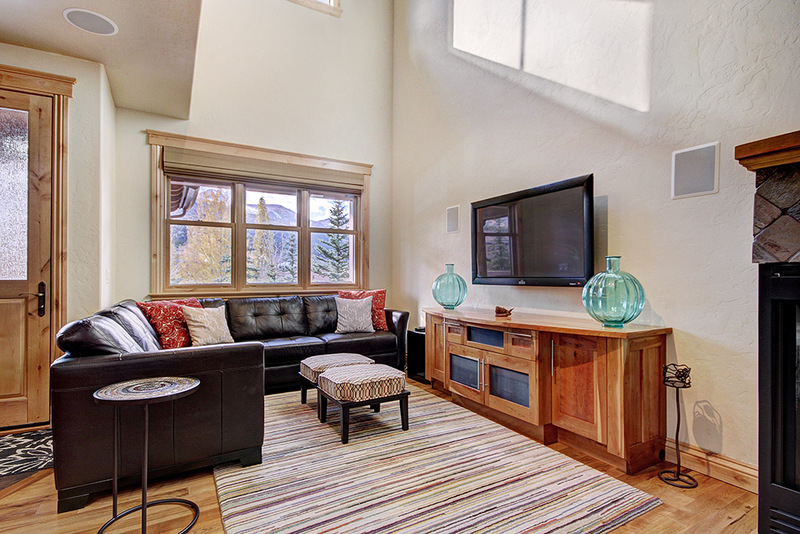 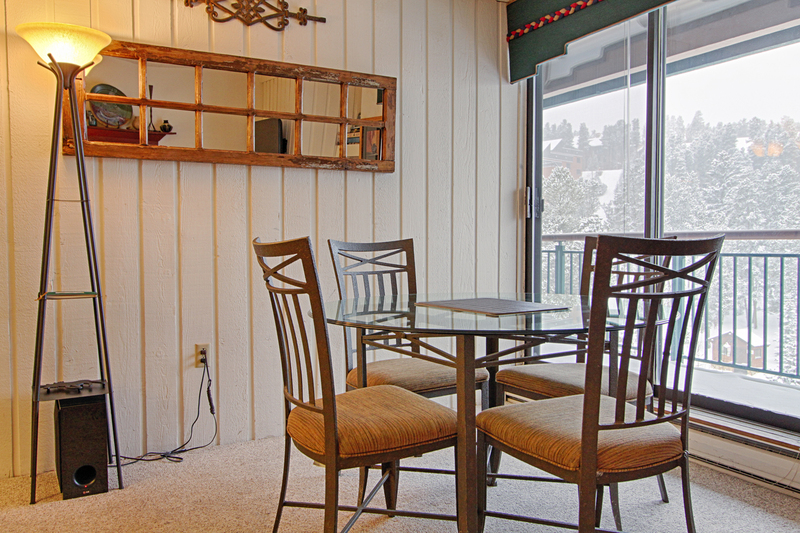 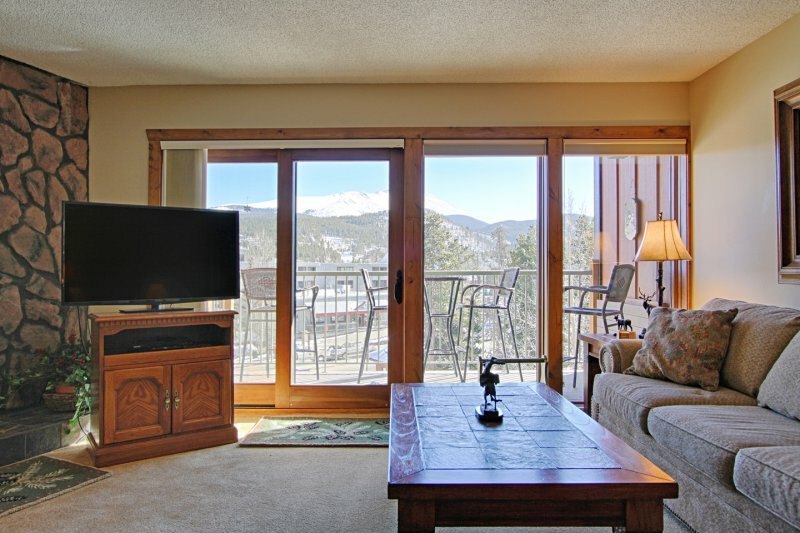 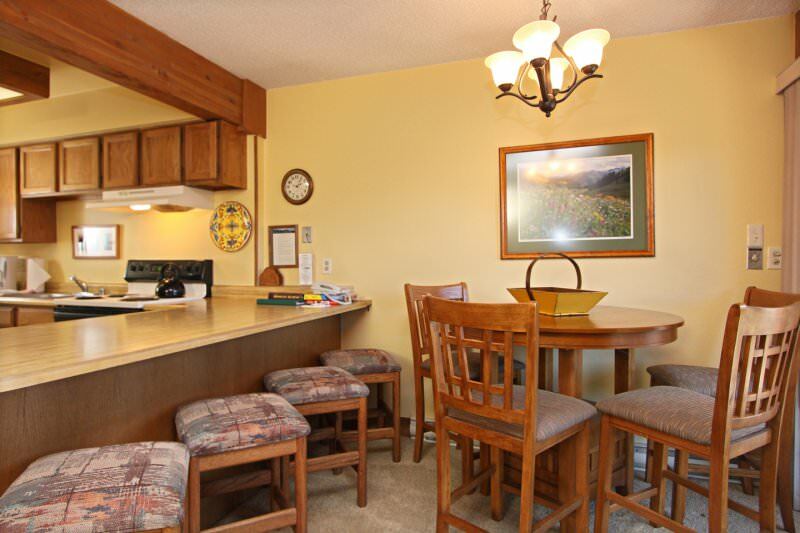 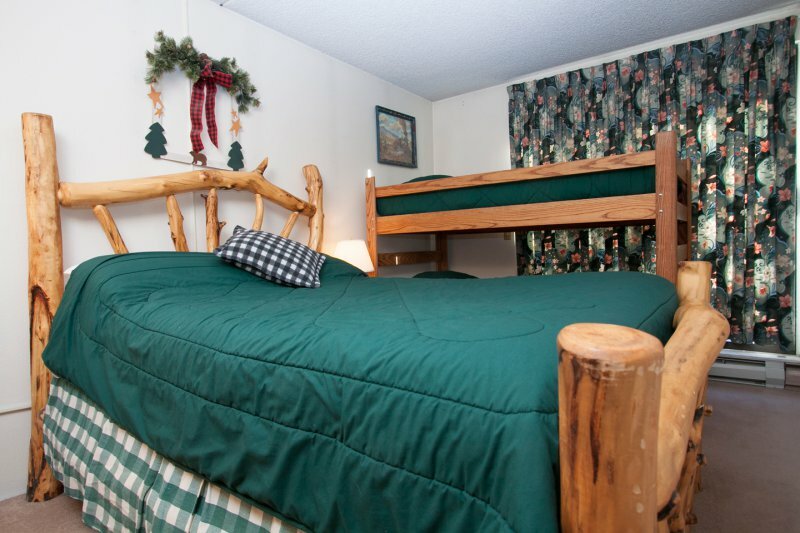 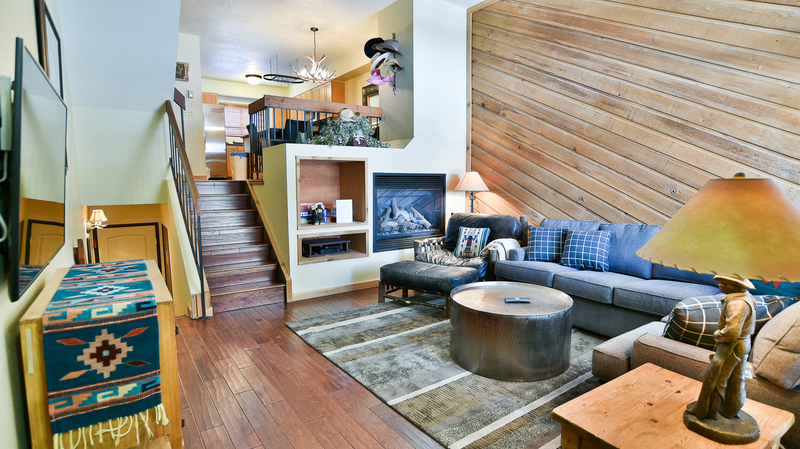 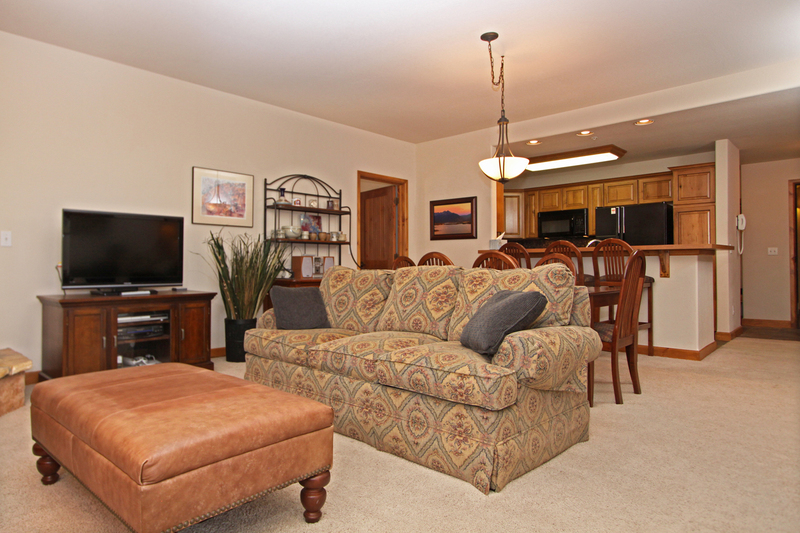 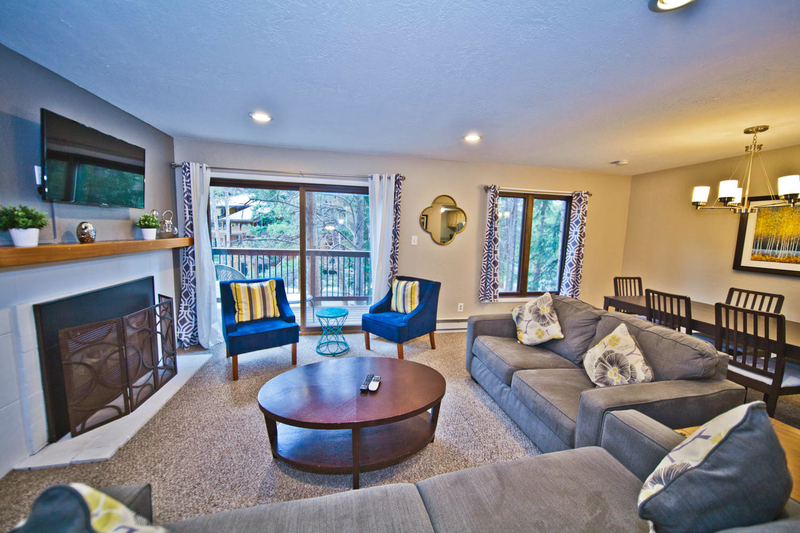 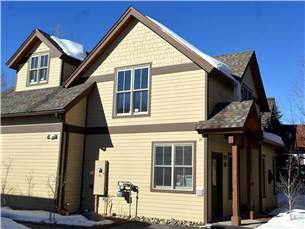 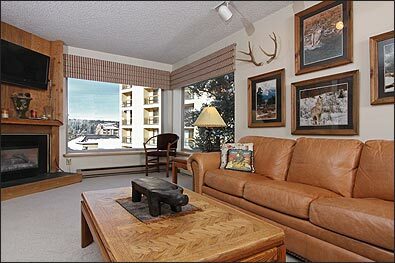 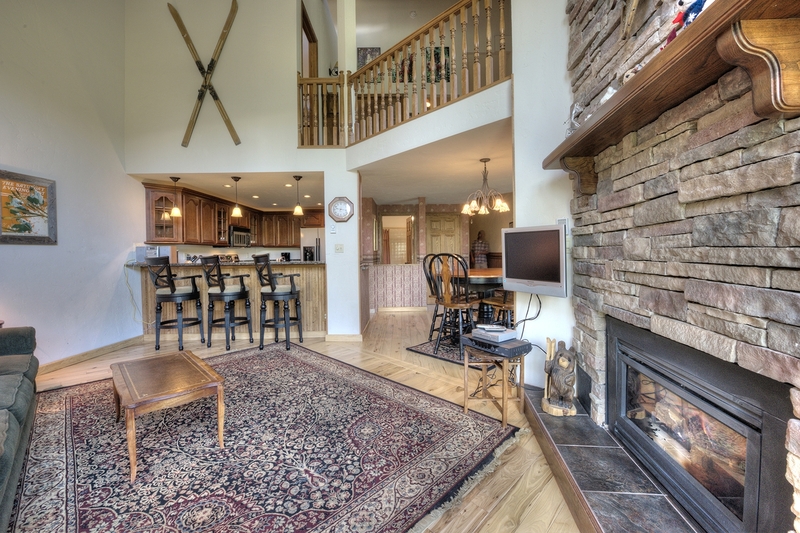 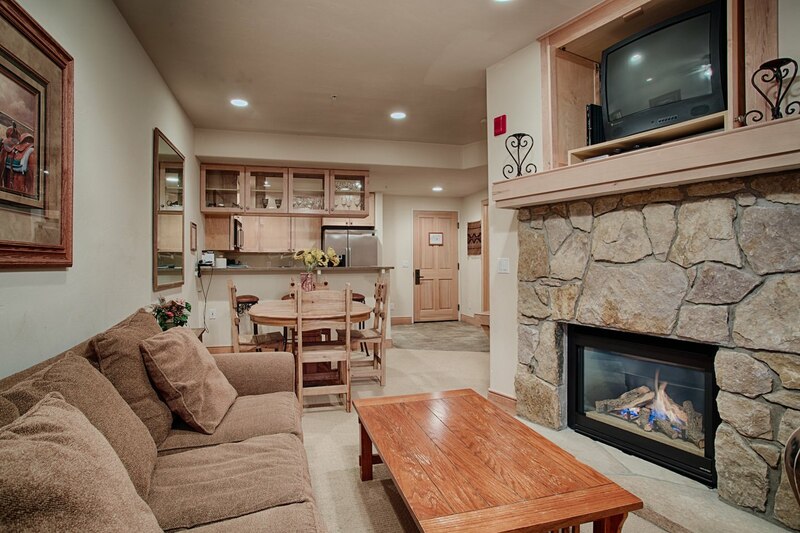 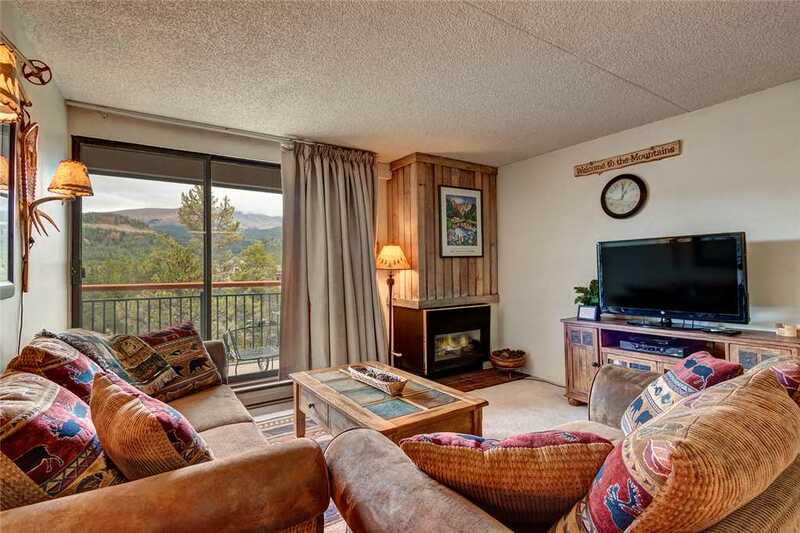 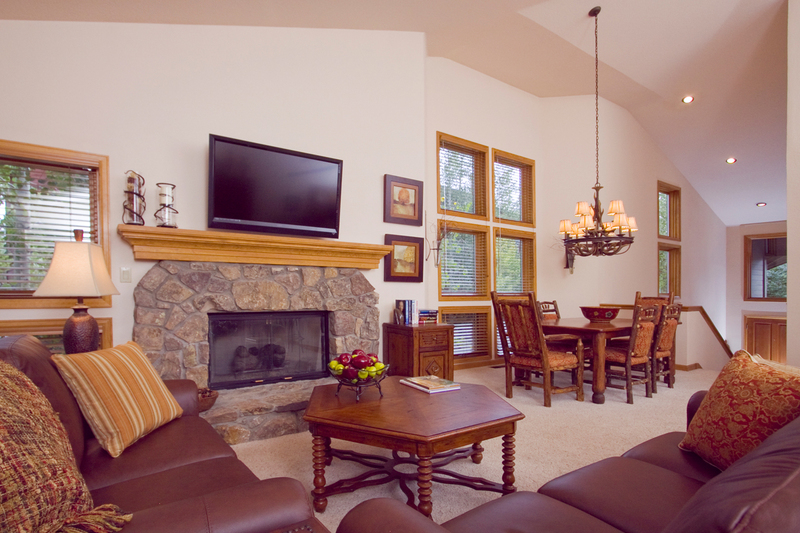 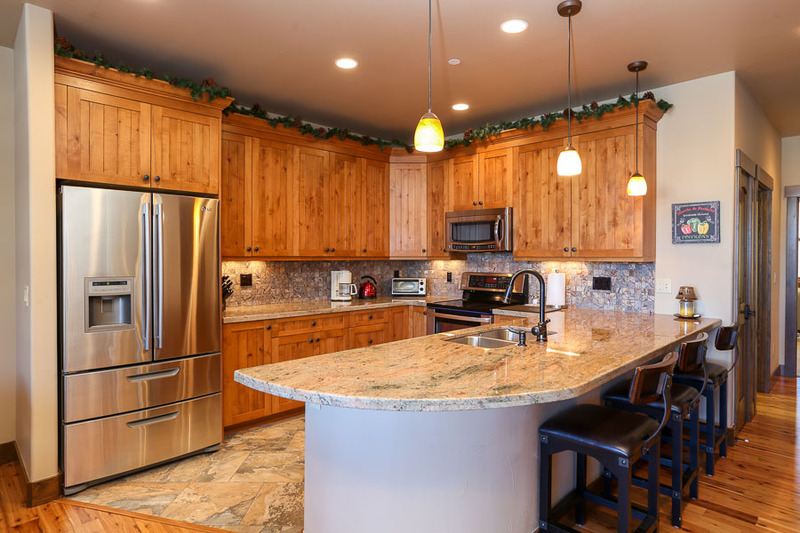 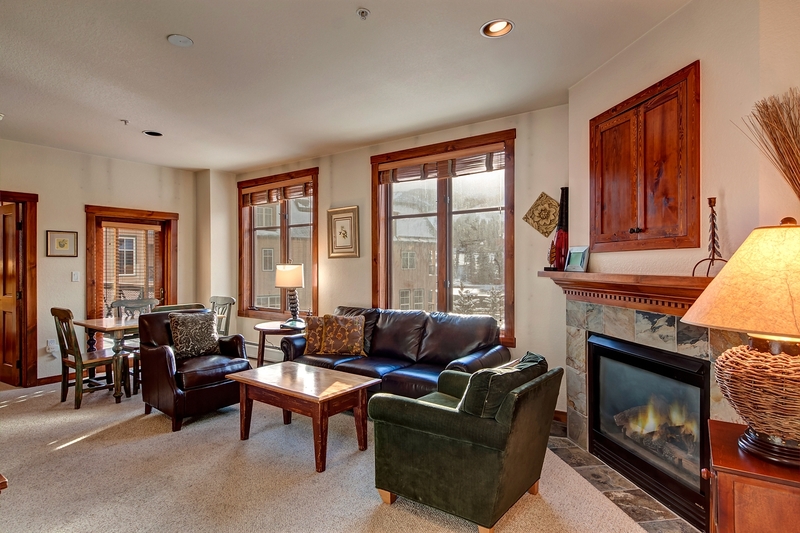 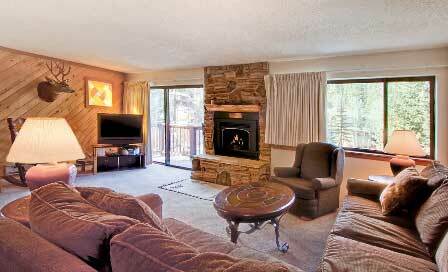 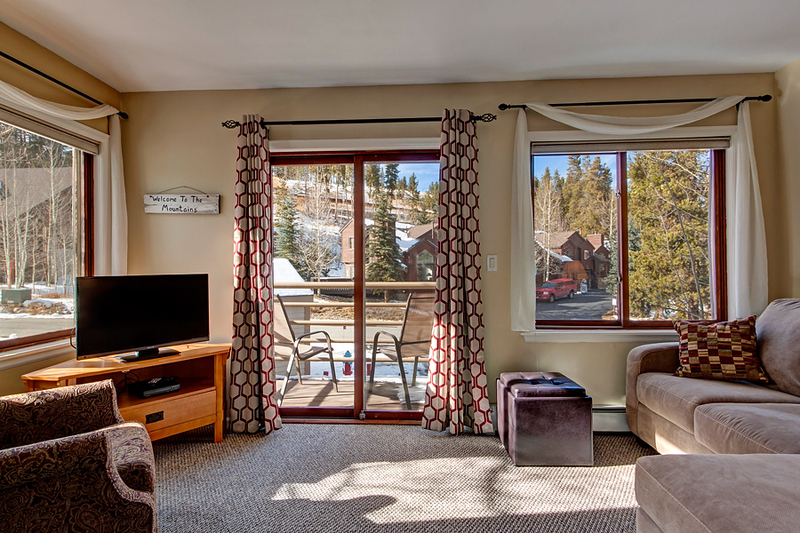 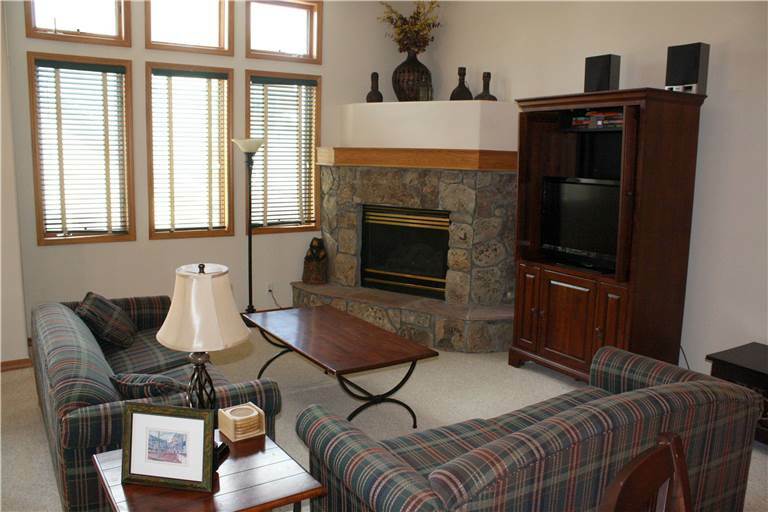 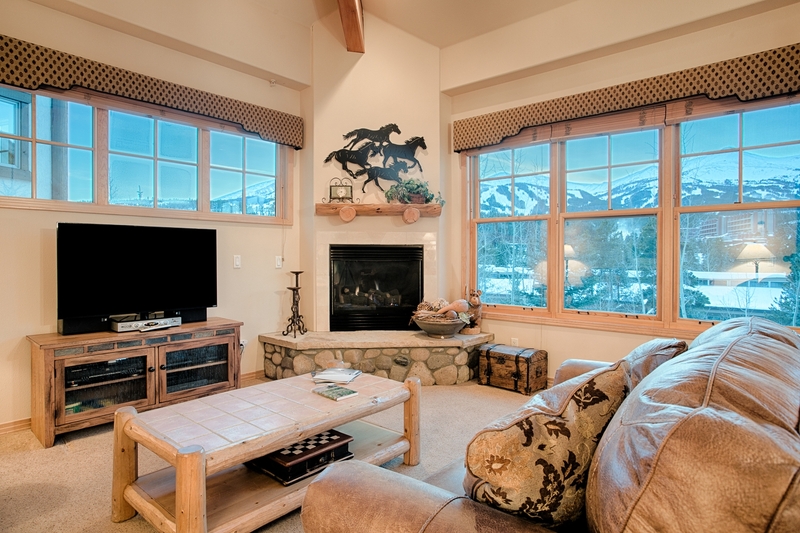 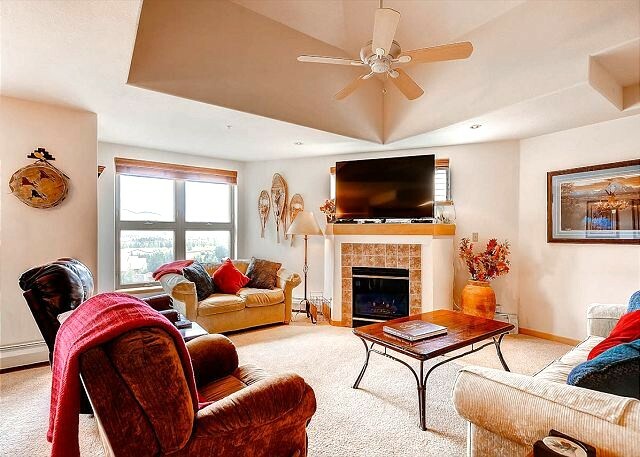 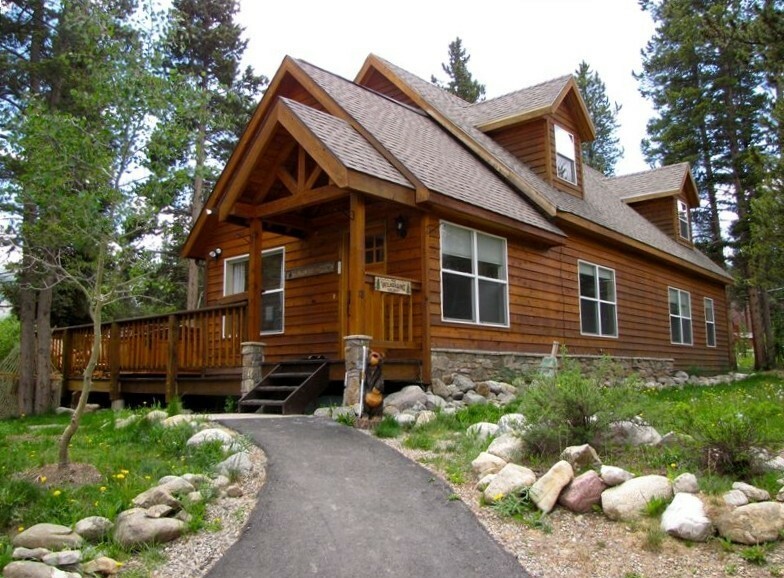 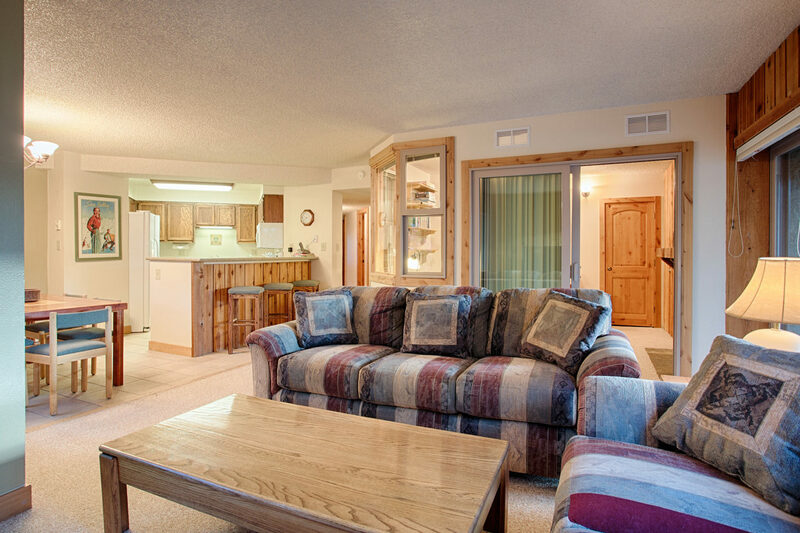 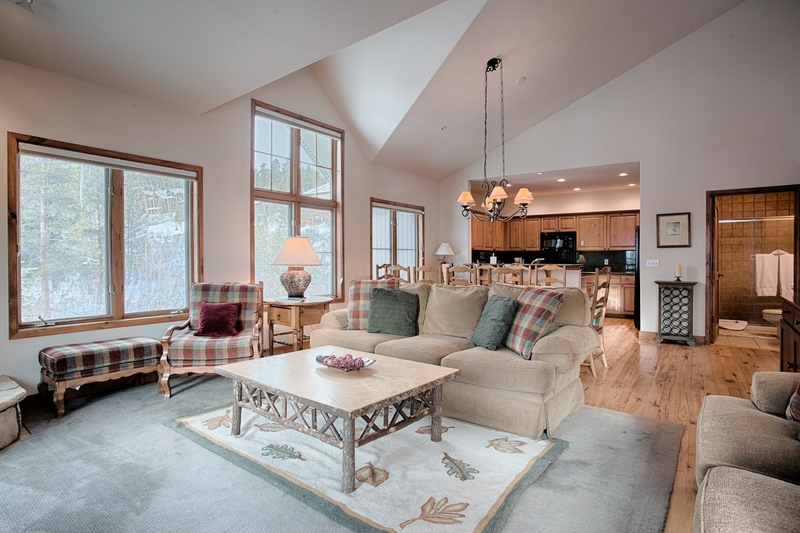 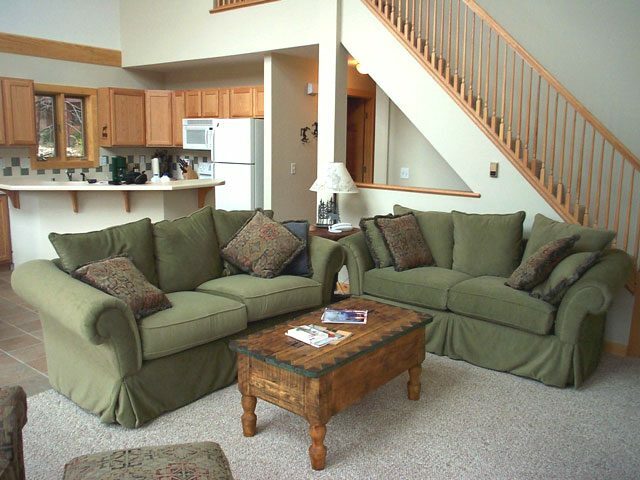 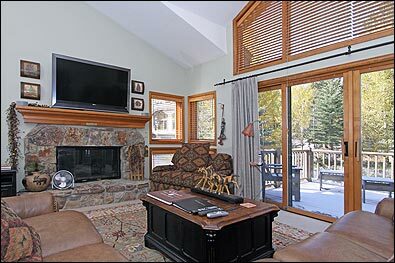 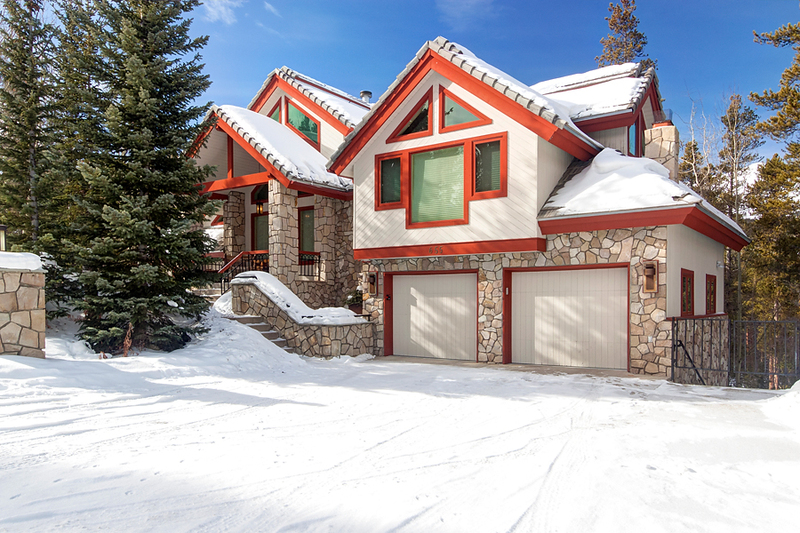 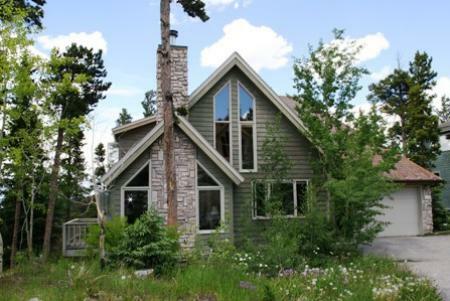 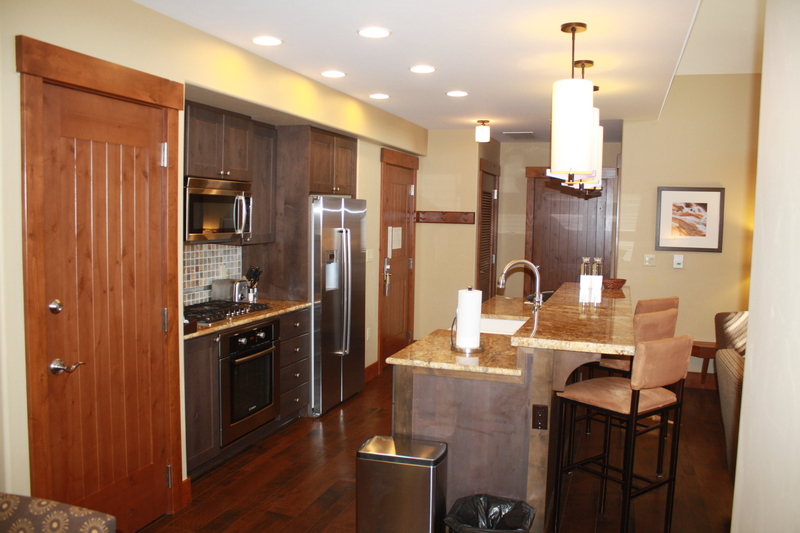 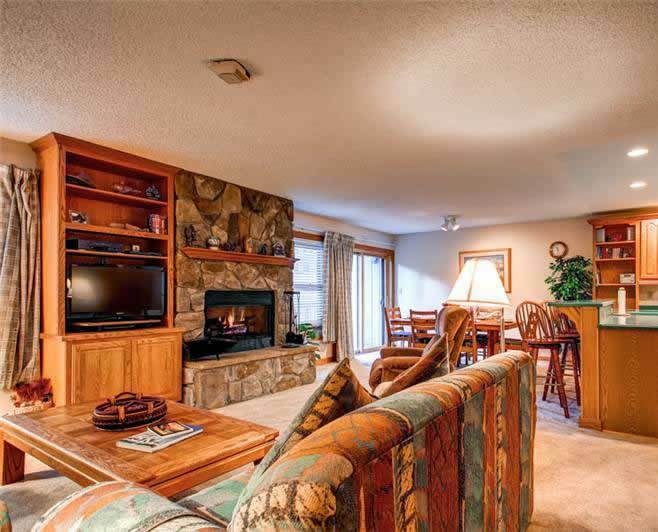 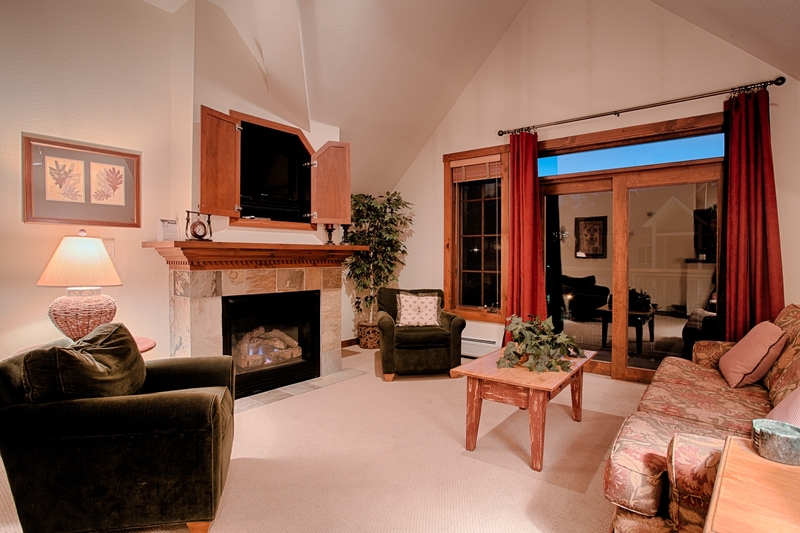 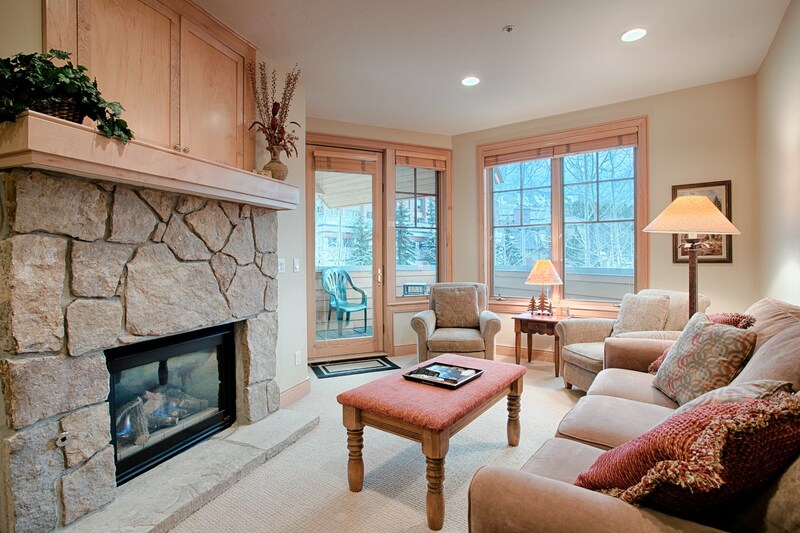 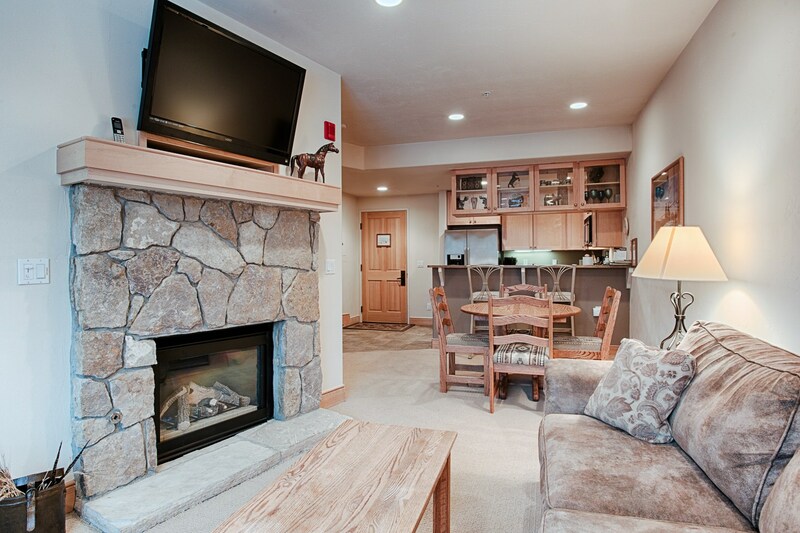 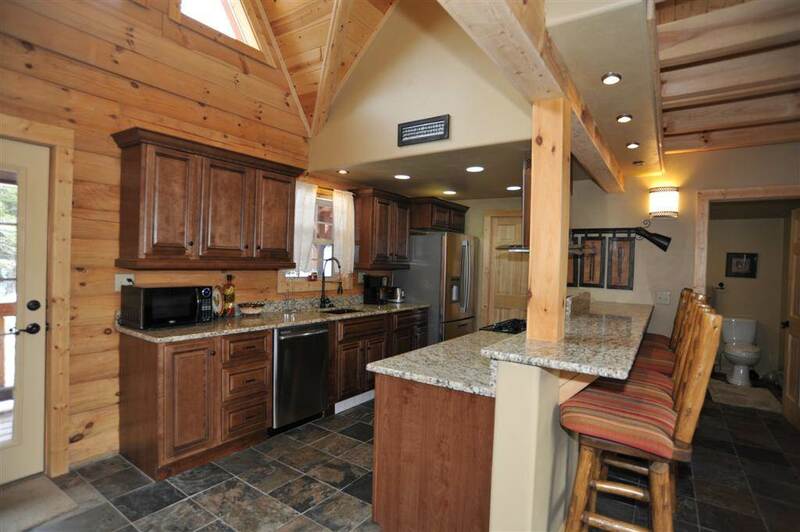 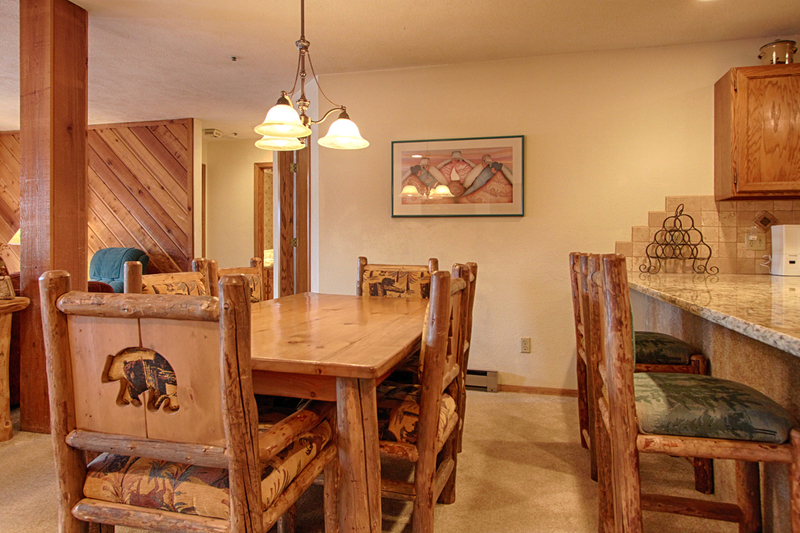 The Pines town homes are located slope-side to the Four O’Clock ski run with easy access to the Snowflake chairlift. 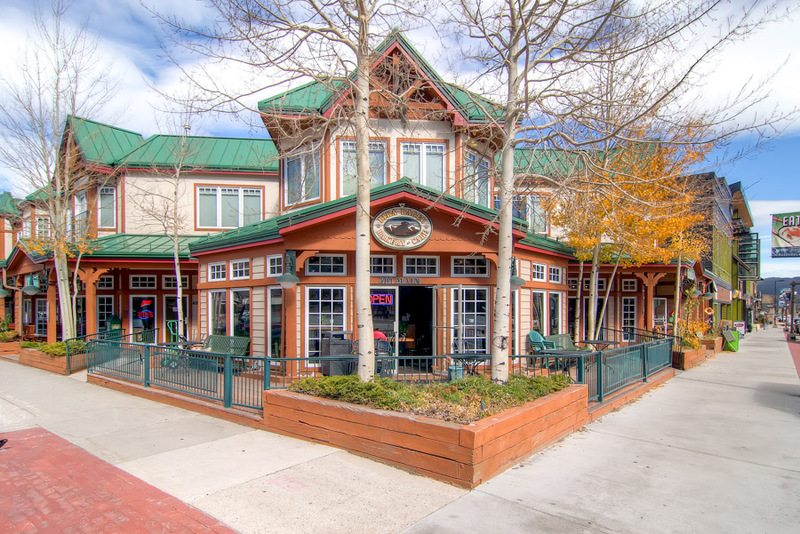 Easily stop in for a quick lunch and then be right back on the slopes! 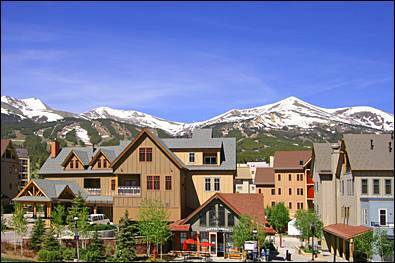 You can drive to town or take a short ride on the town’s free shuttle, which stops nearby. 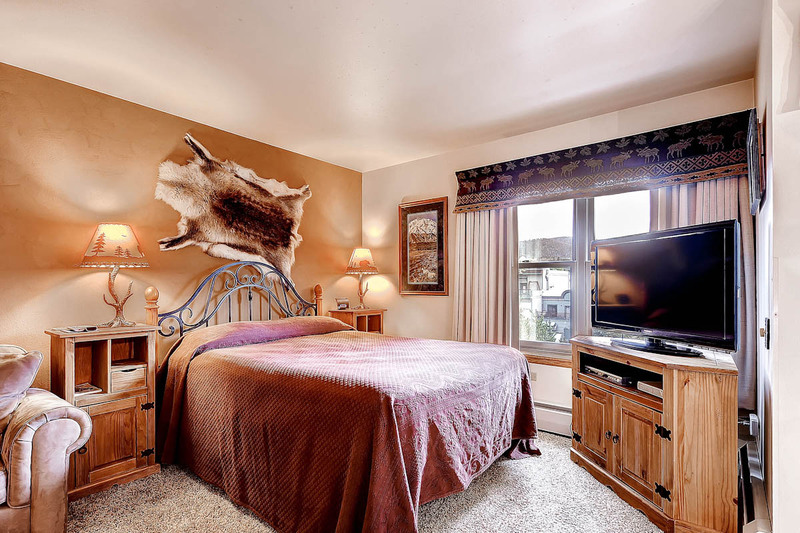 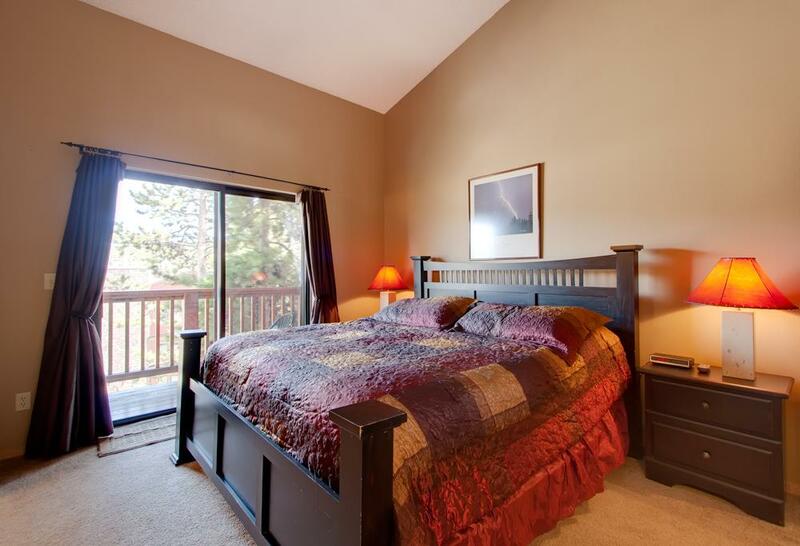 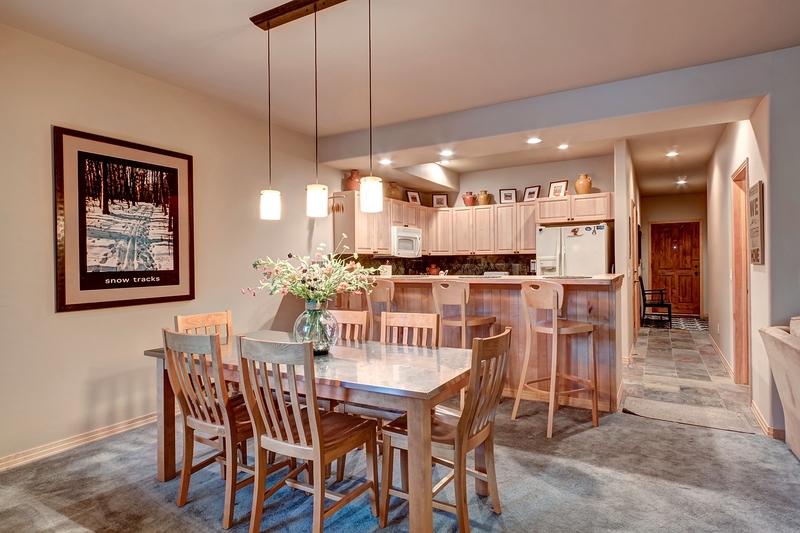 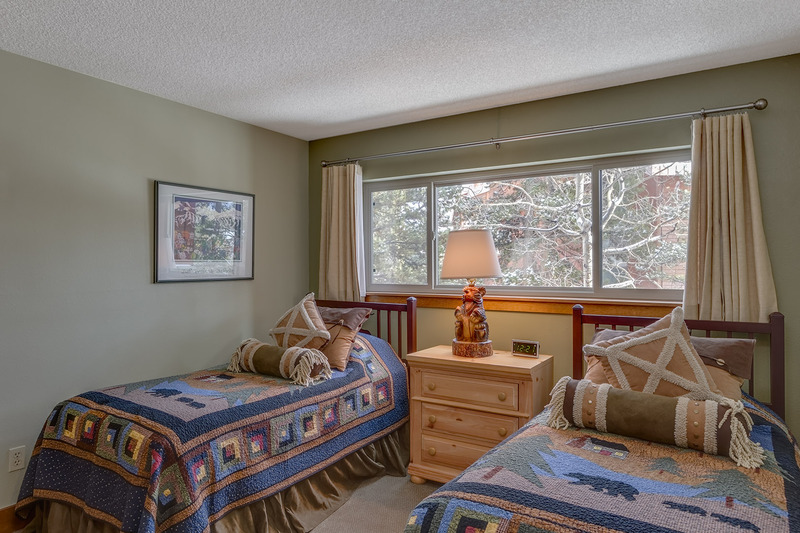 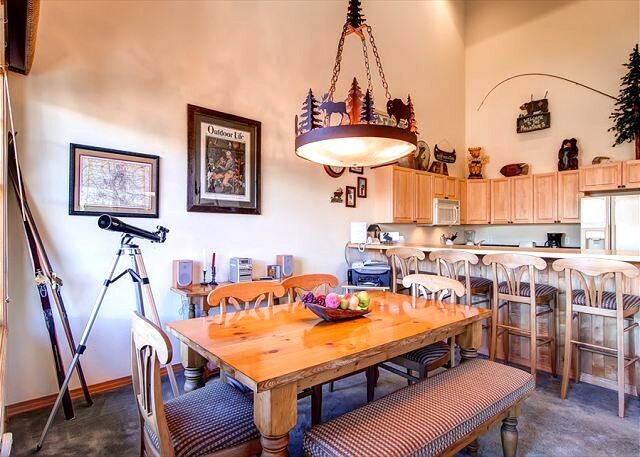 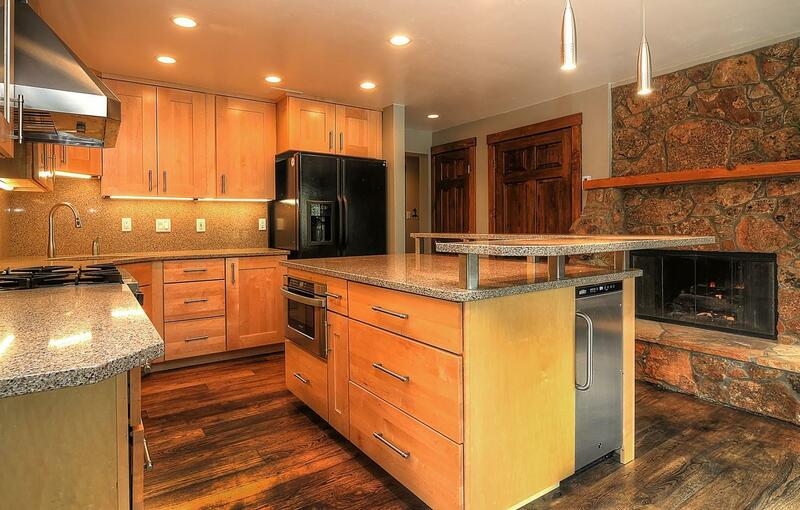 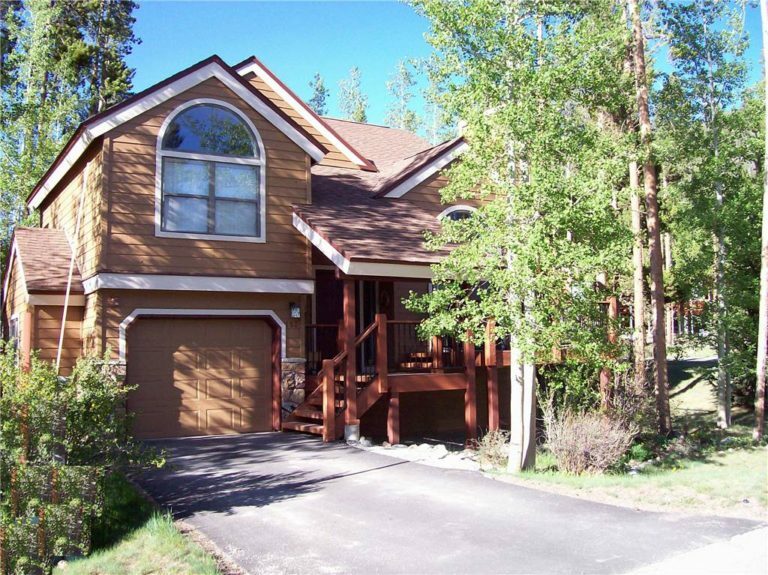 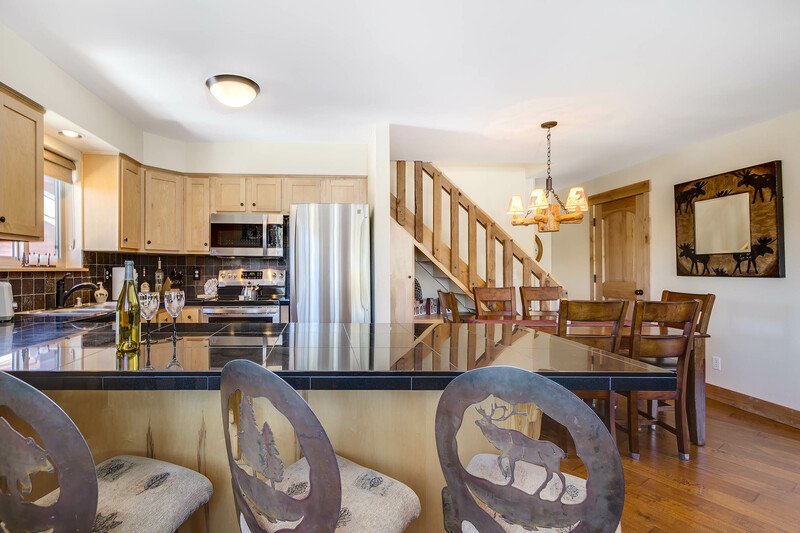 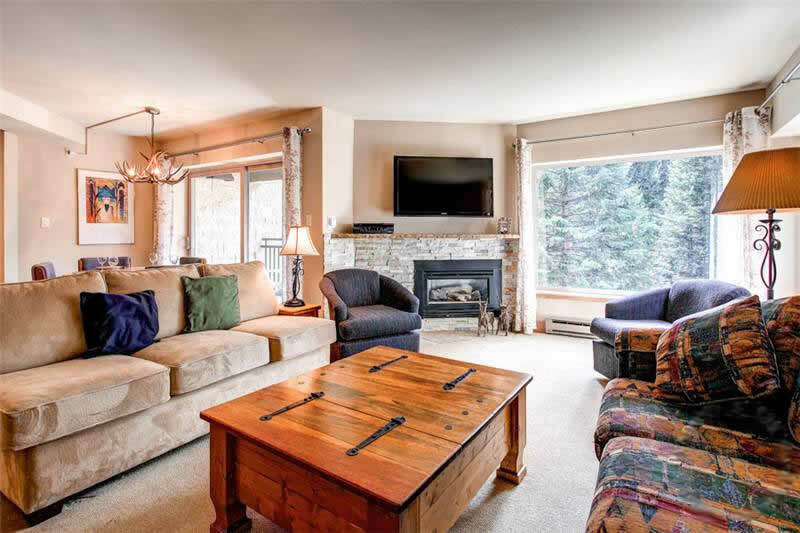 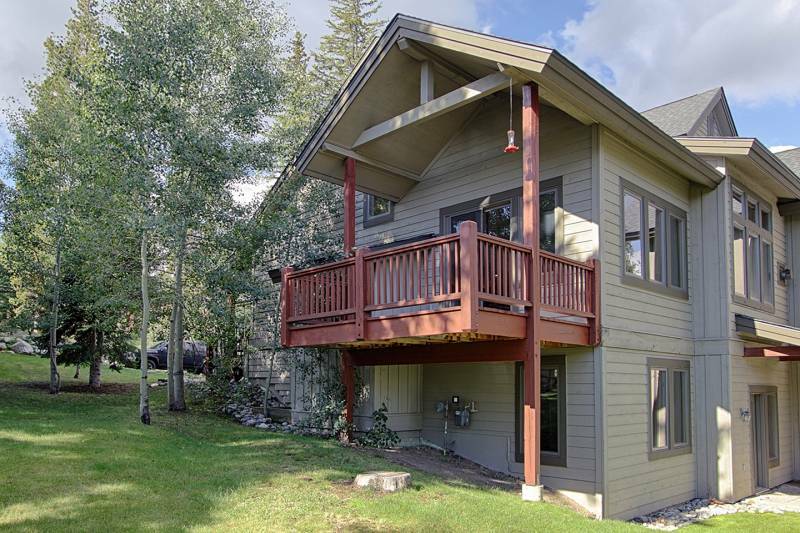 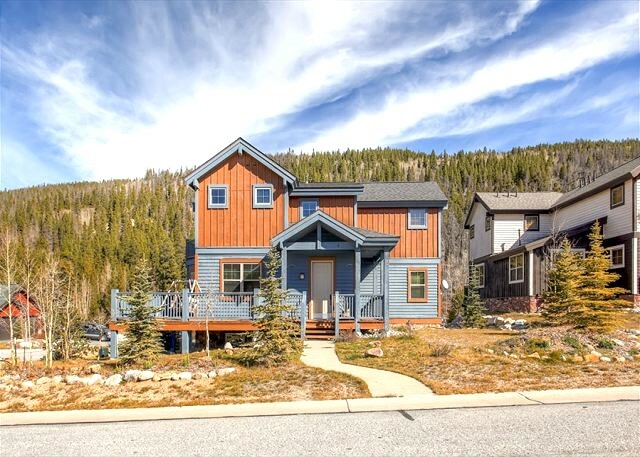 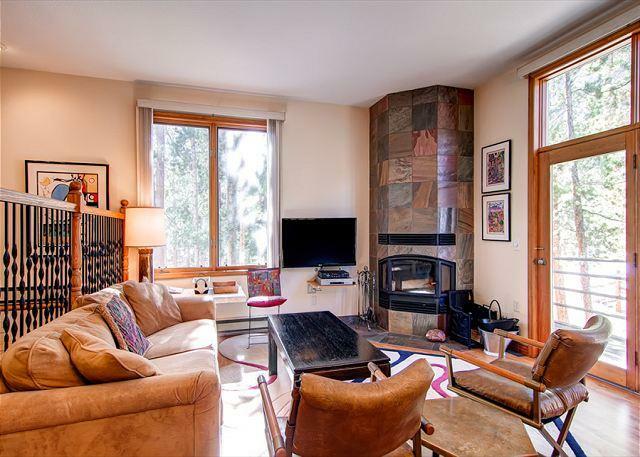 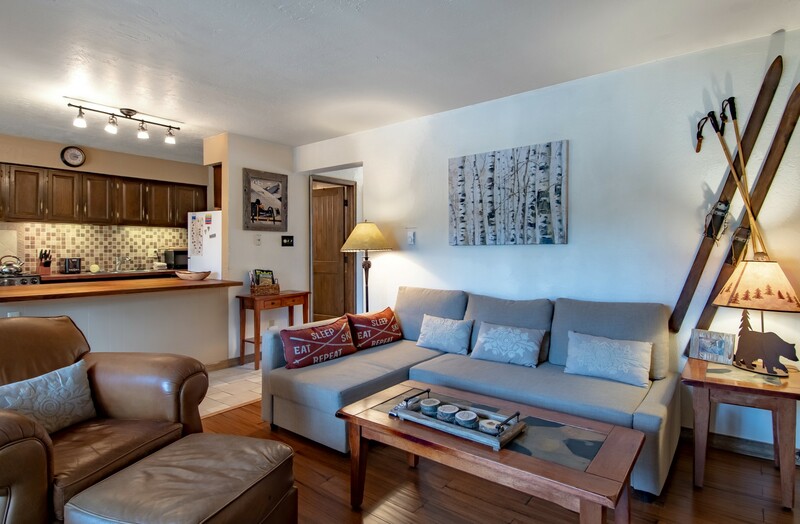 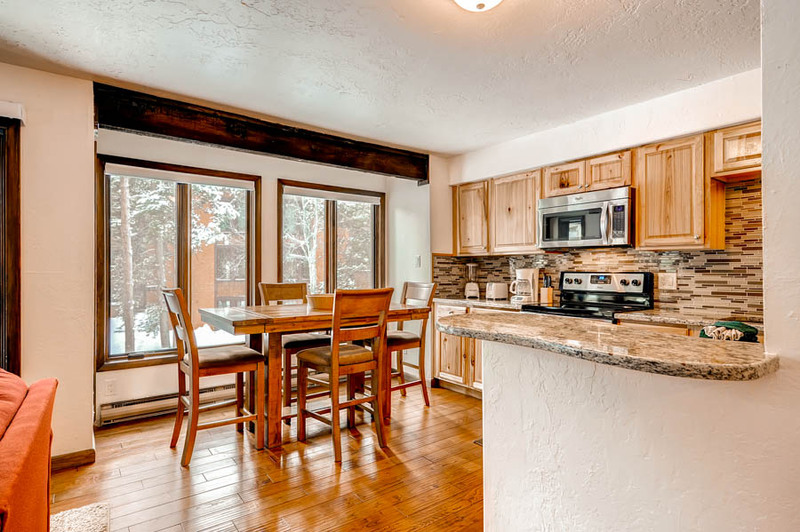 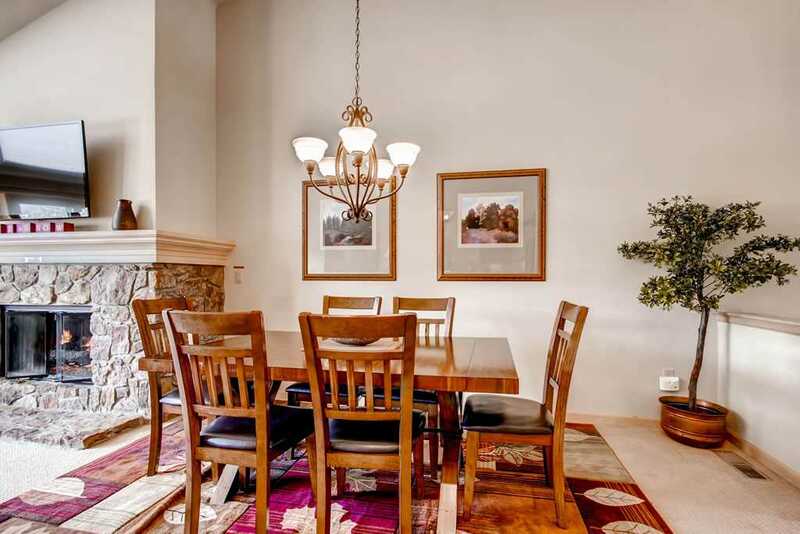 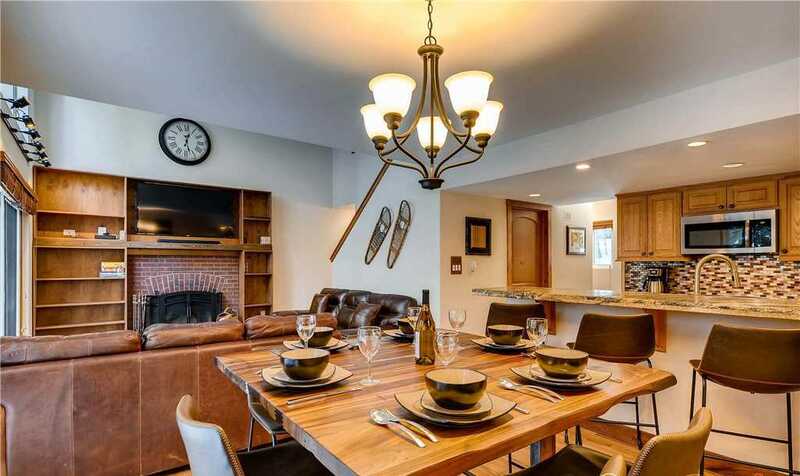 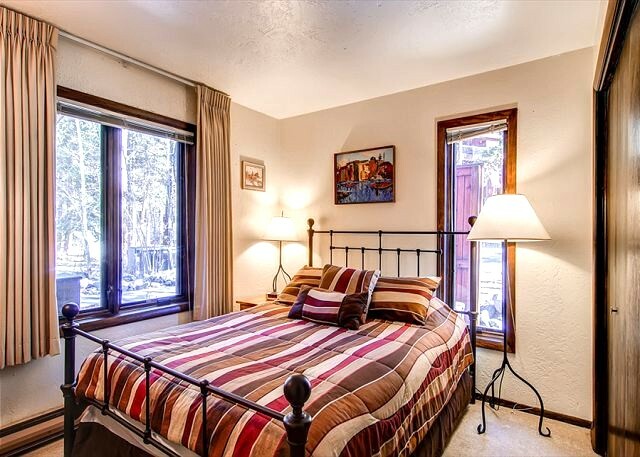 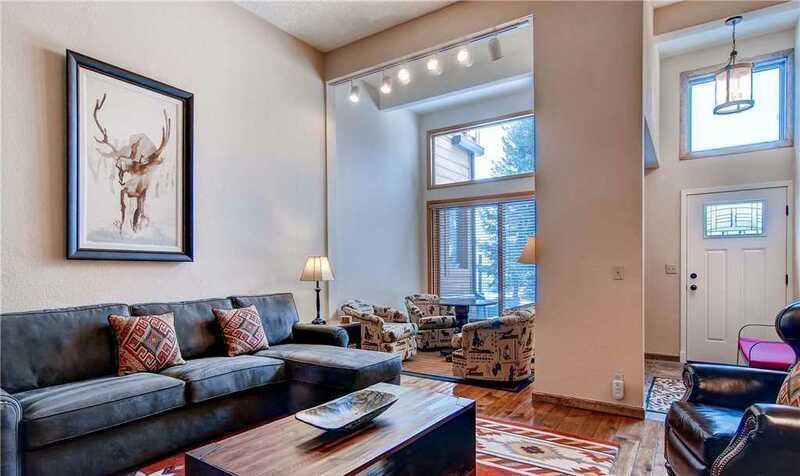 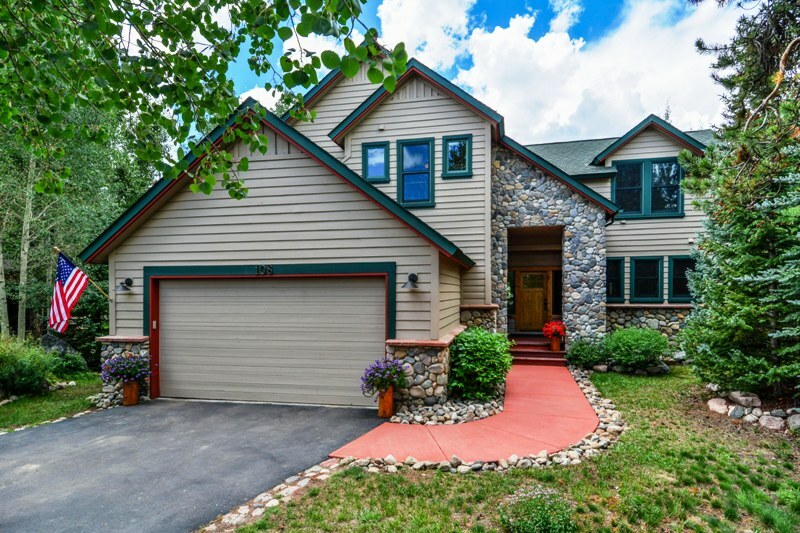 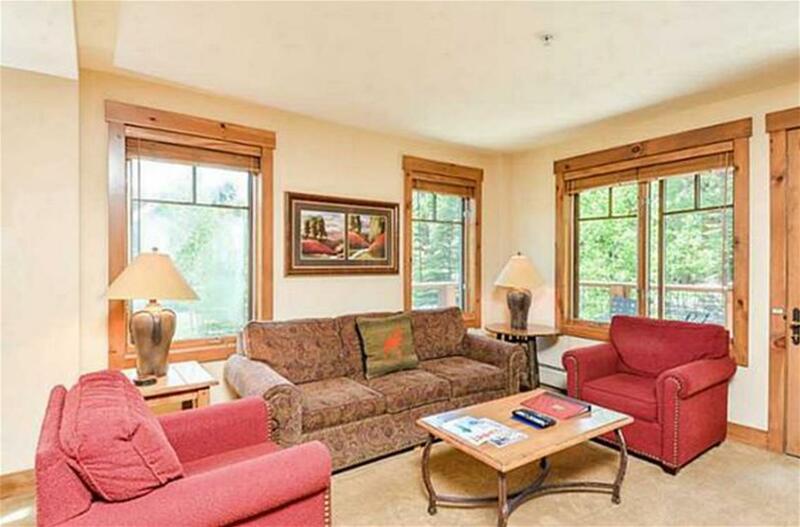 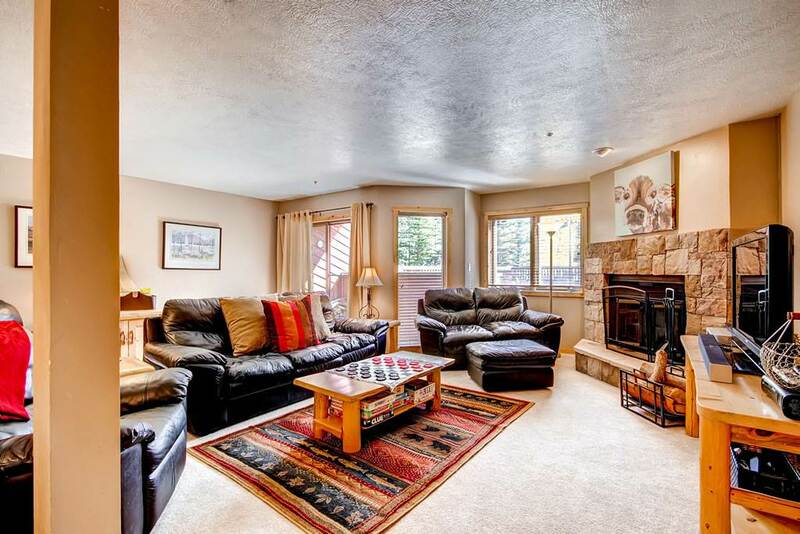 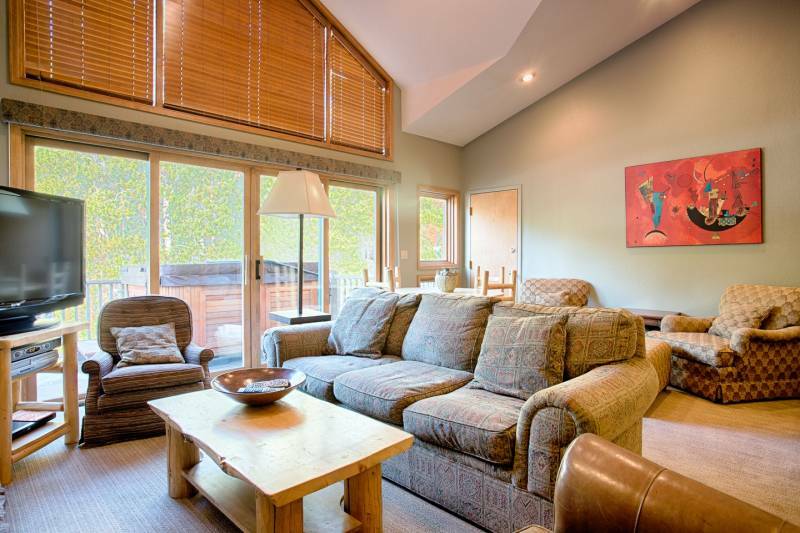 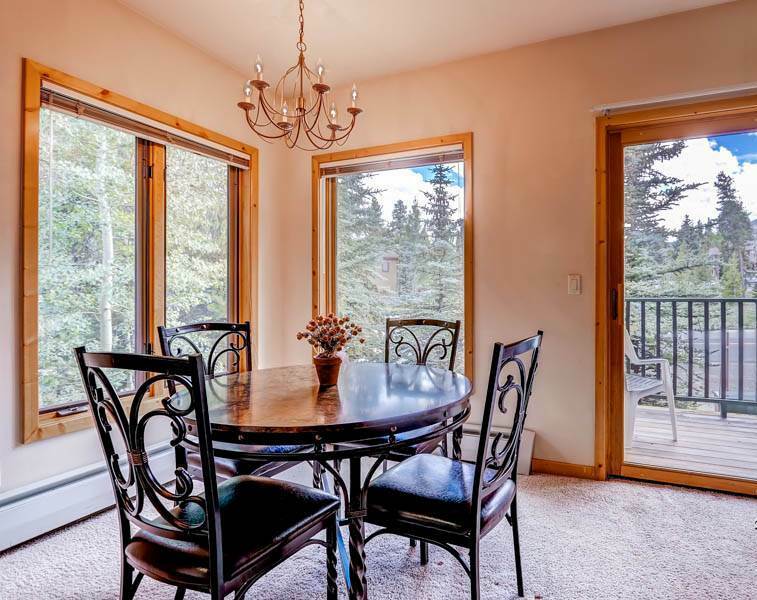 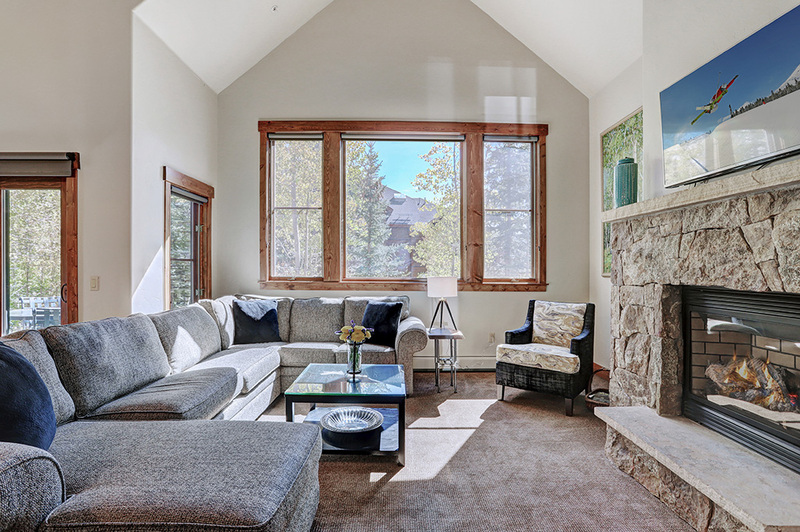 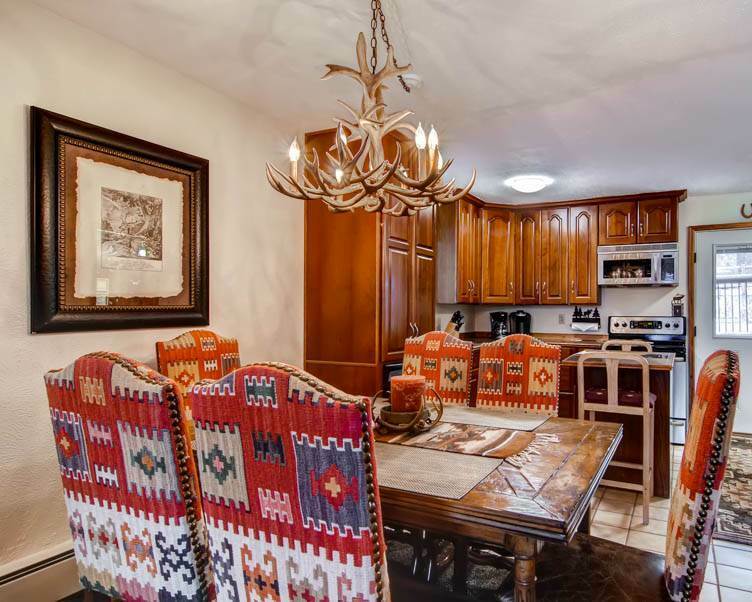 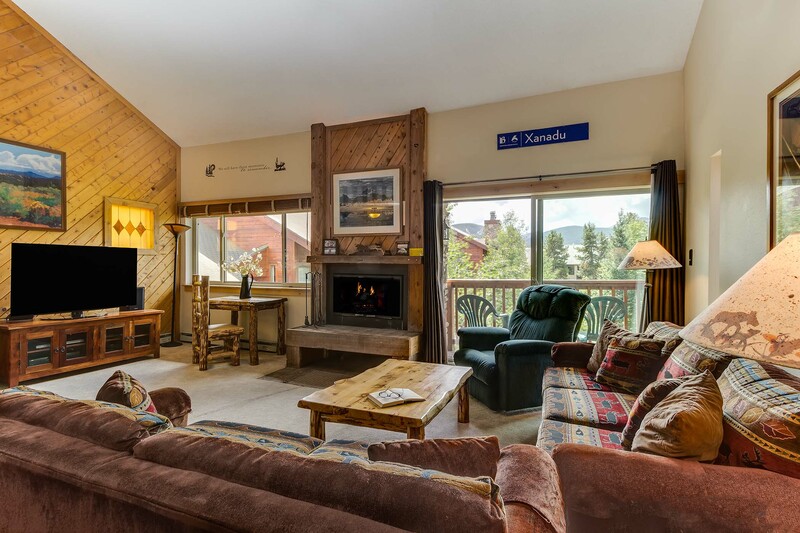 Leading the way to Peak 8 on Ski Hill Road this quiet townhome sits just off the Four O’Clock ski run and is situated with the ability to ski to the Snowflake Chairlift. 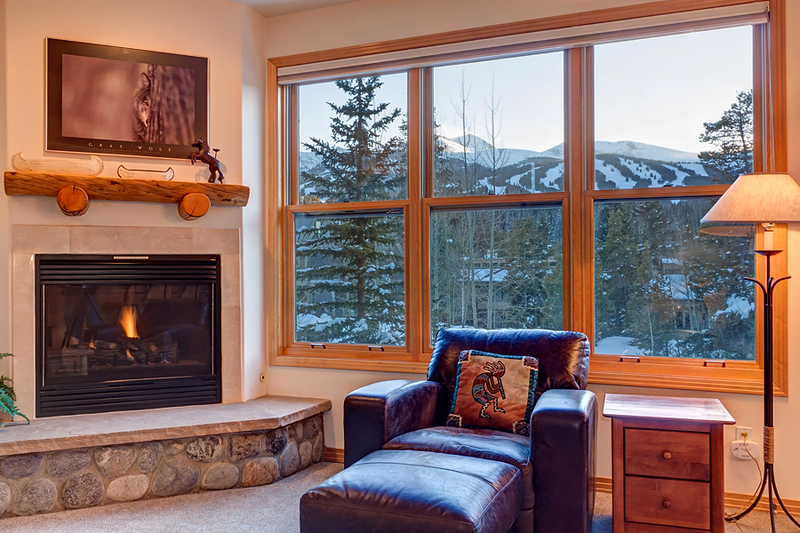 Whether beginning or ending your ski day, you are just steps away! 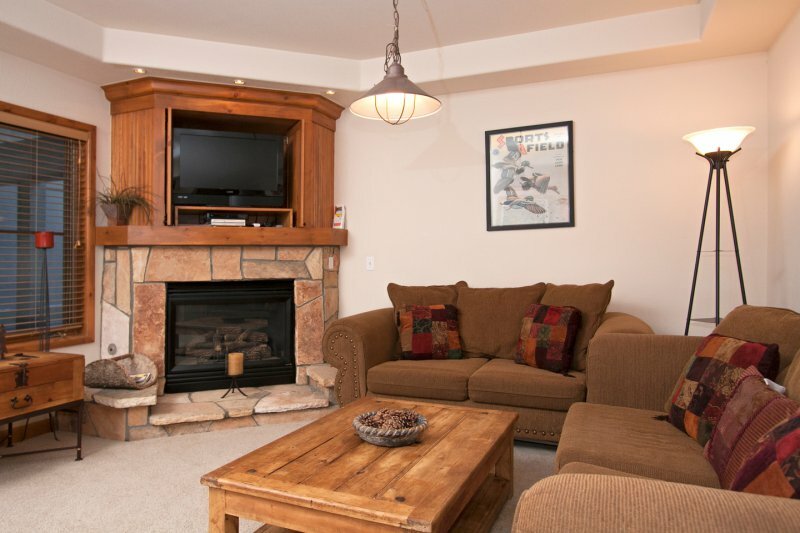 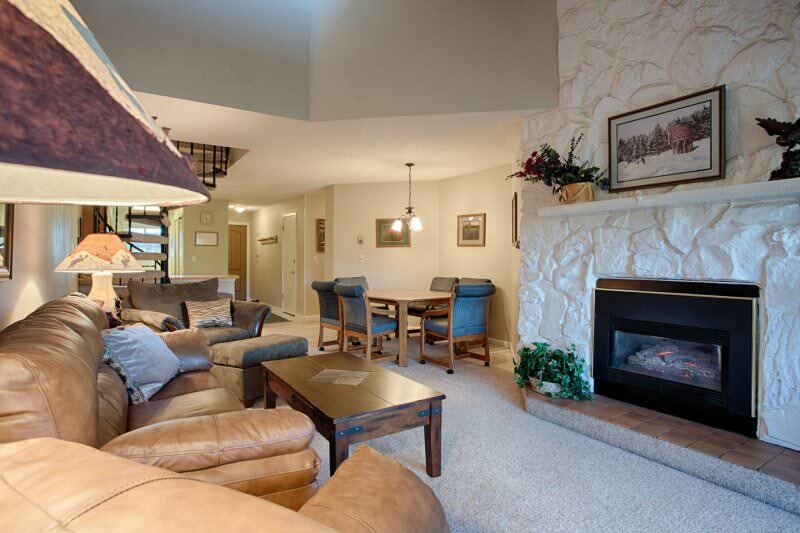 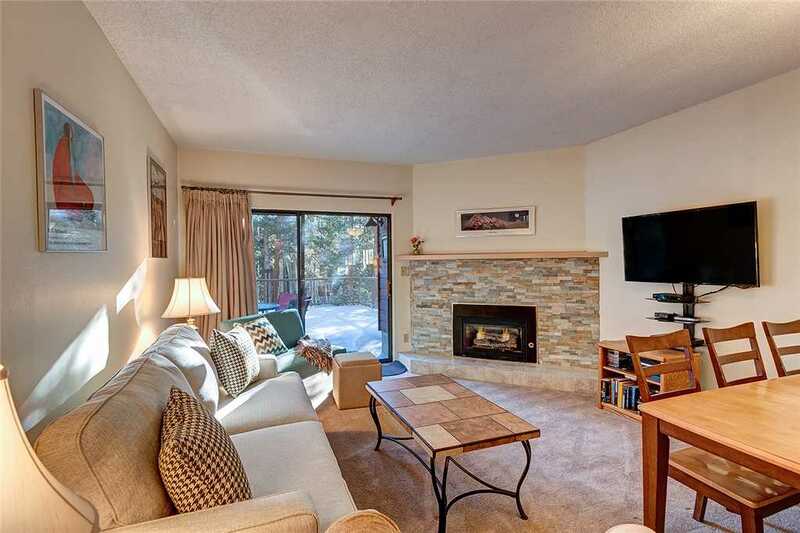 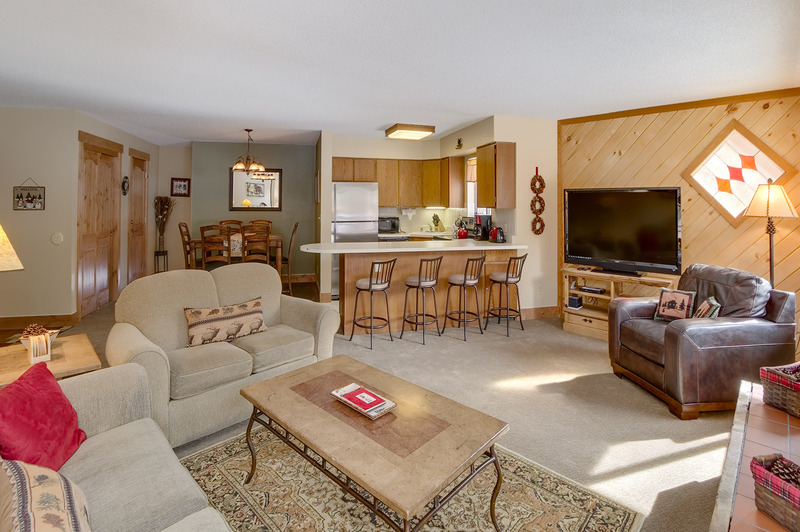 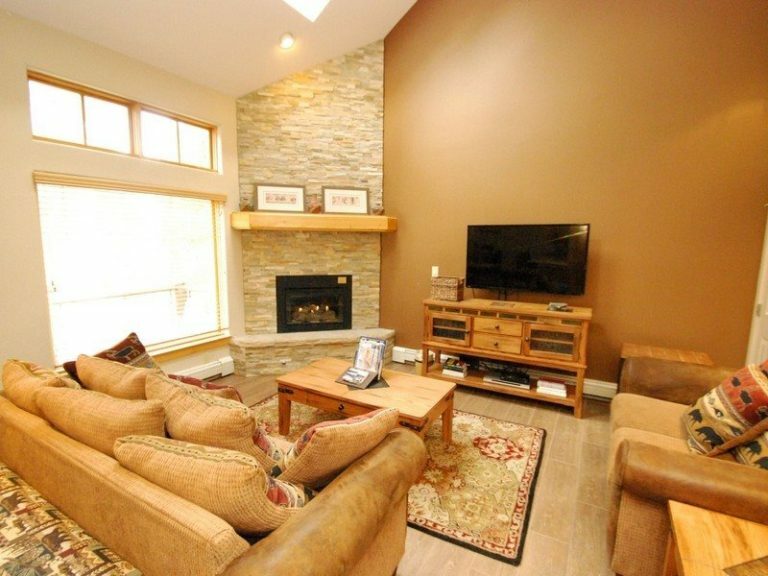 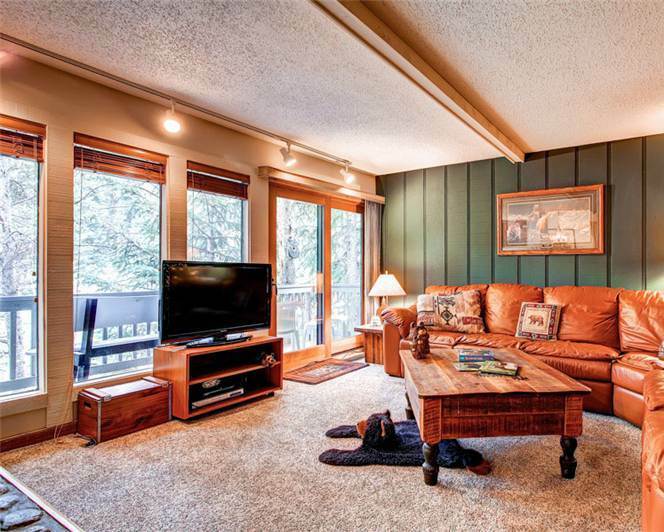 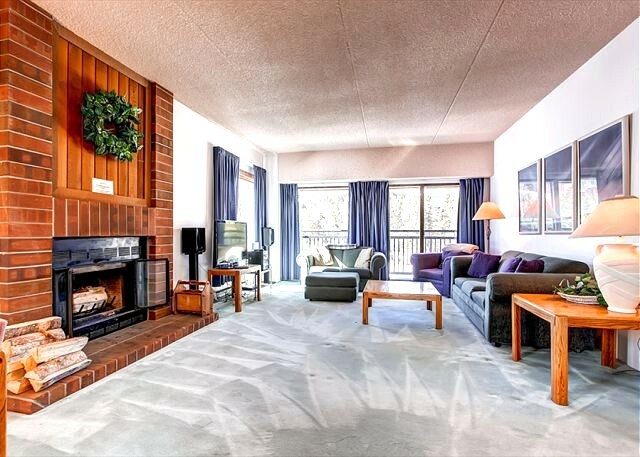 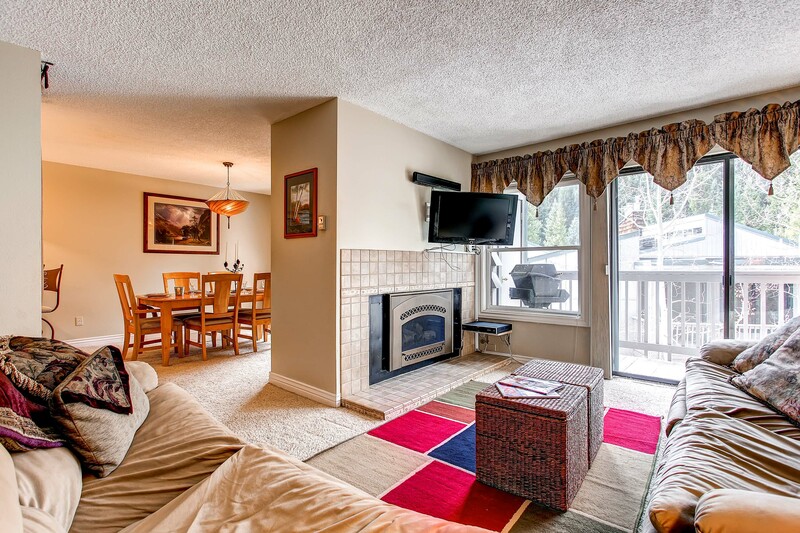 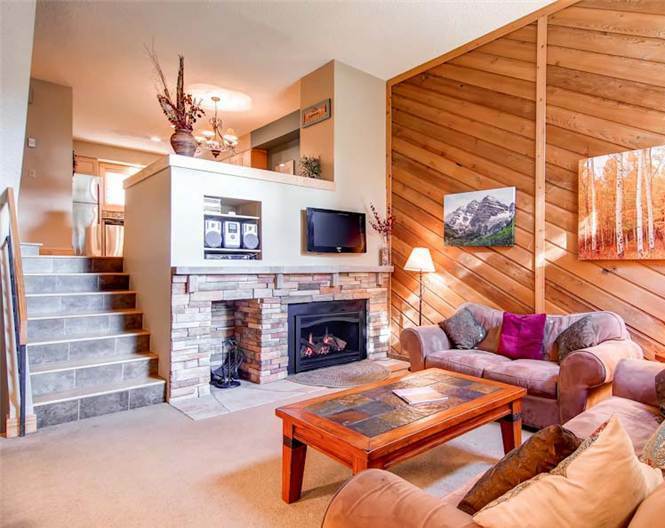 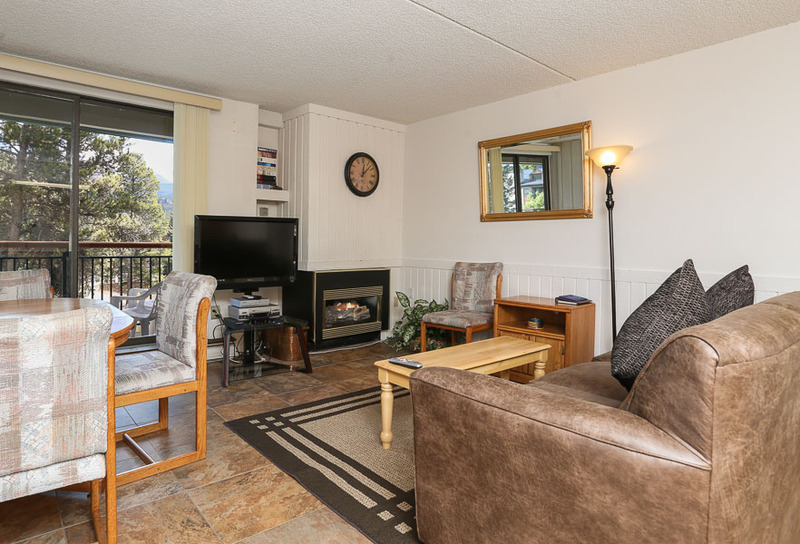 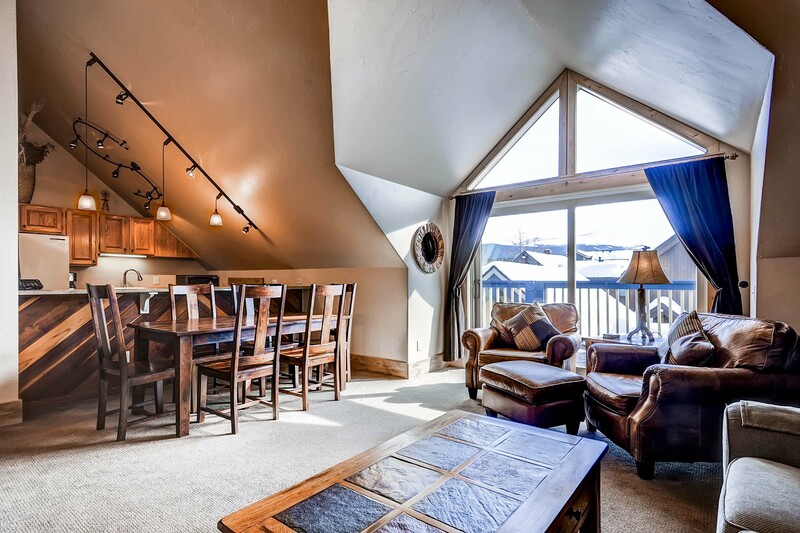 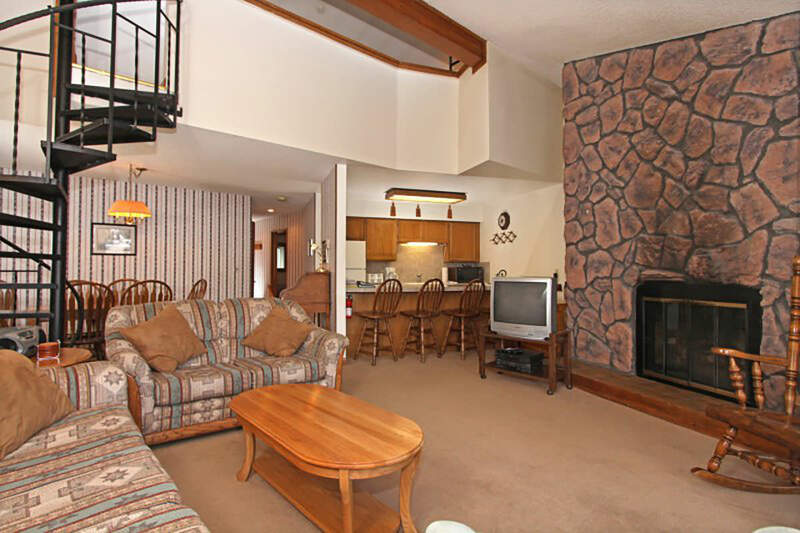 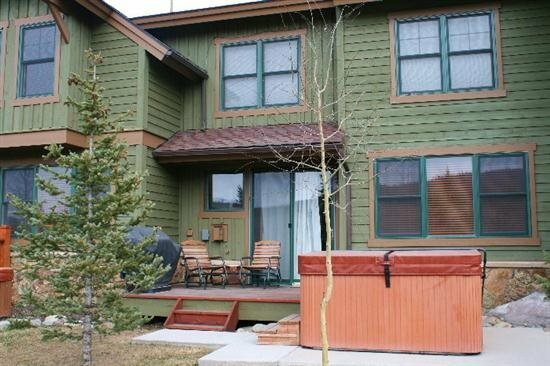 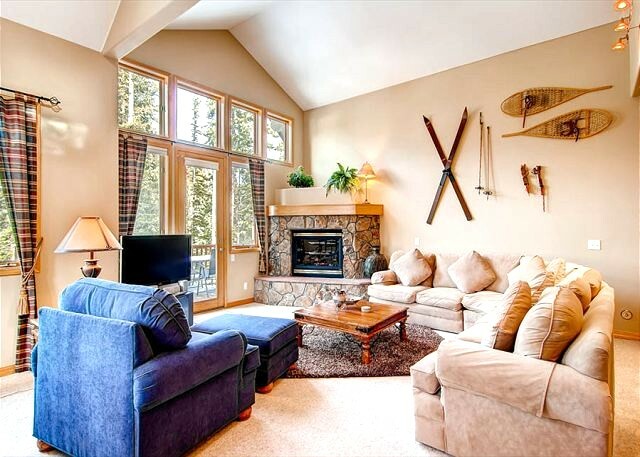 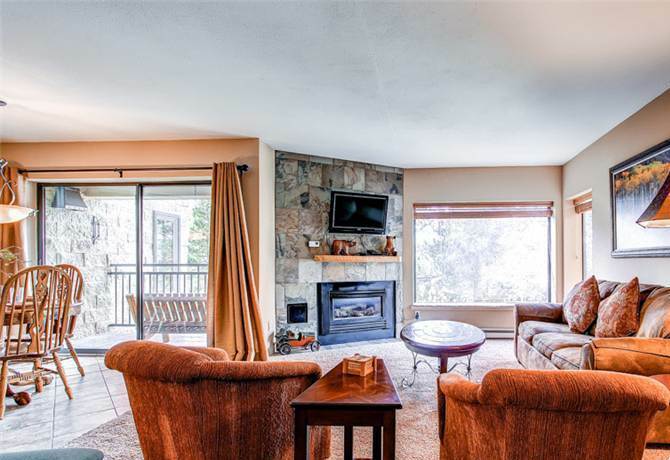 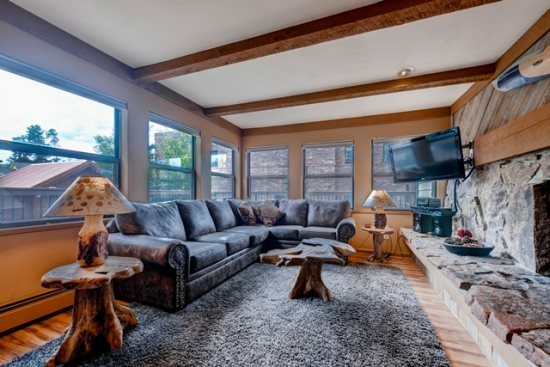 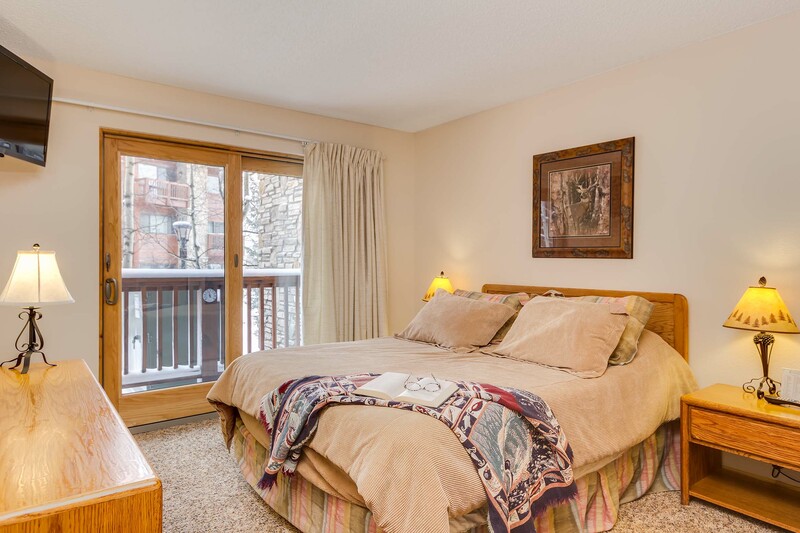 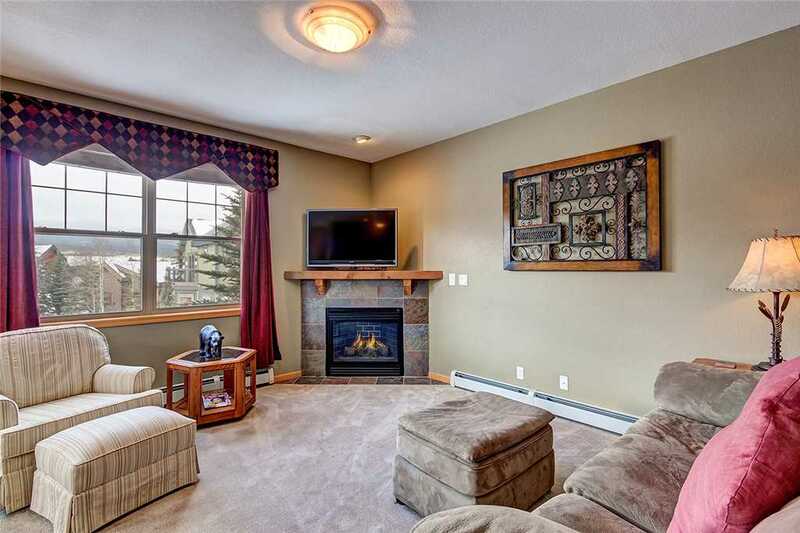 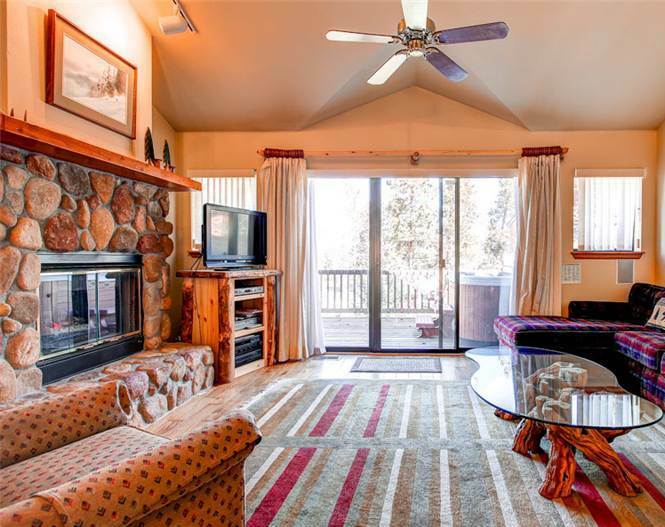 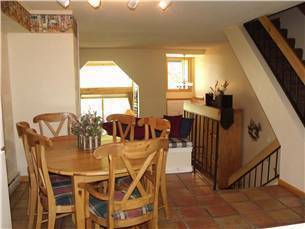 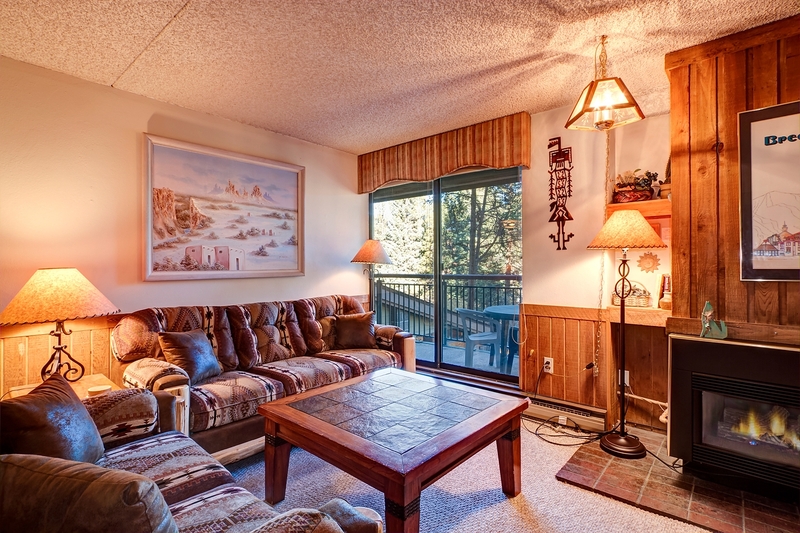 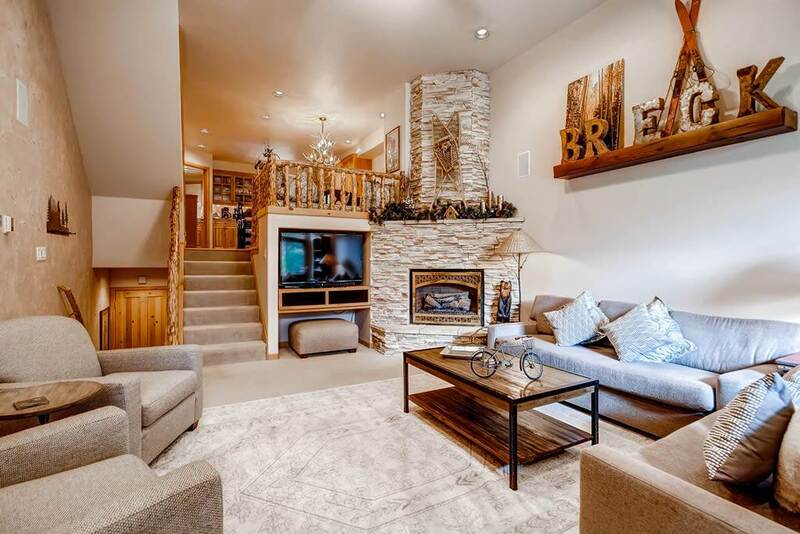 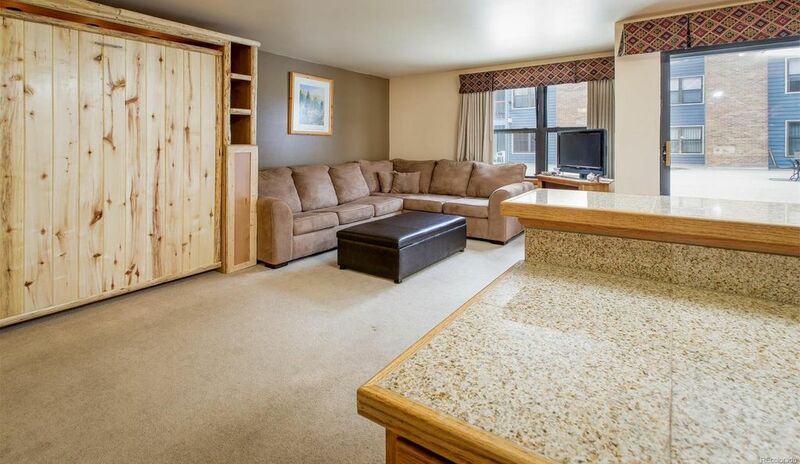 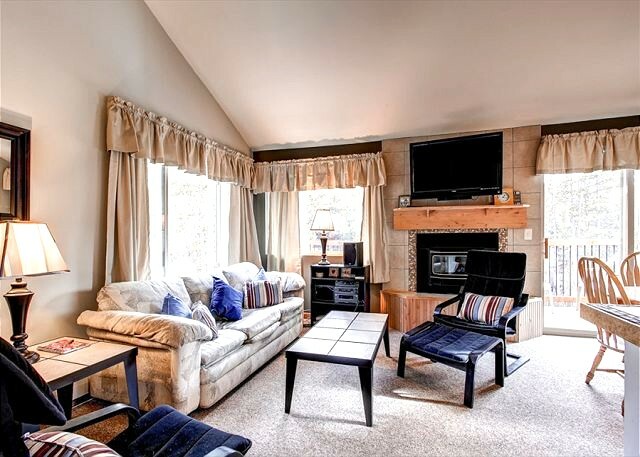 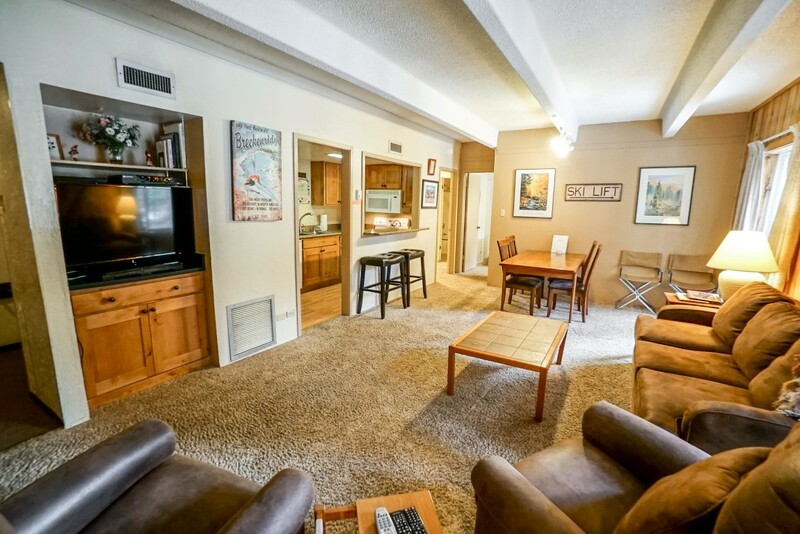 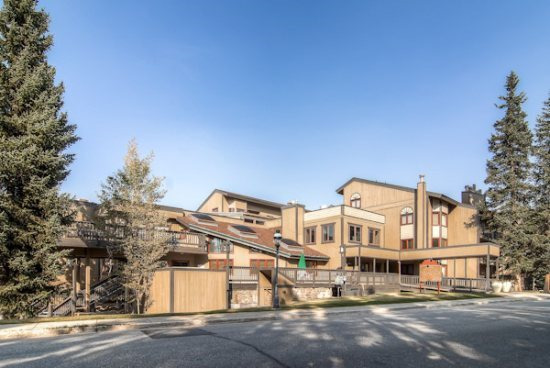 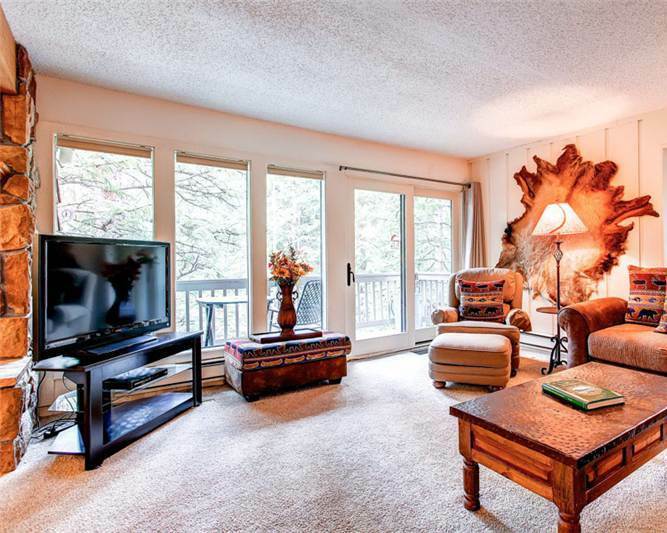 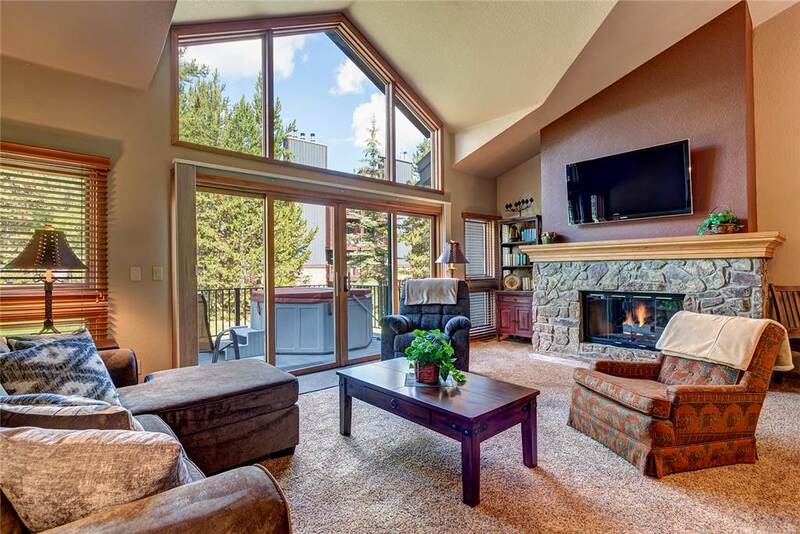 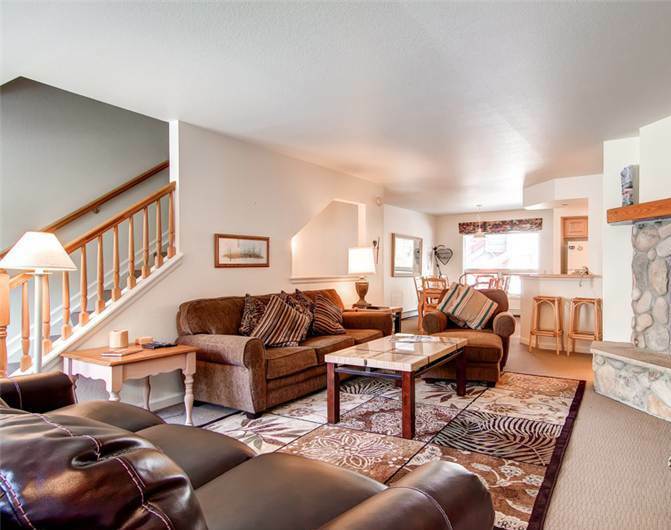 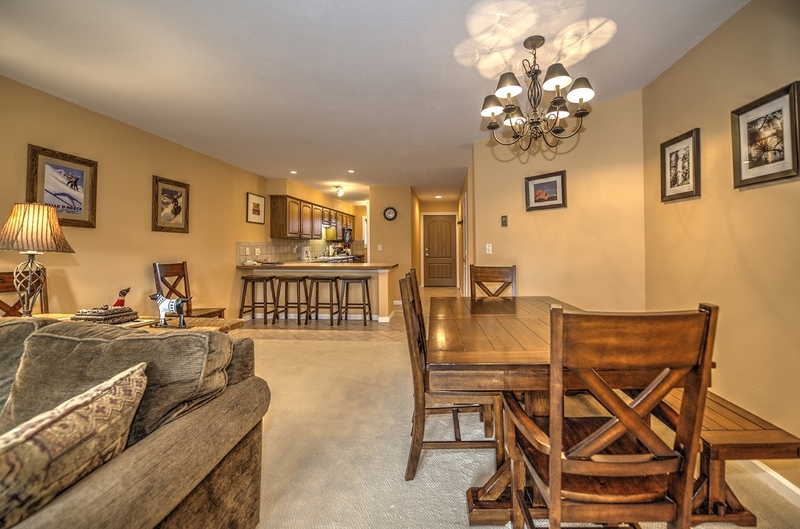 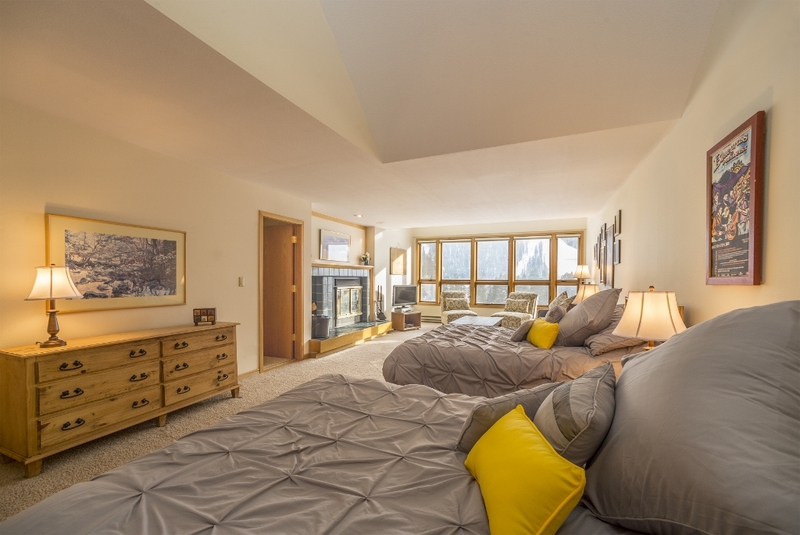 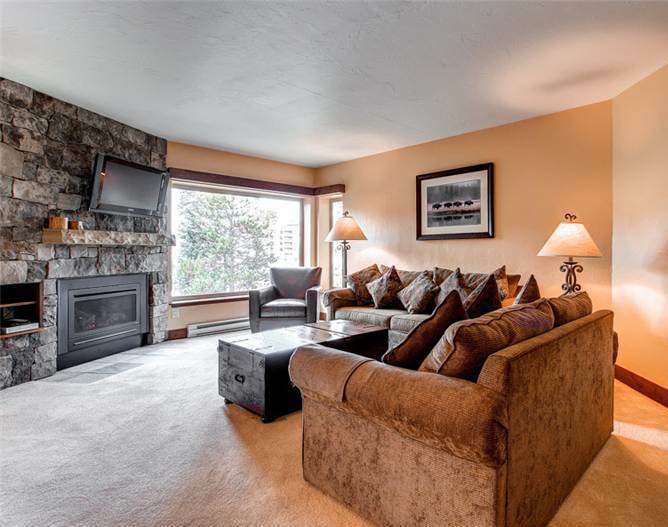 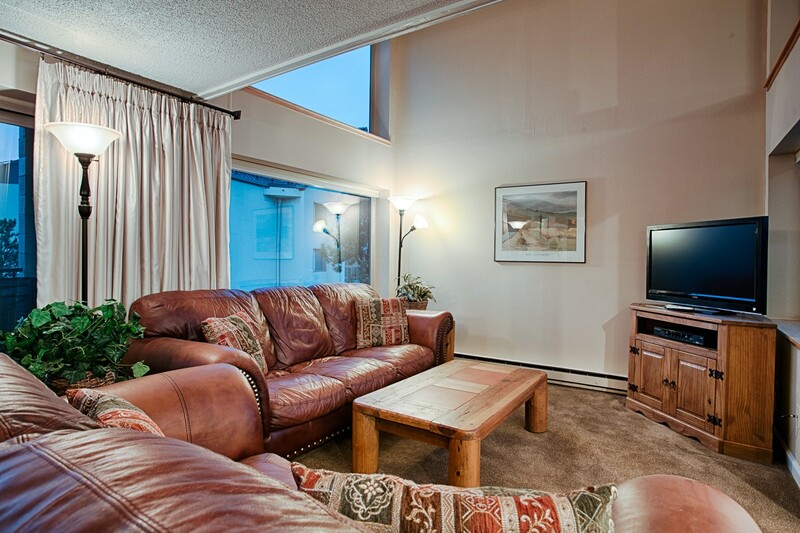 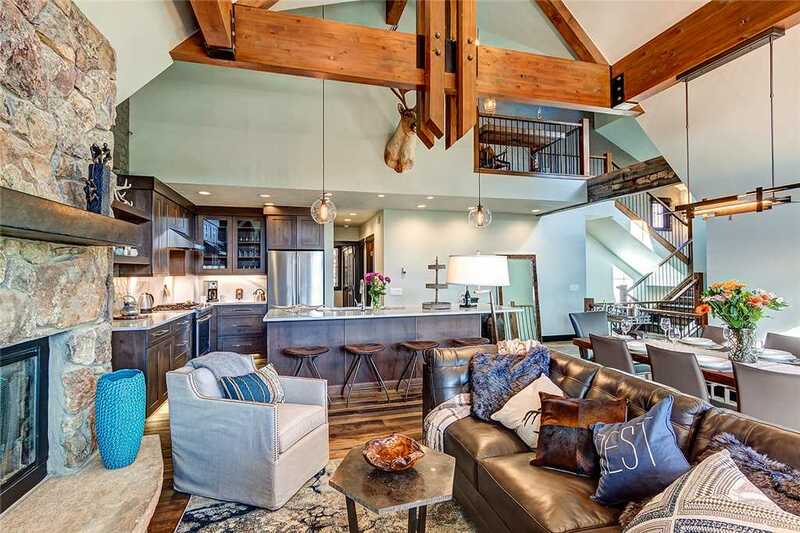 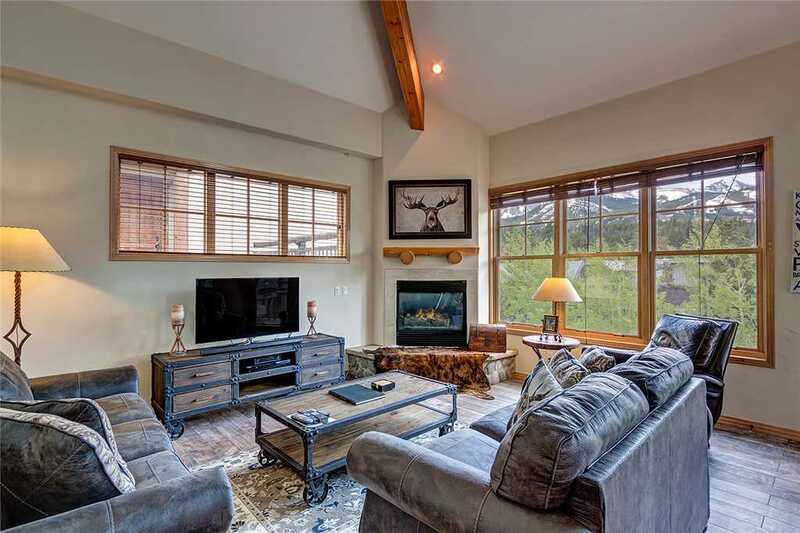 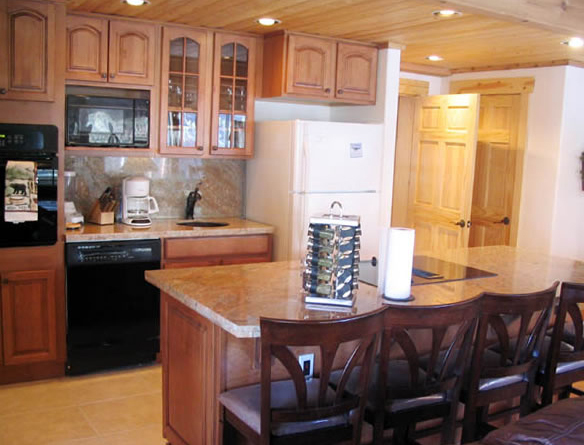 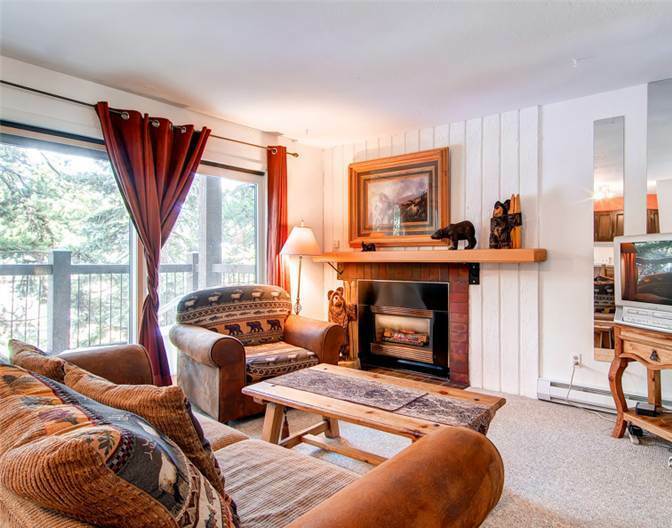 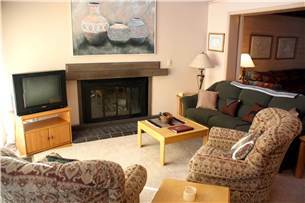 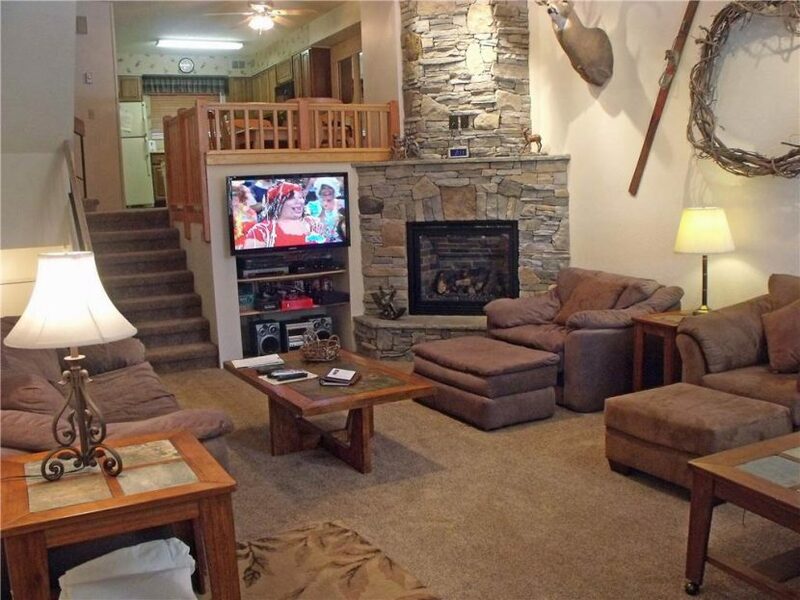 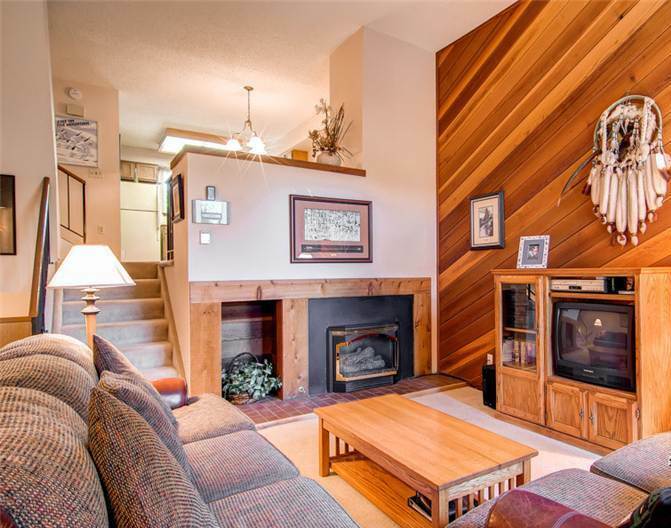 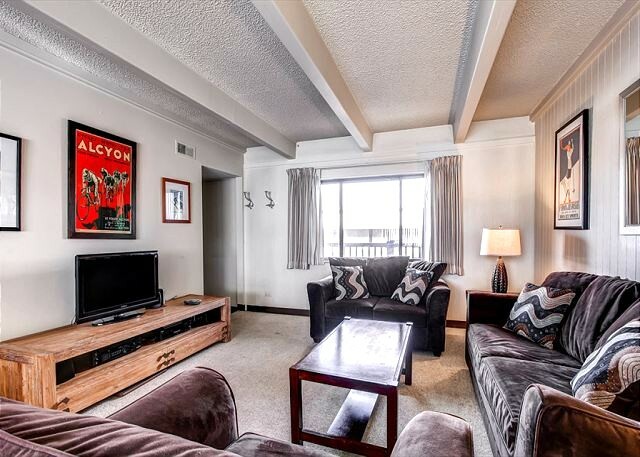 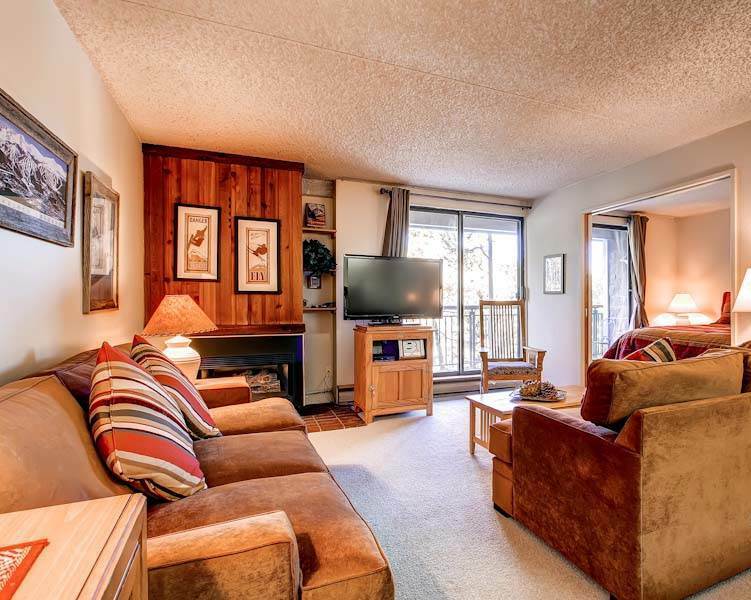 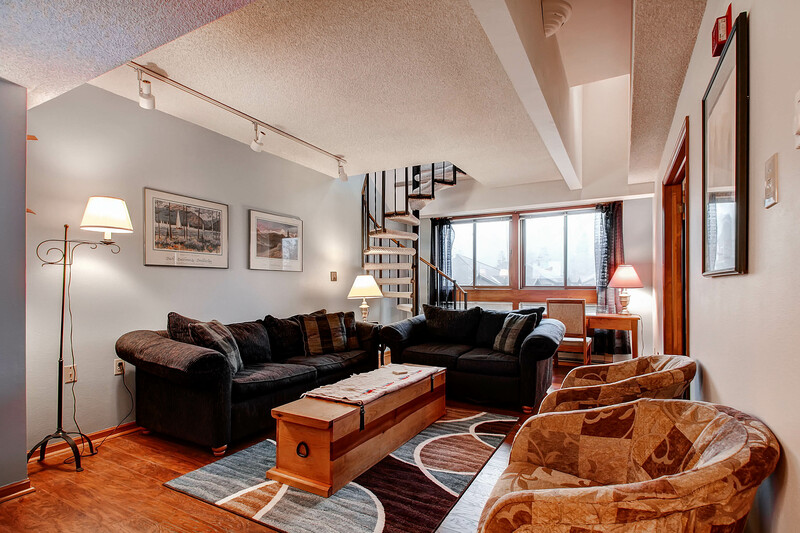 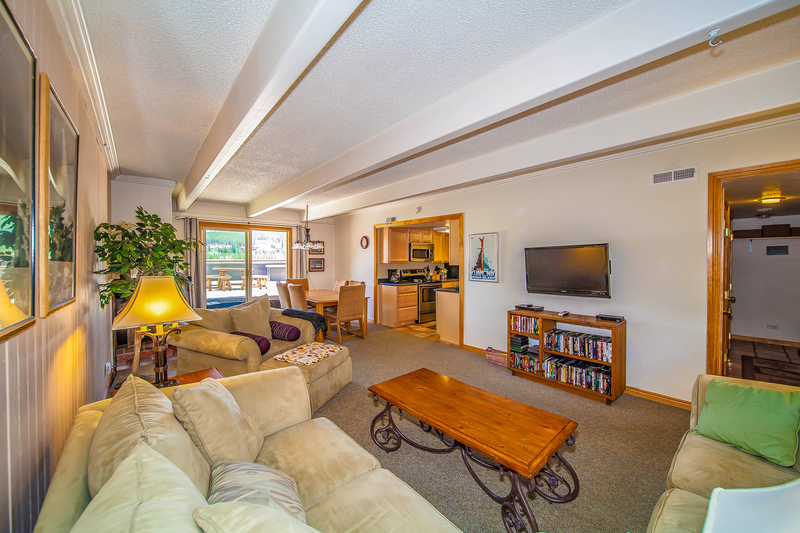 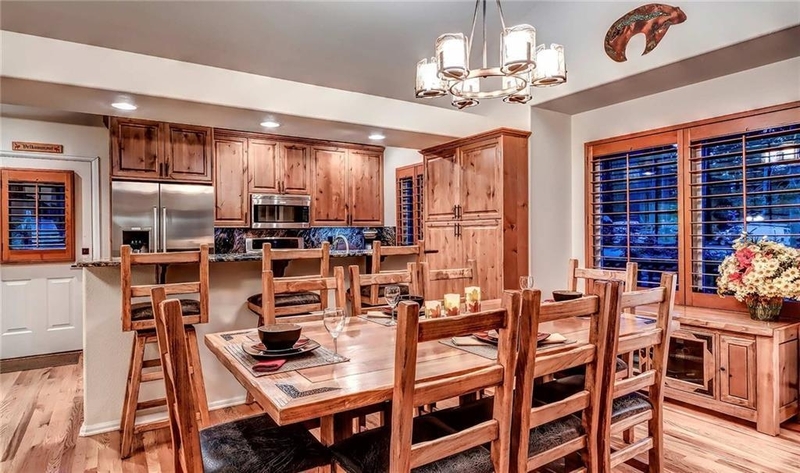 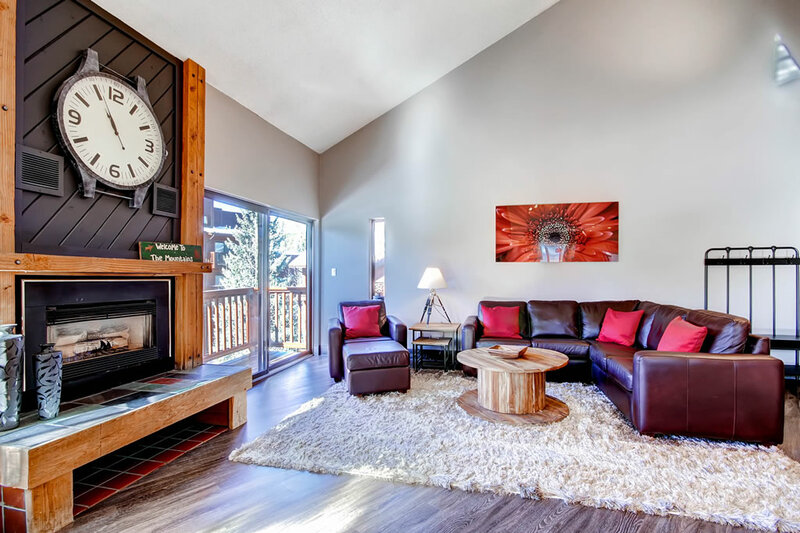 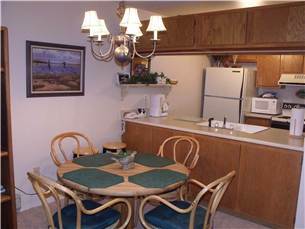 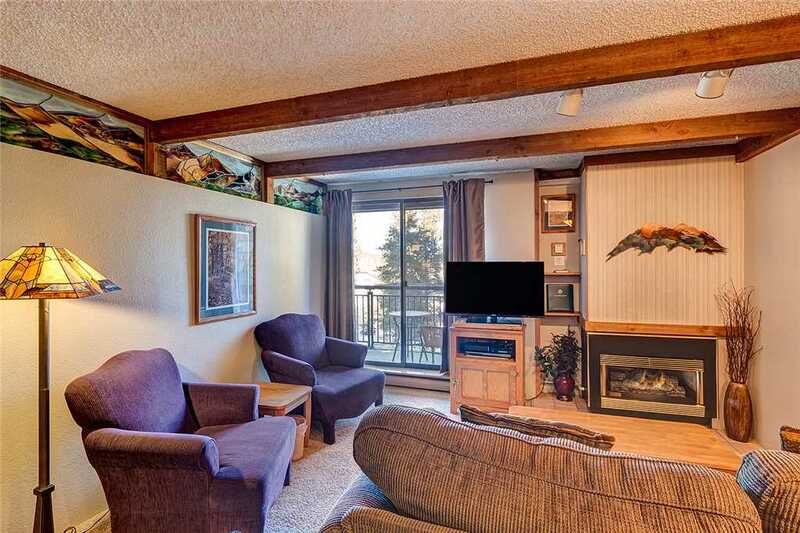 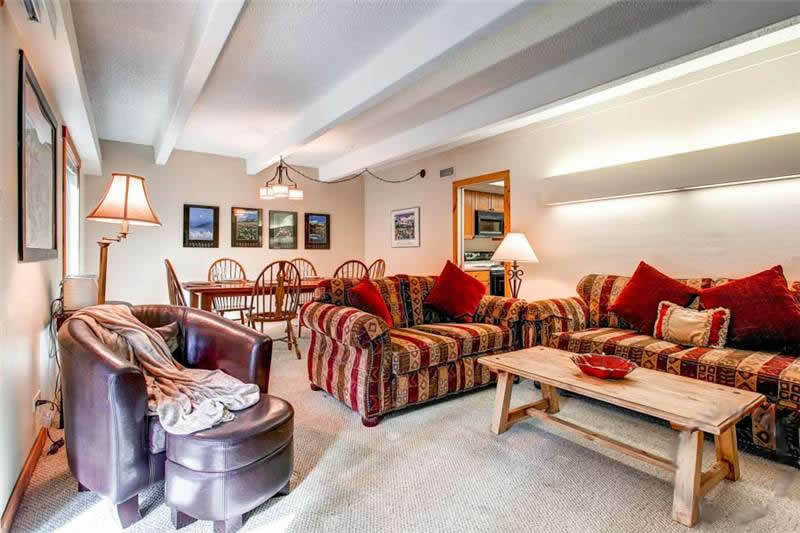 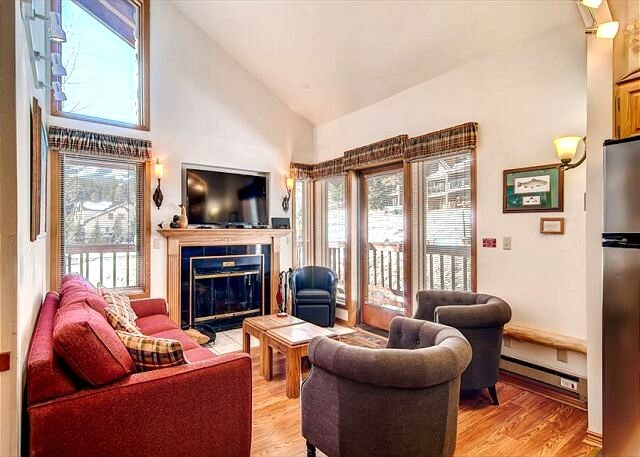 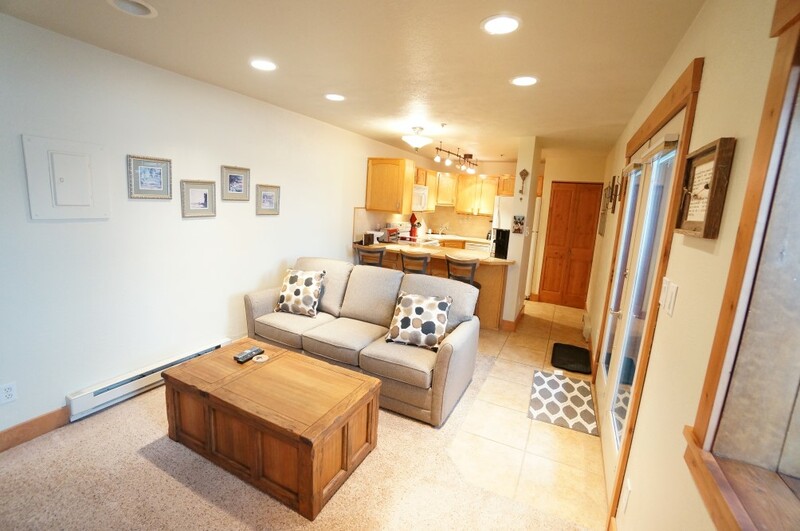 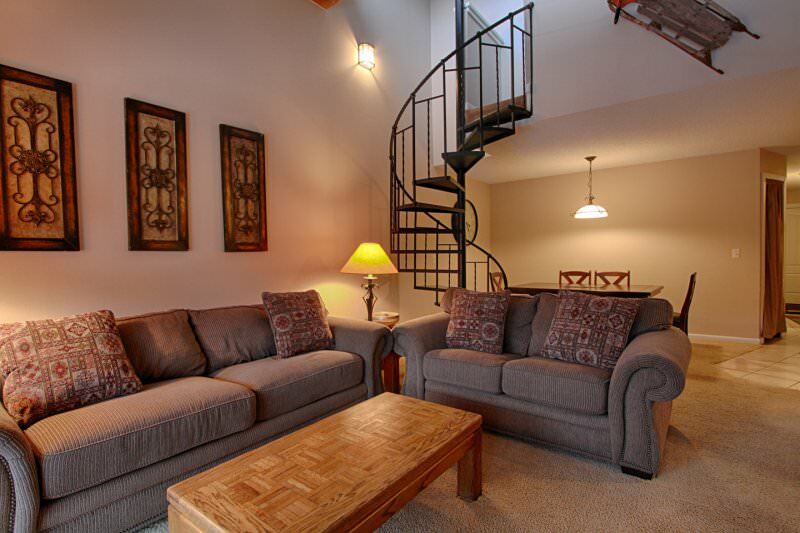 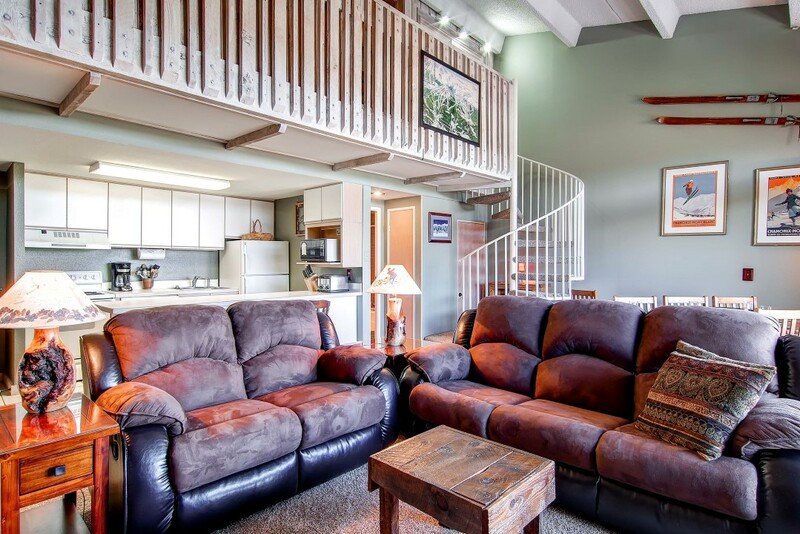 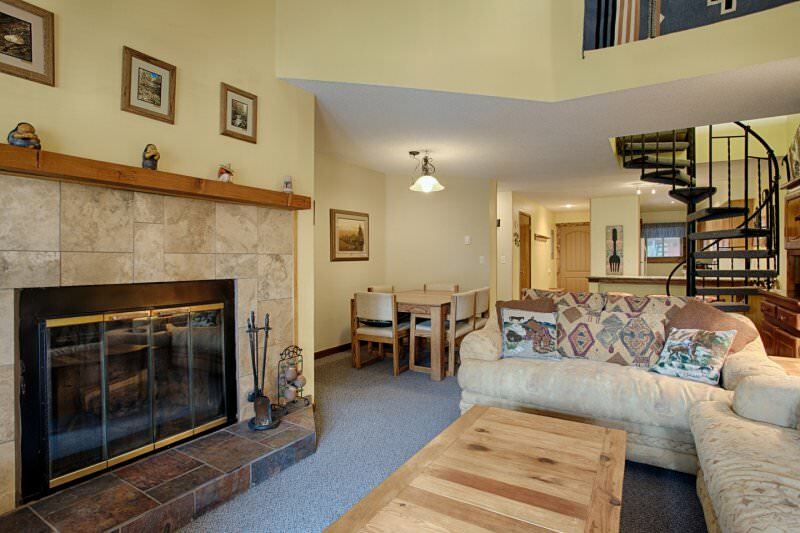 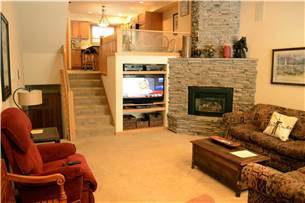 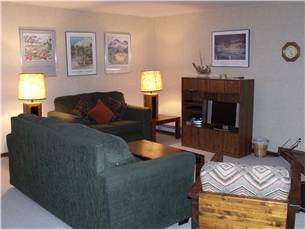 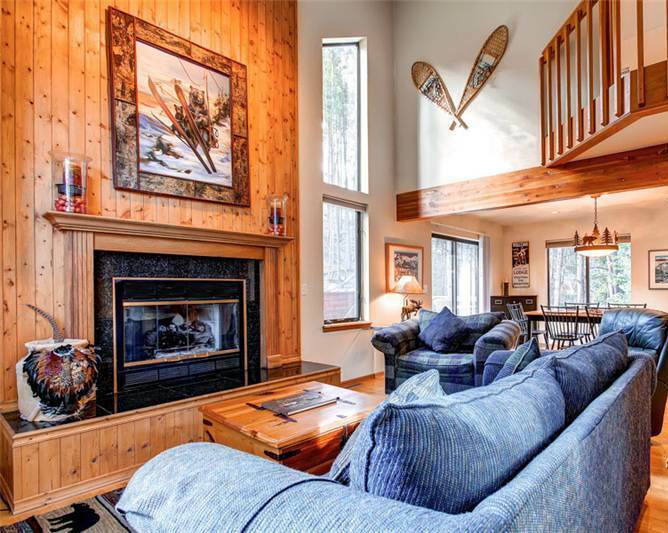 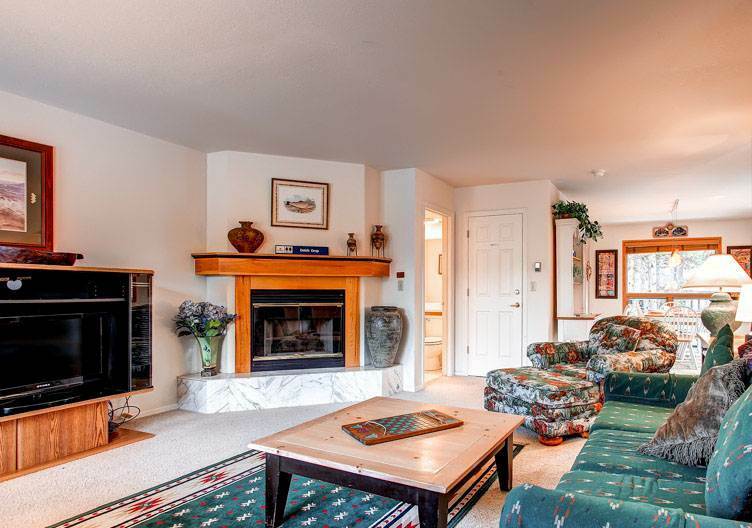 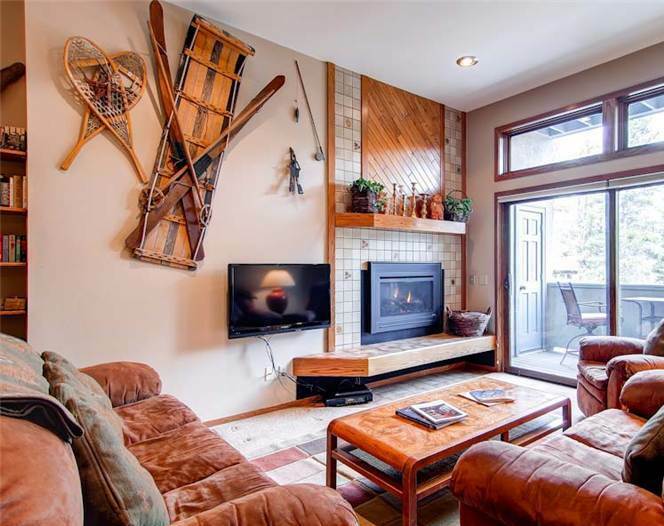 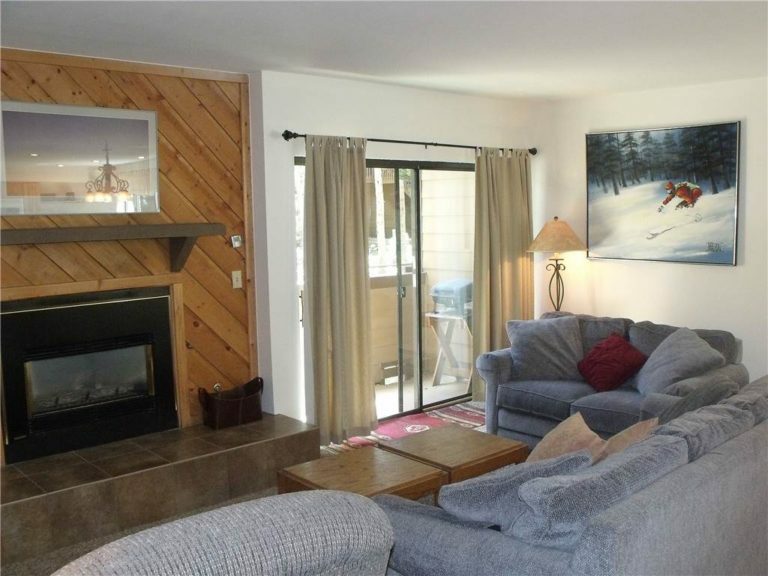 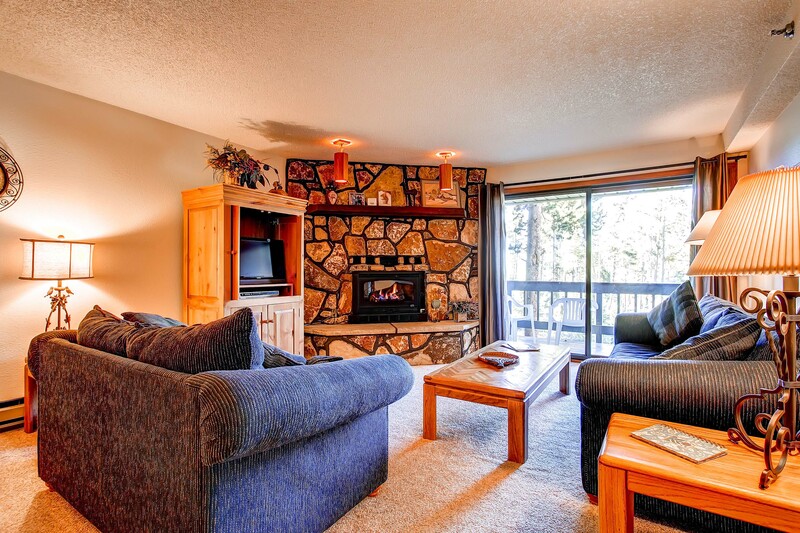 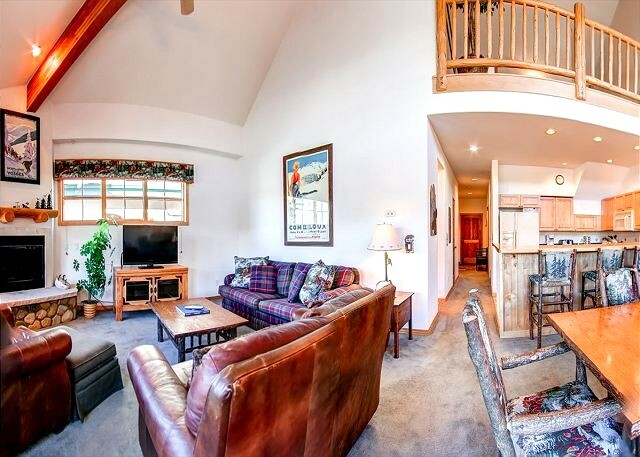 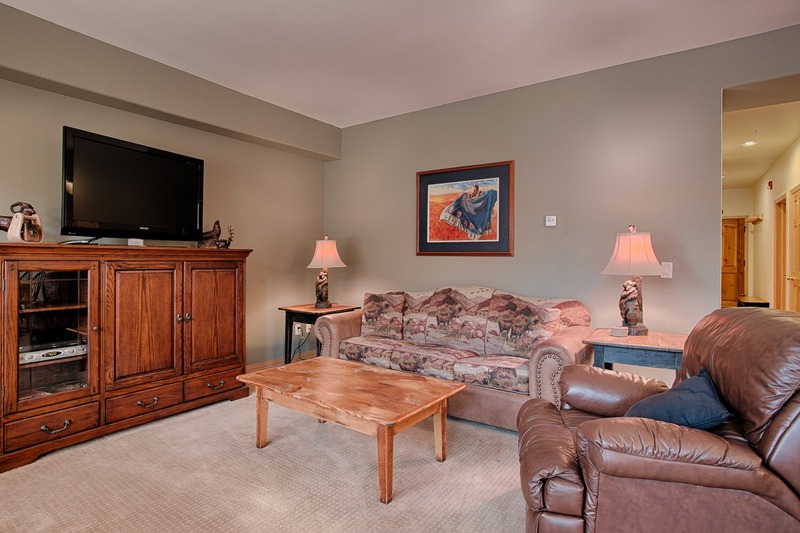 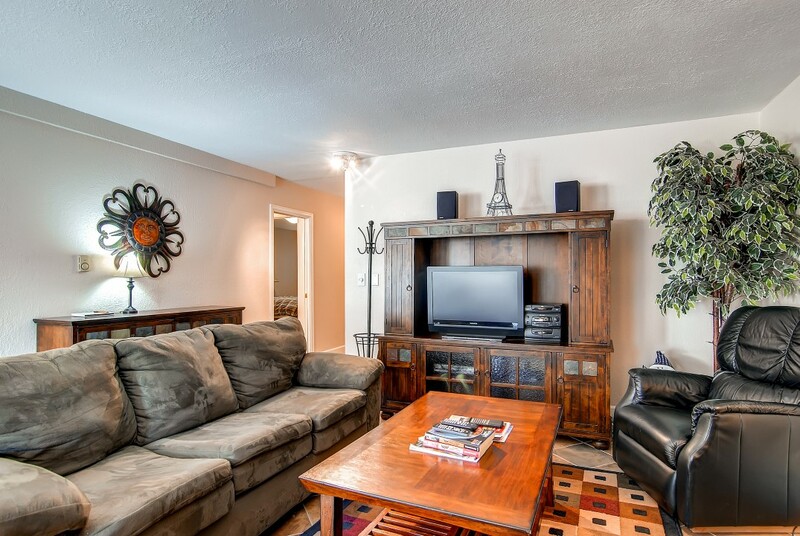 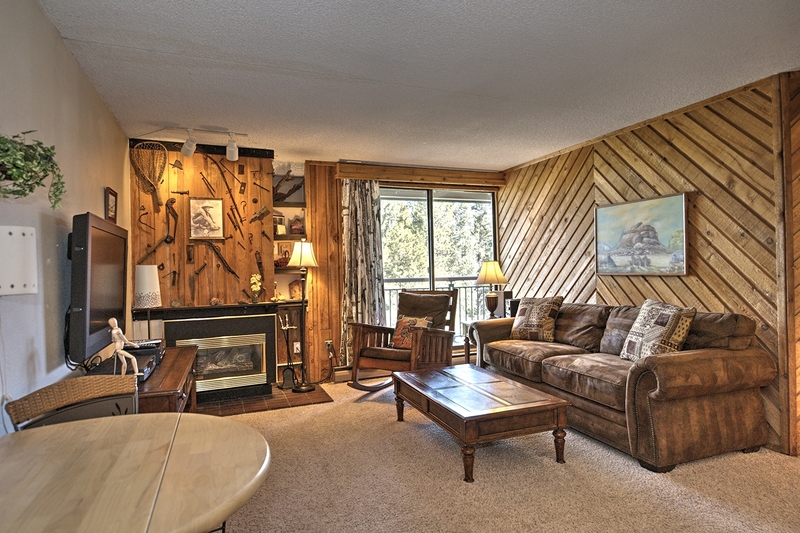 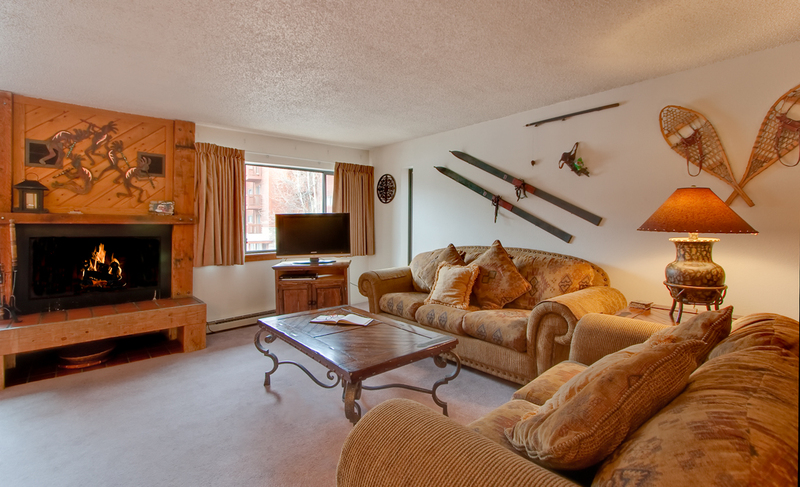 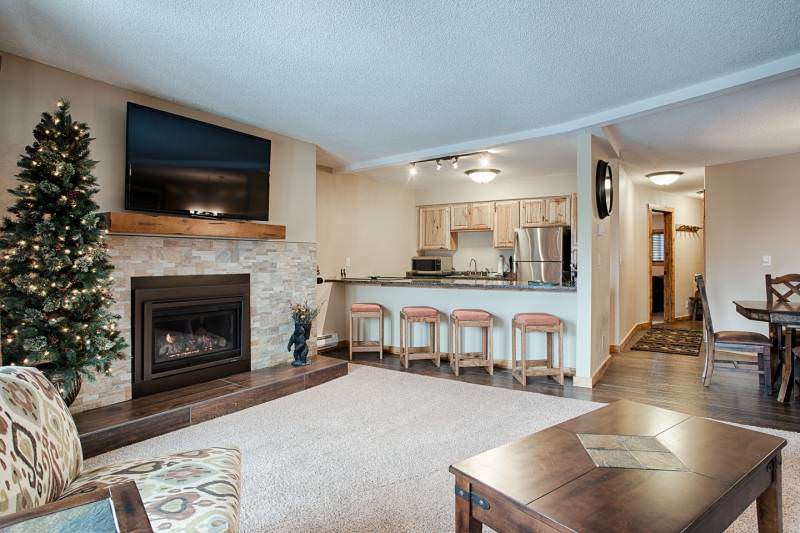 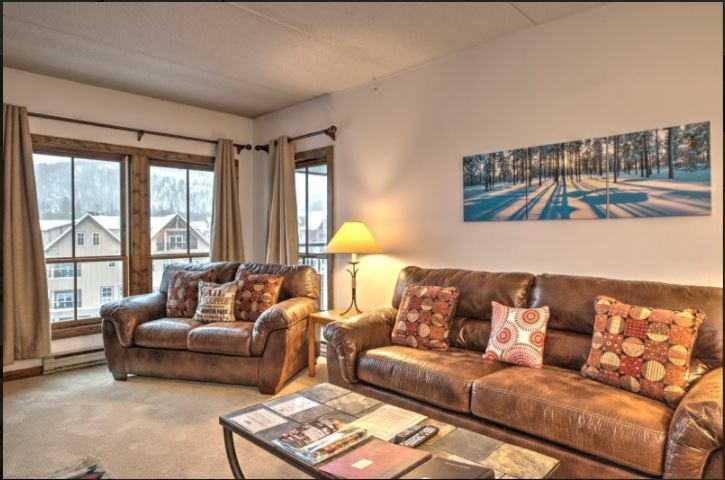 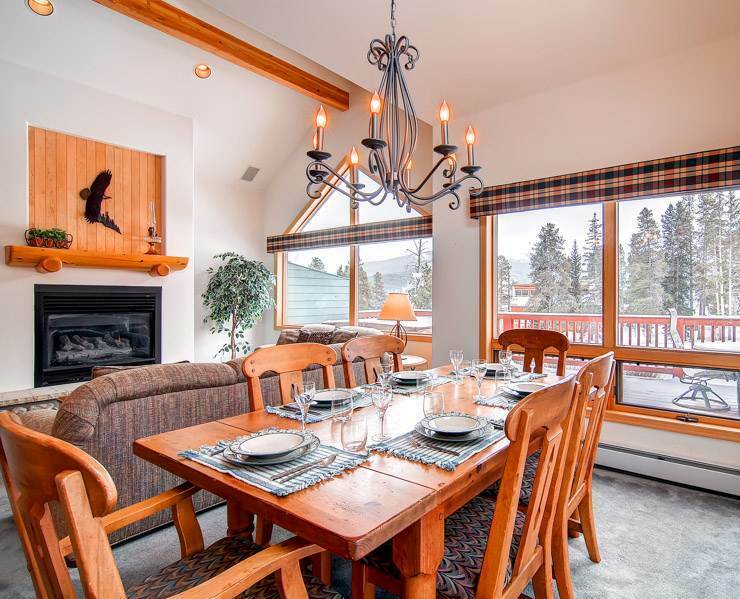 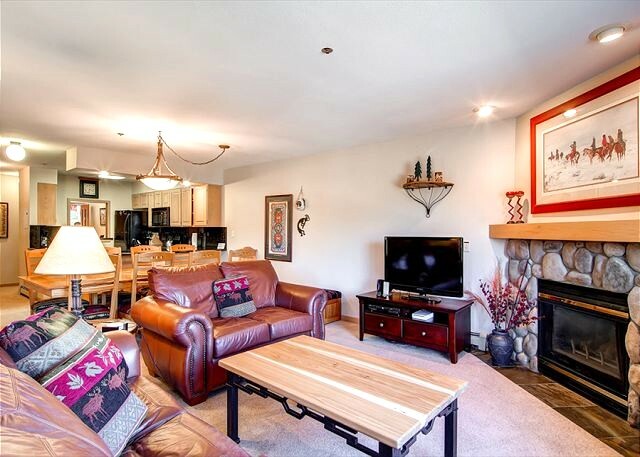 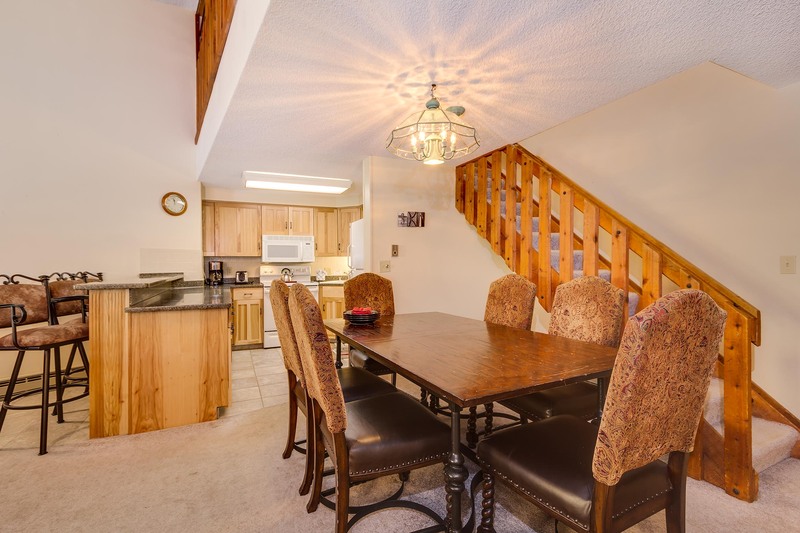 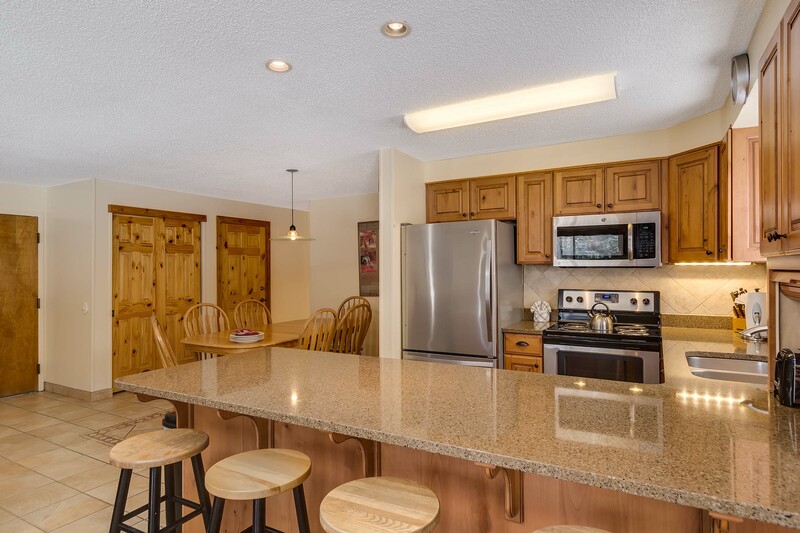 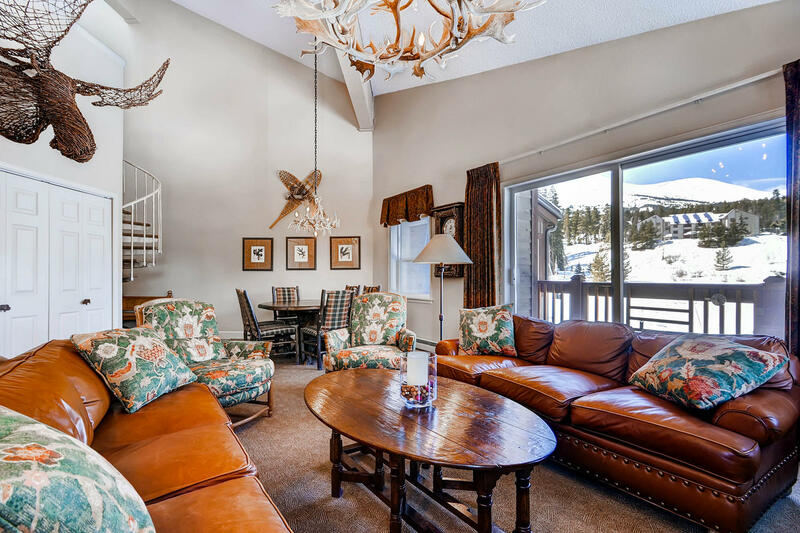 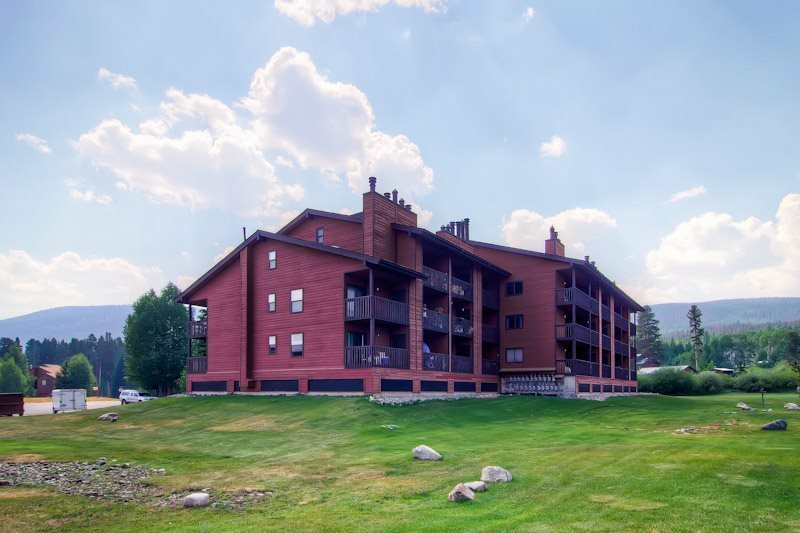 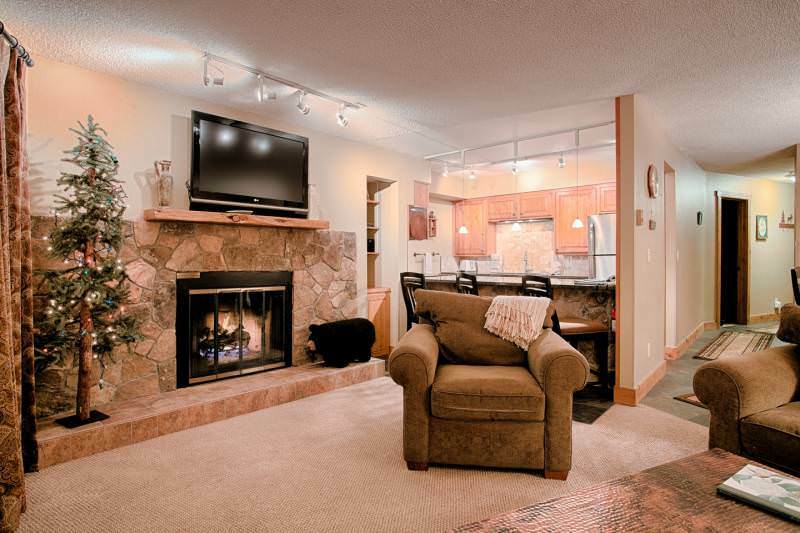 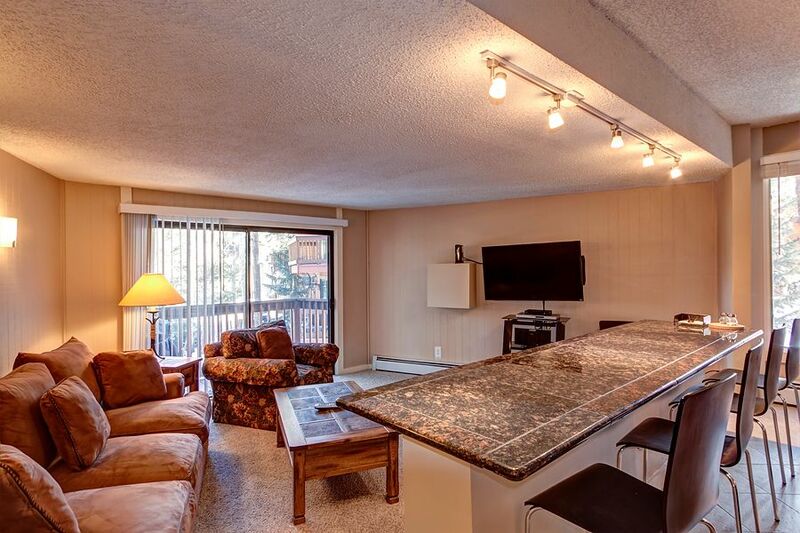 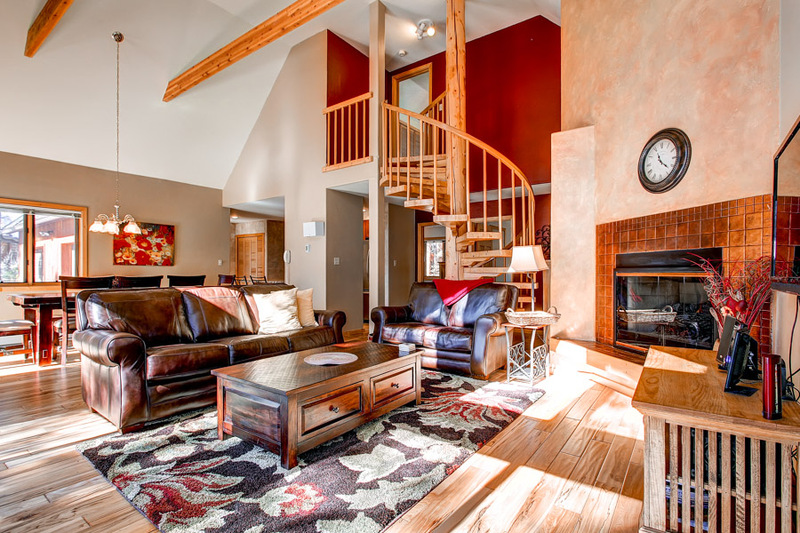 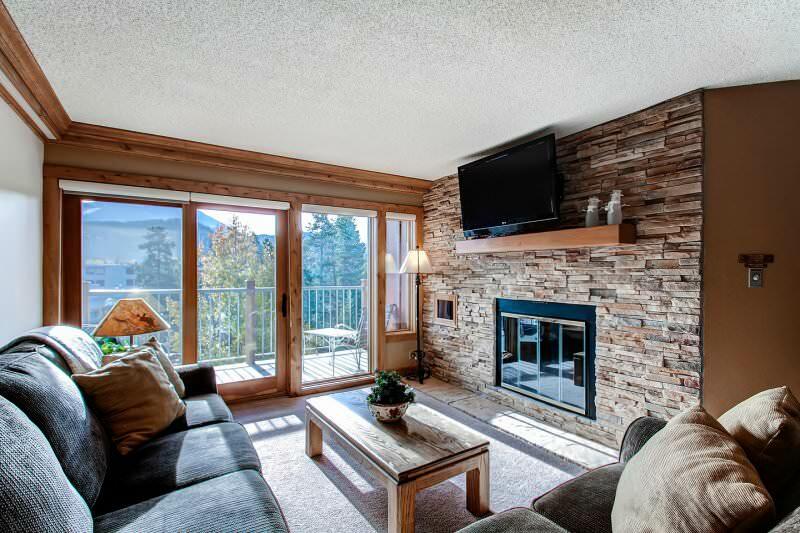 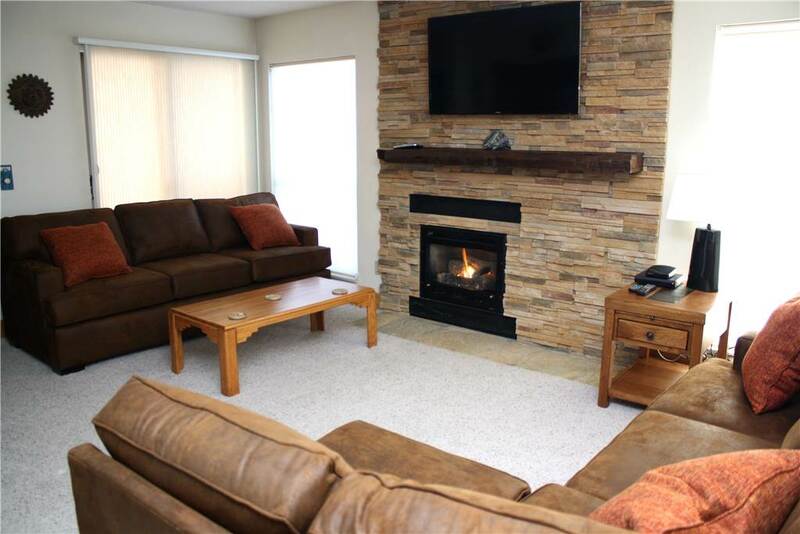 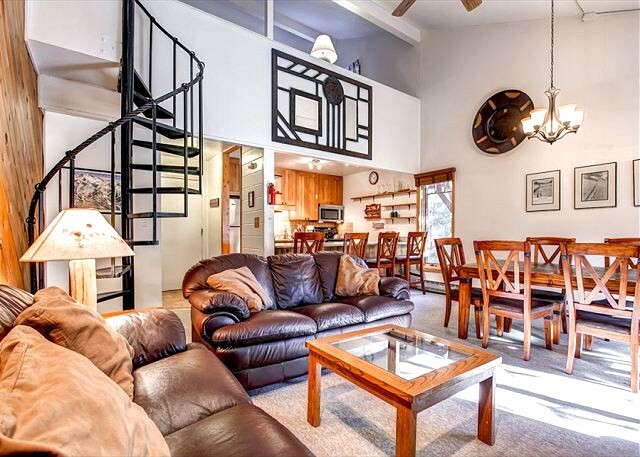 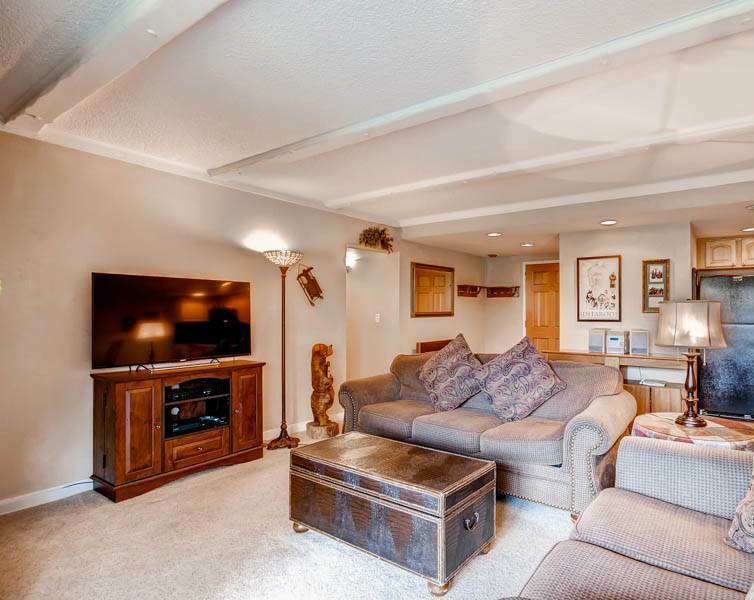 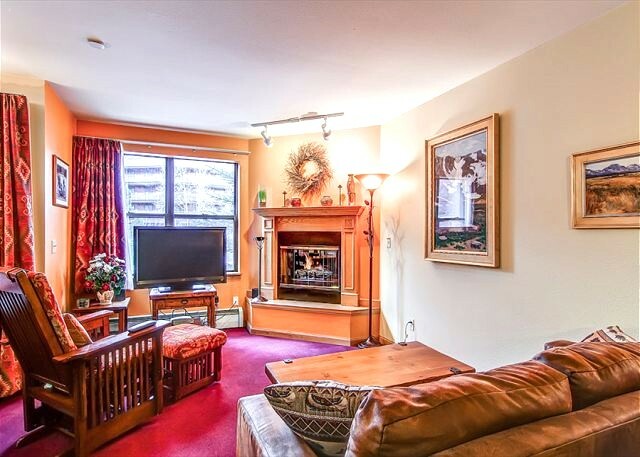 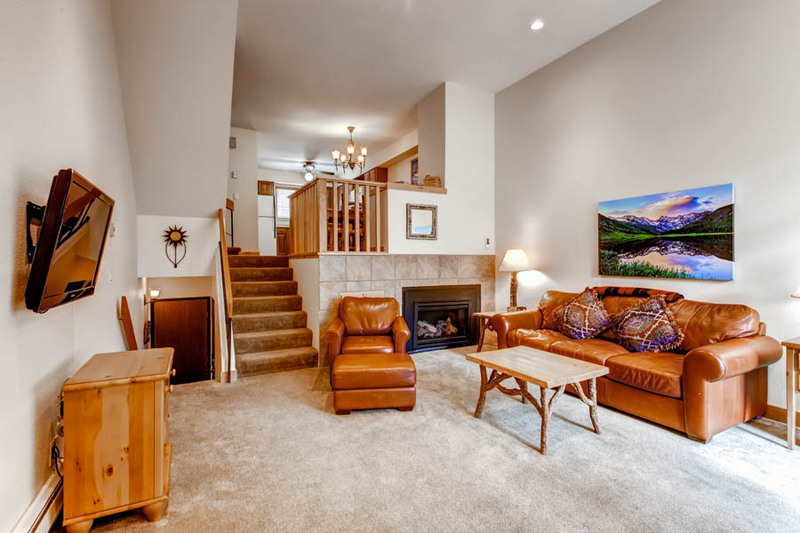 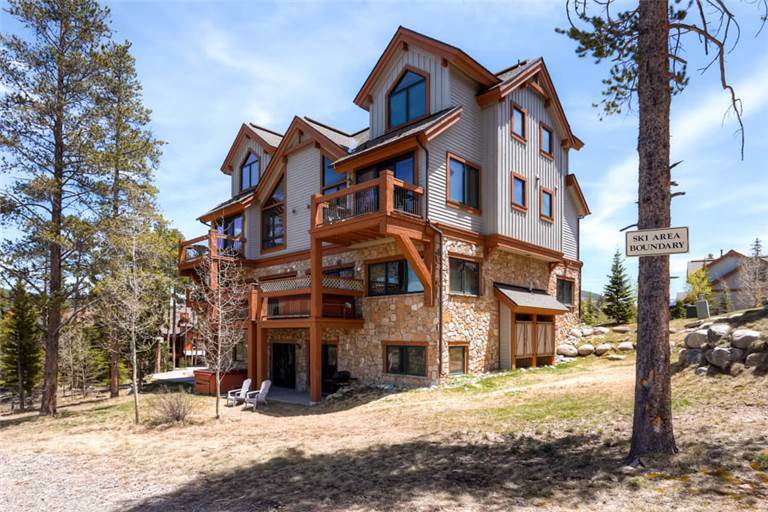 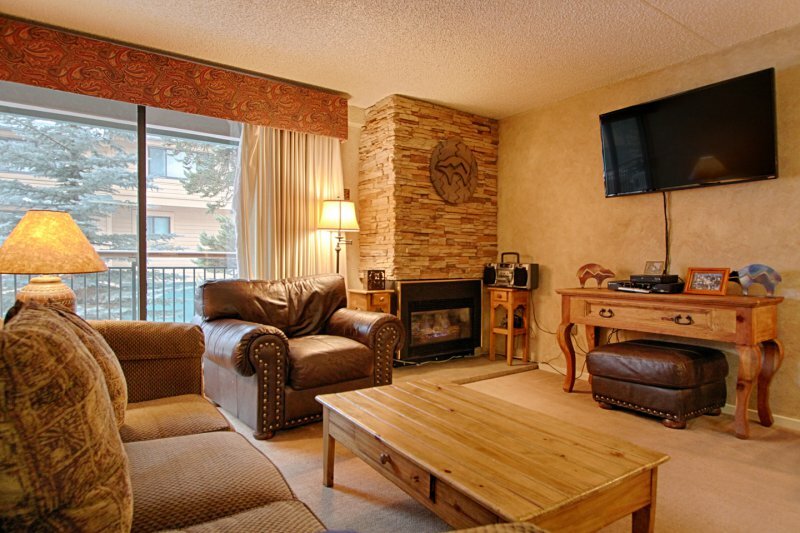 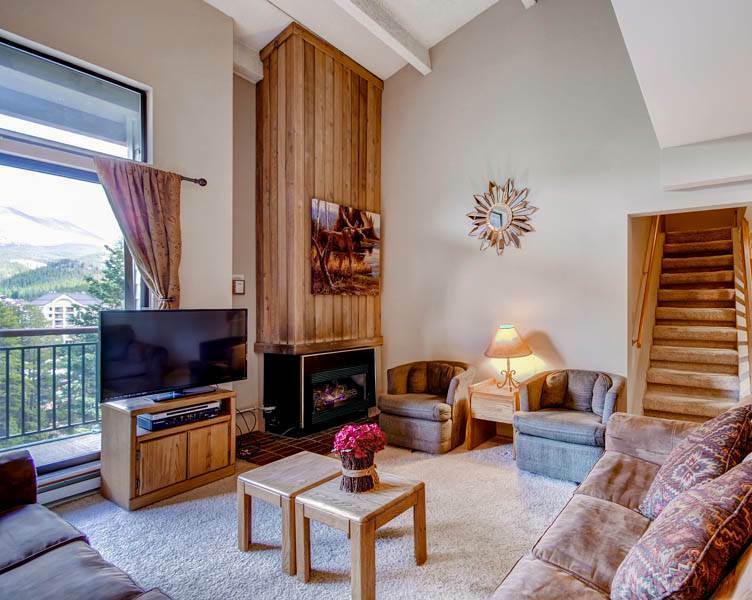 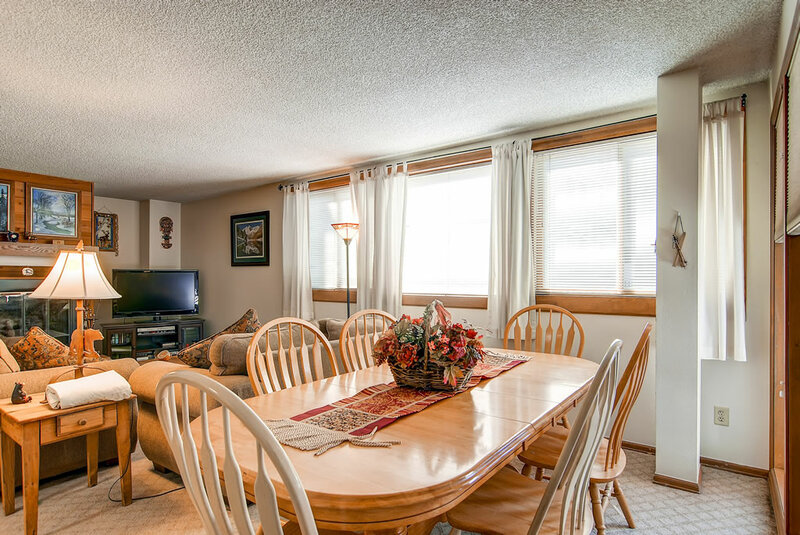 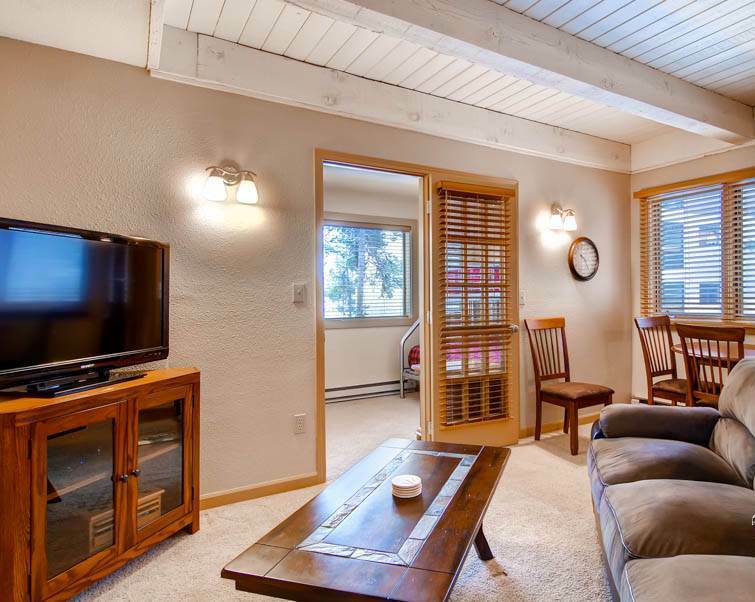 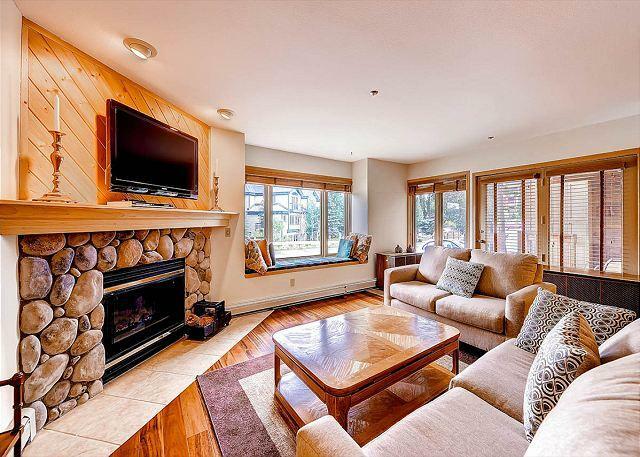 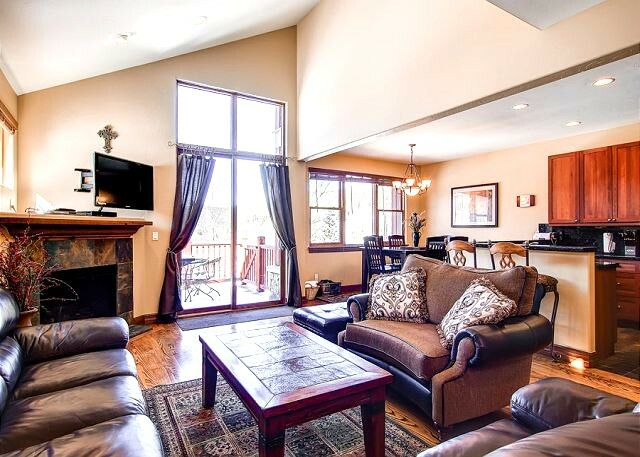 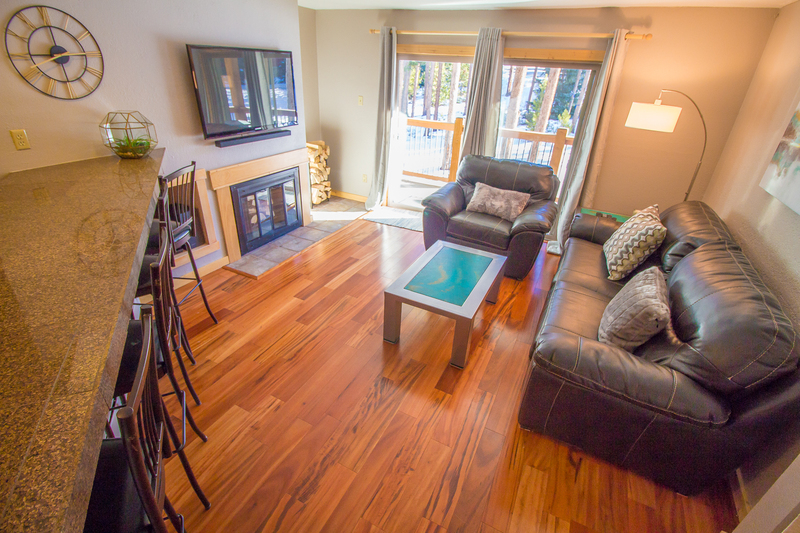 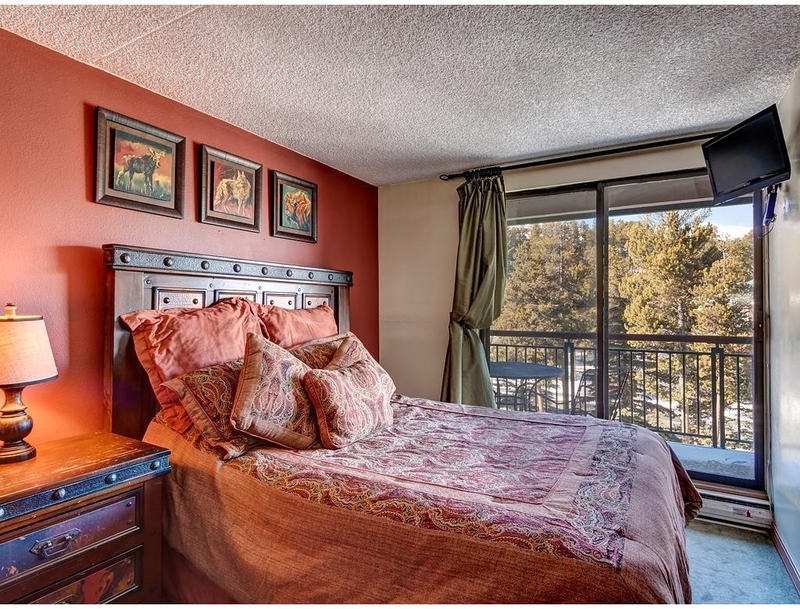 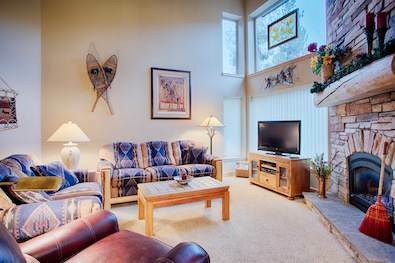 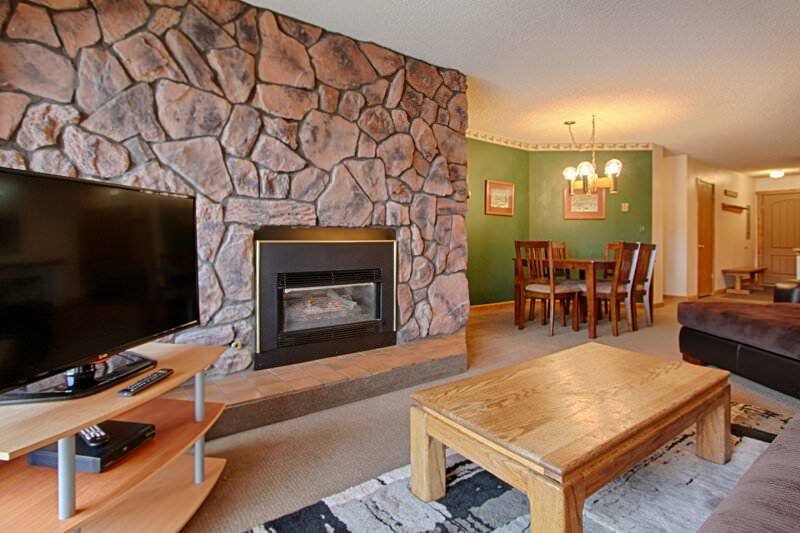 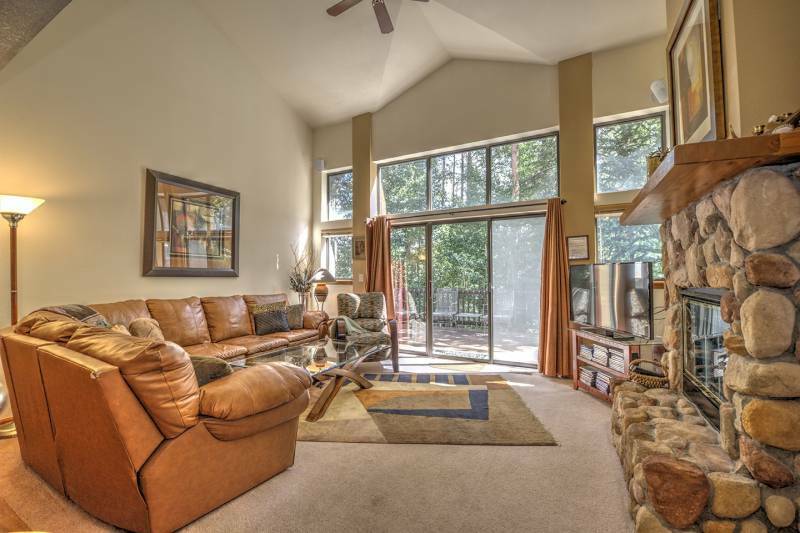 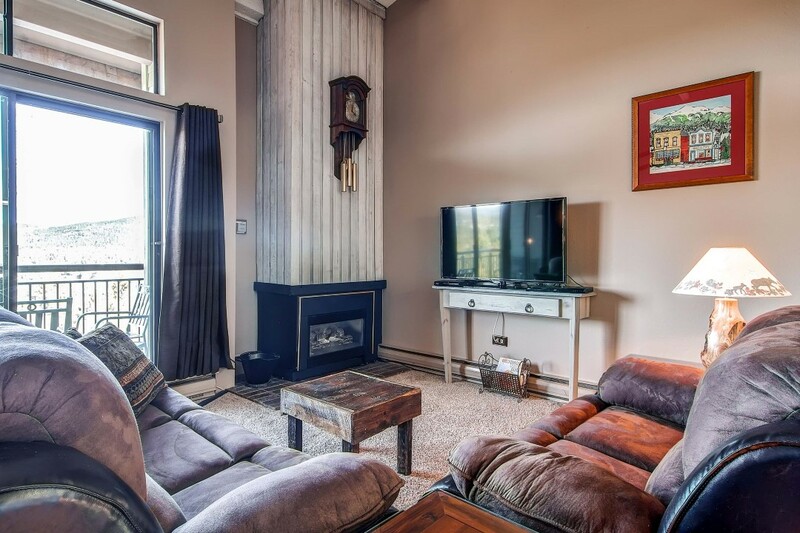 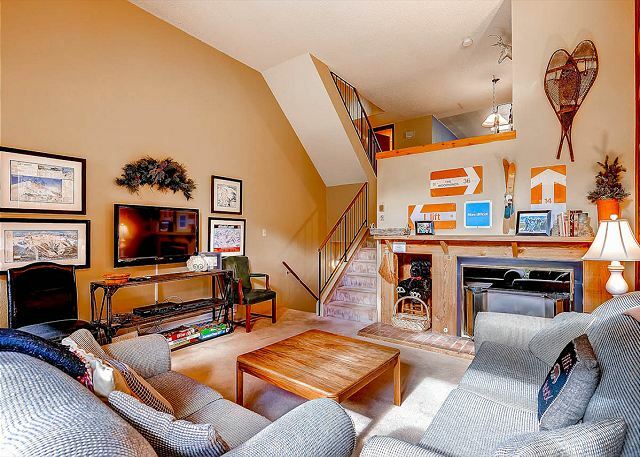 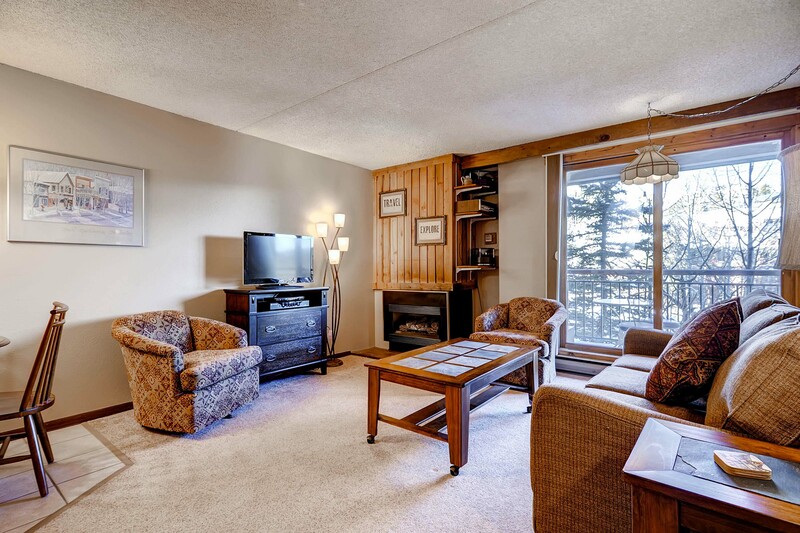 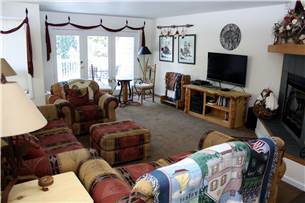 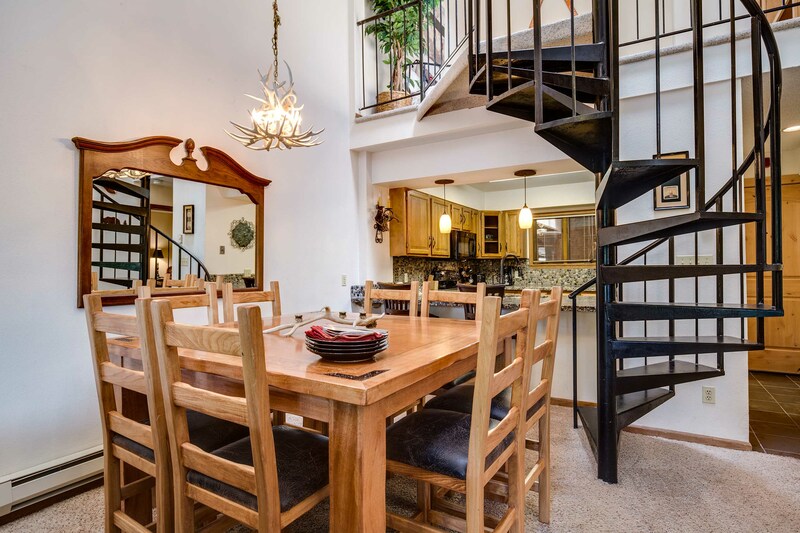 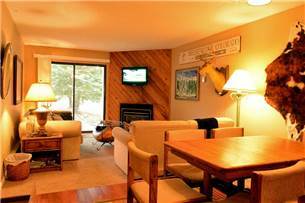 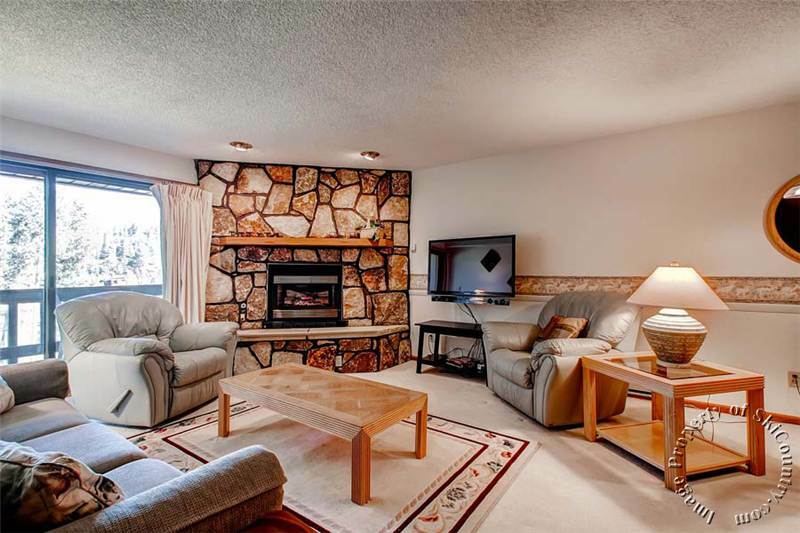 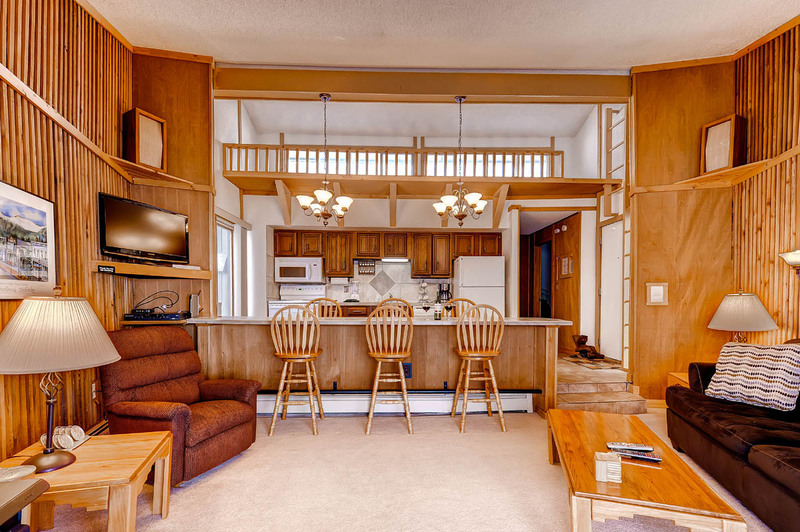 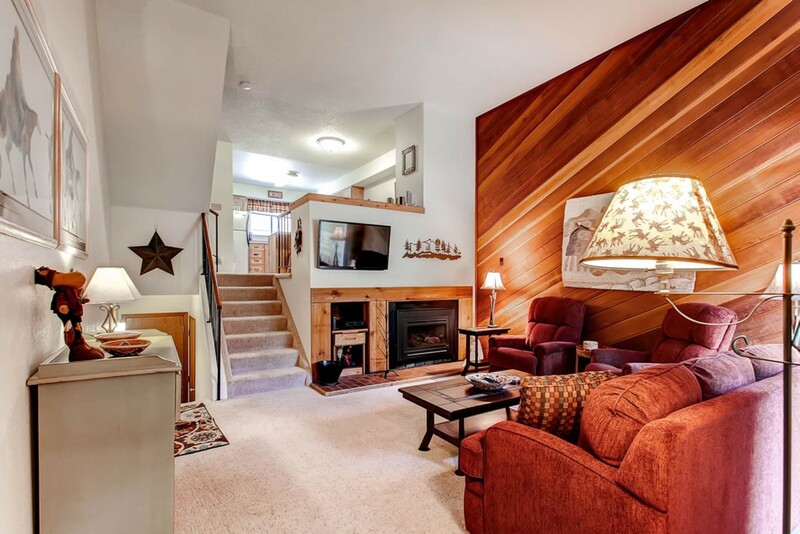 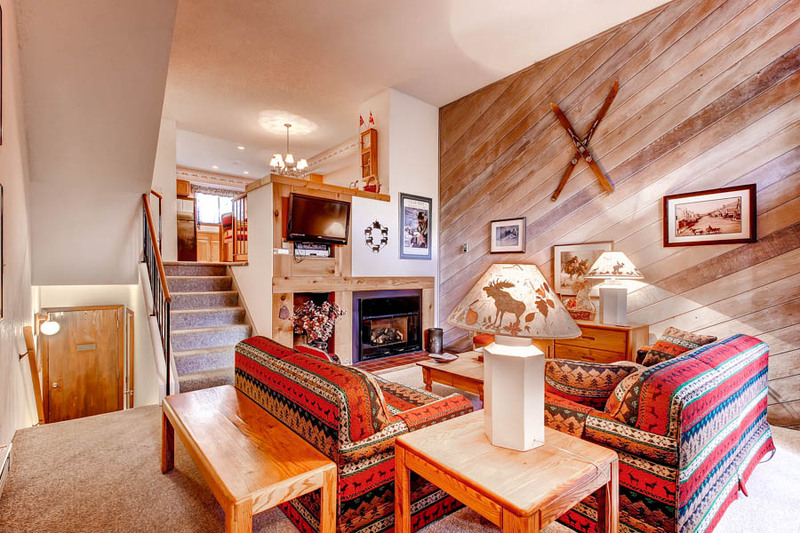 This multi-level townhome is an absolute must for your ski vacation with 3 bedrooms plus a den and three and a half bathrooms, is equipped with everything you need. 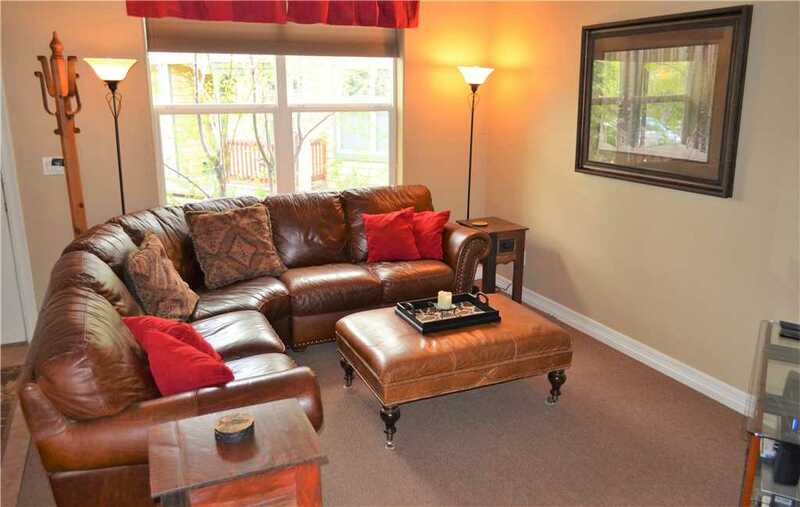 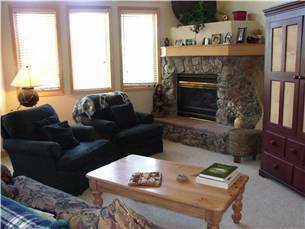 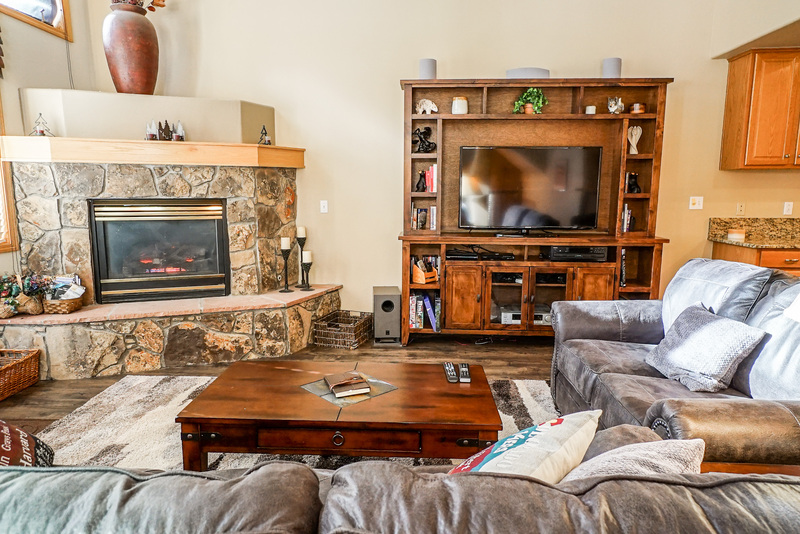 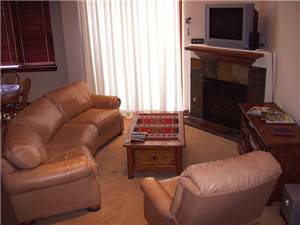 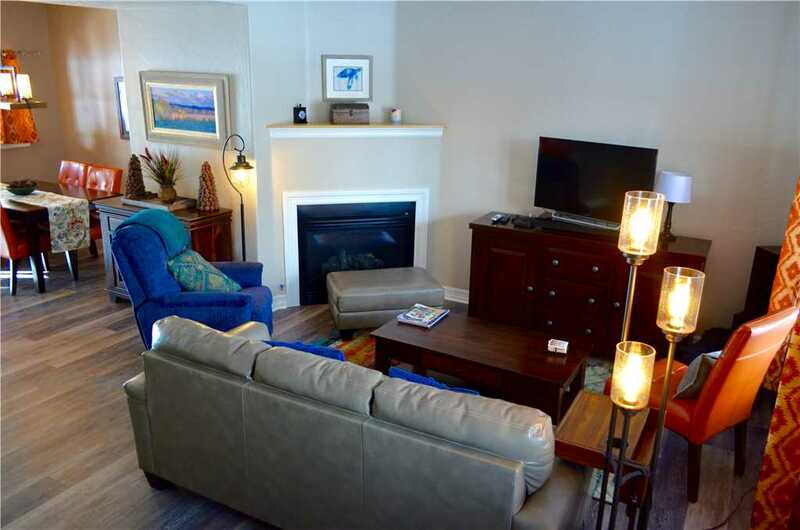 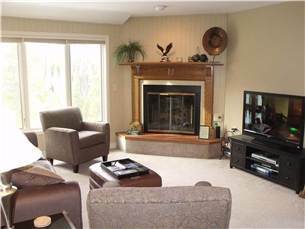 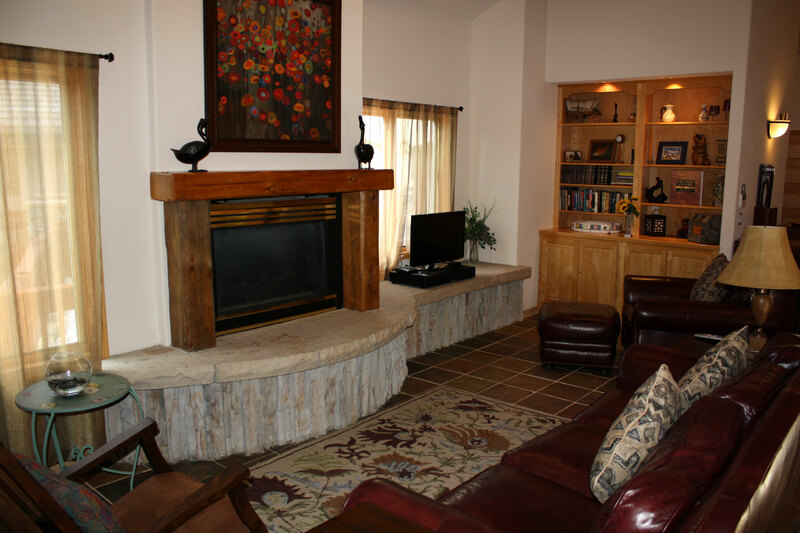 The living room is centered around the immense gas fireplace and has a full entertainment center where you can watch your favorite DVD on the flat screen 42″ TV. 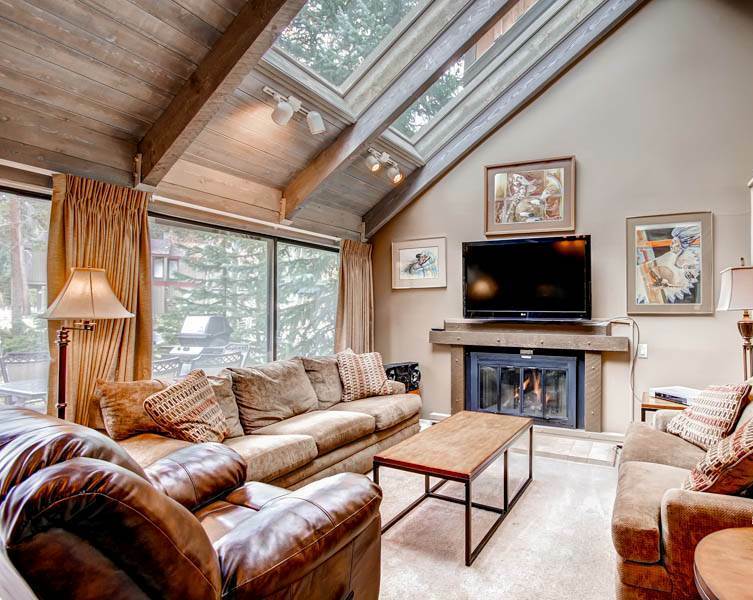 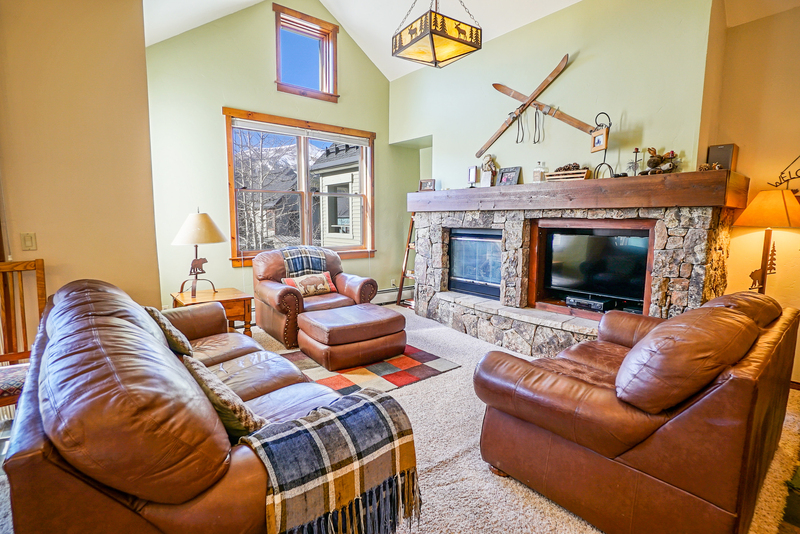 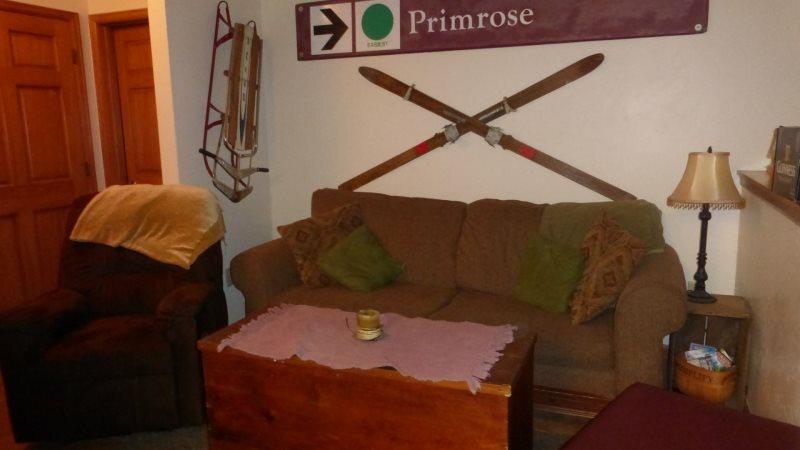 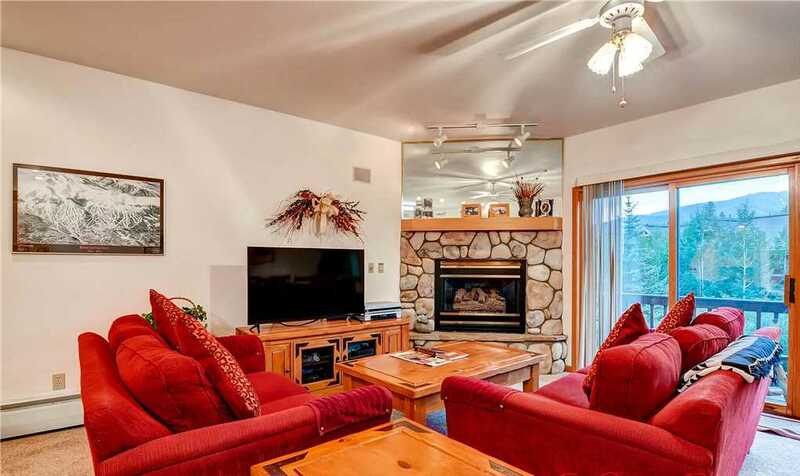 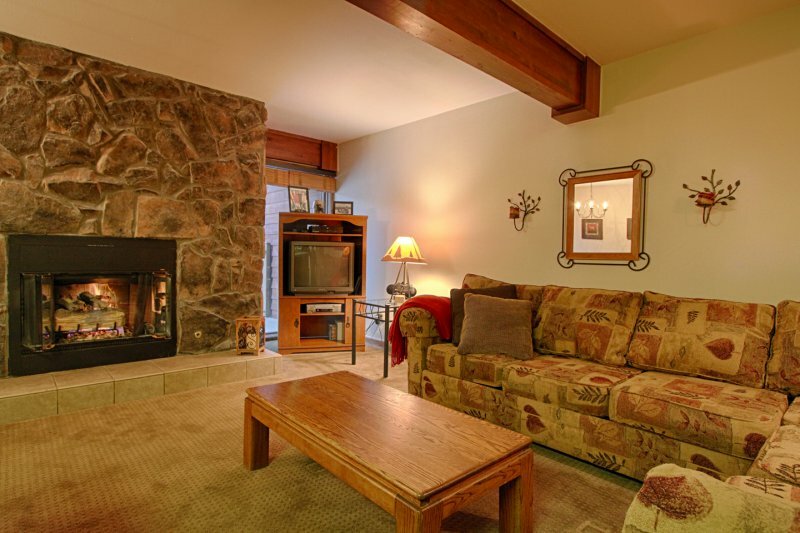 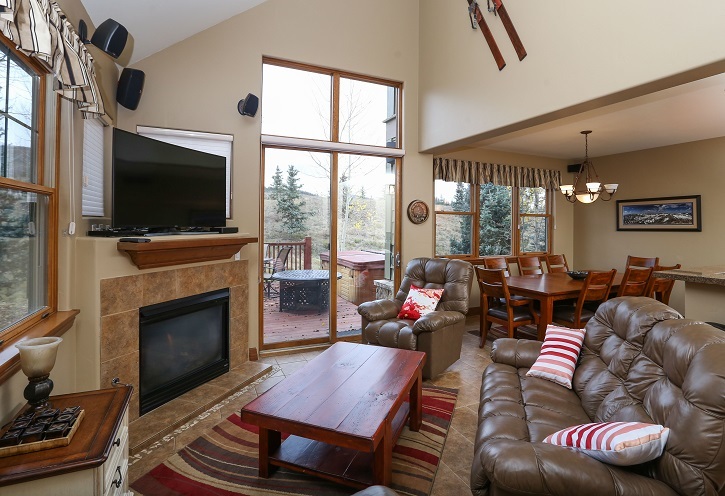 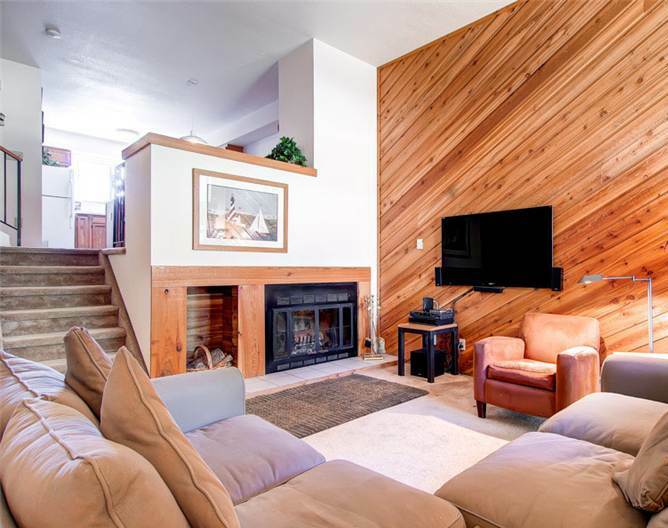 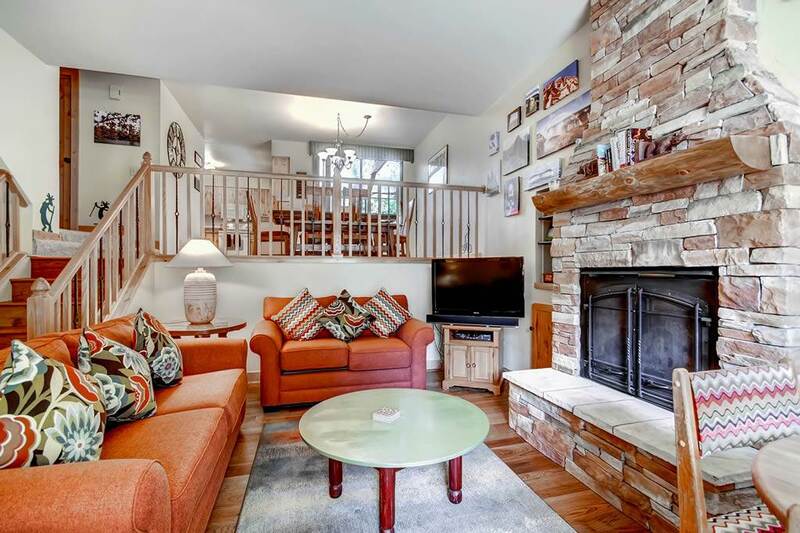 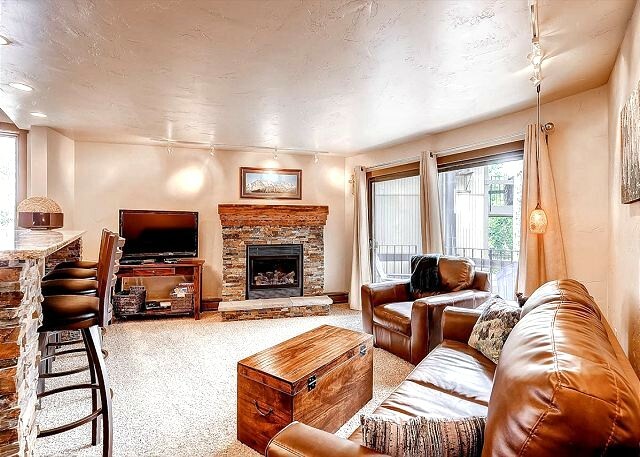 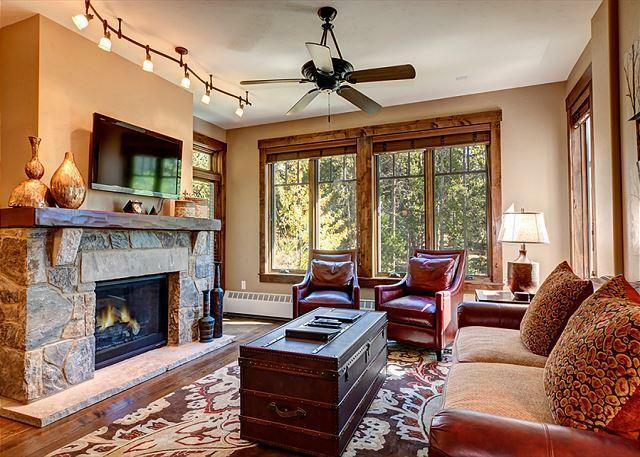 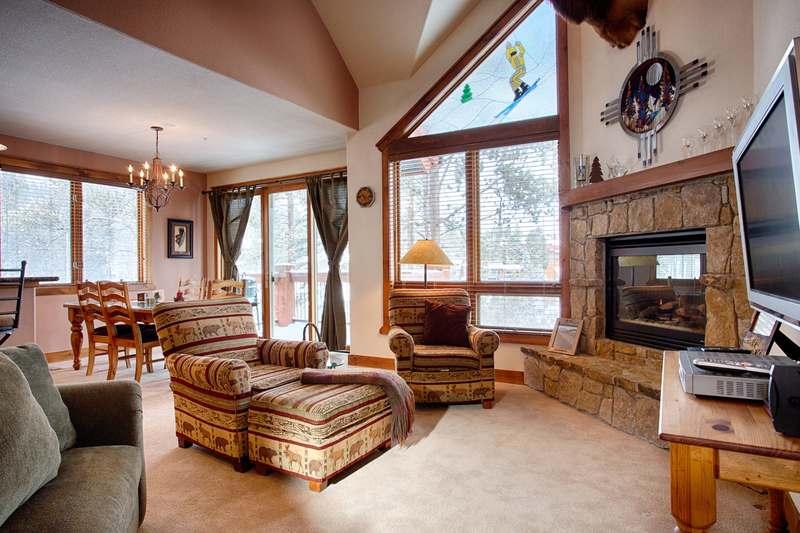 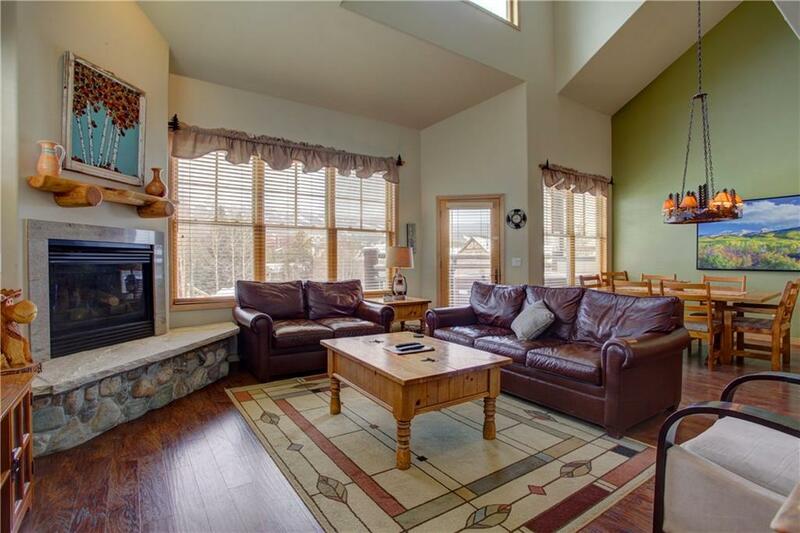 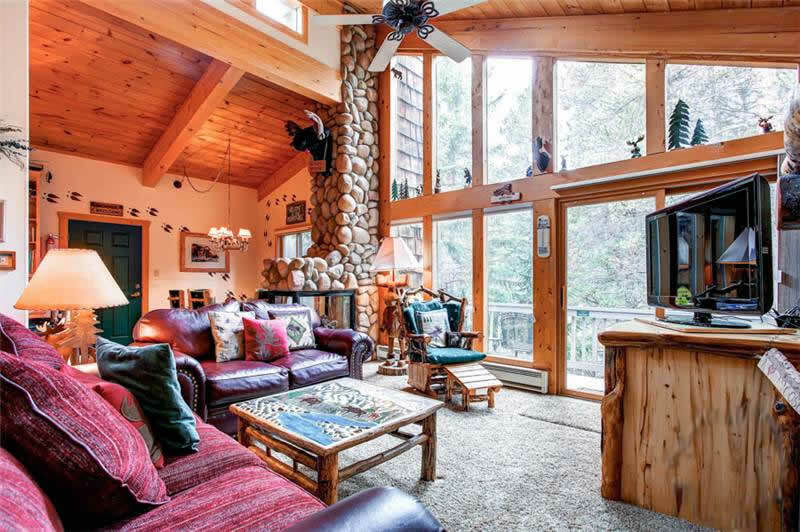 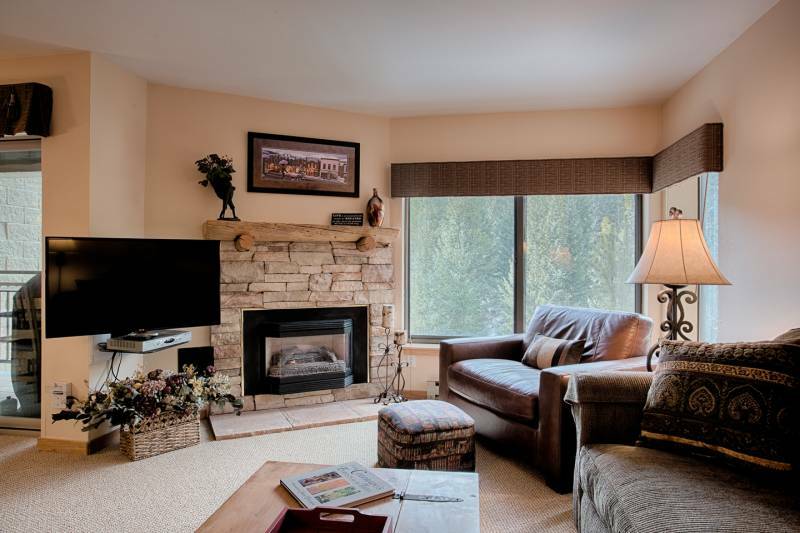 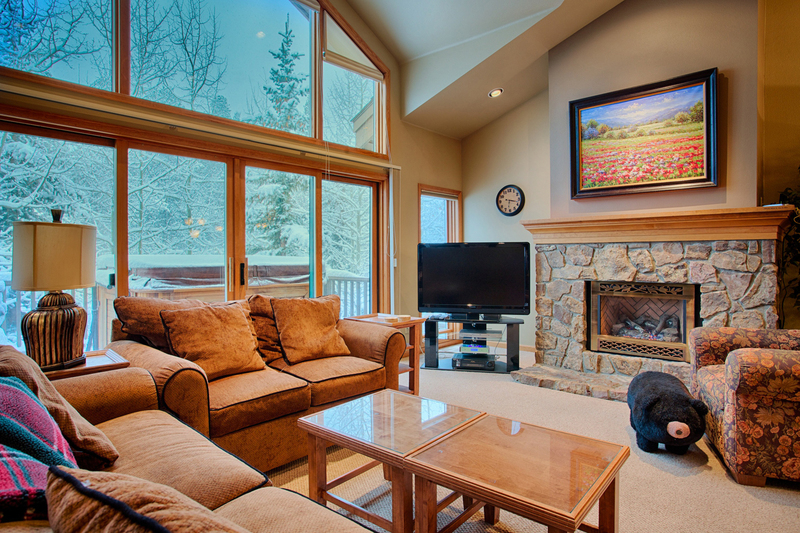 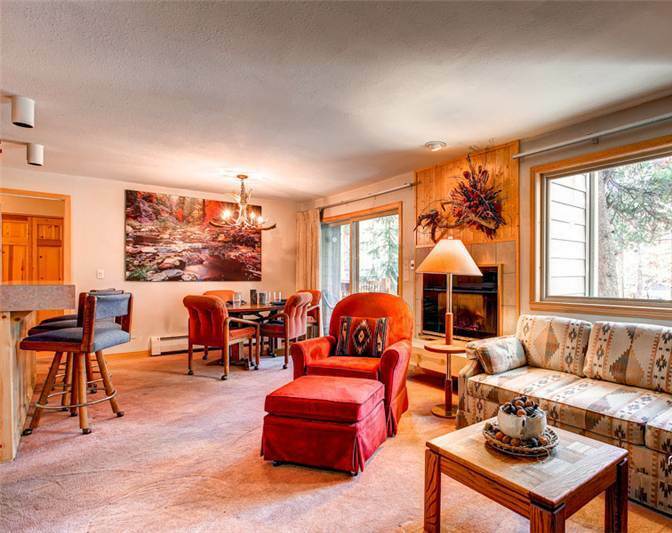 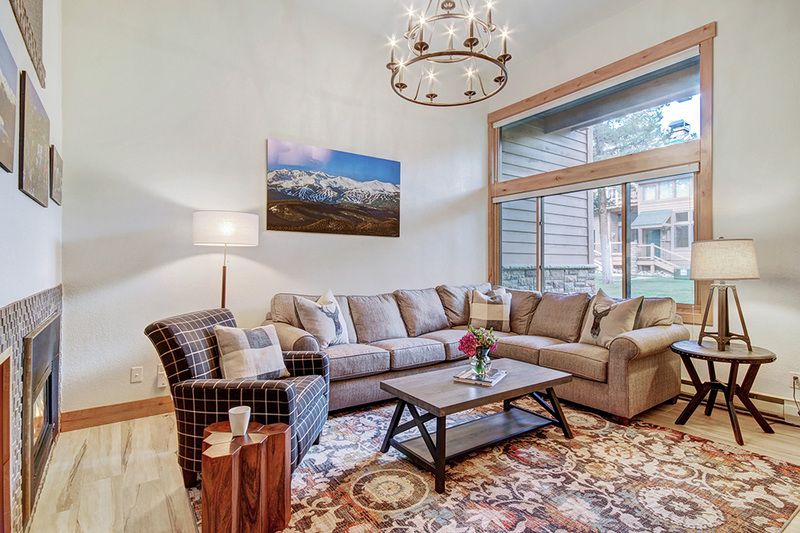 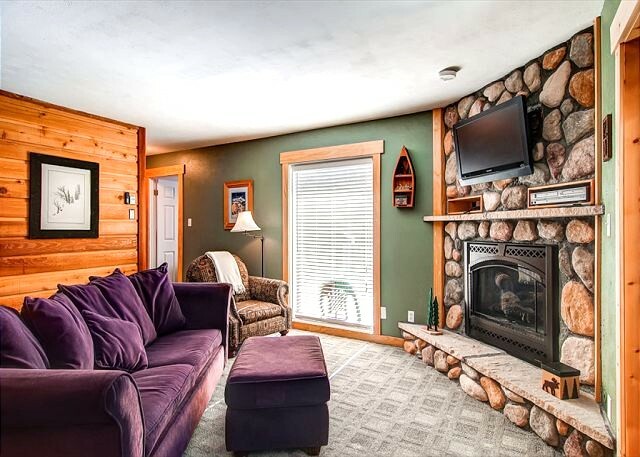 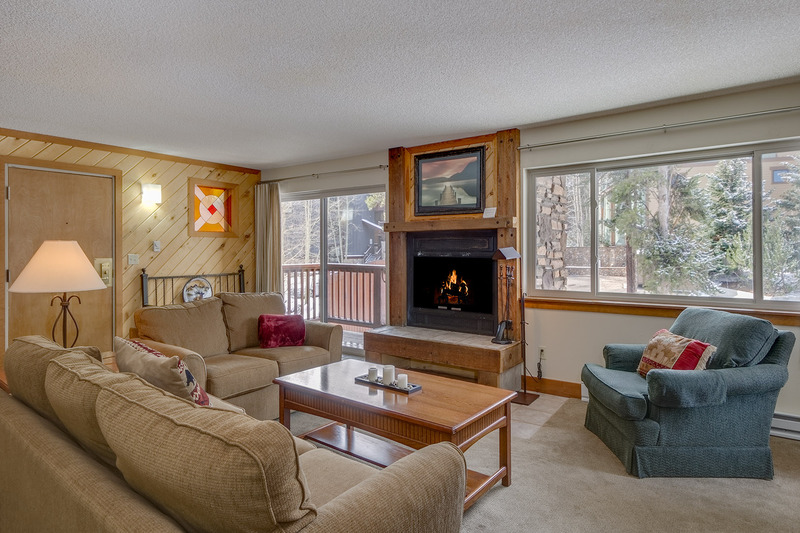 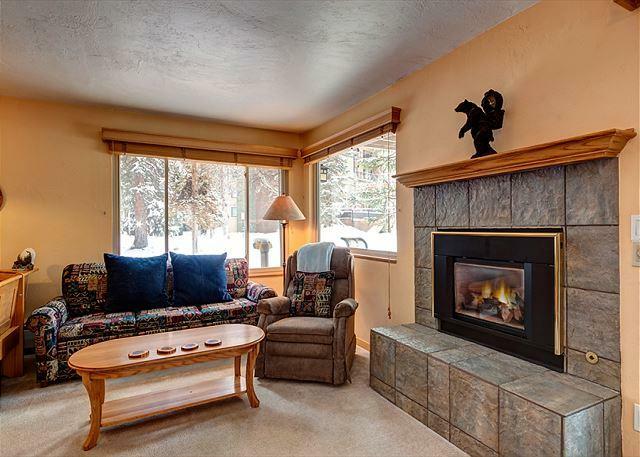 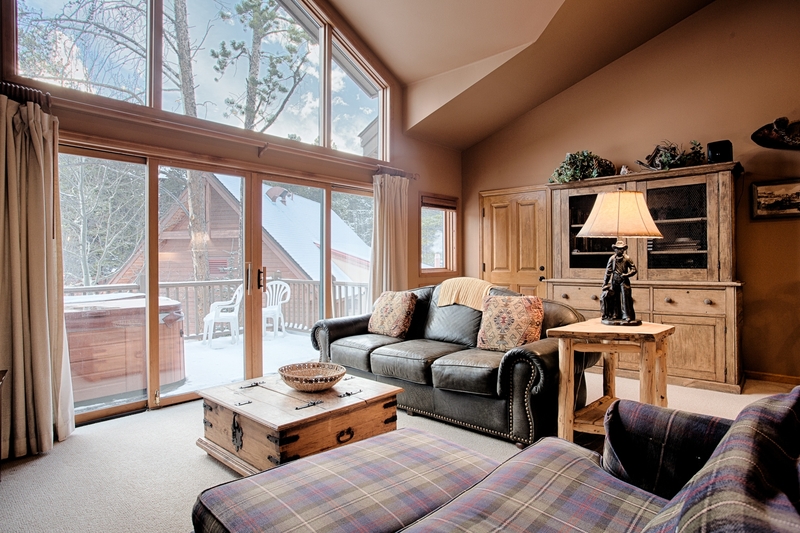 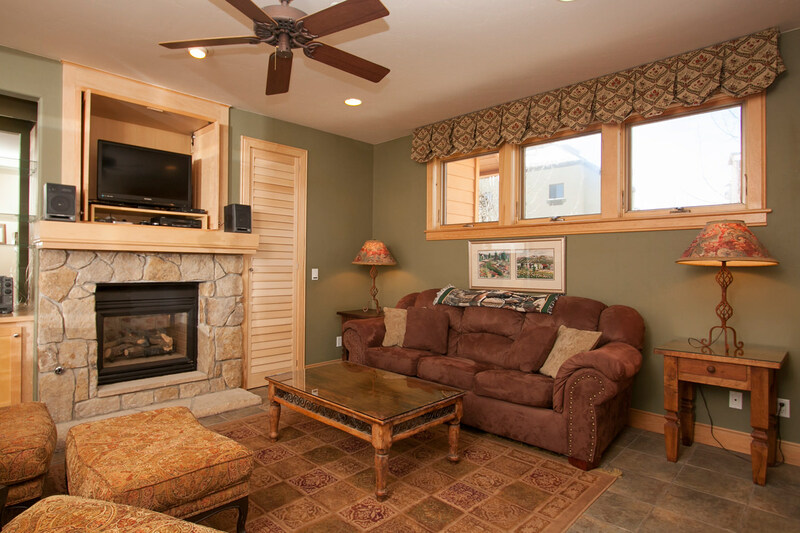 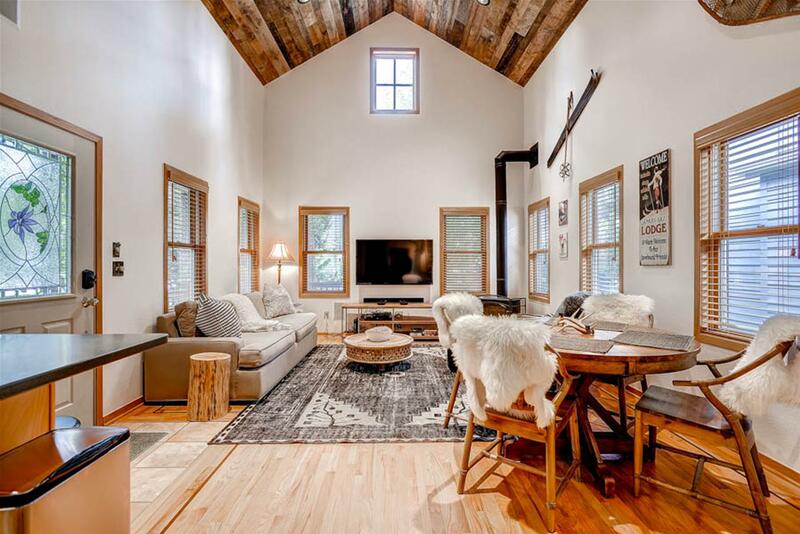 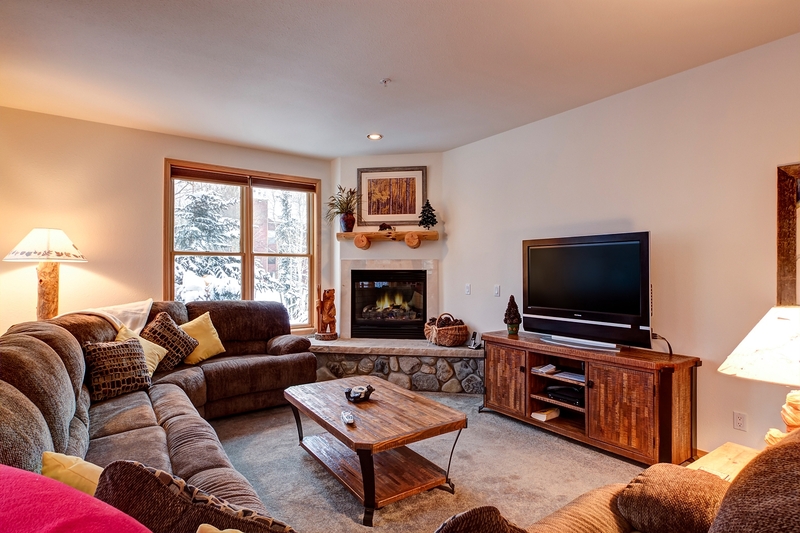 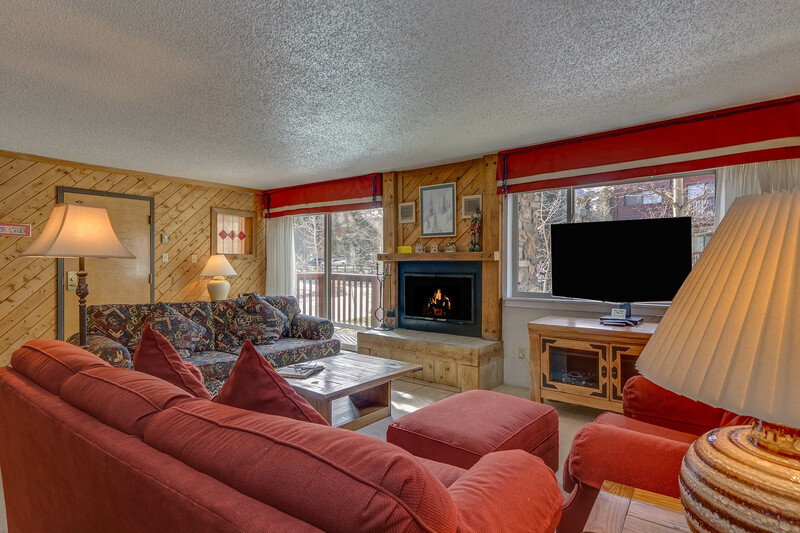 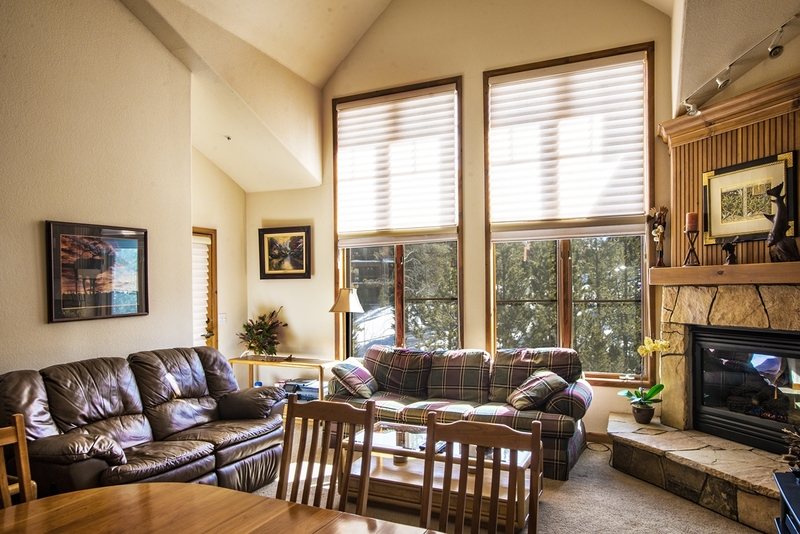 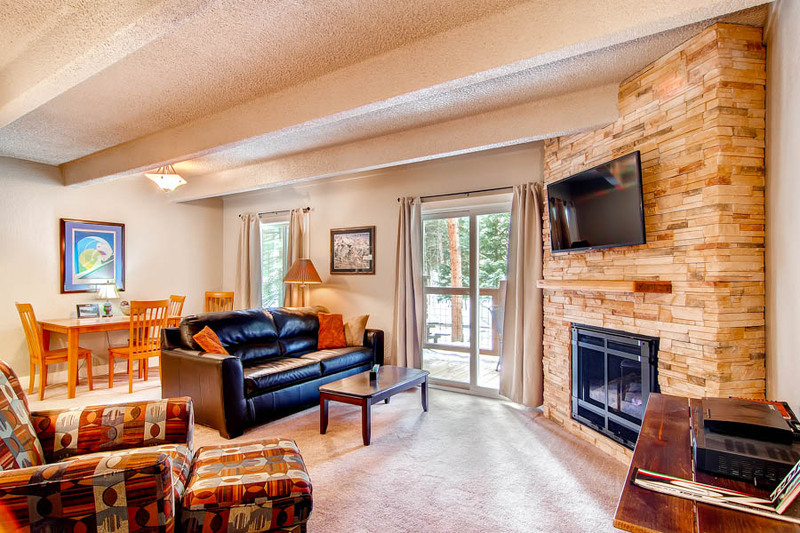 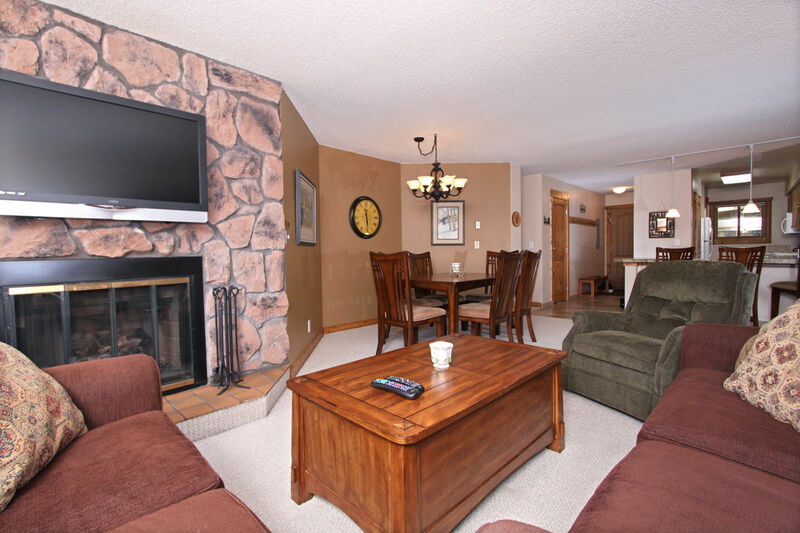 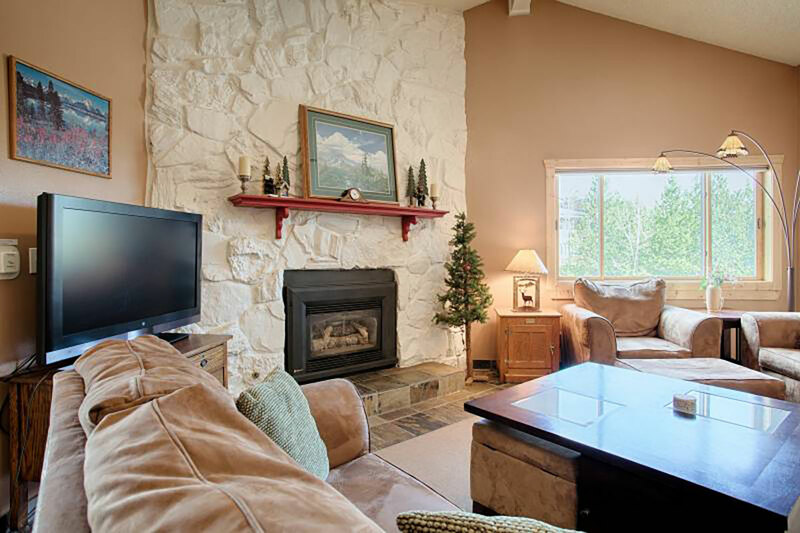 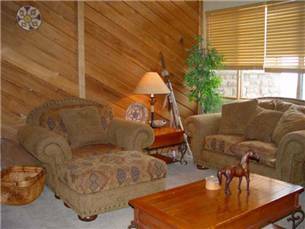 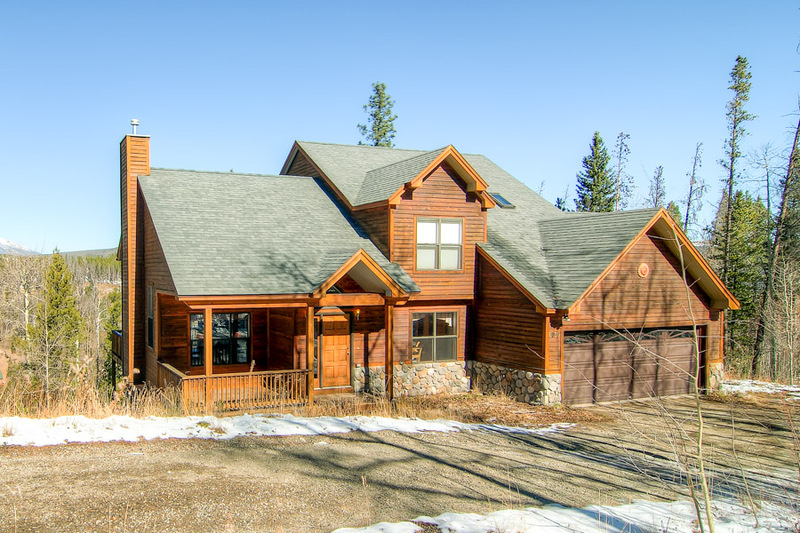 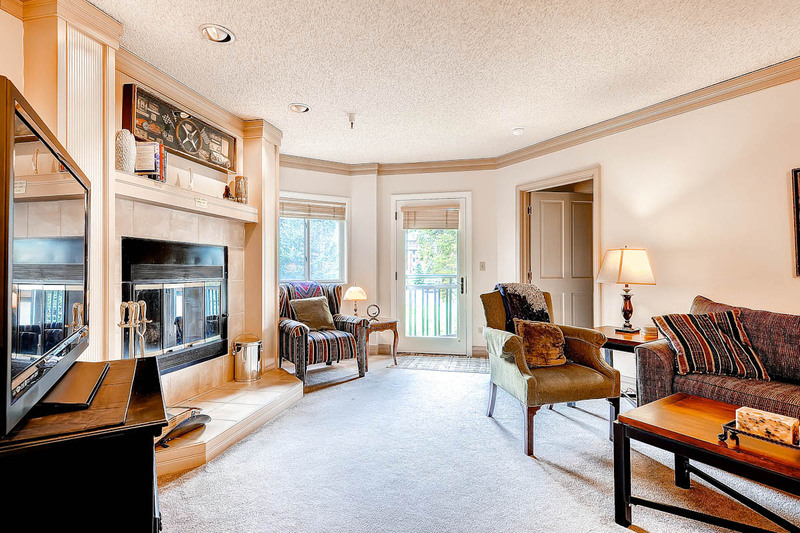 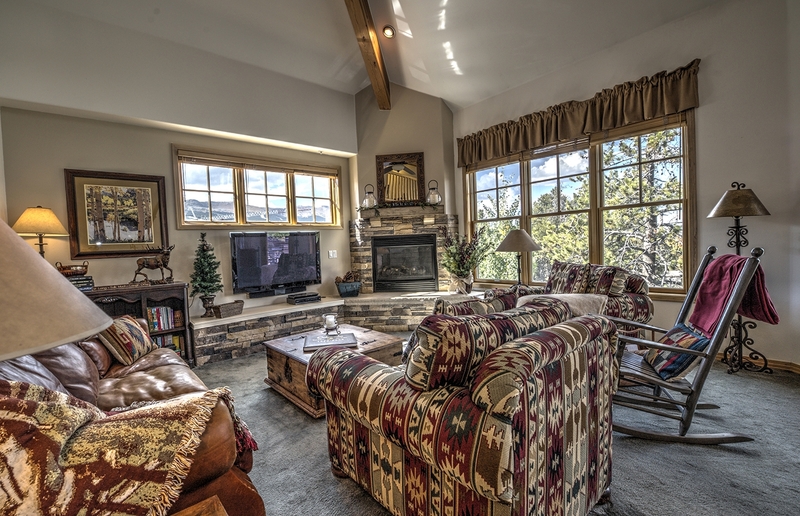 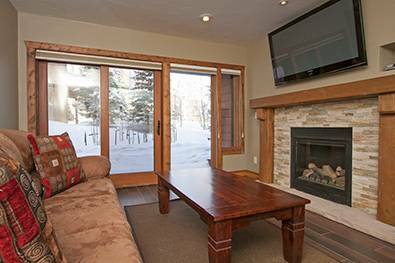 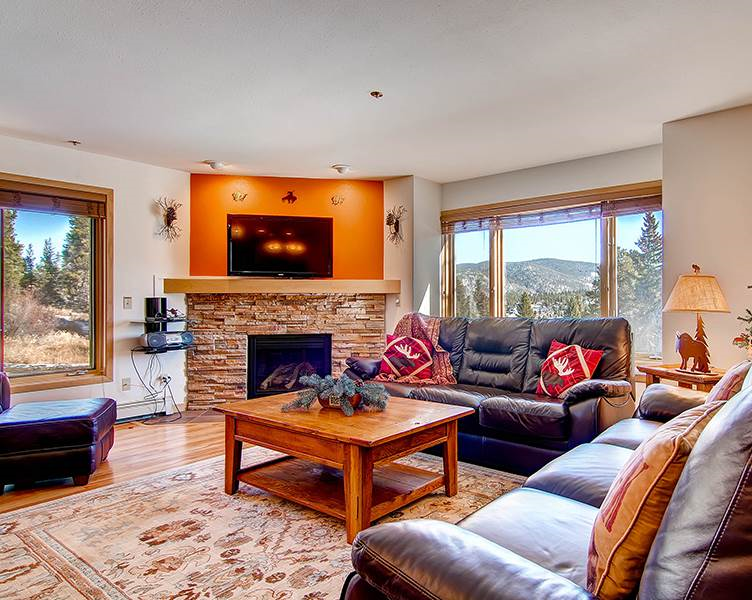 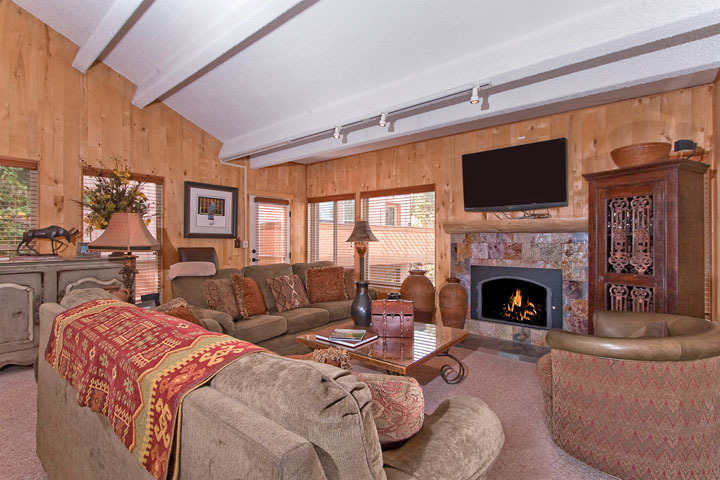 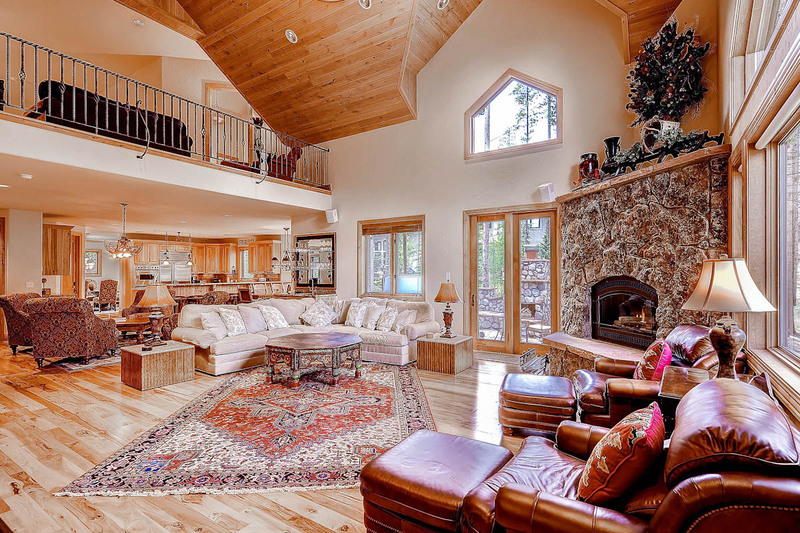 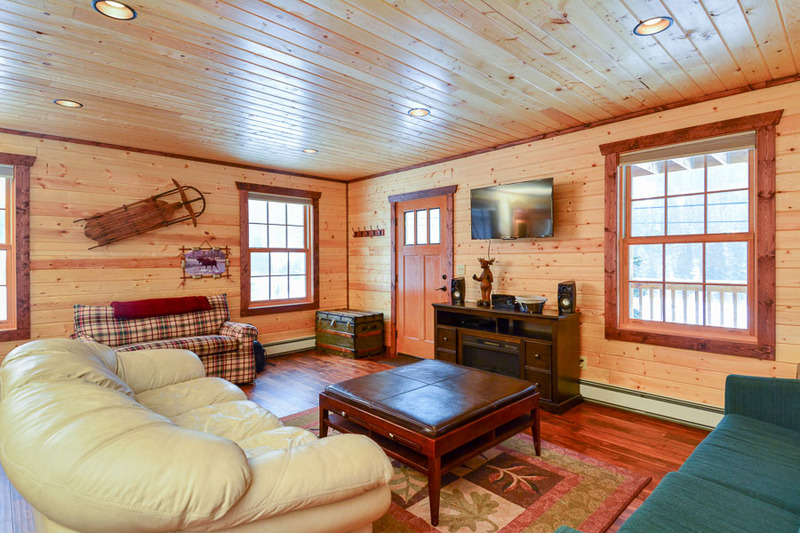 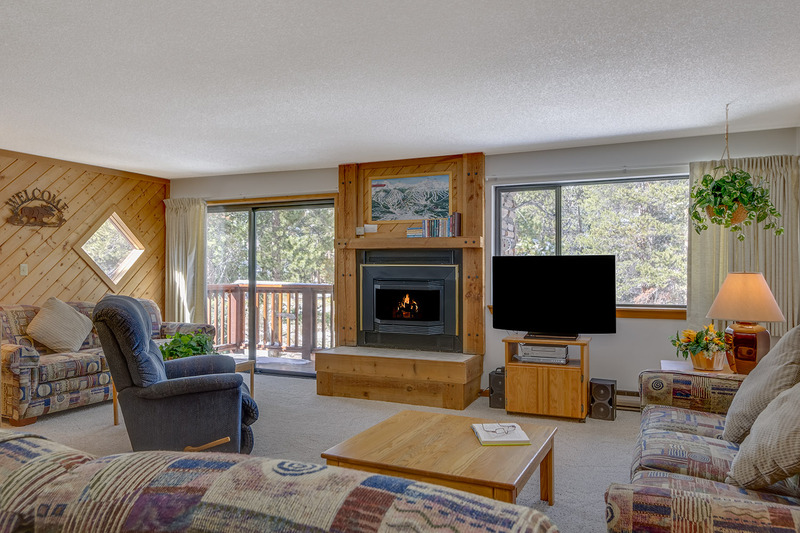 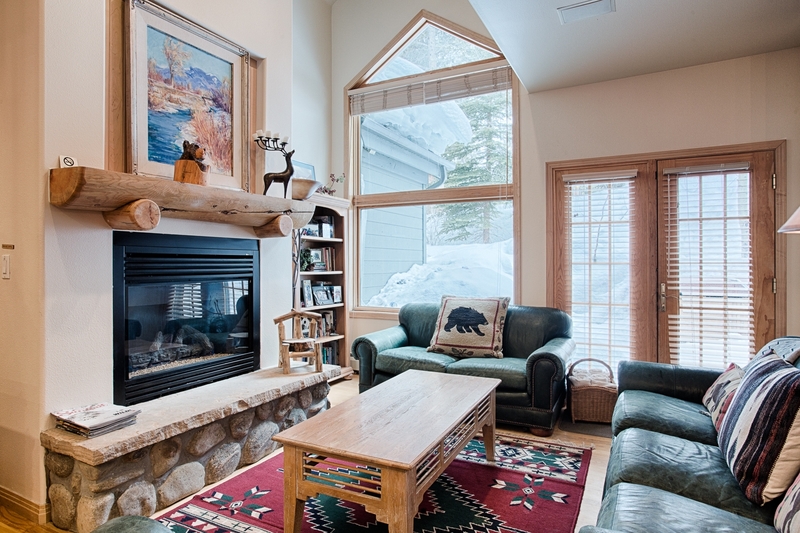 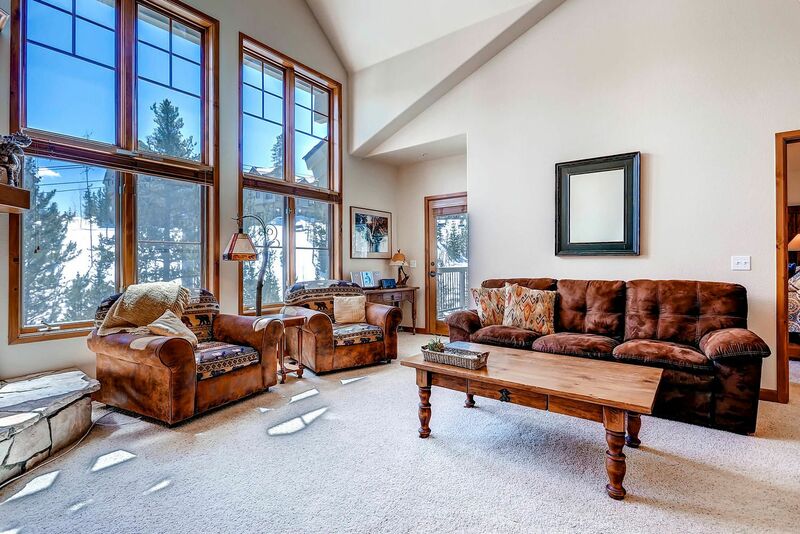 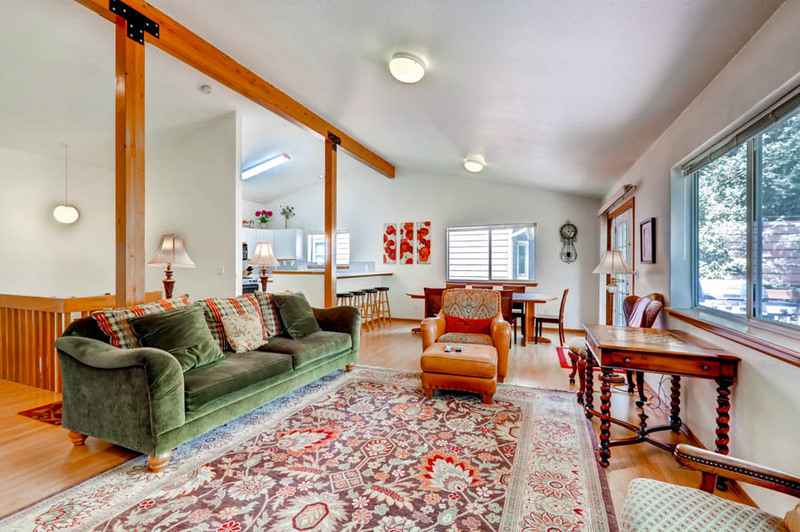 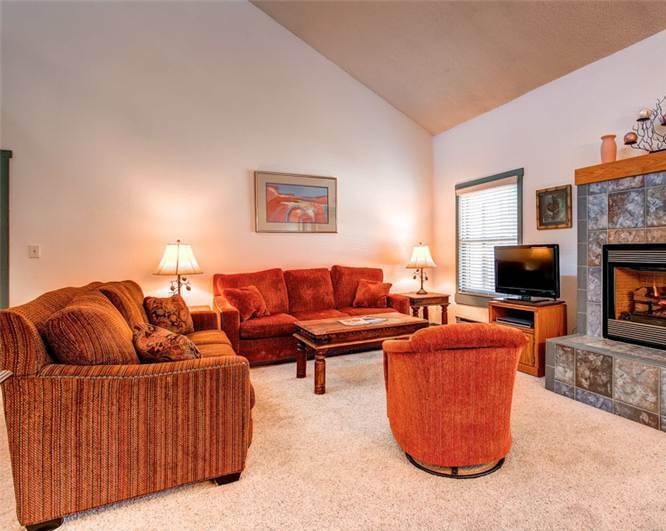 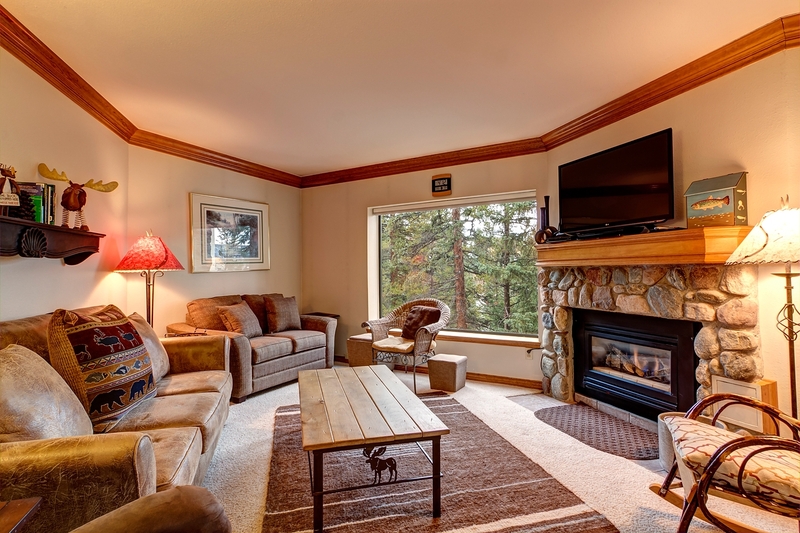 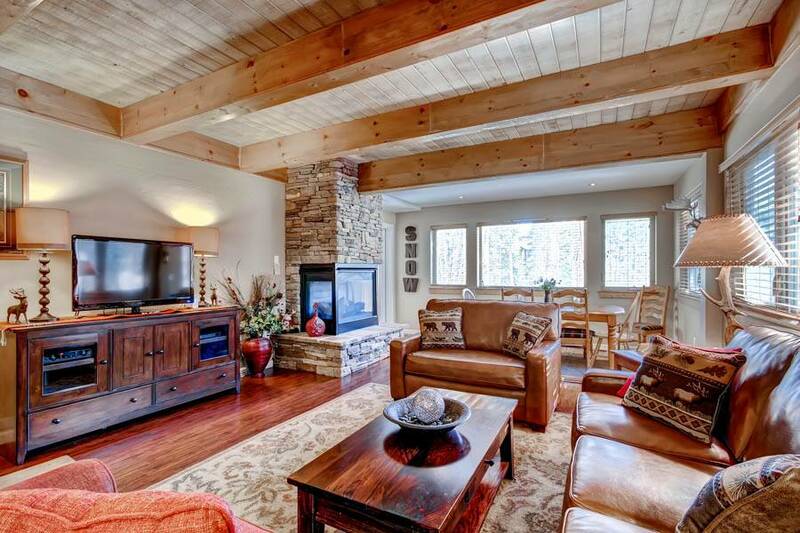 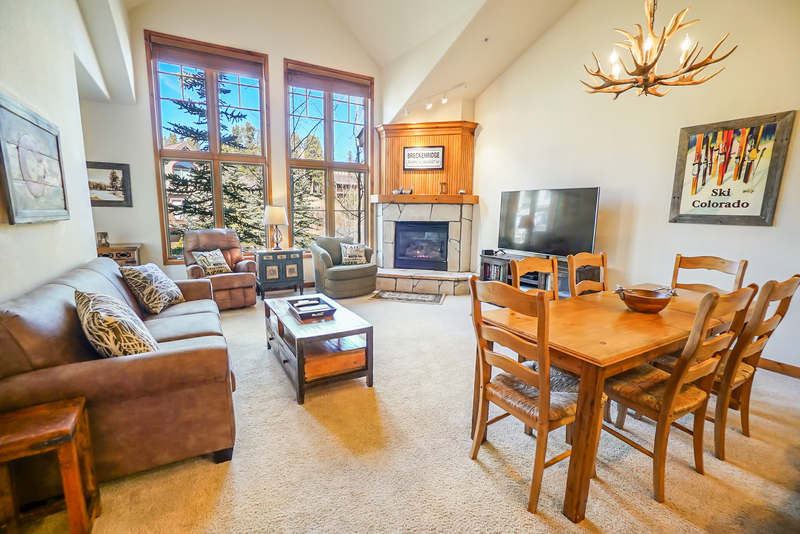 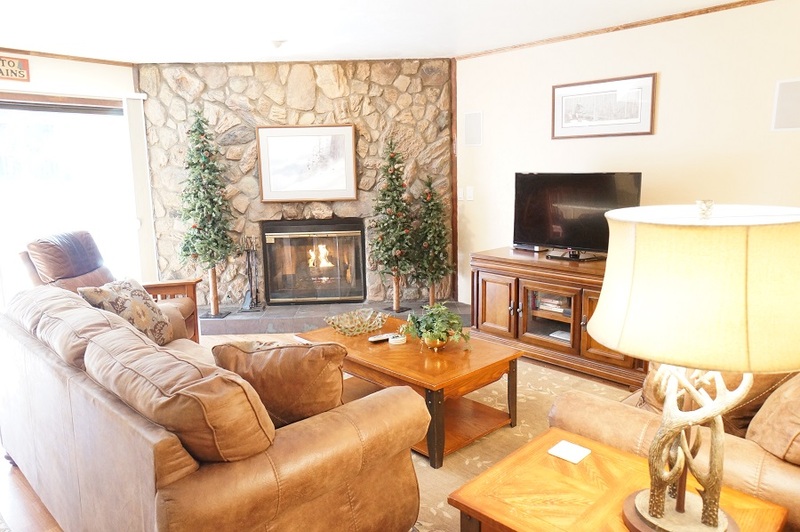 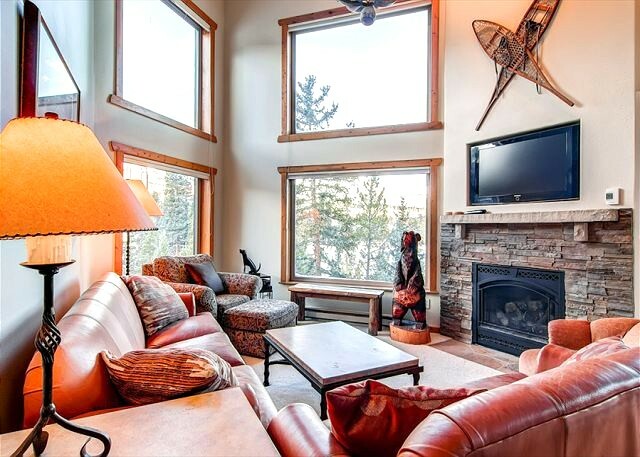 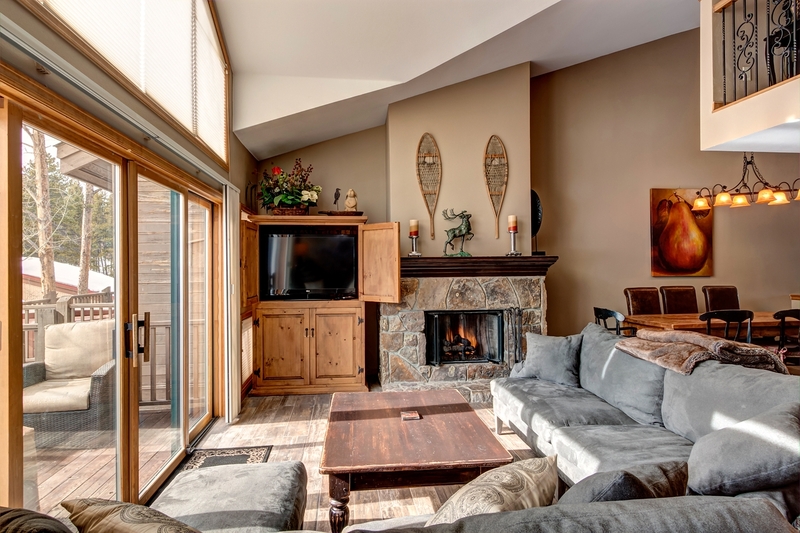 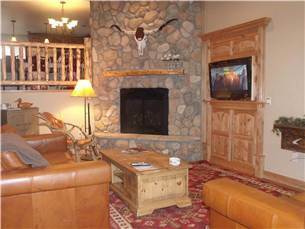 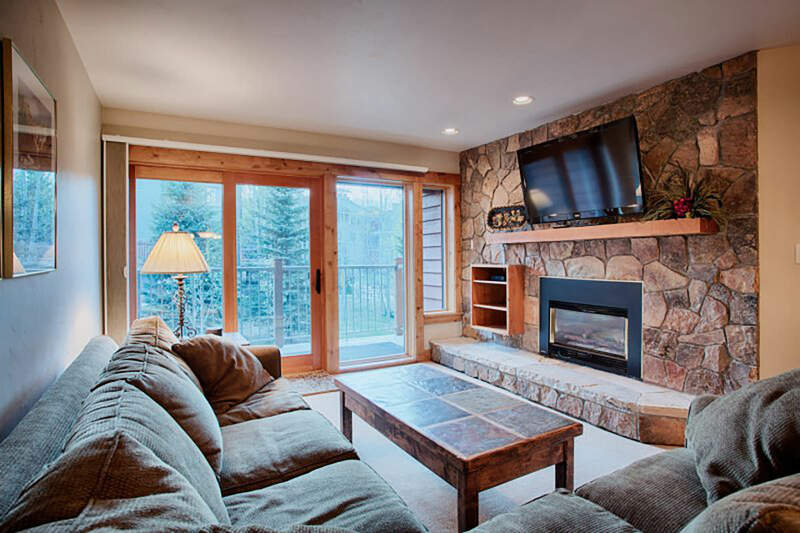 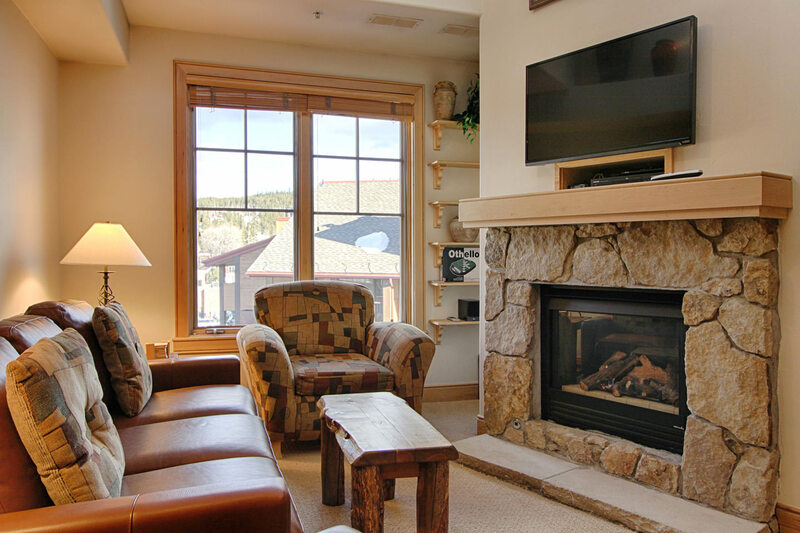 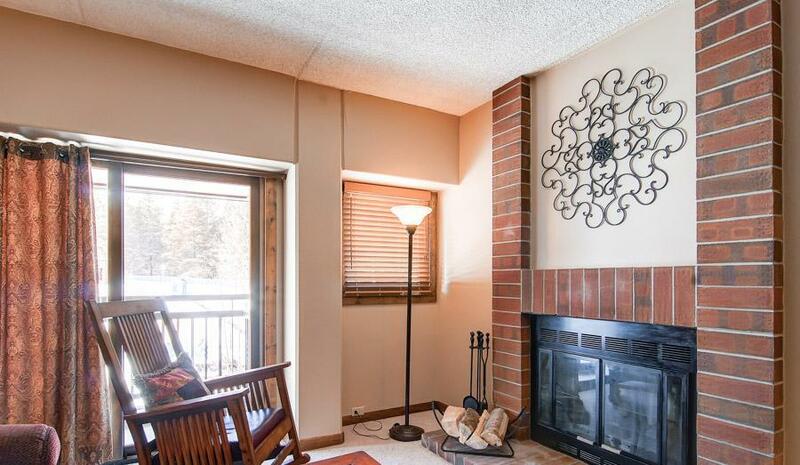 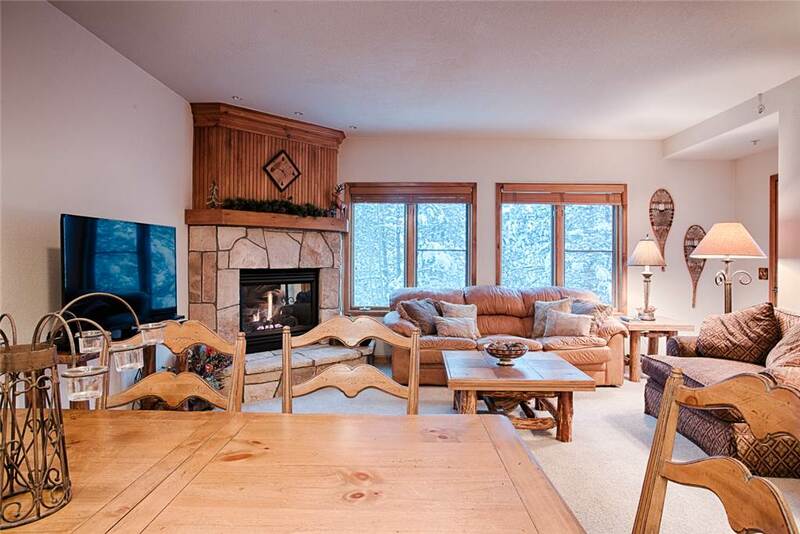 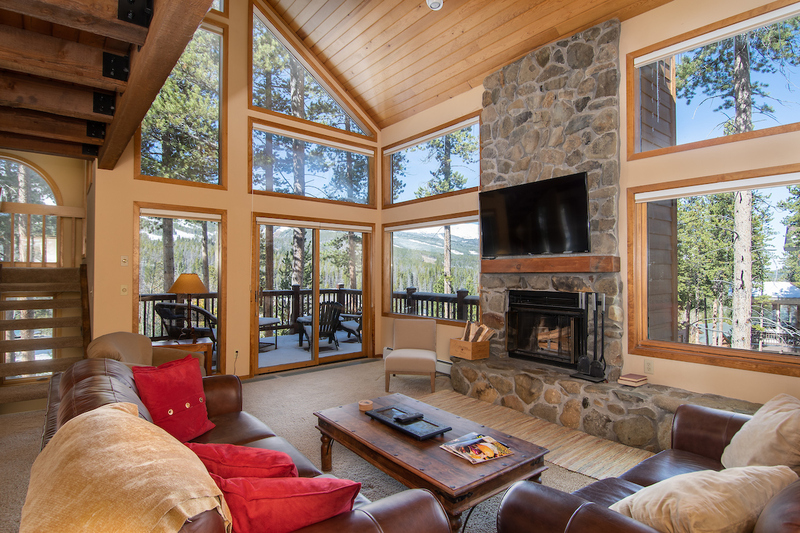 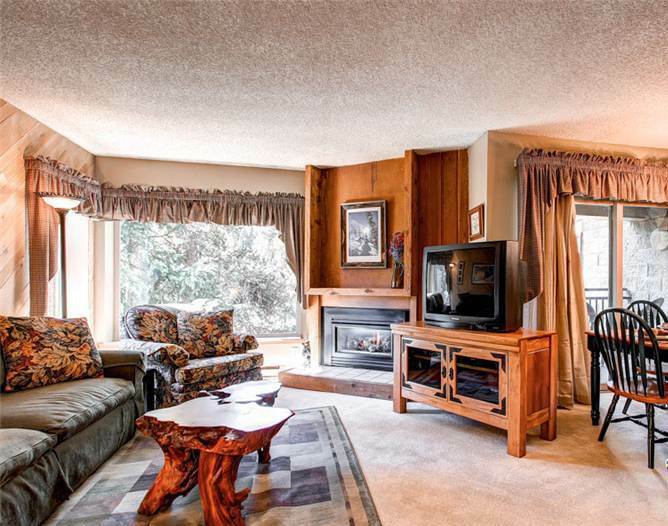 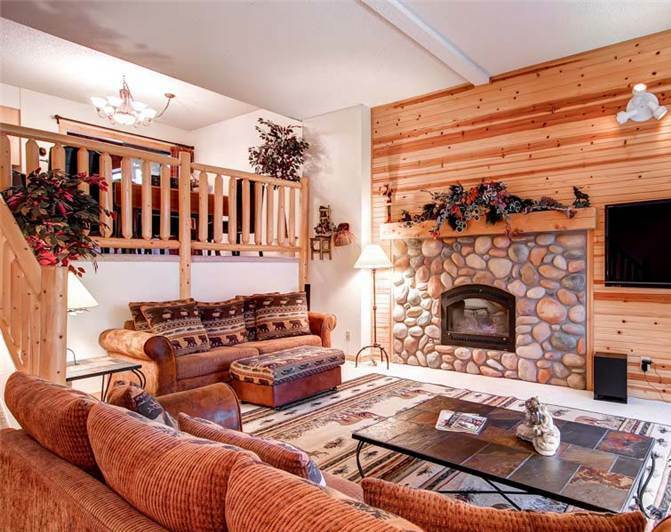 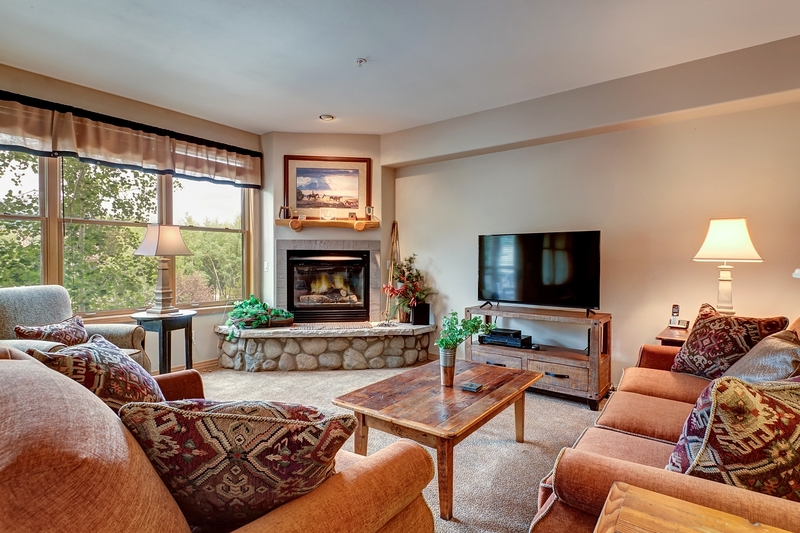 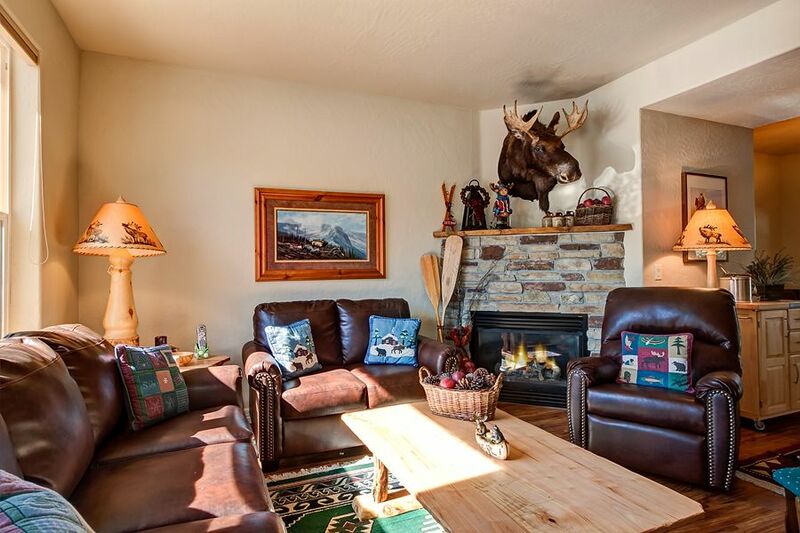 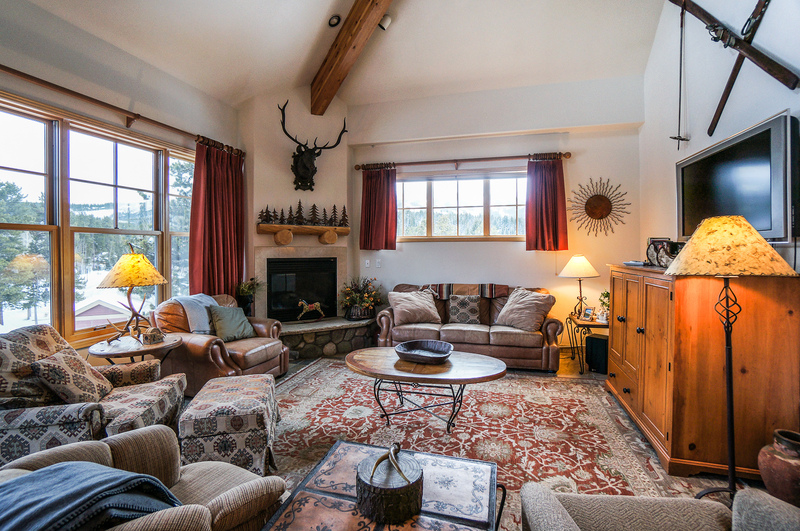 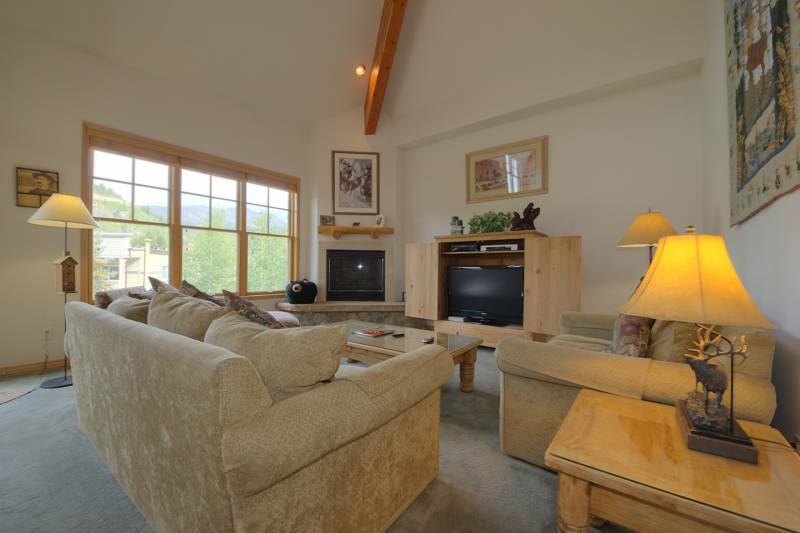 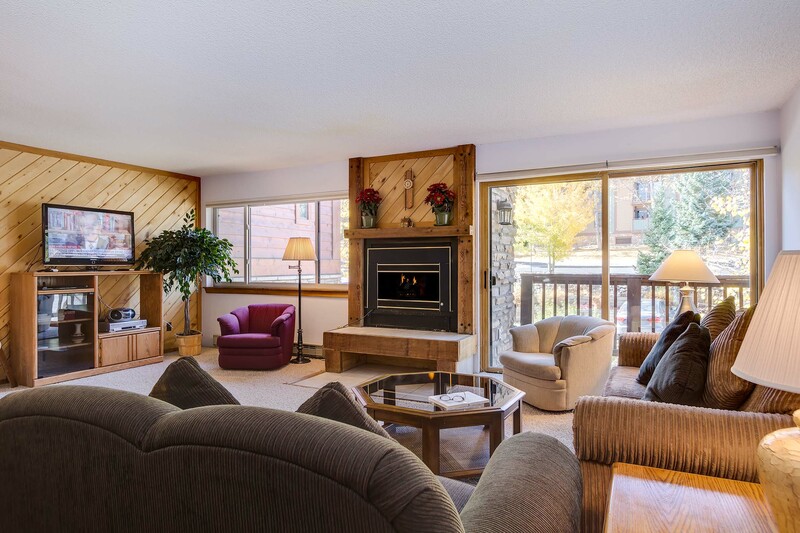 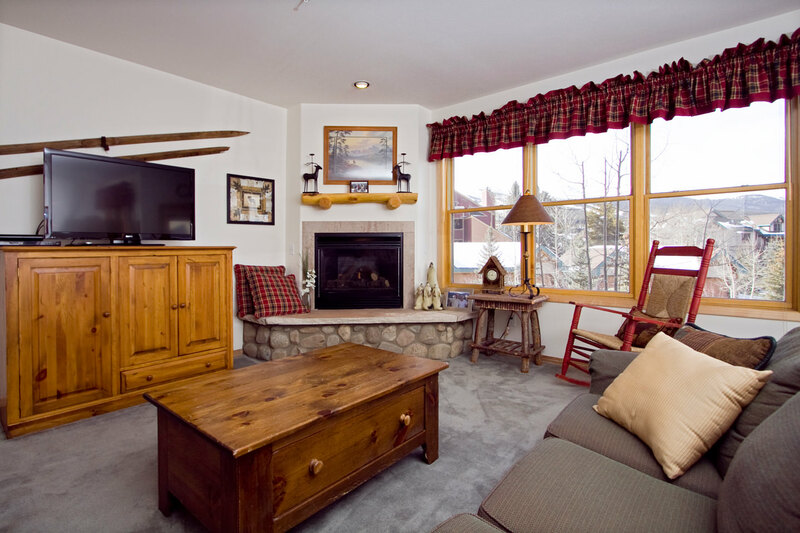 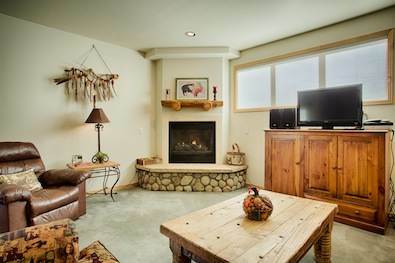 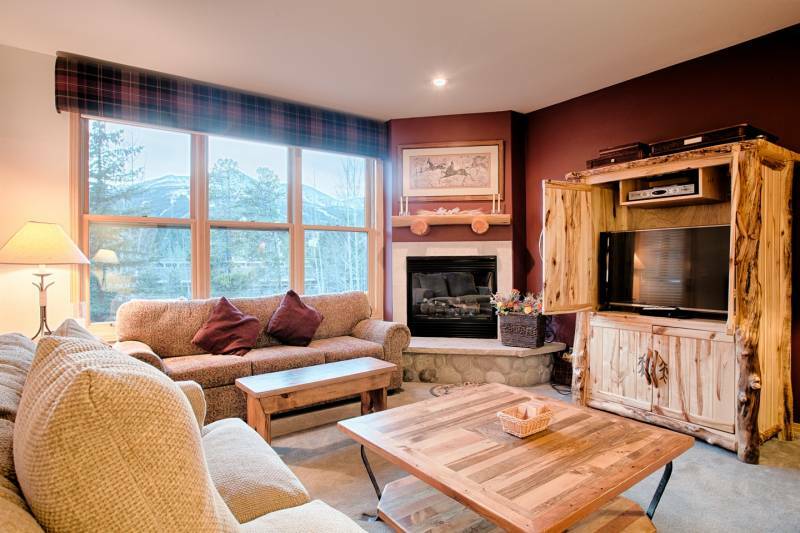 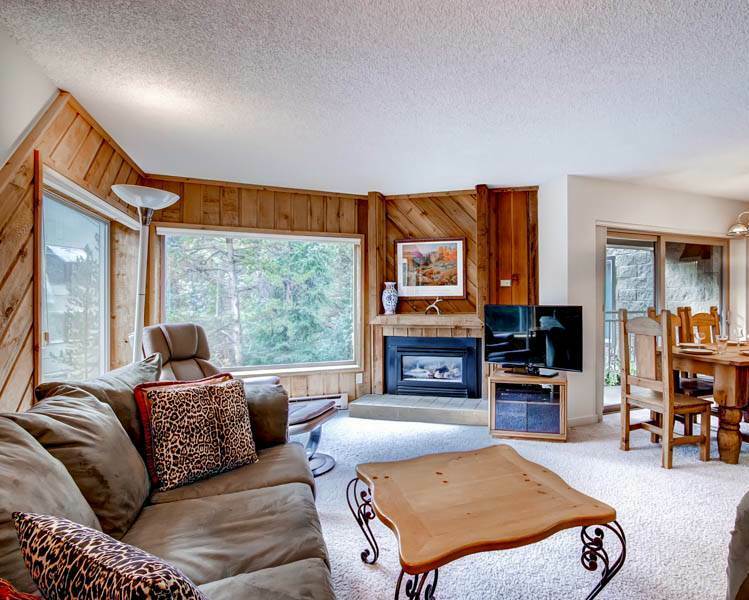 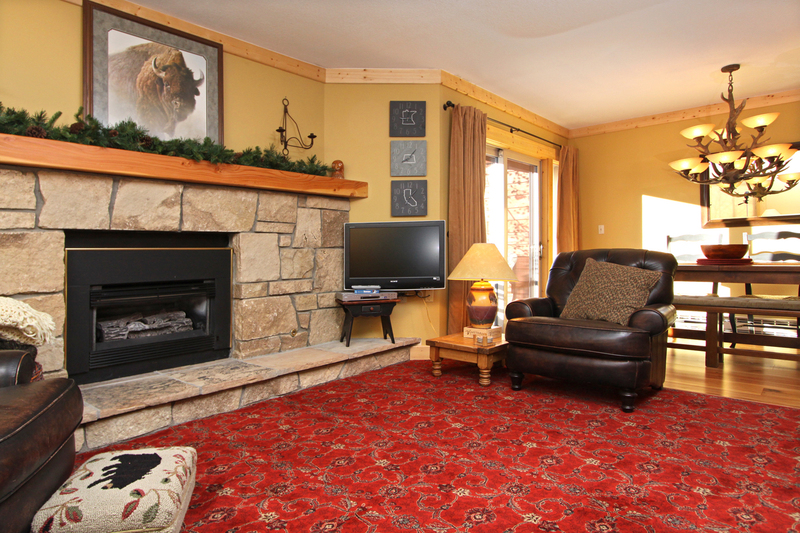 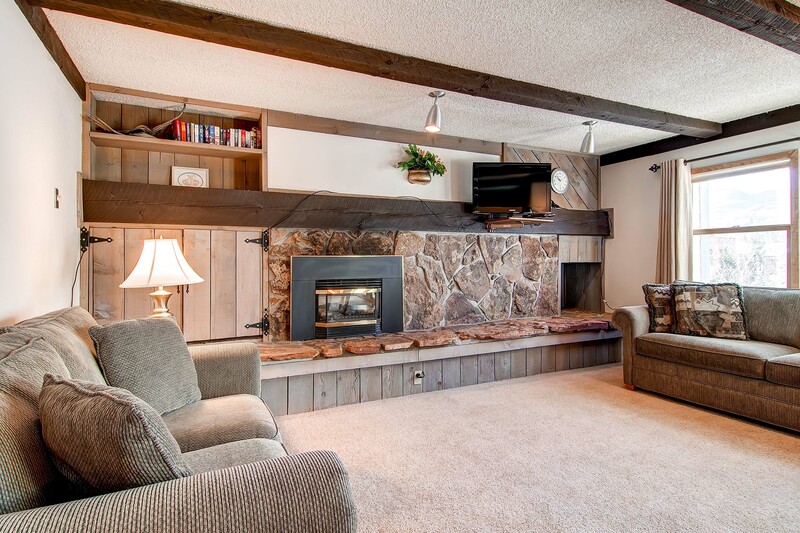 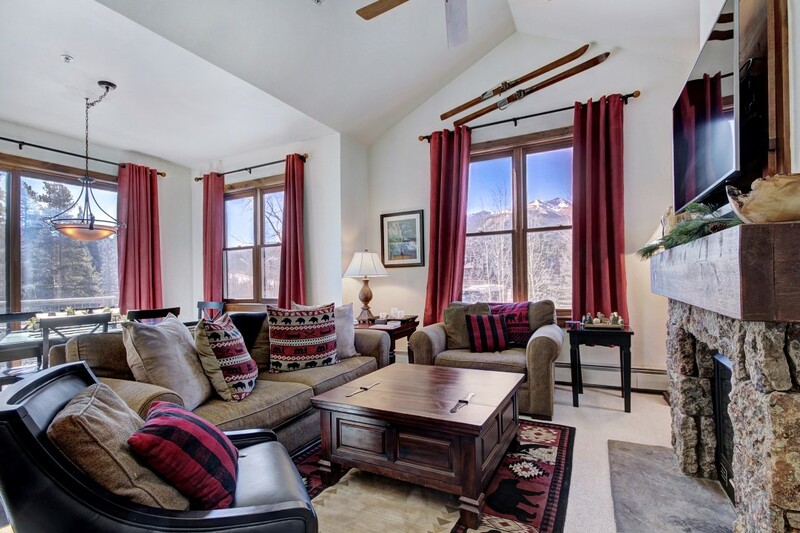 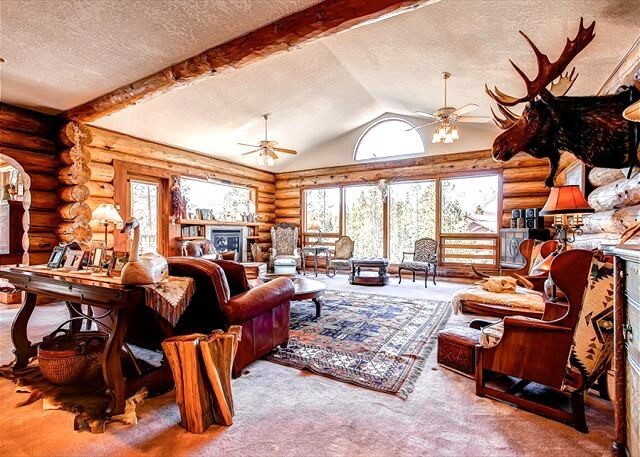 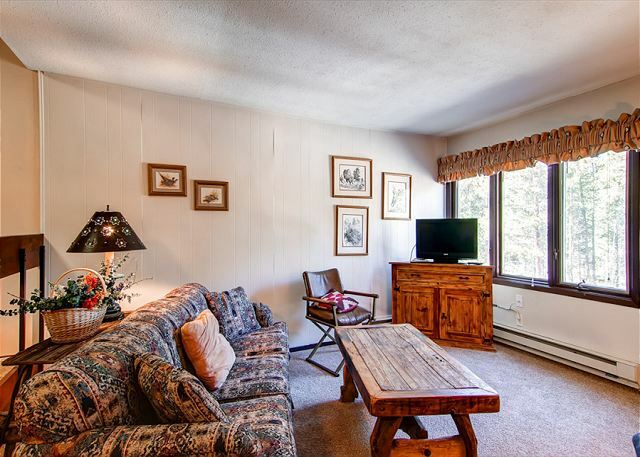 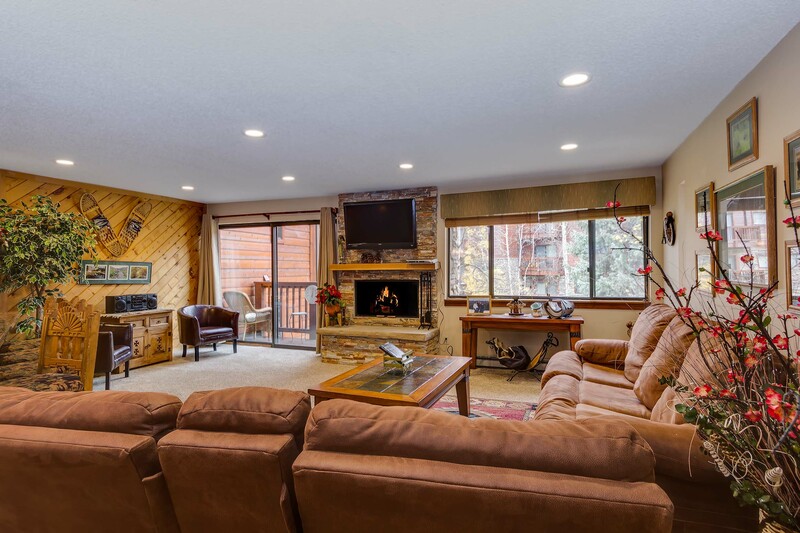 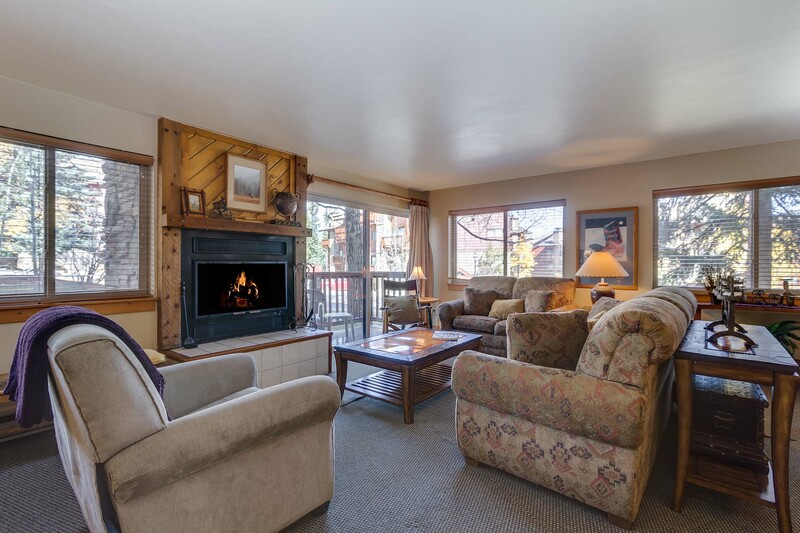 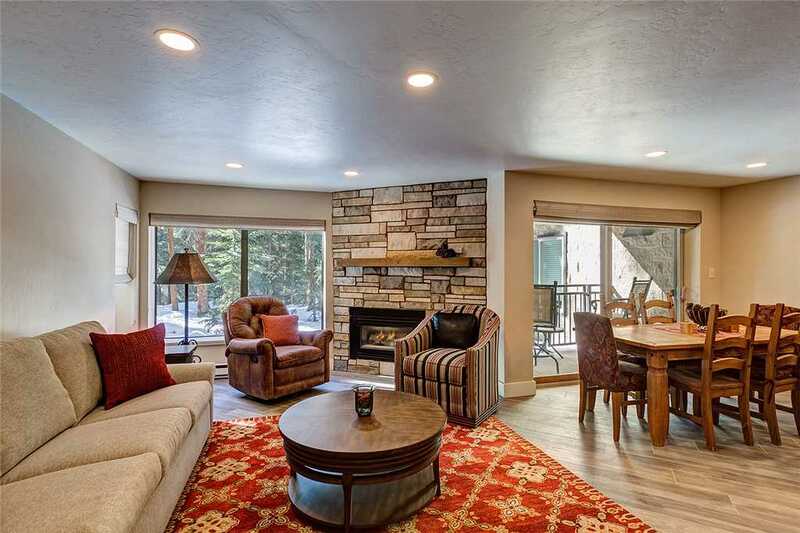 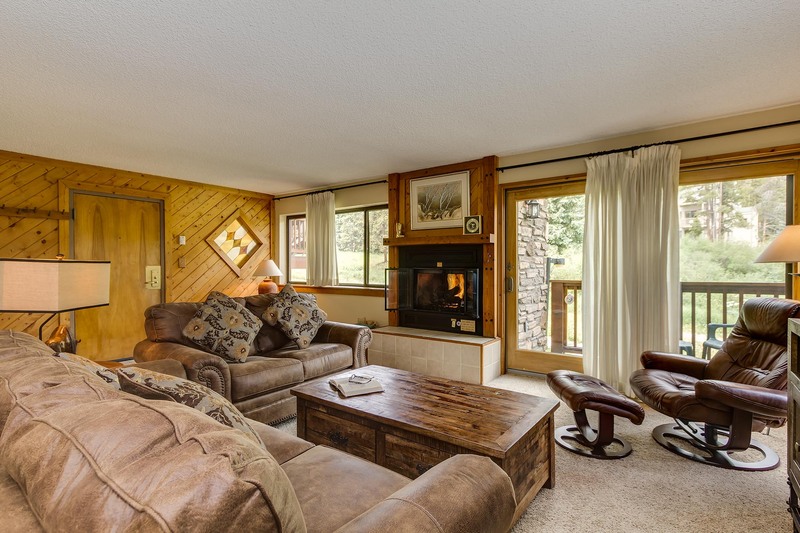 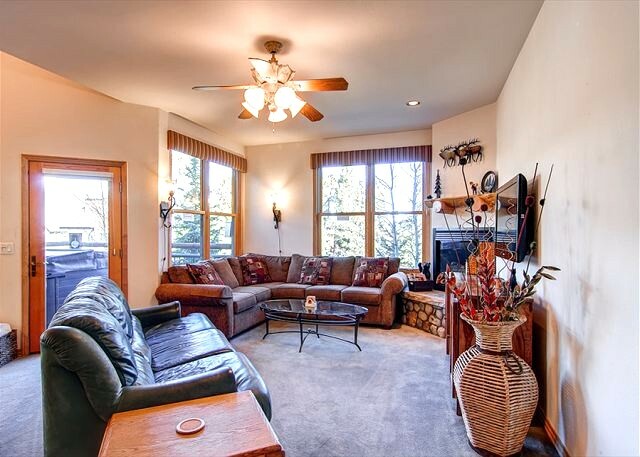 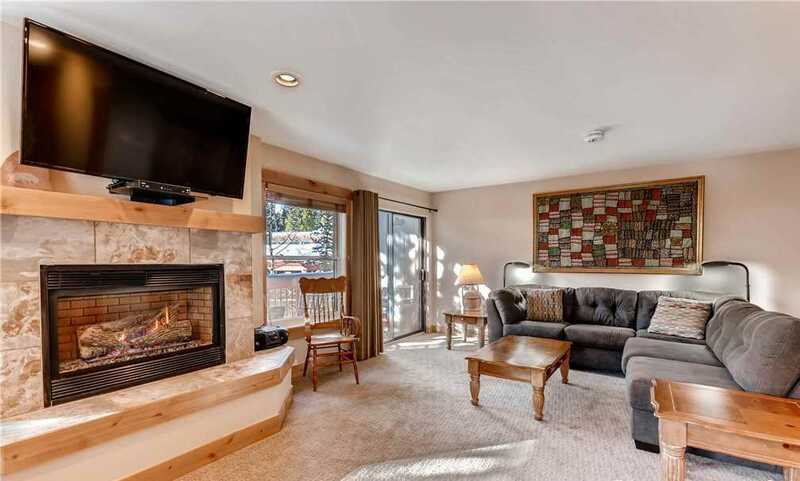 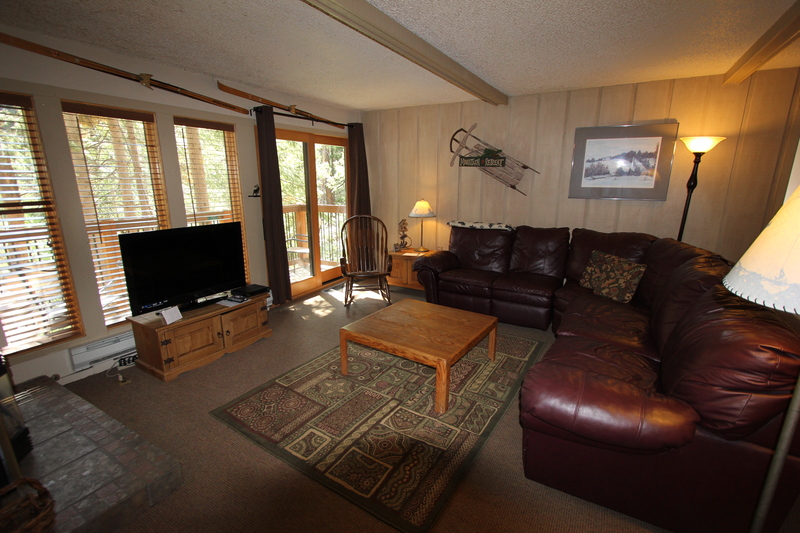 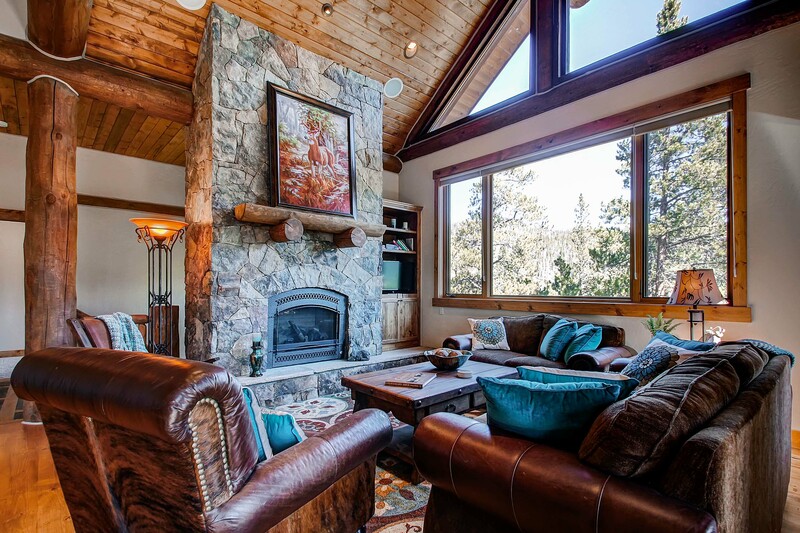 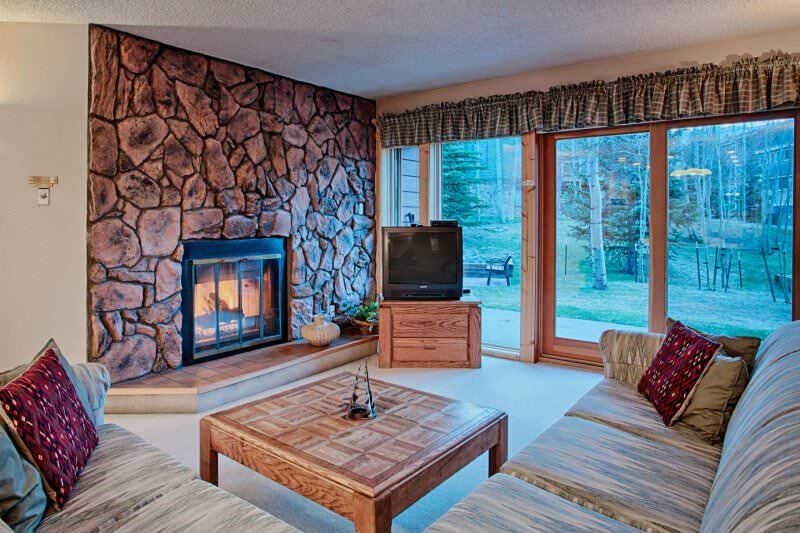 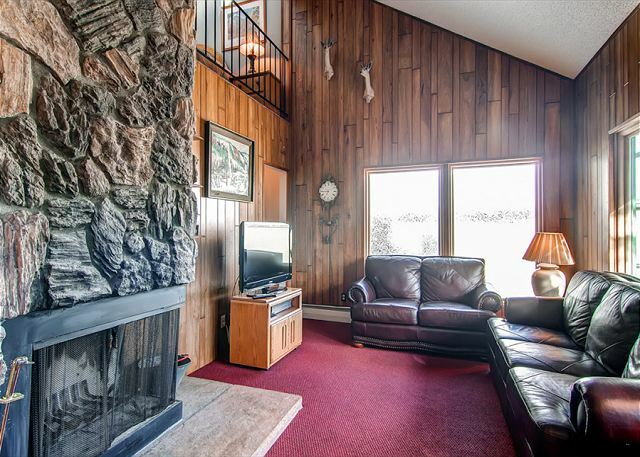 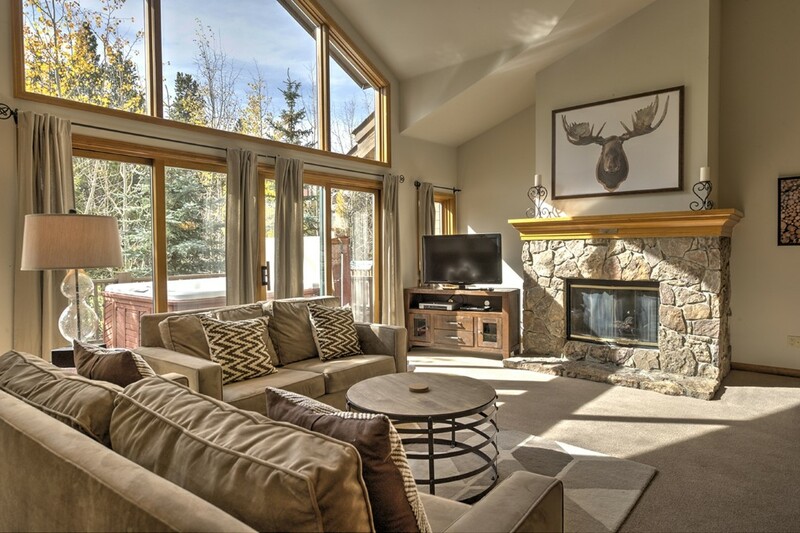 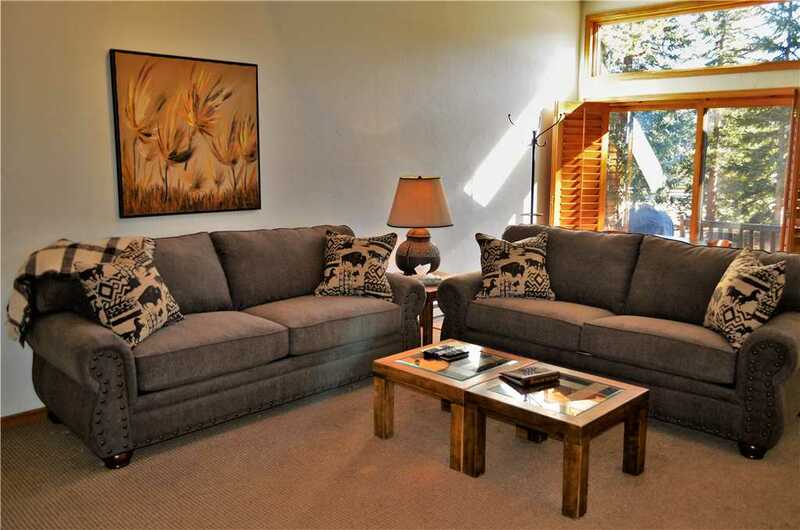 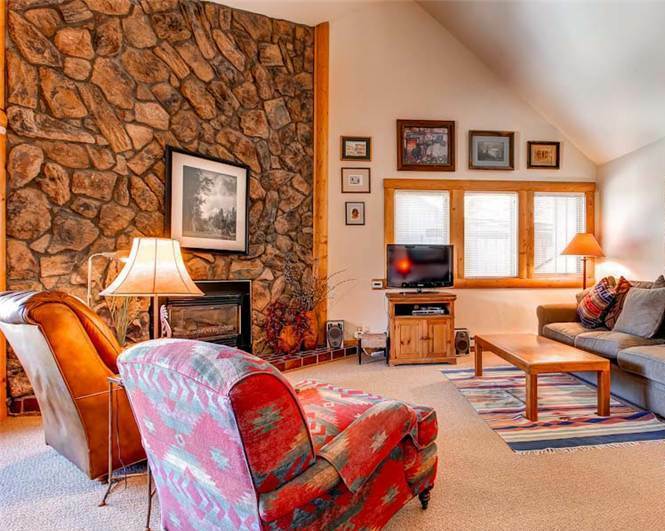 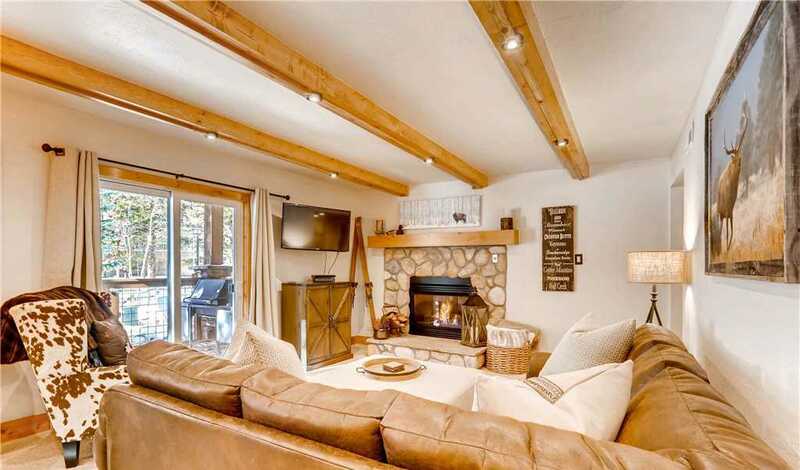 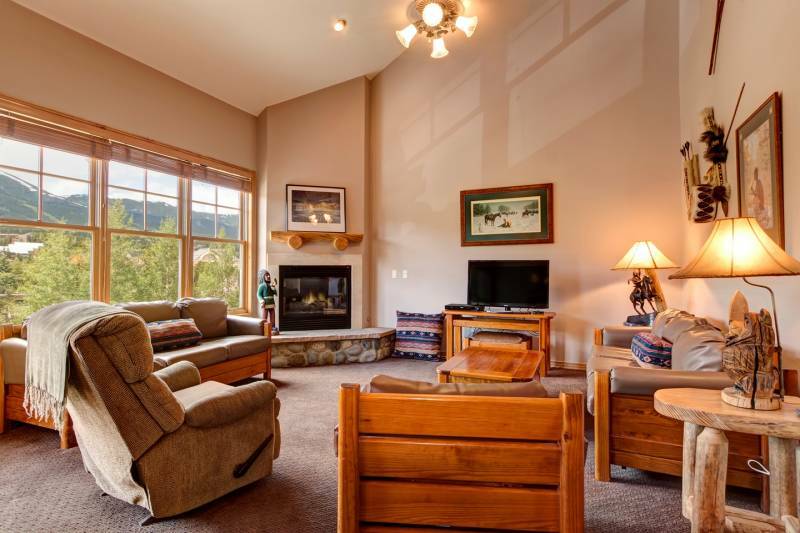 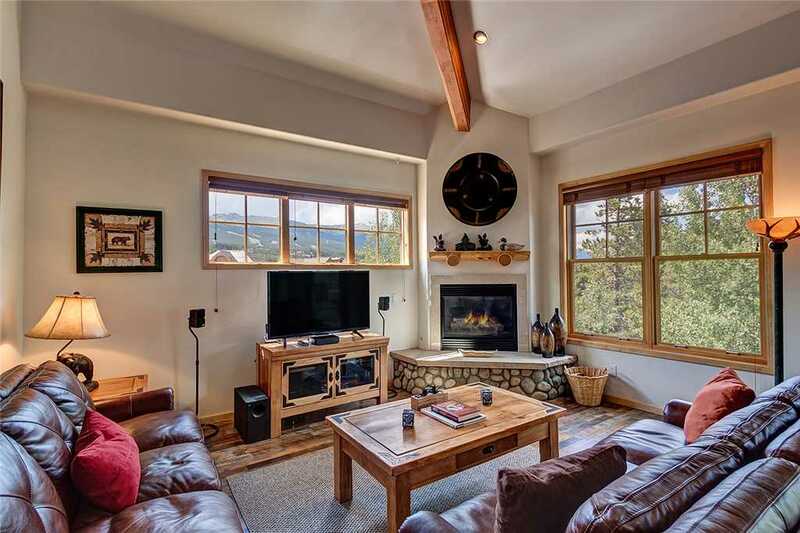 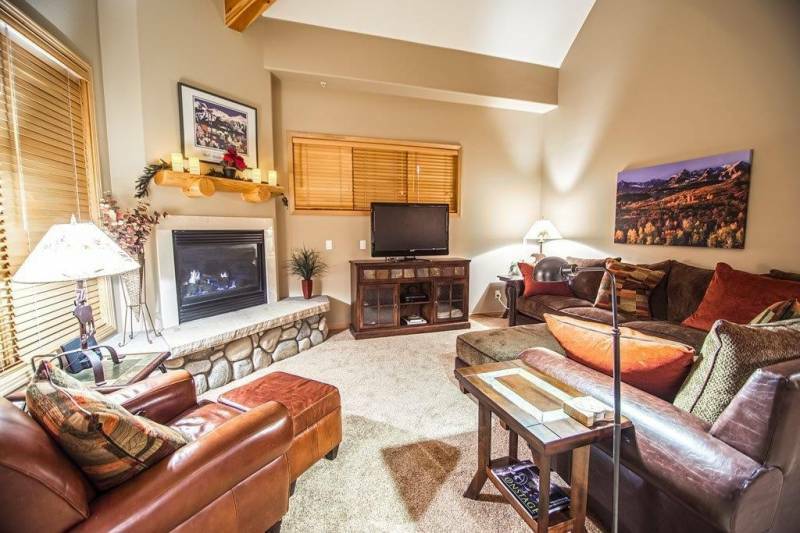 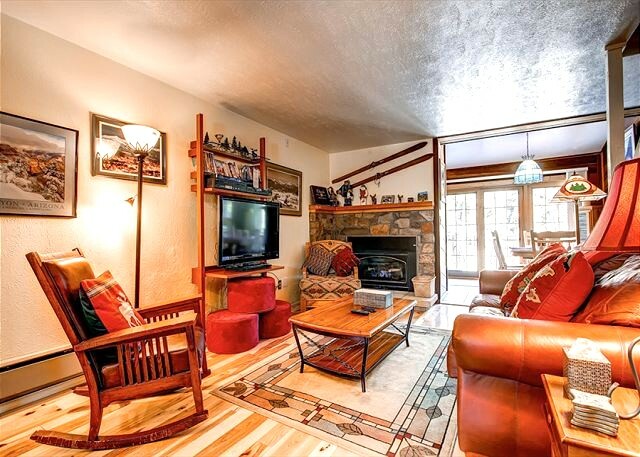 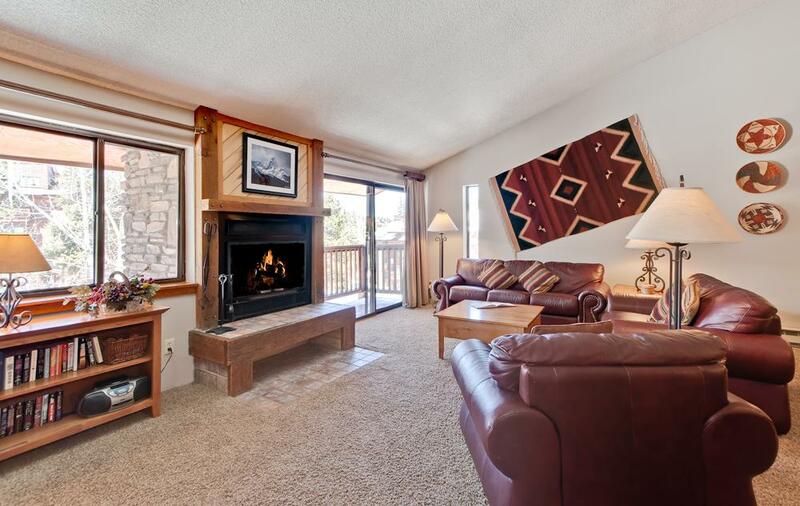 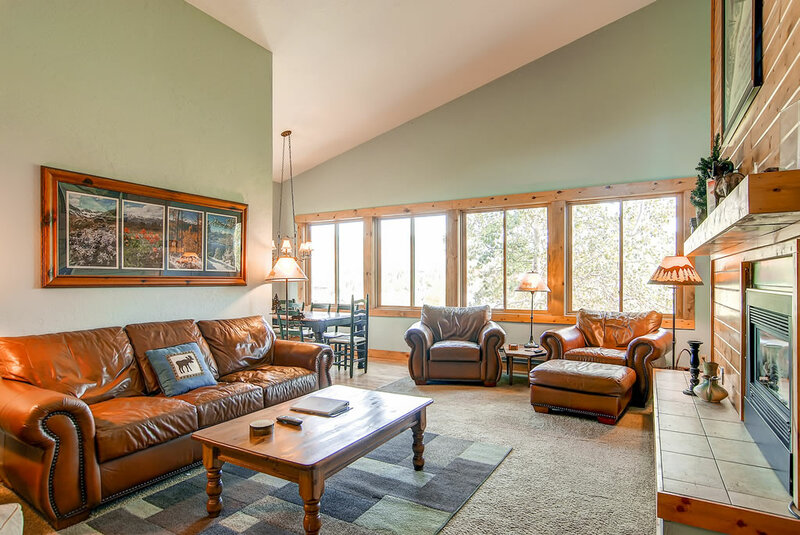 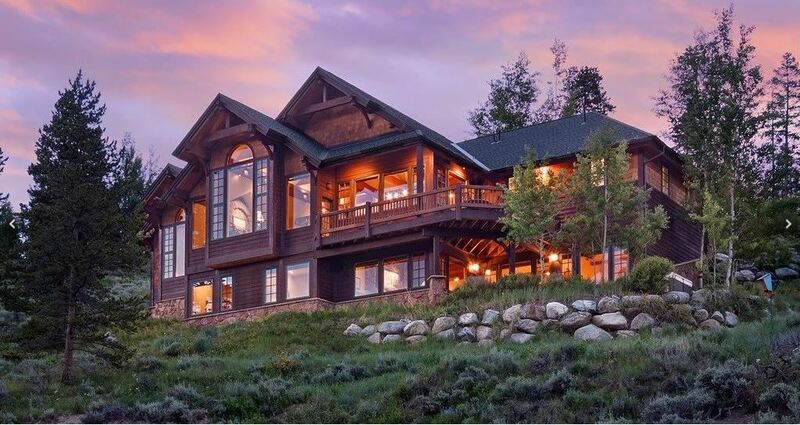 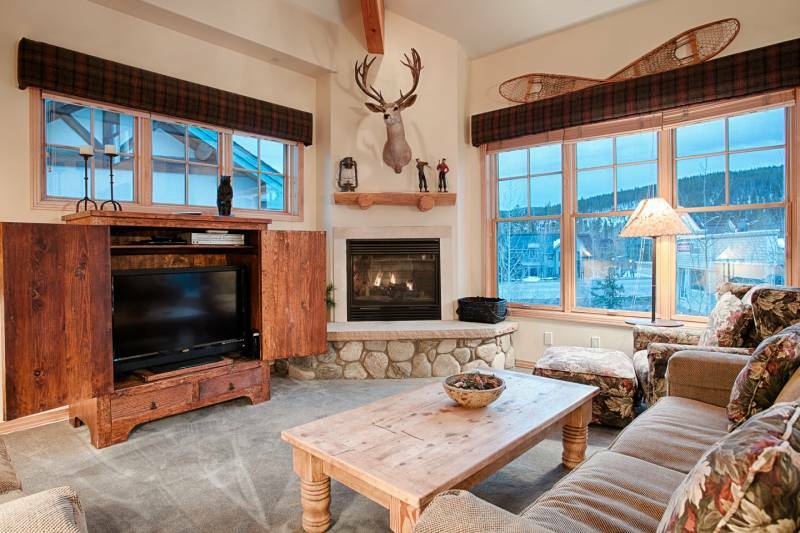 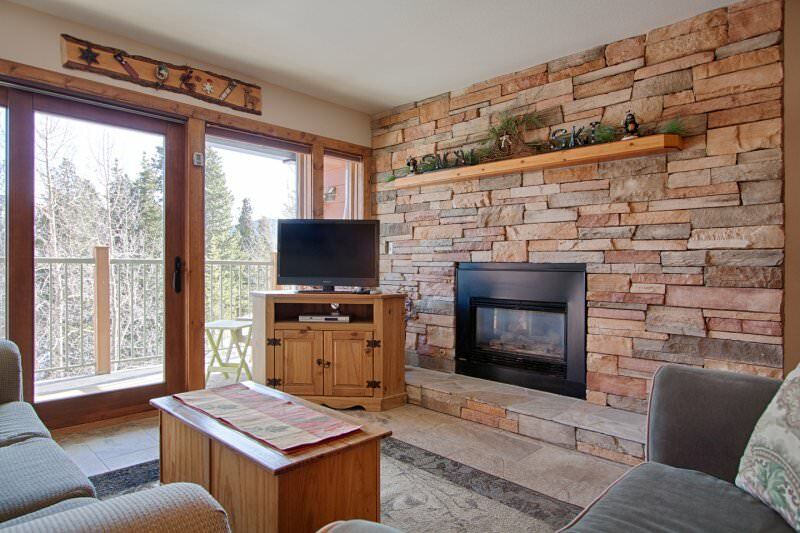 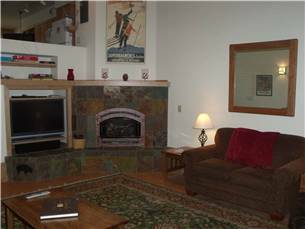 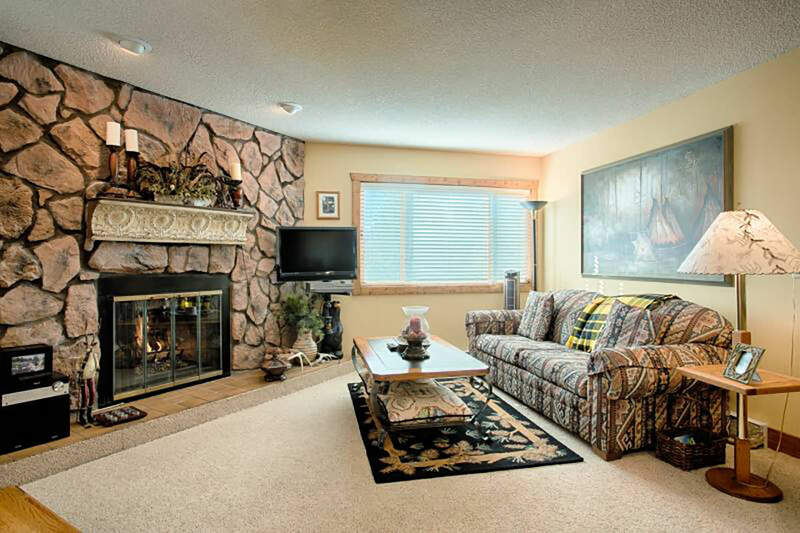 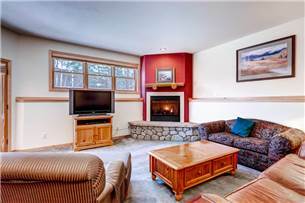 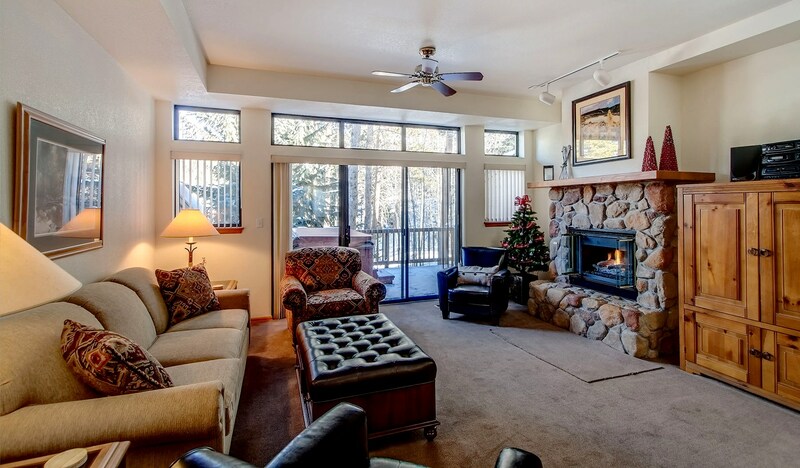 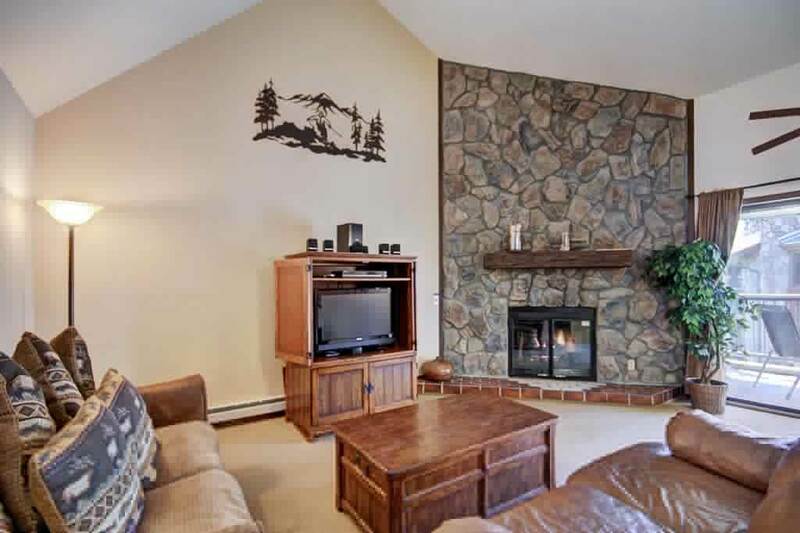 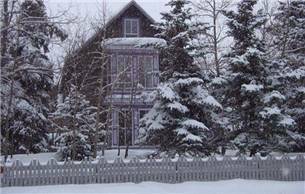 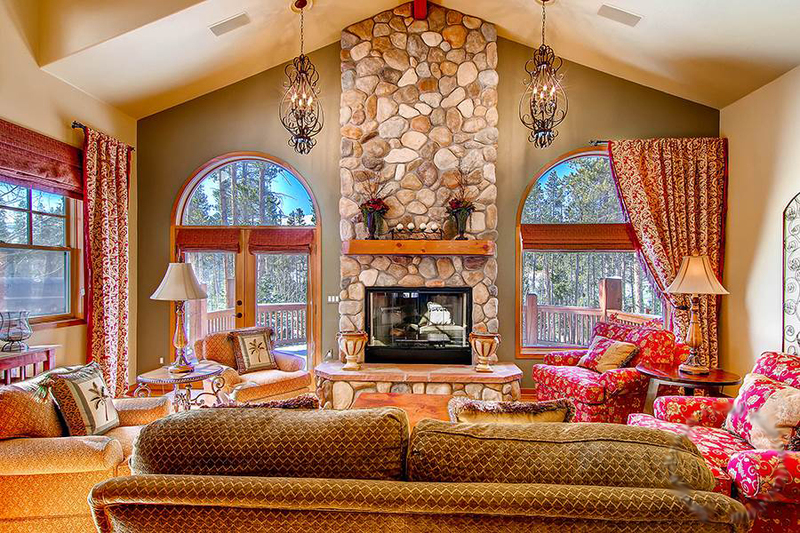 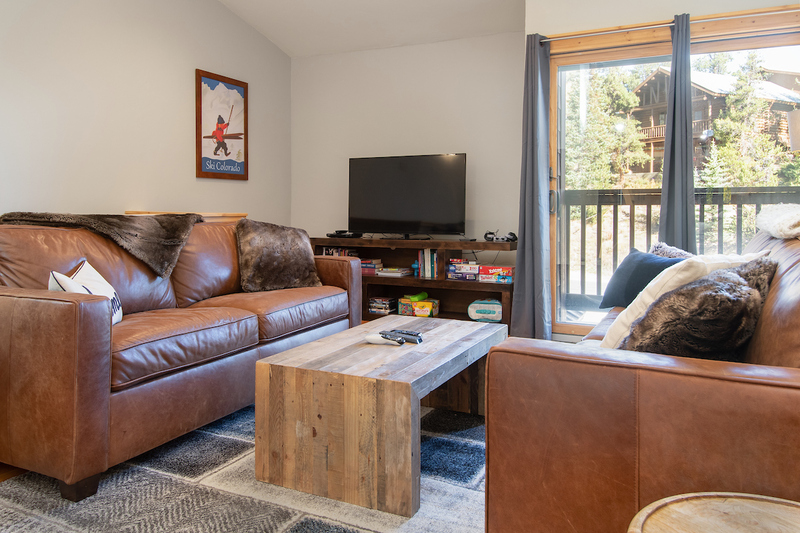 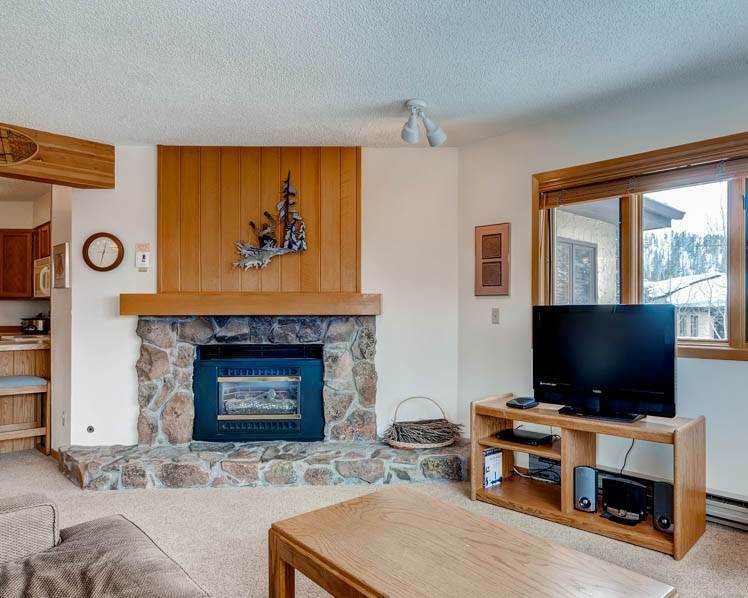 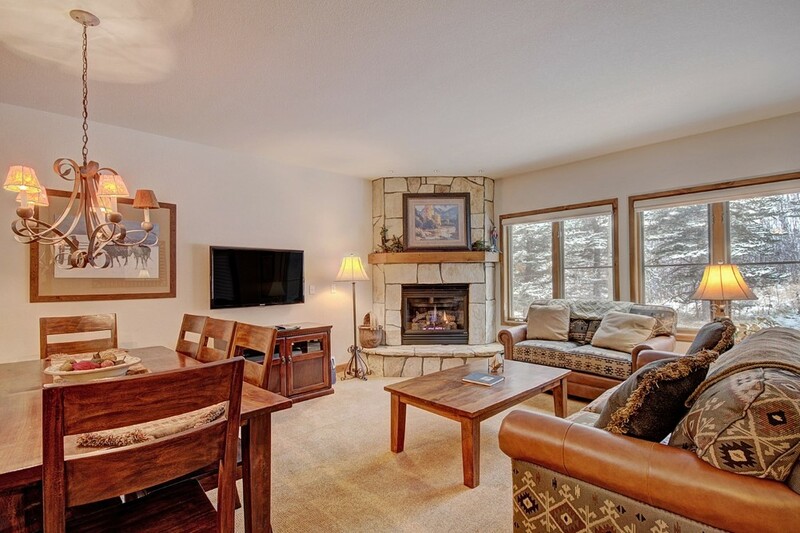 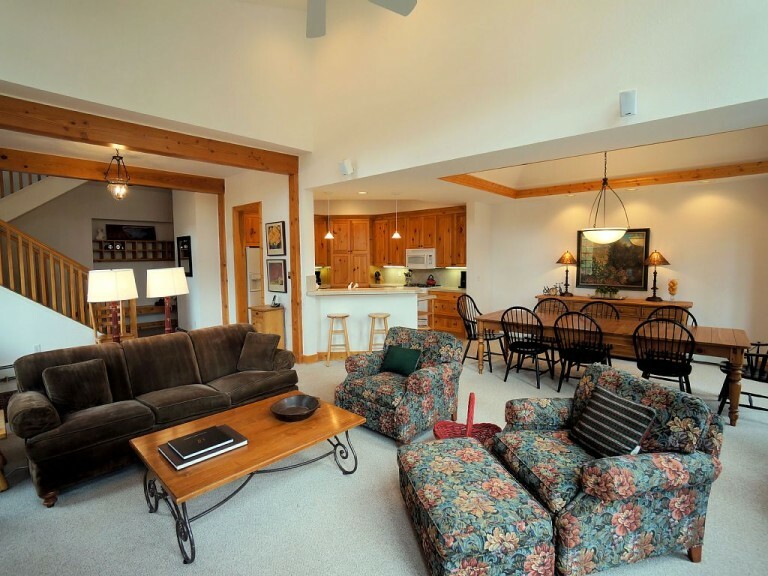 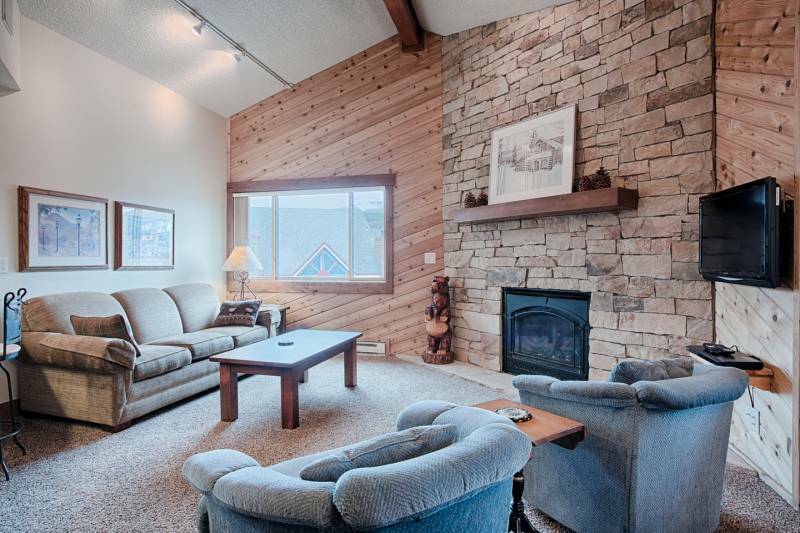 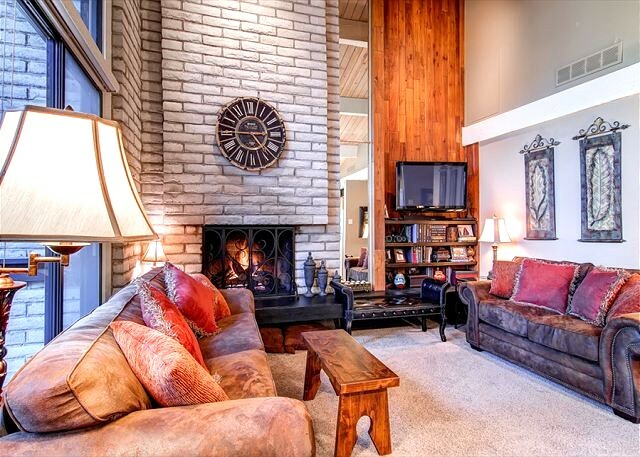 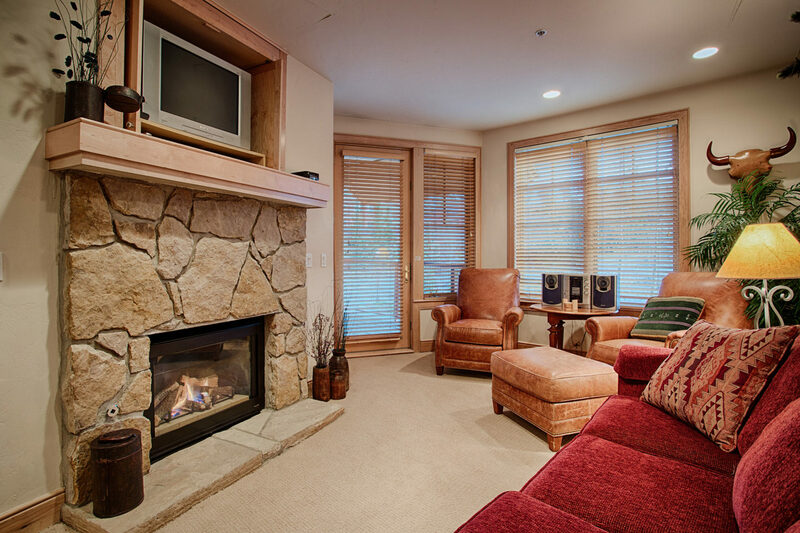 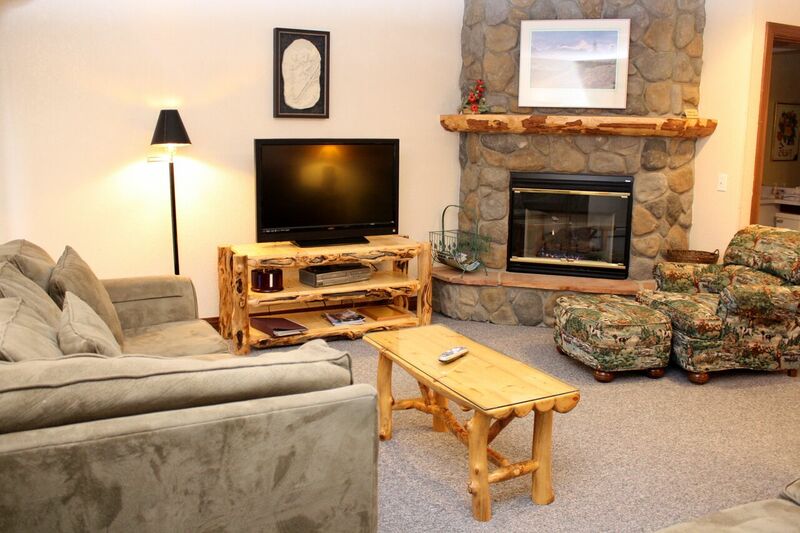 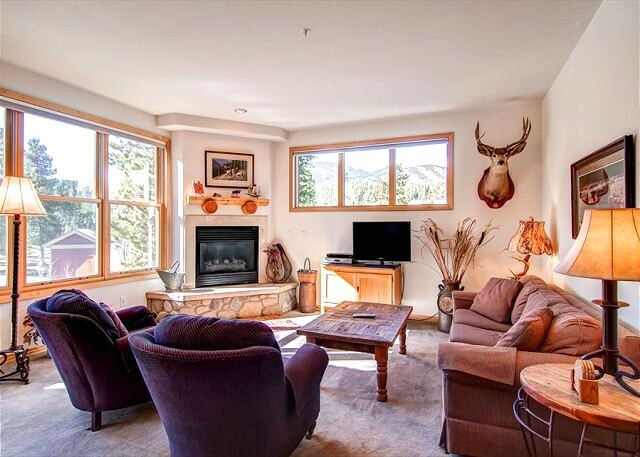 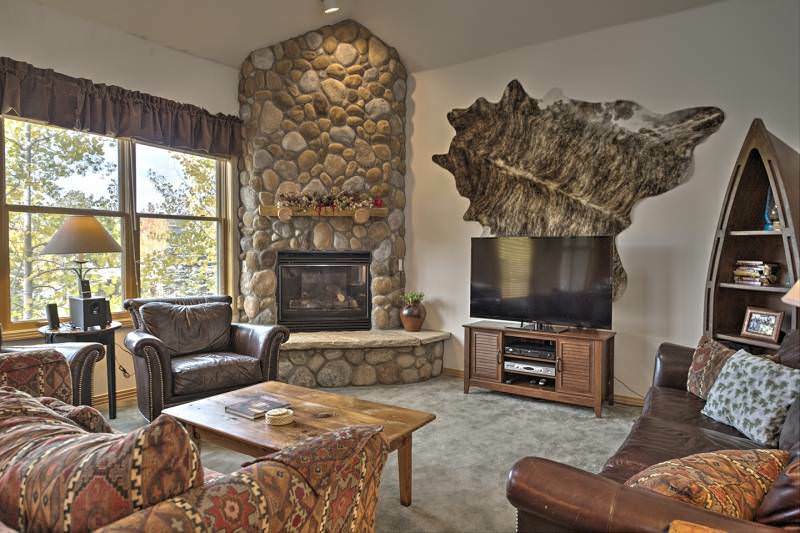 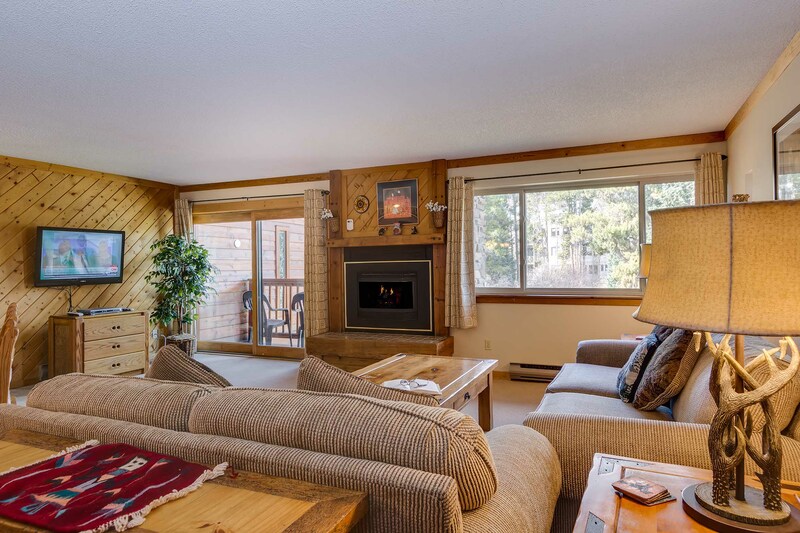 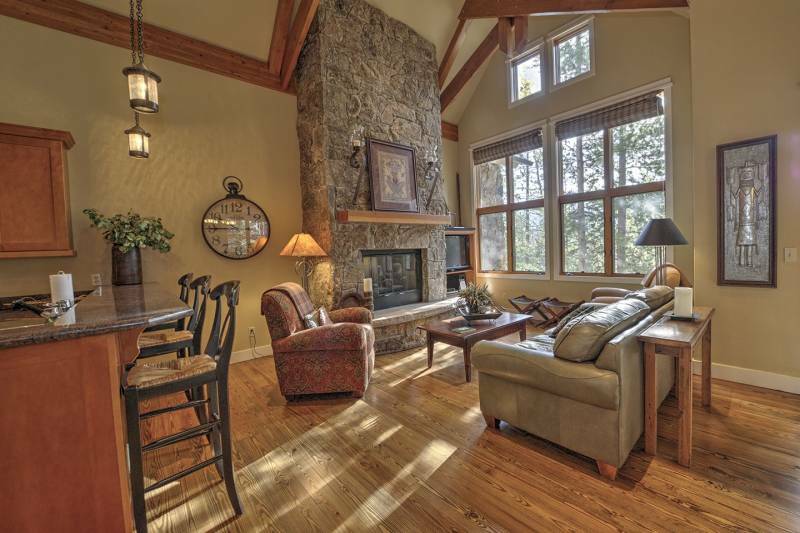 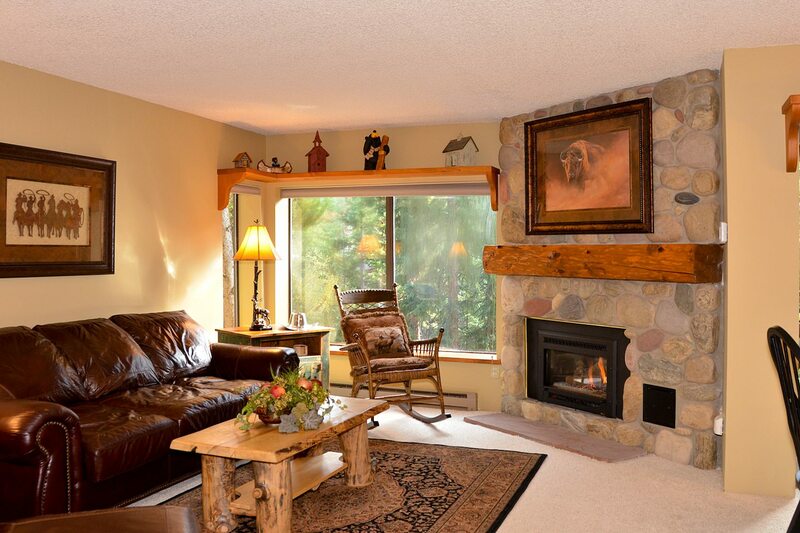 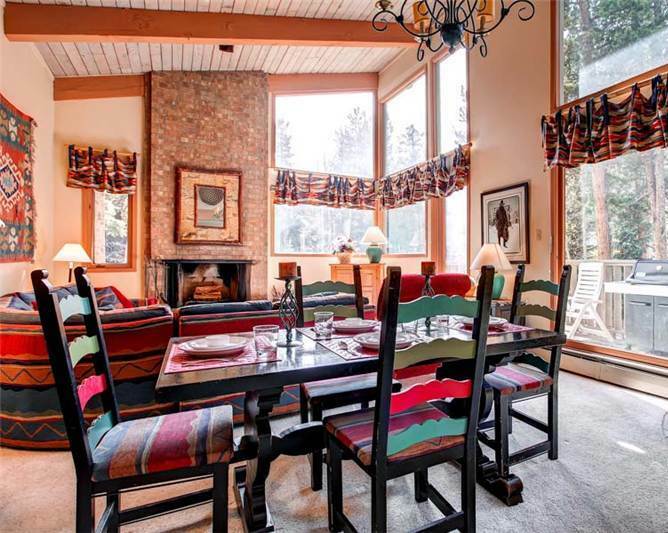 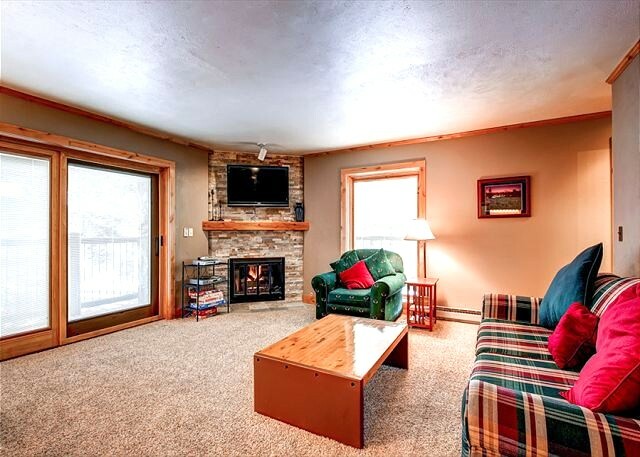 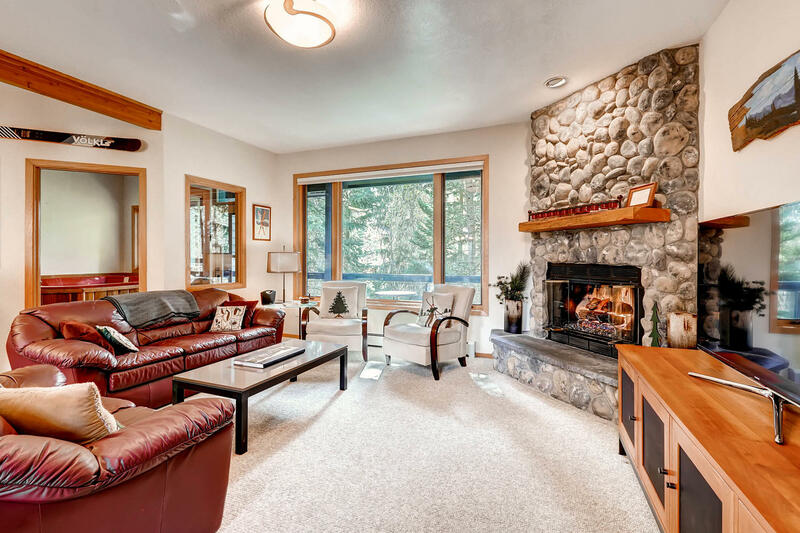 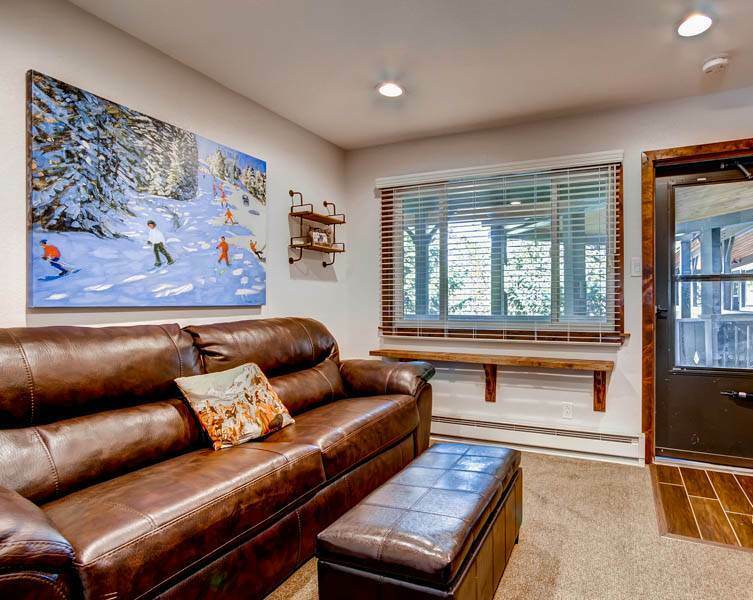 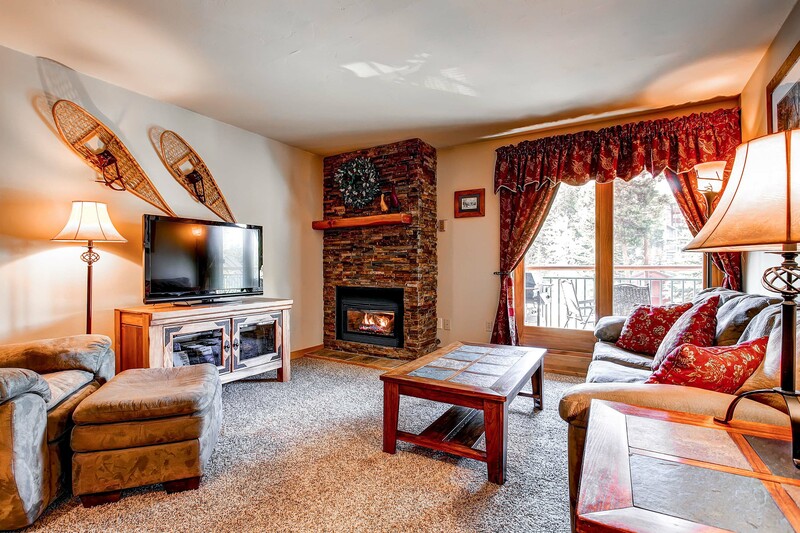 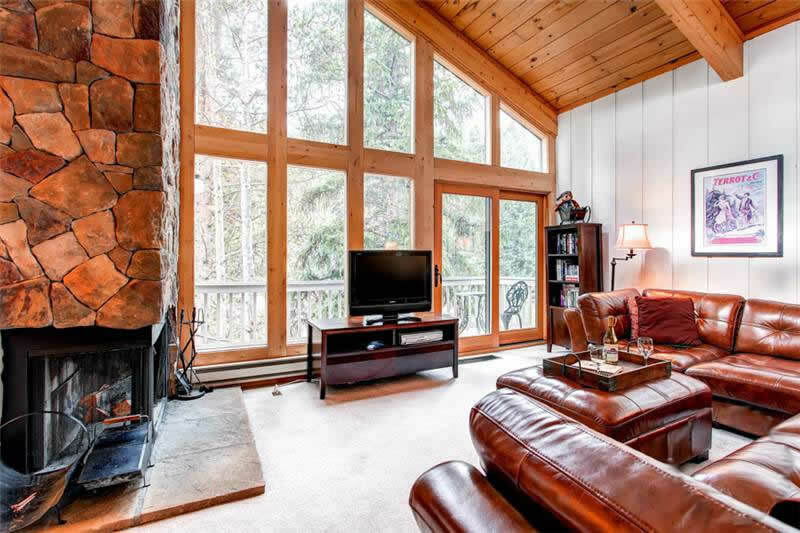 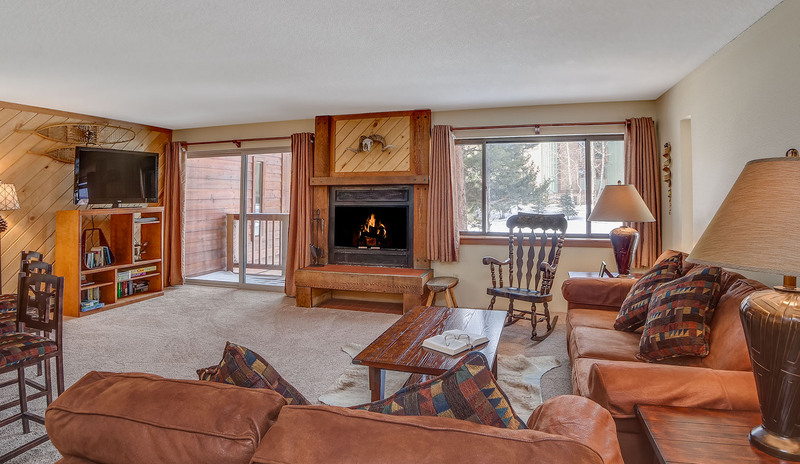 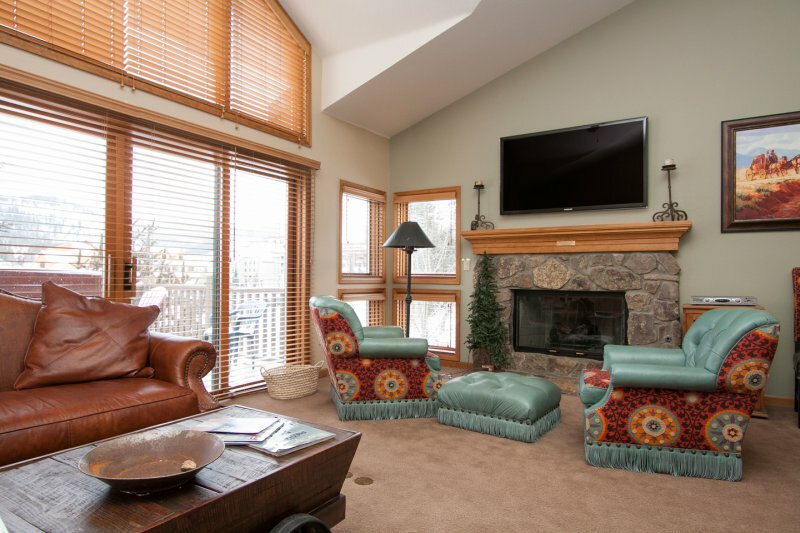 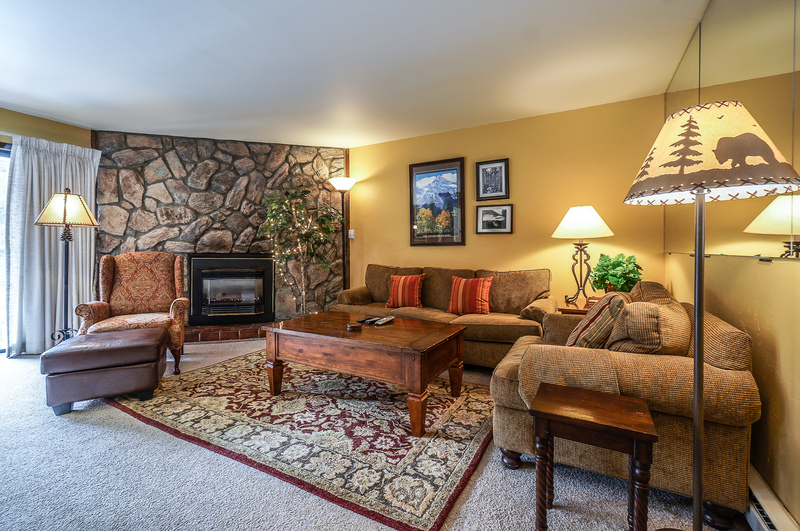 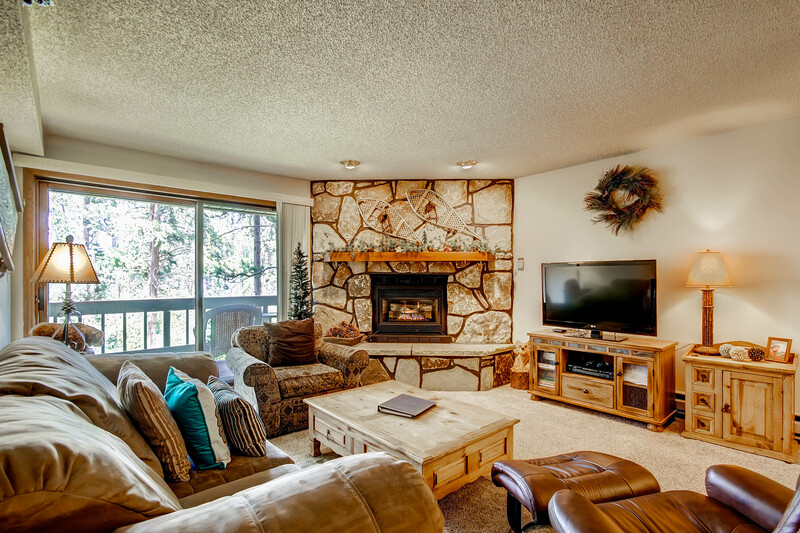 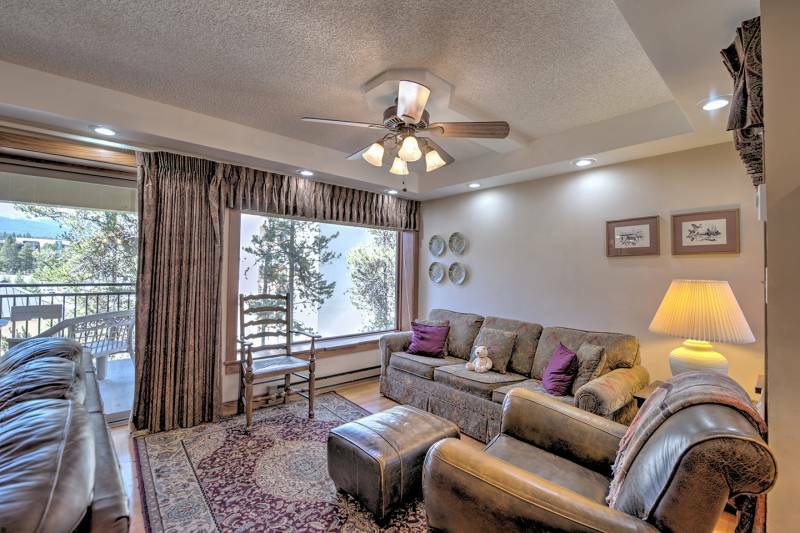 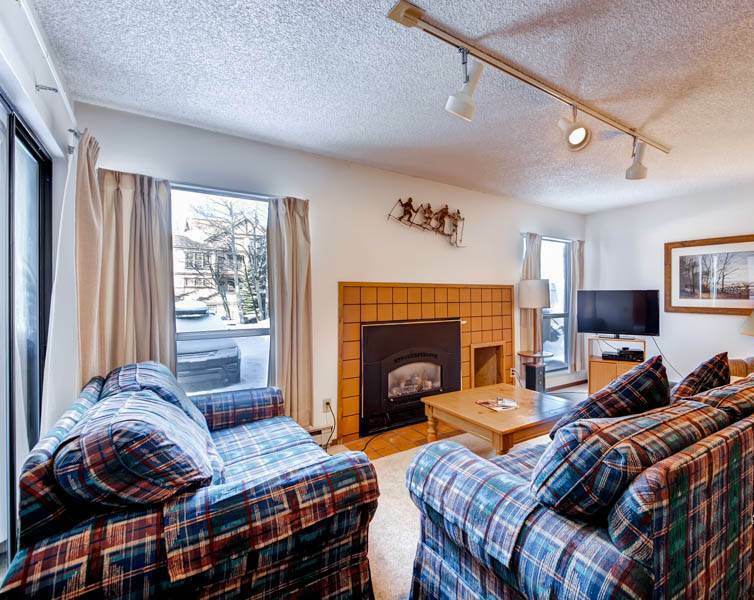 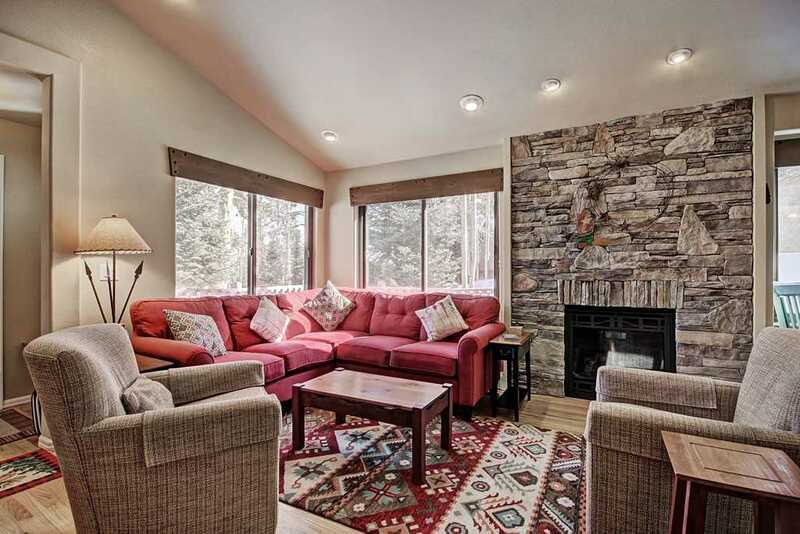 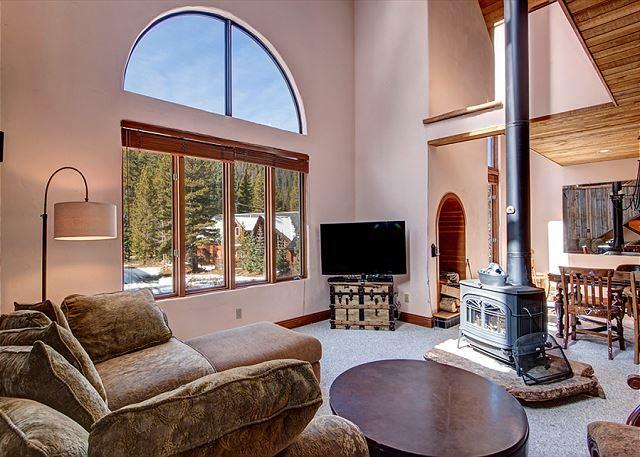 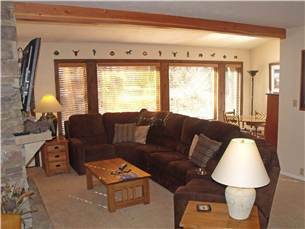 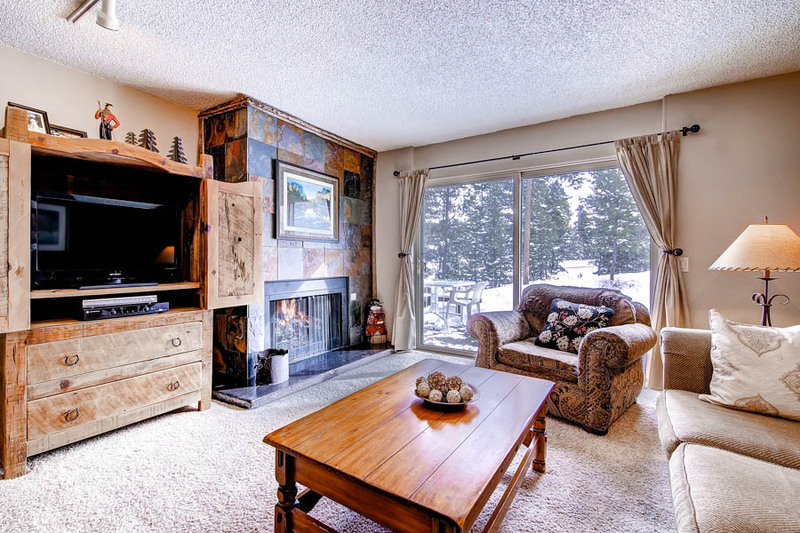 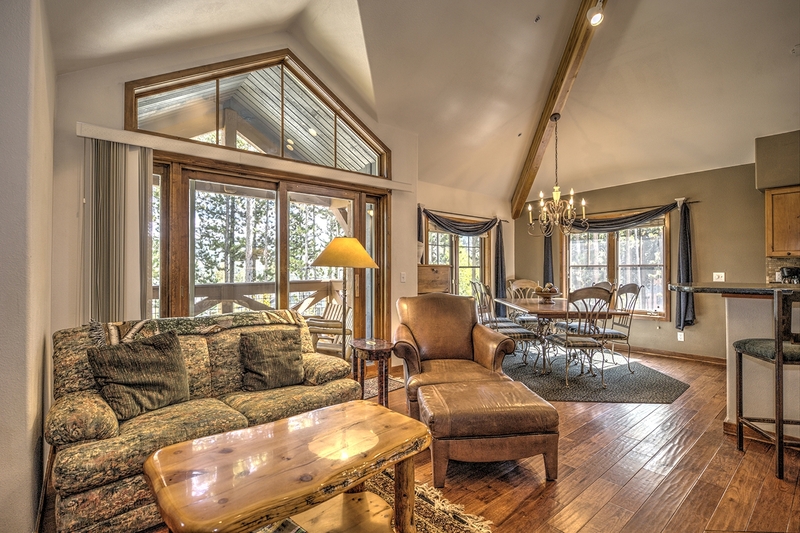 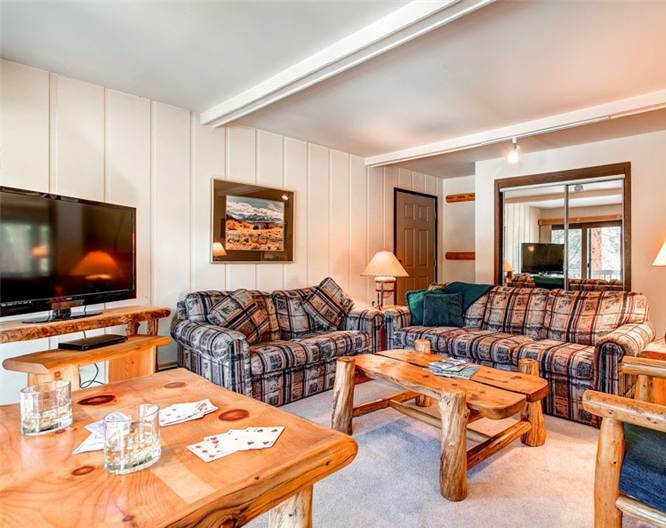 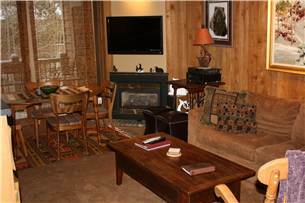 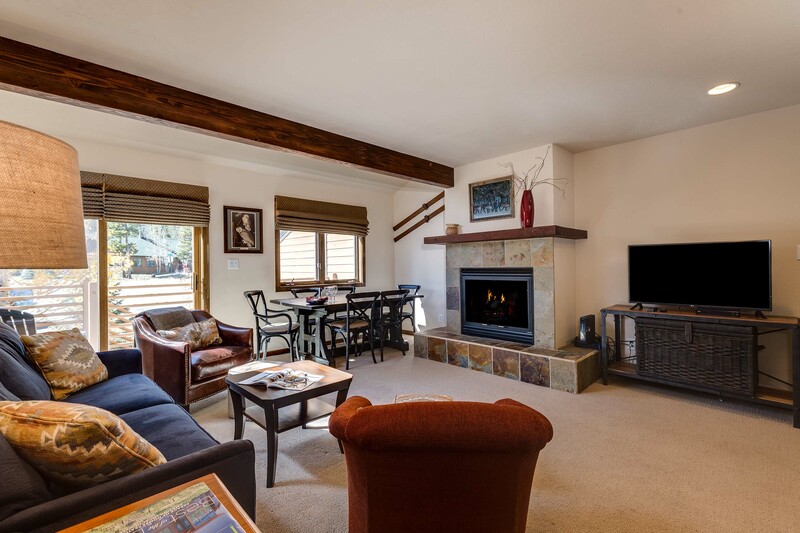 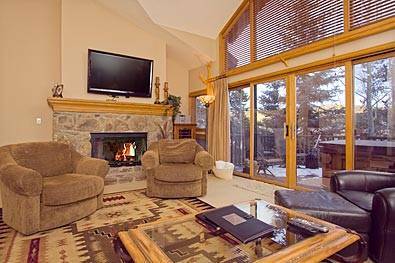 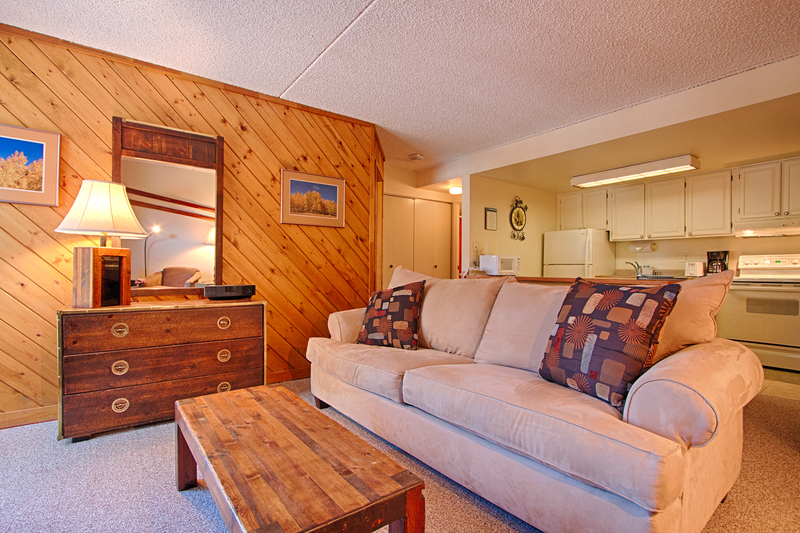 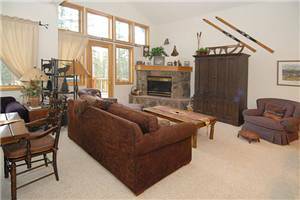 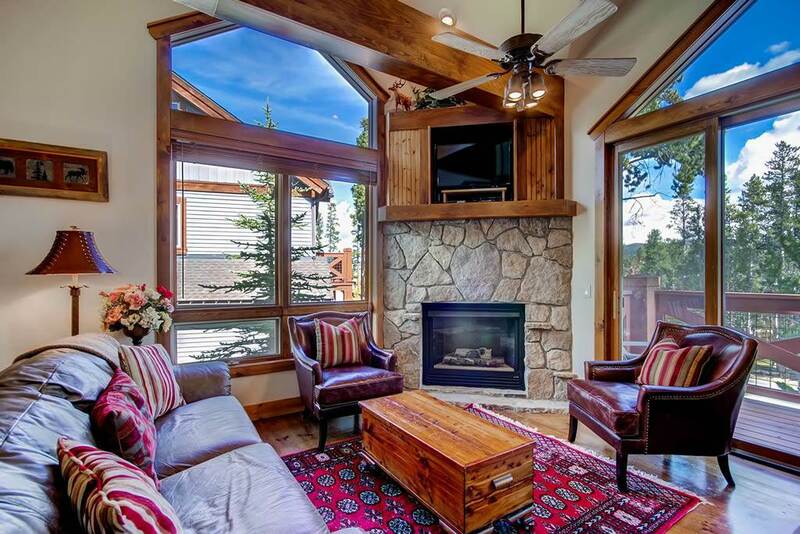 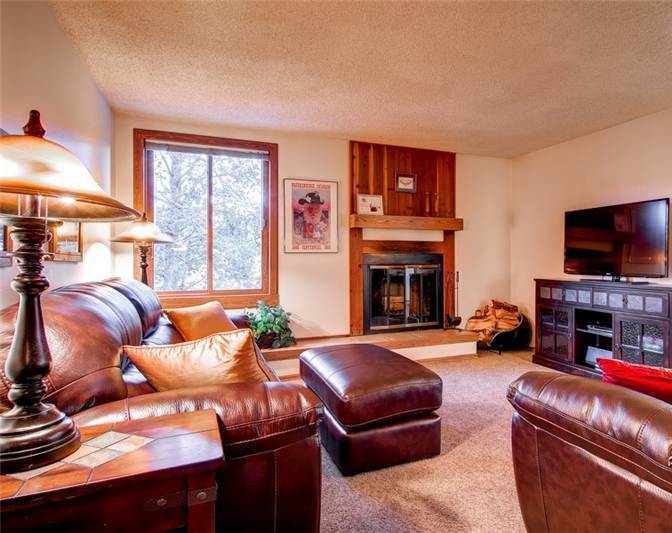 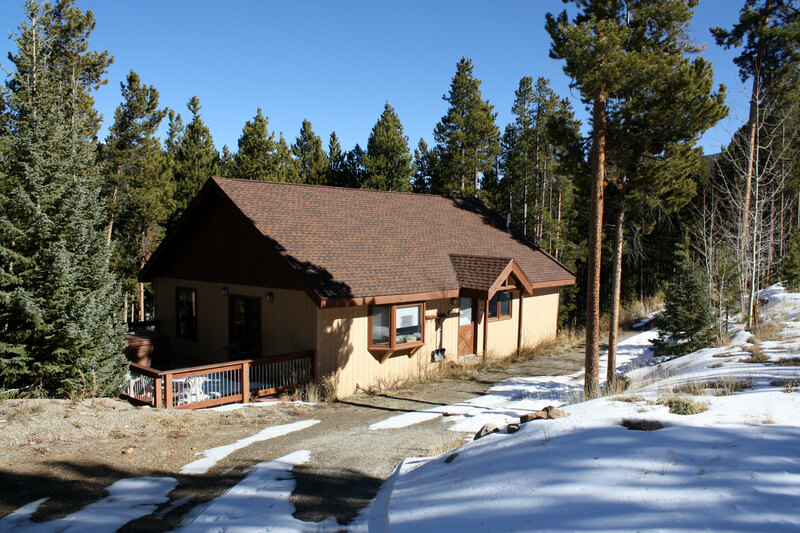 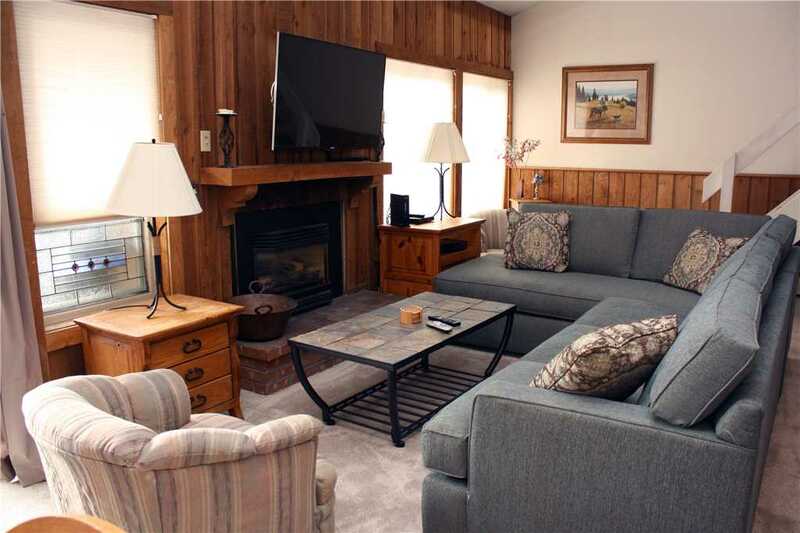 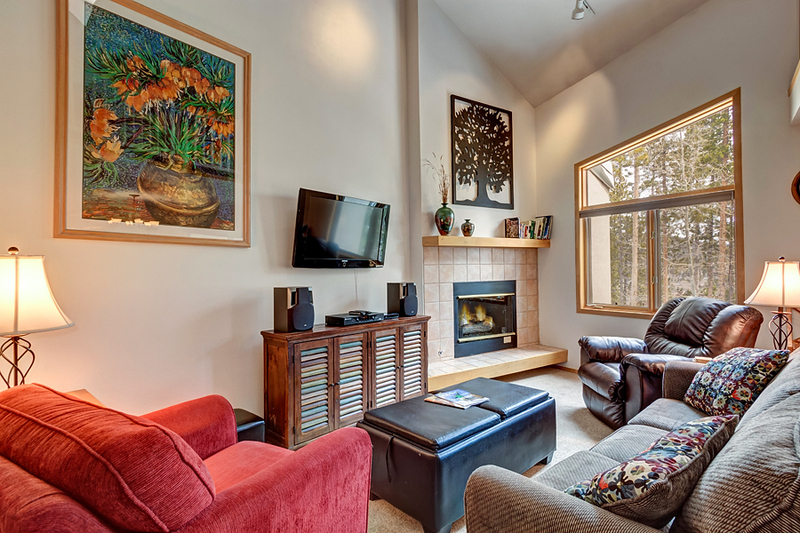 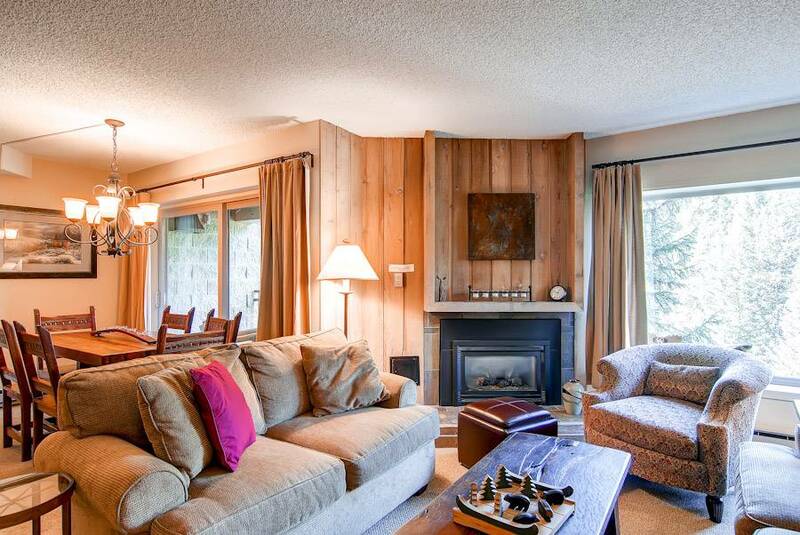 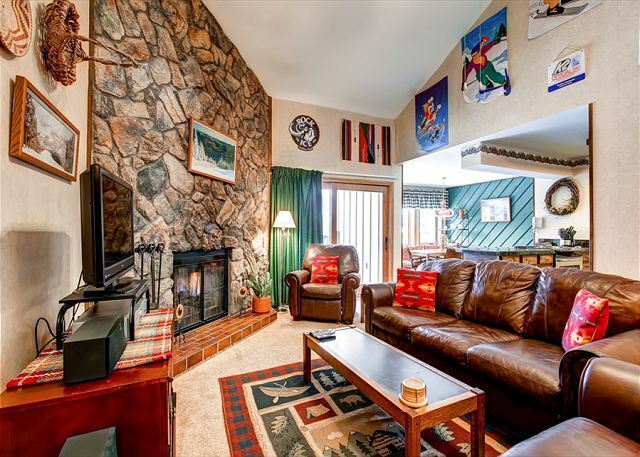 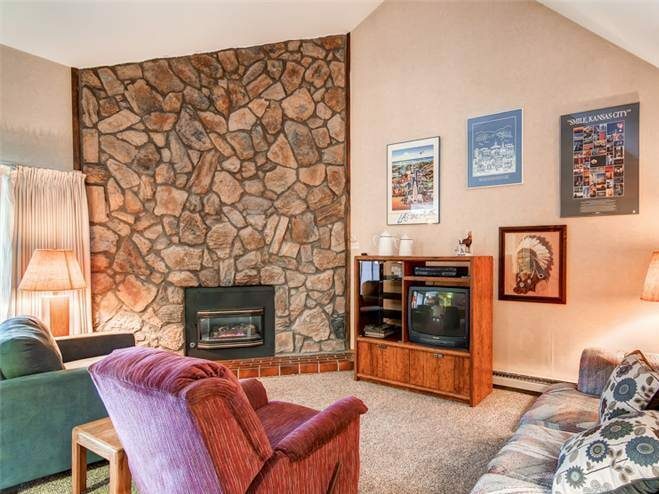 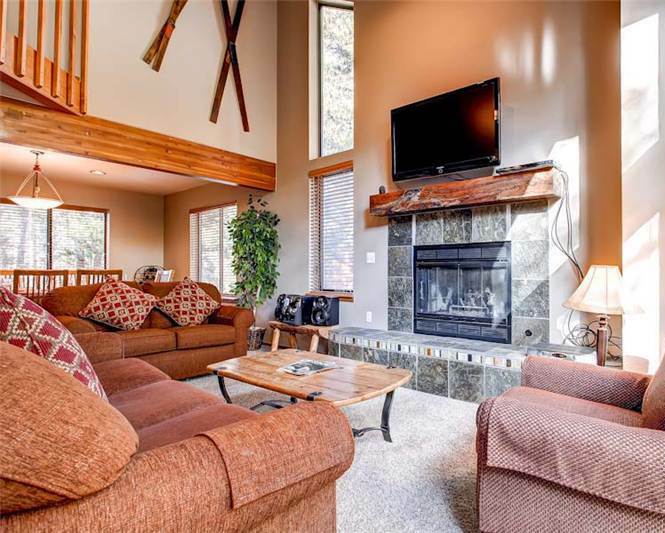 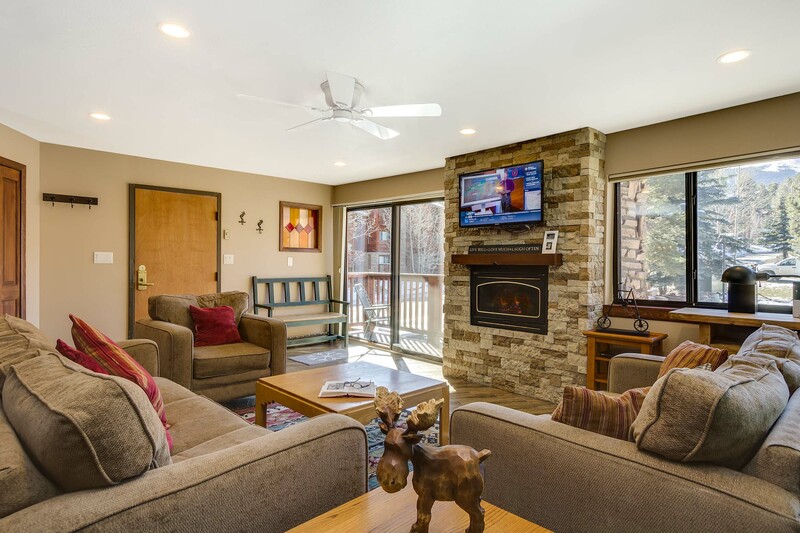 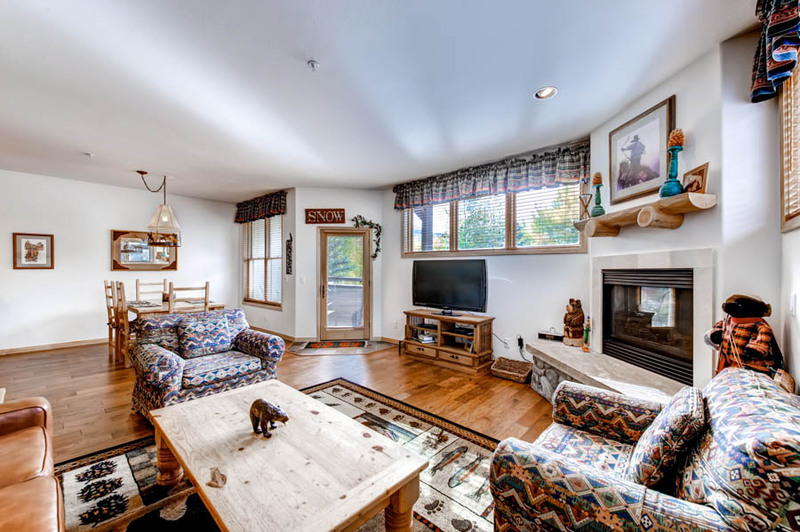 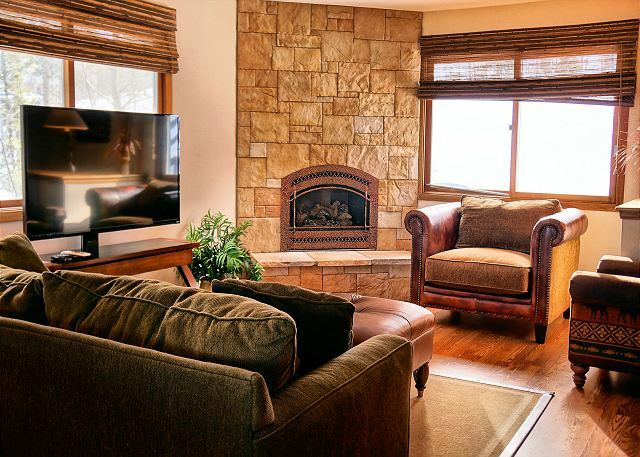 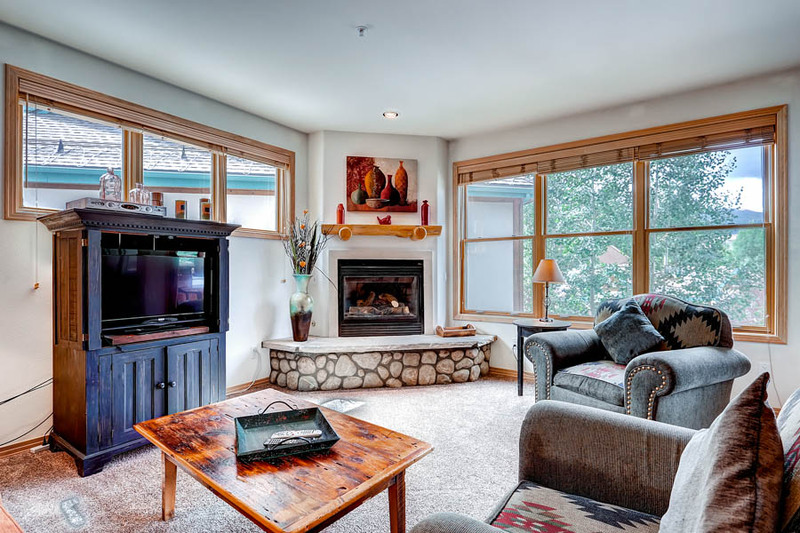 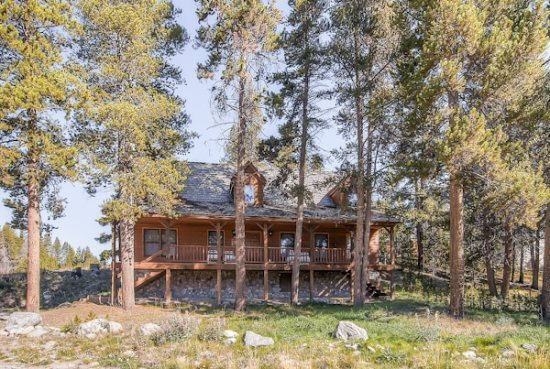 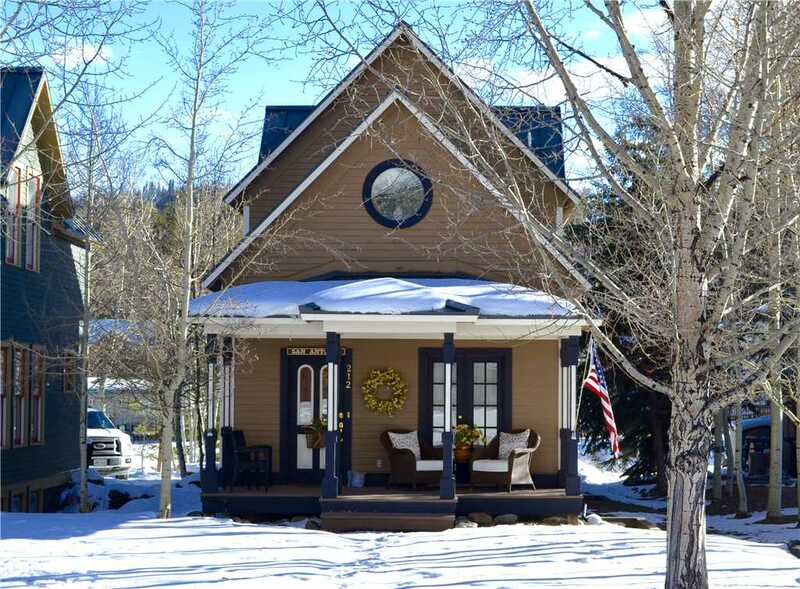 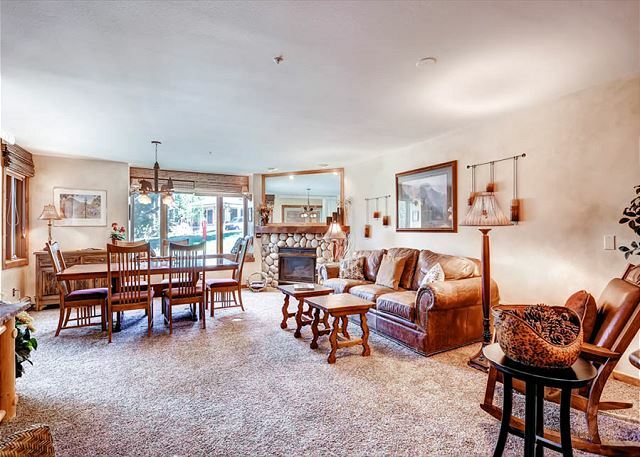 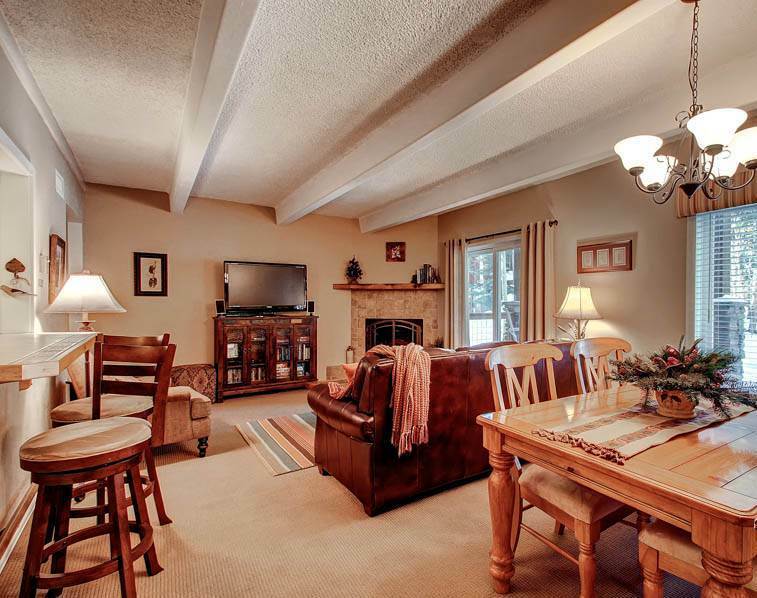 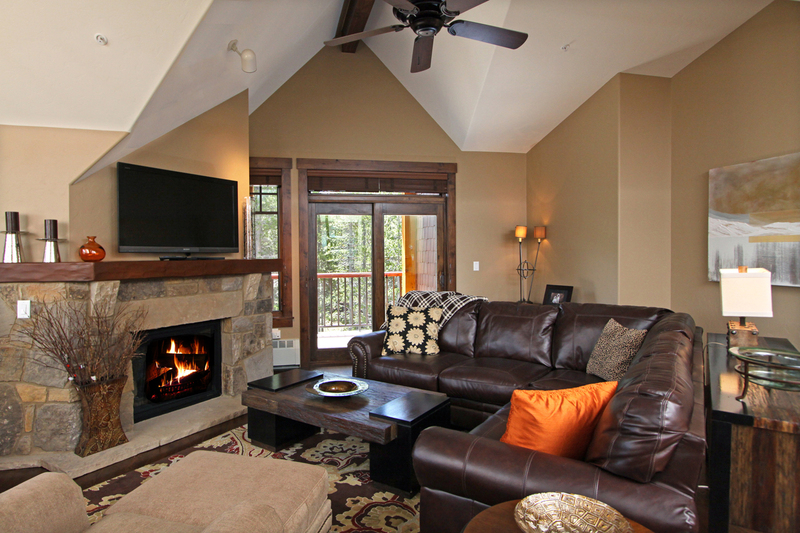 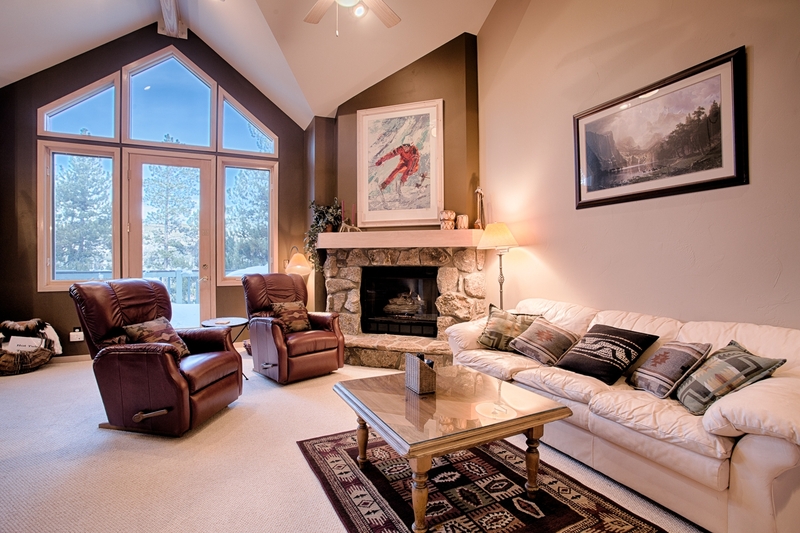 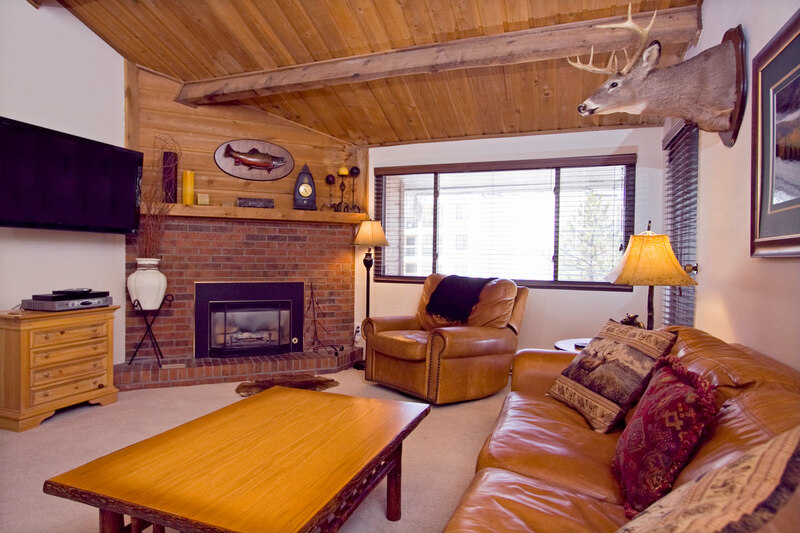 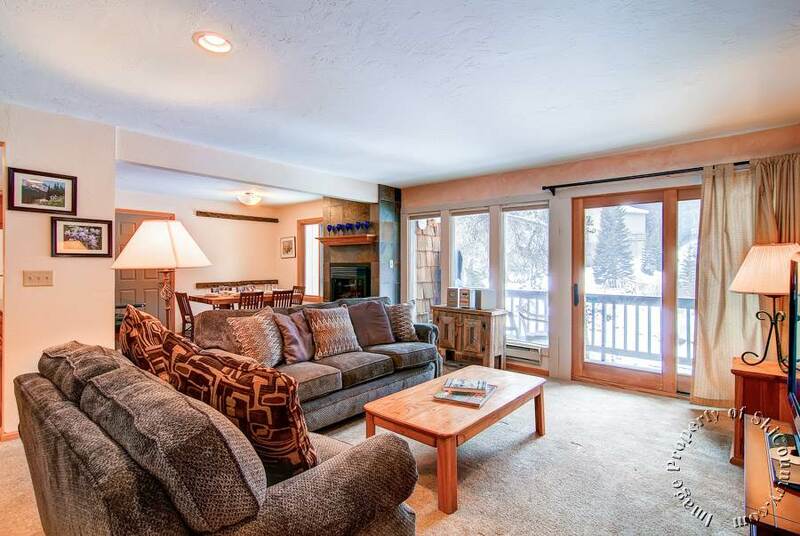 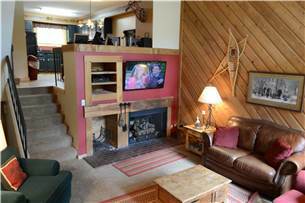 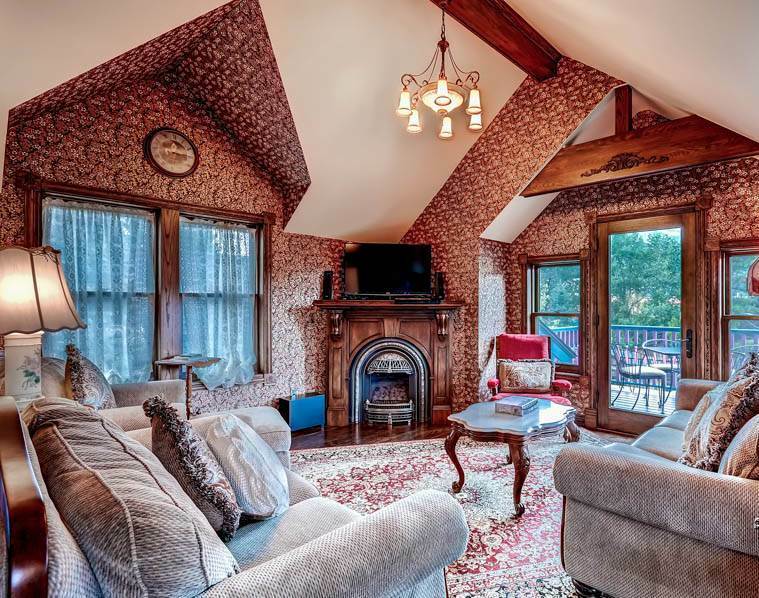 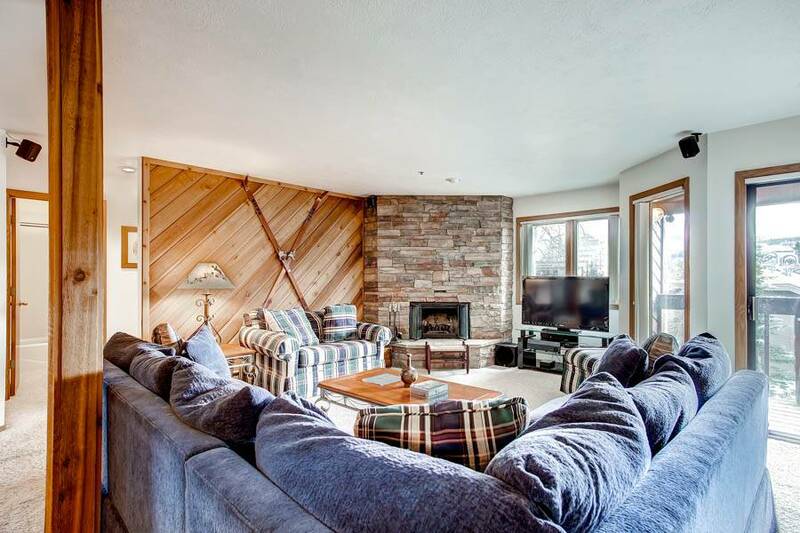 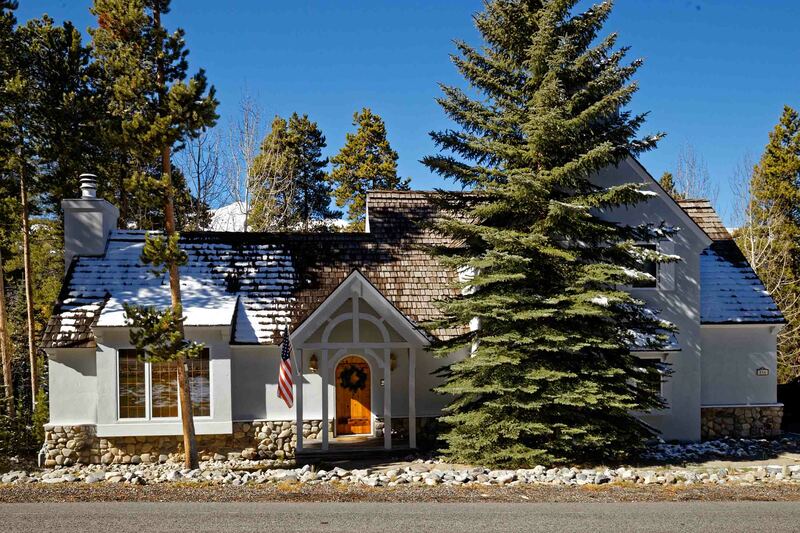 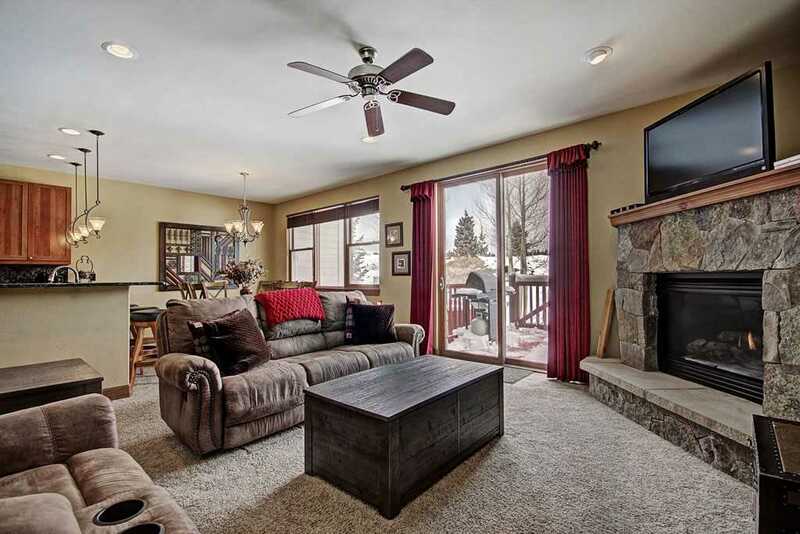 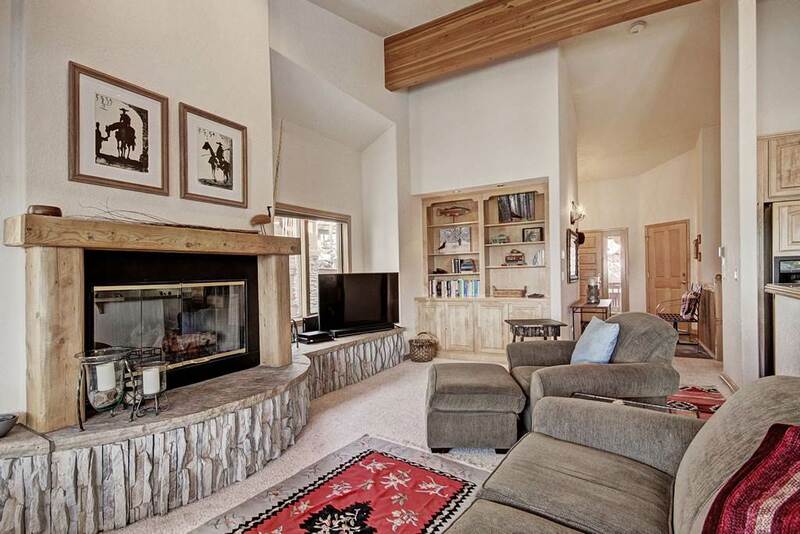 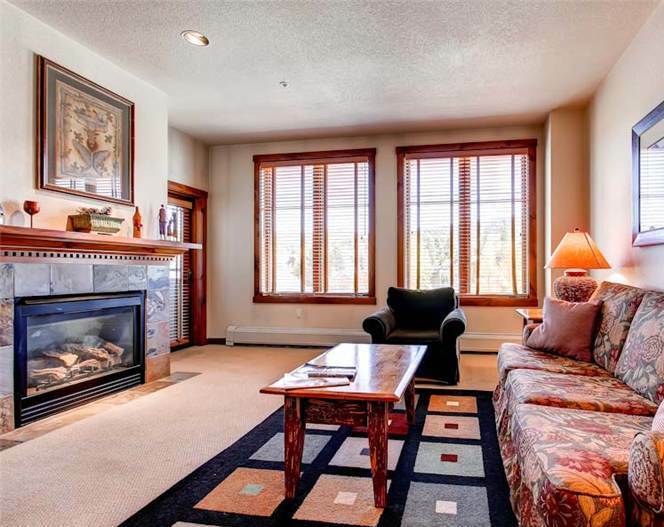 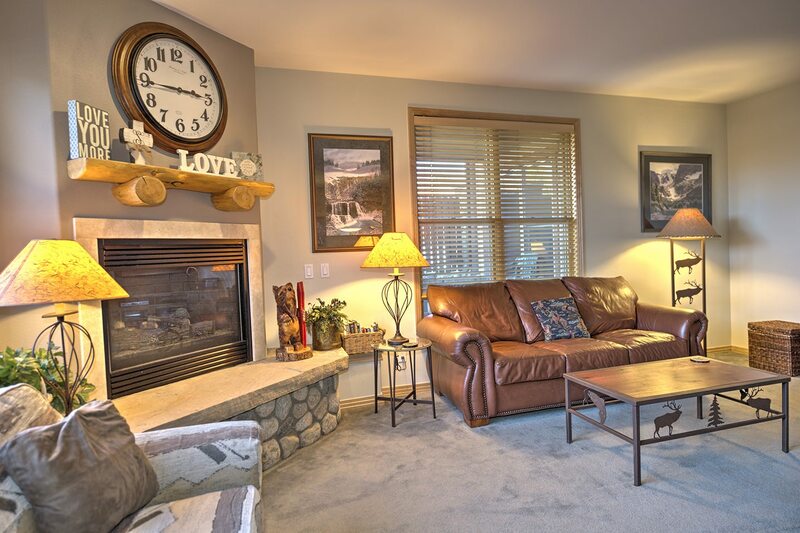 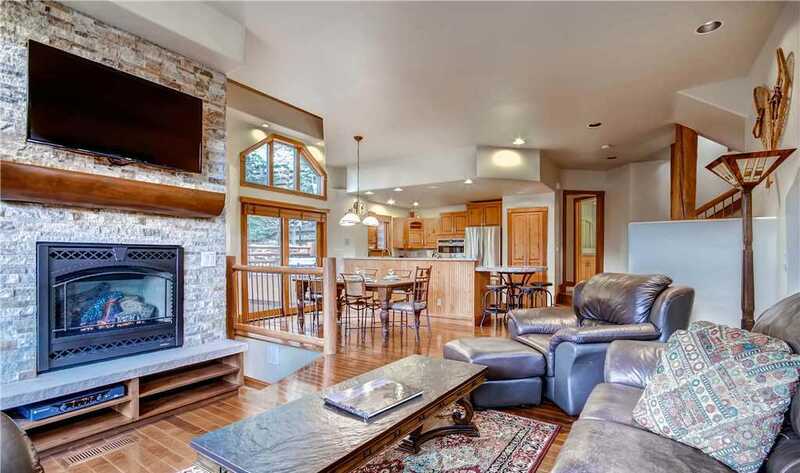 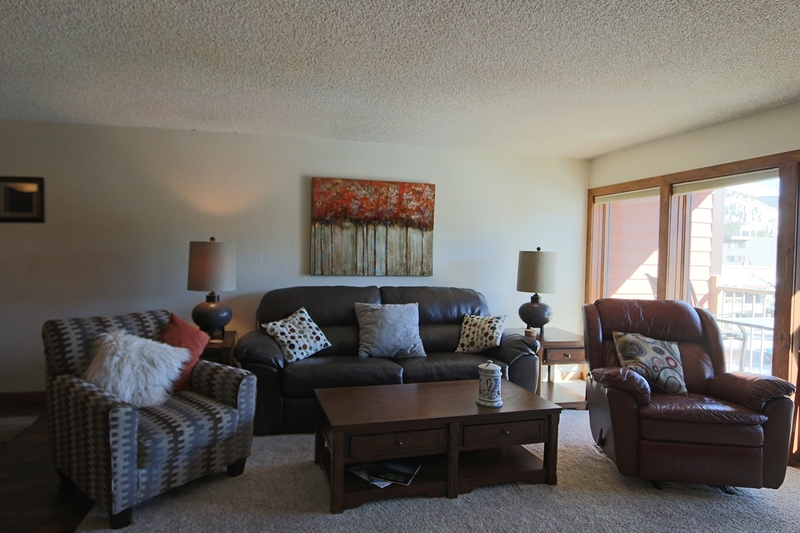 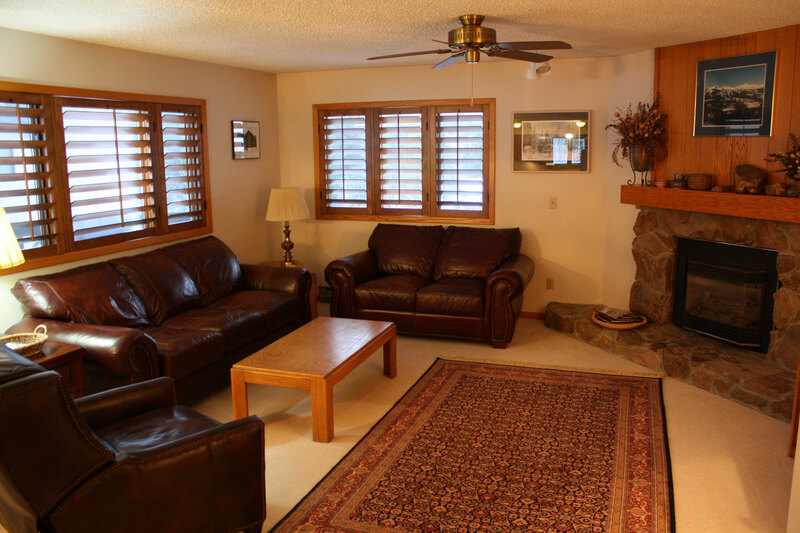 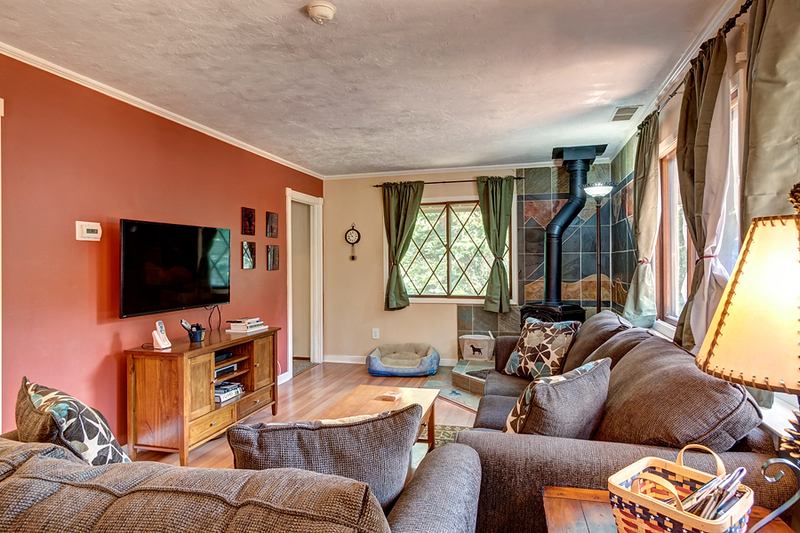 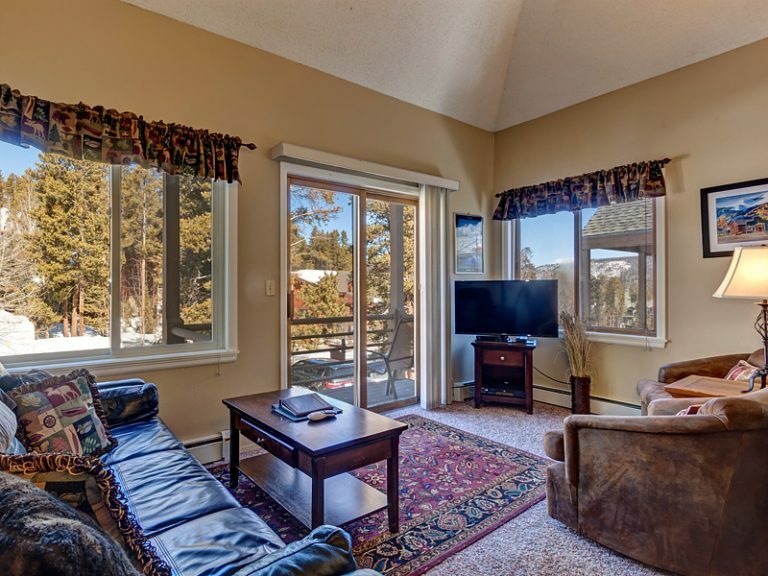 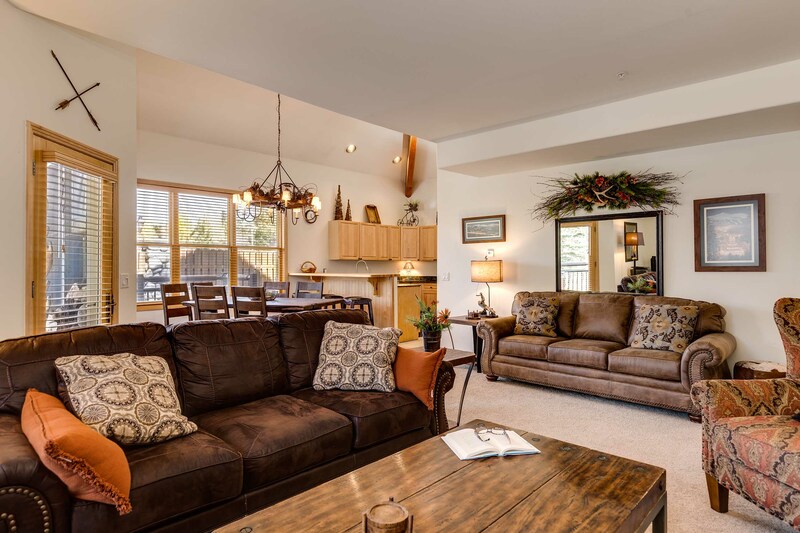 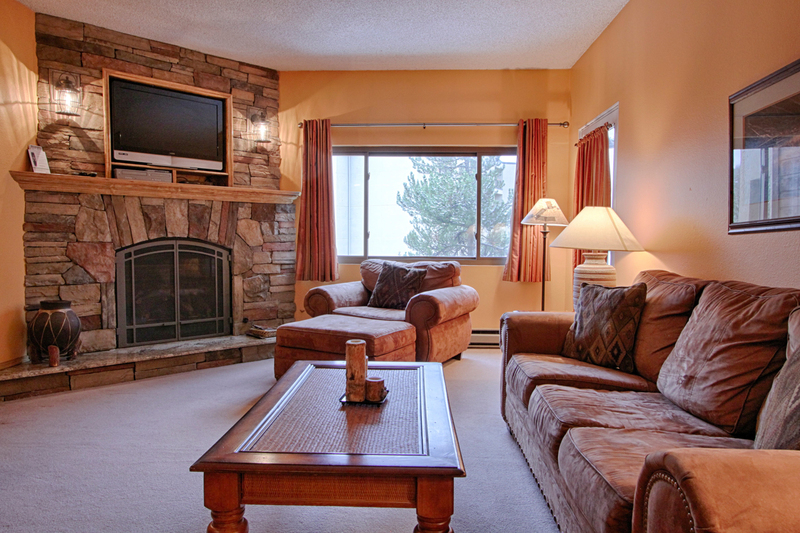 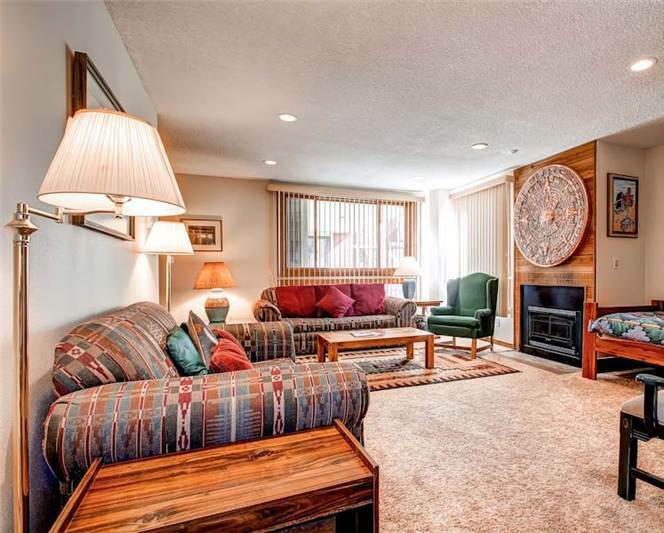 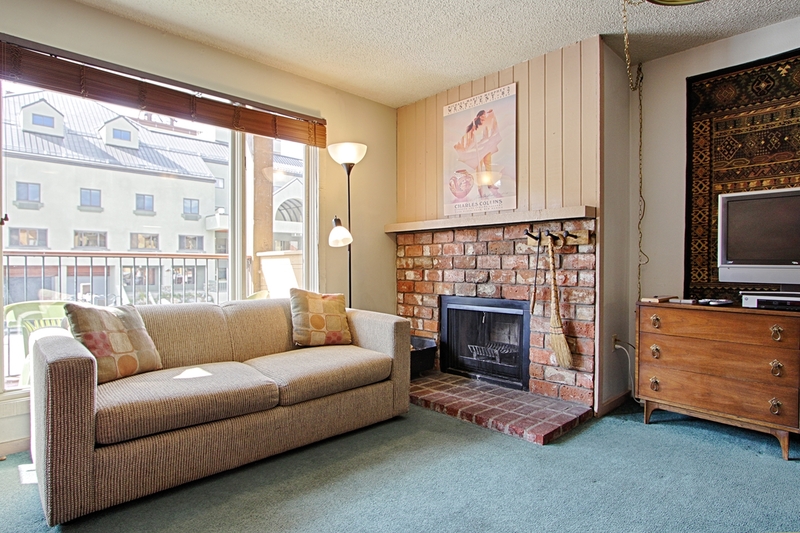 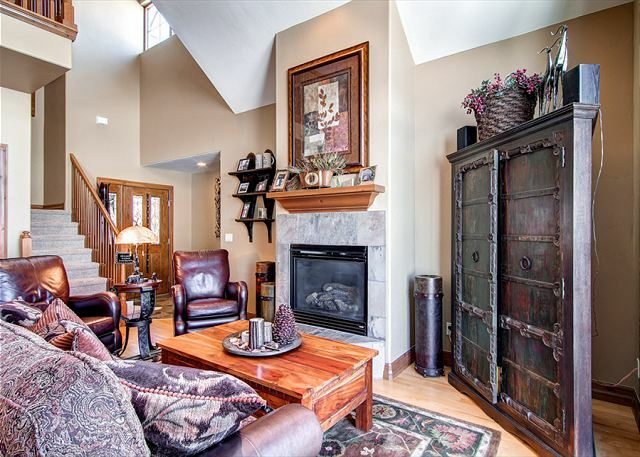 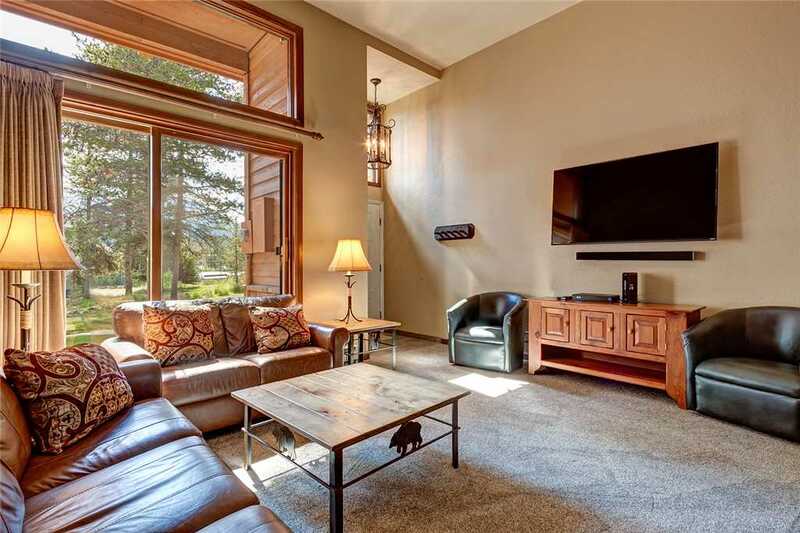 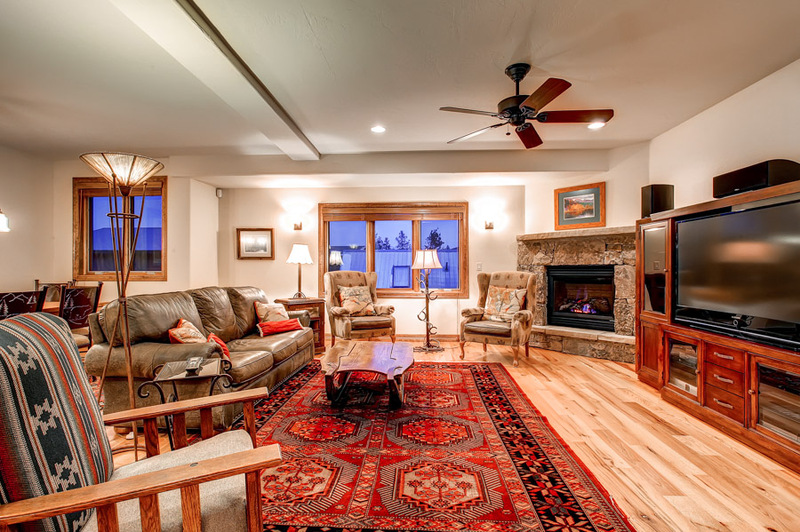 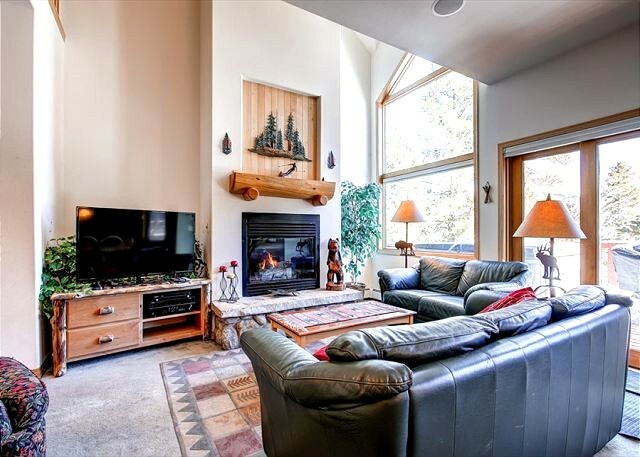 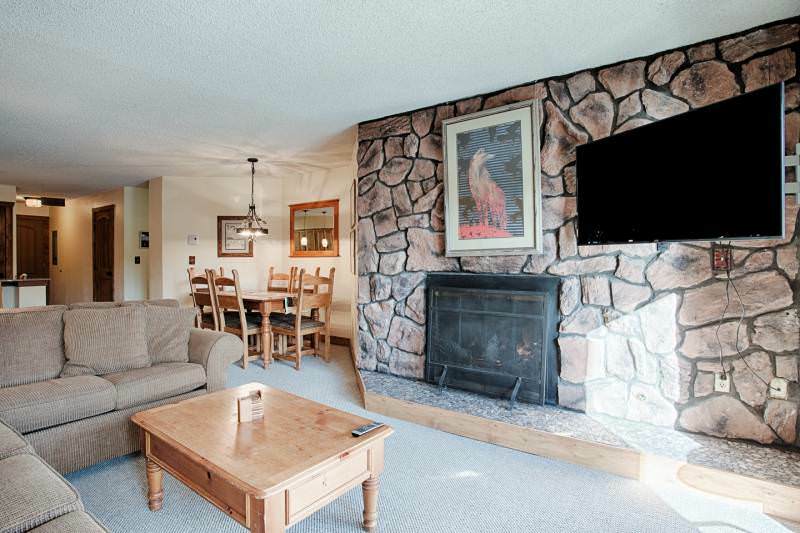 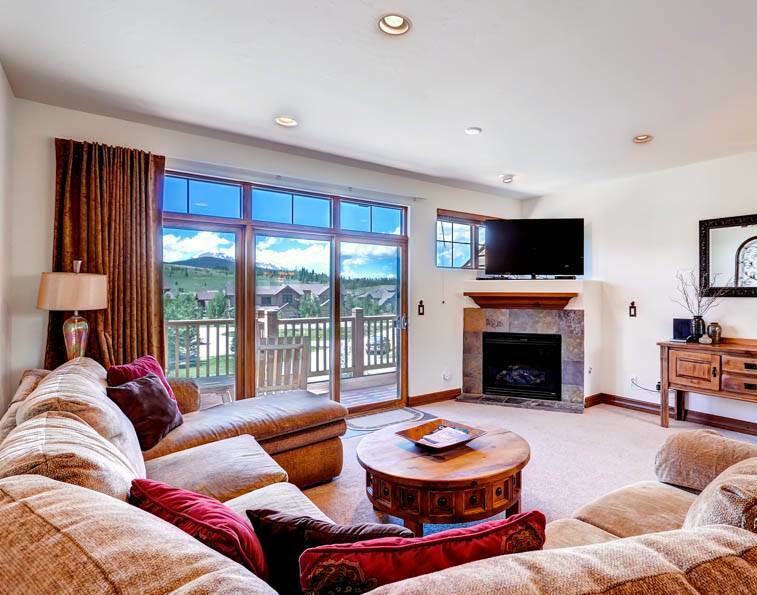 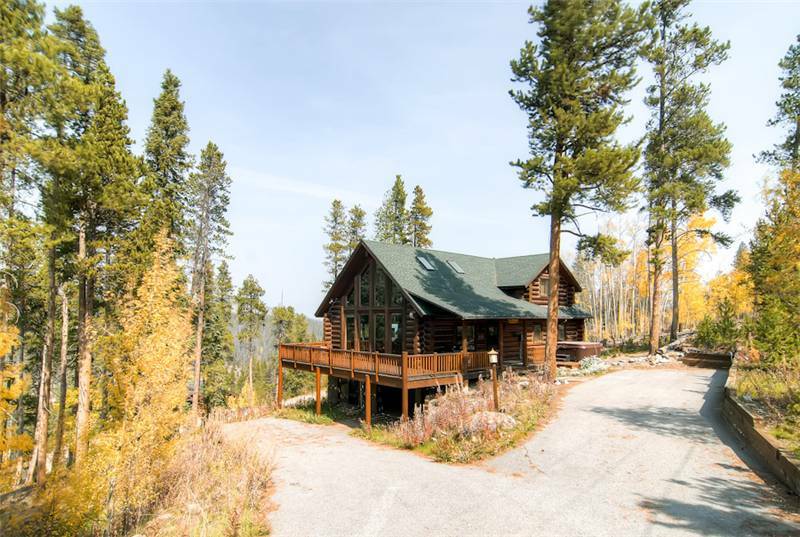 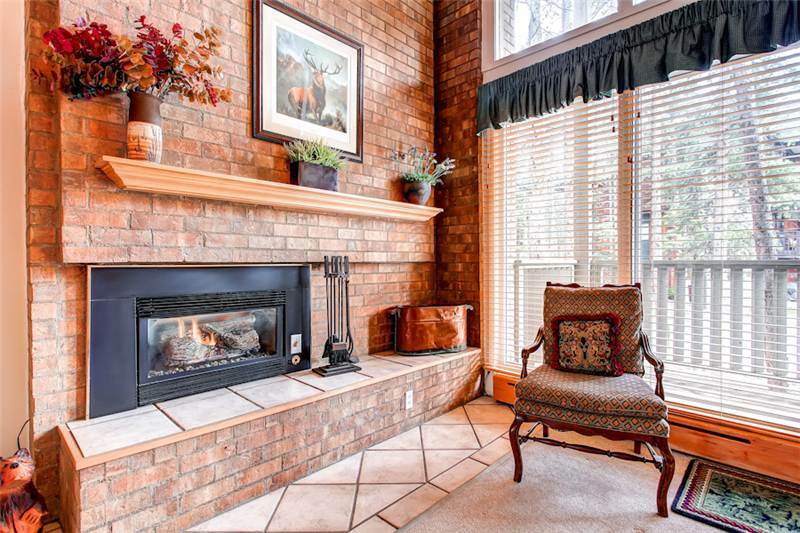 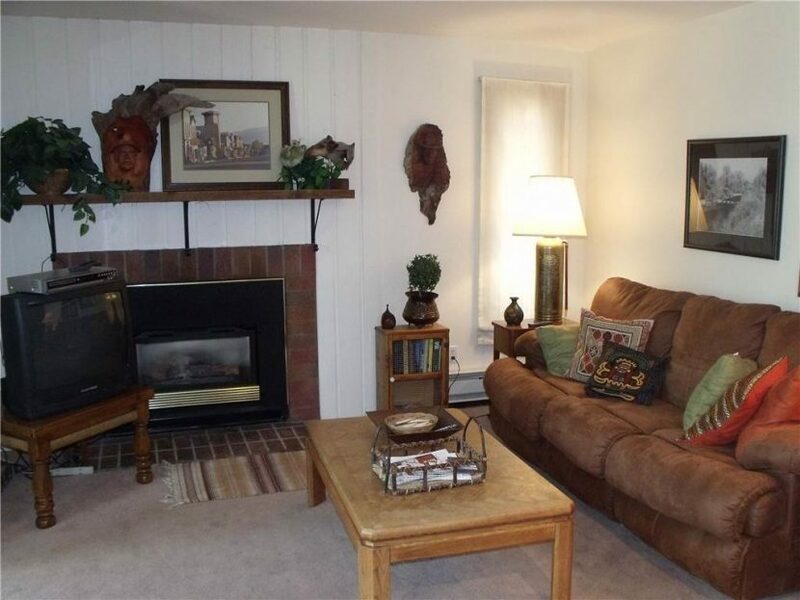 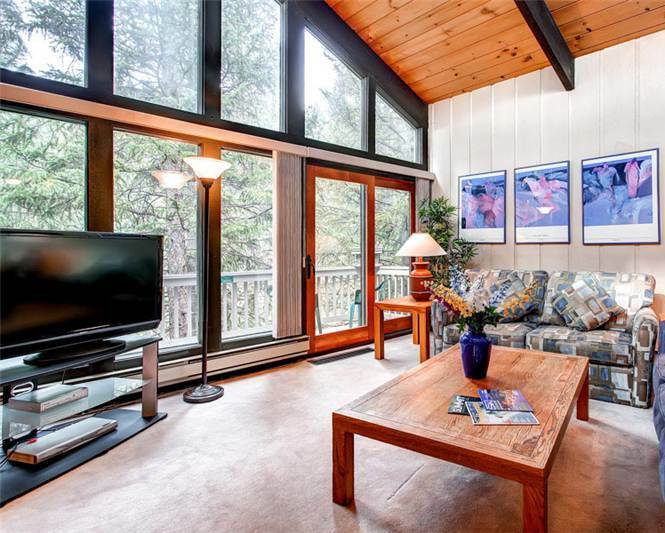 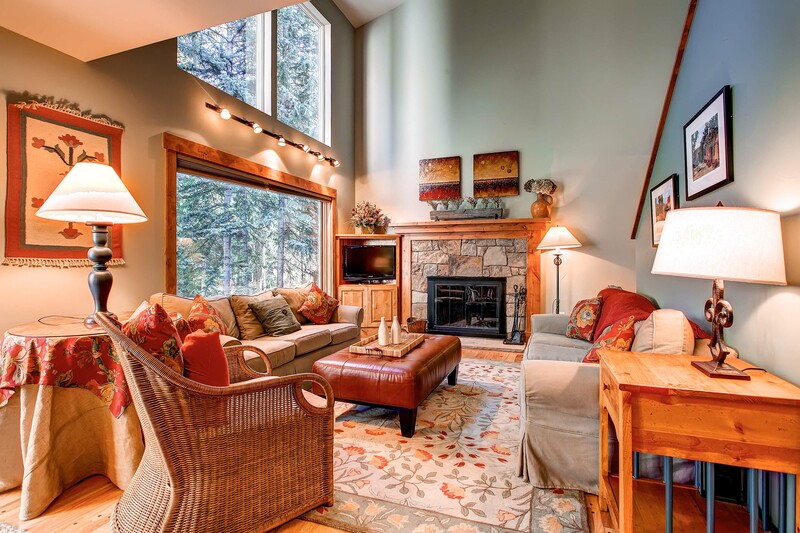 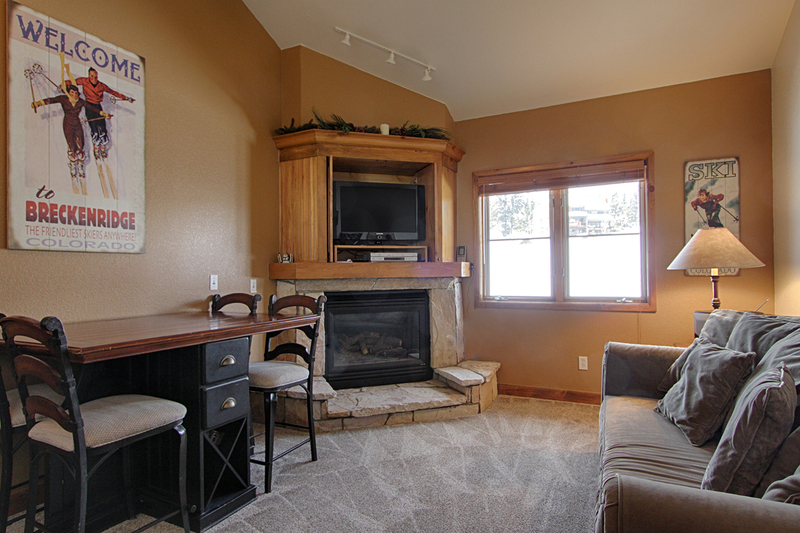 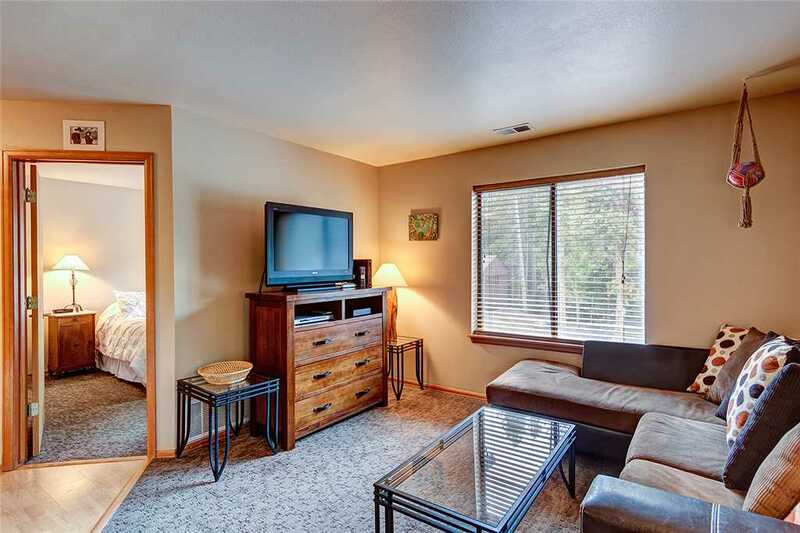 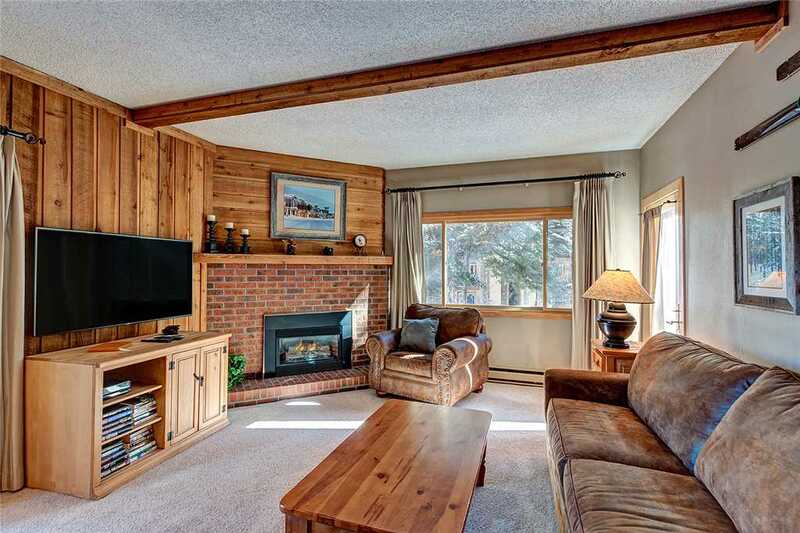 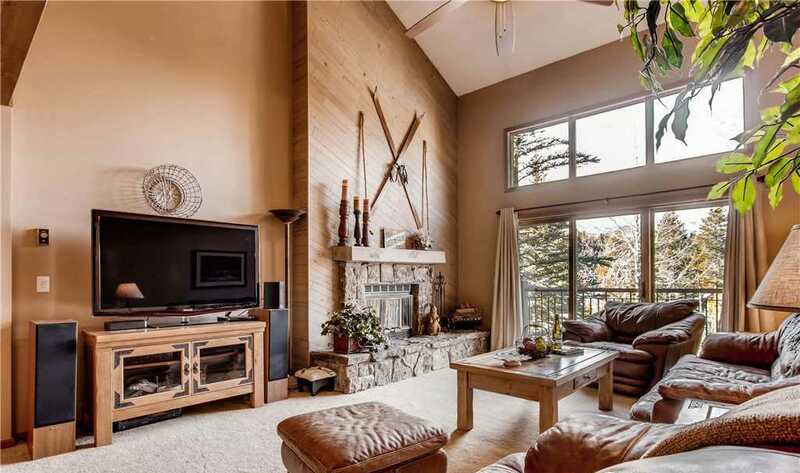 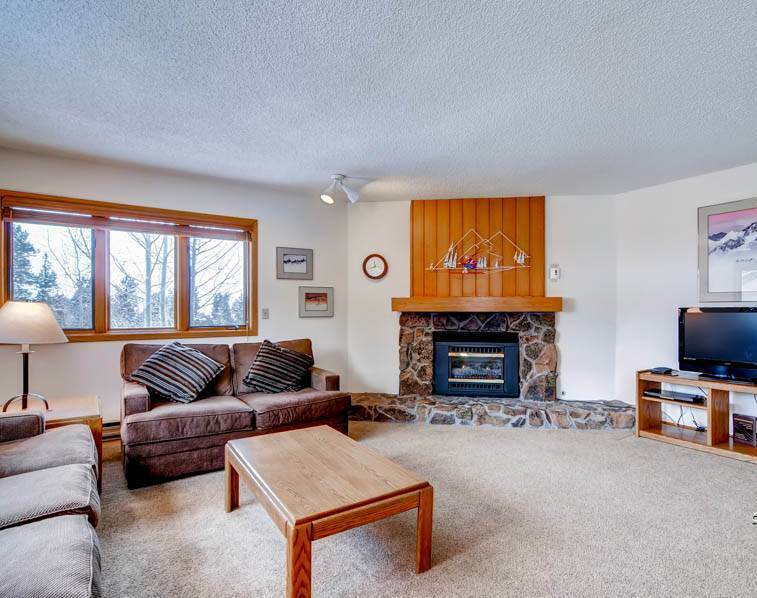 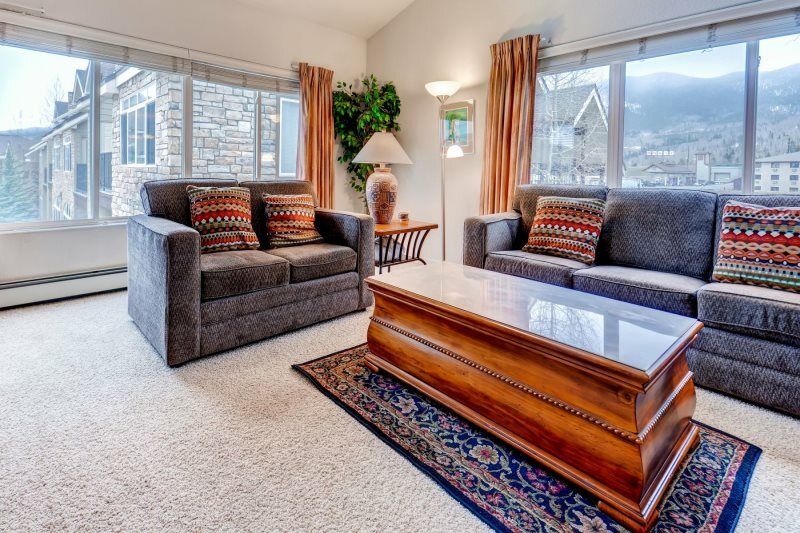 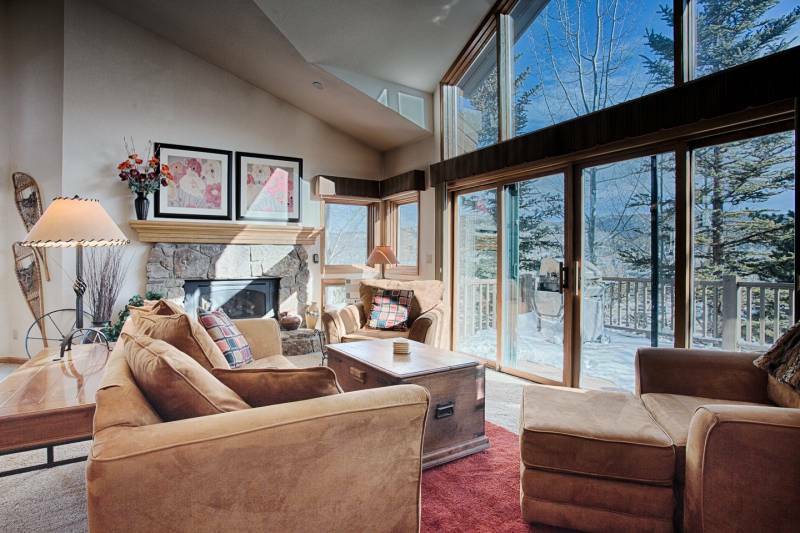 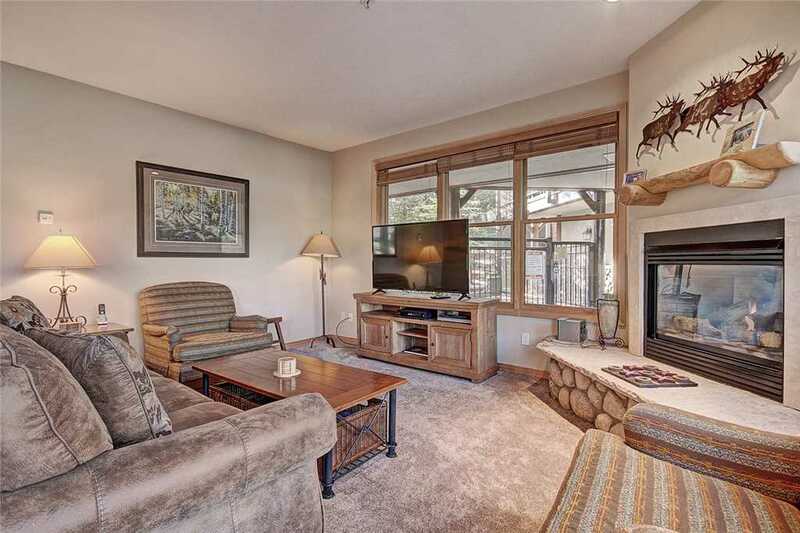 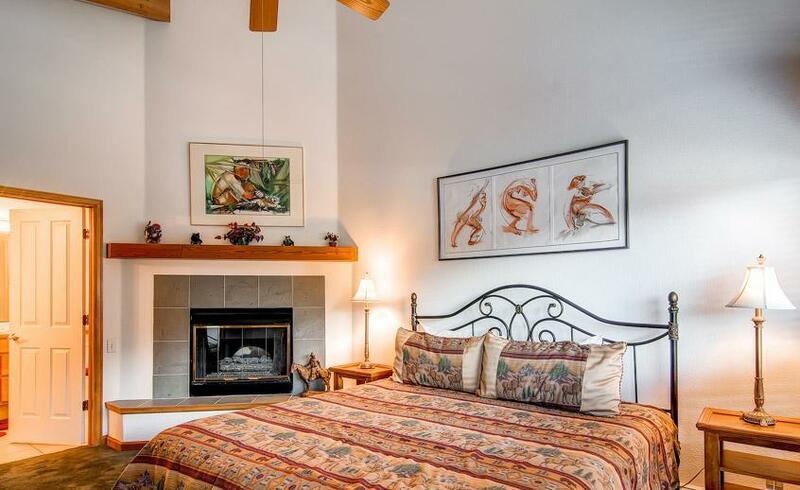 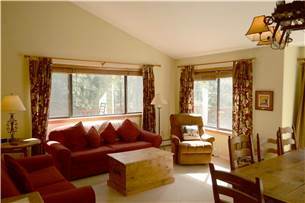 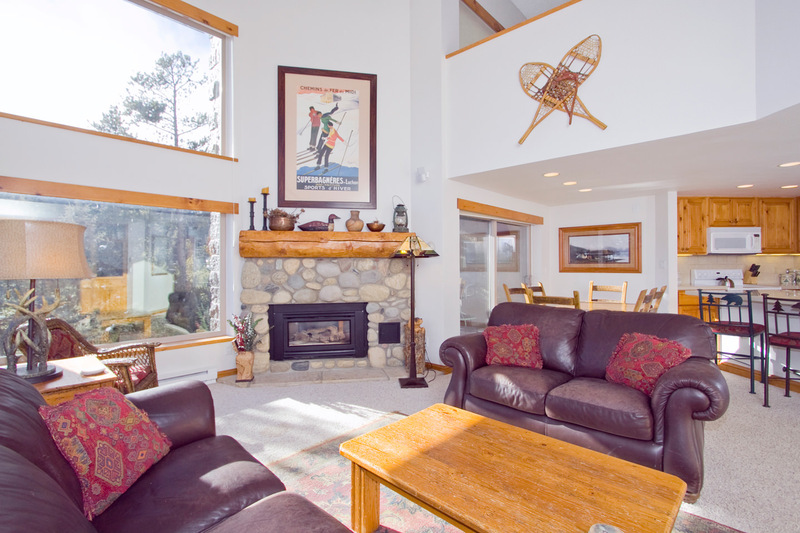 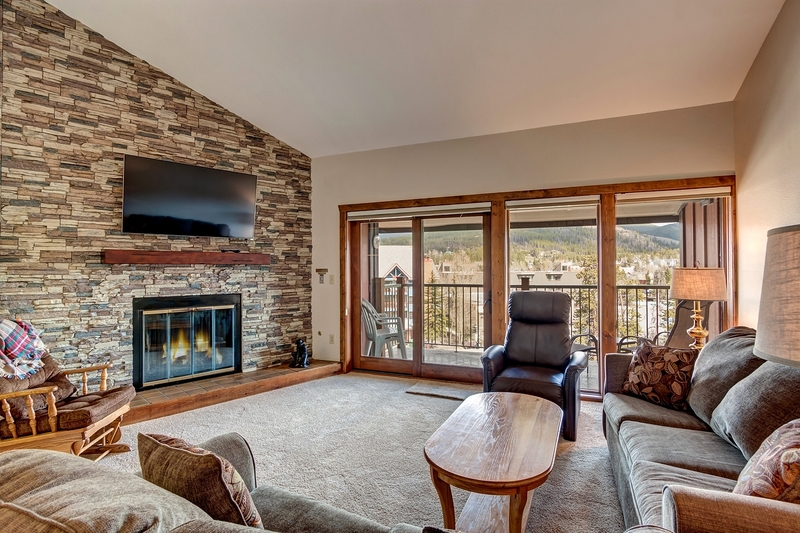 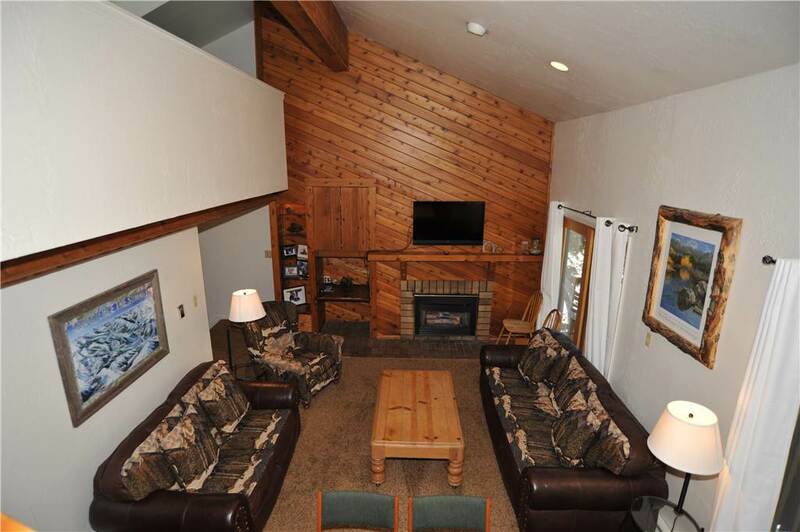 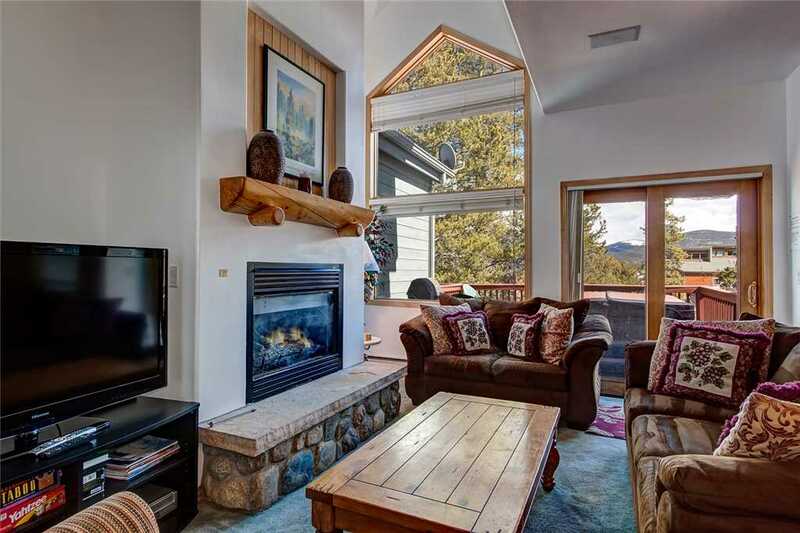 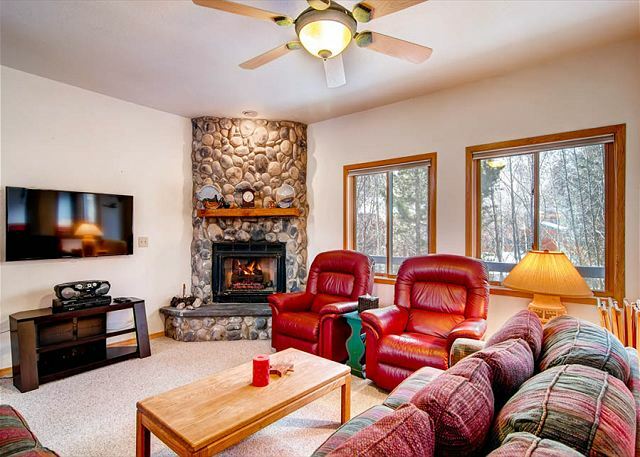 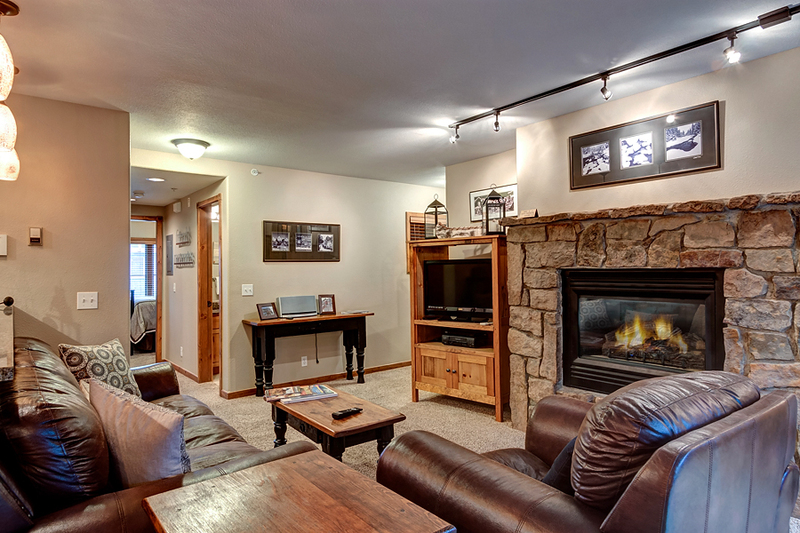 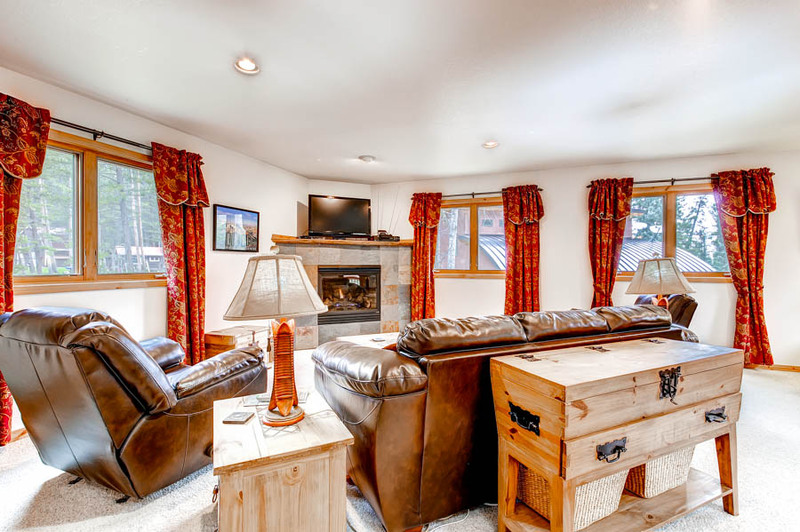 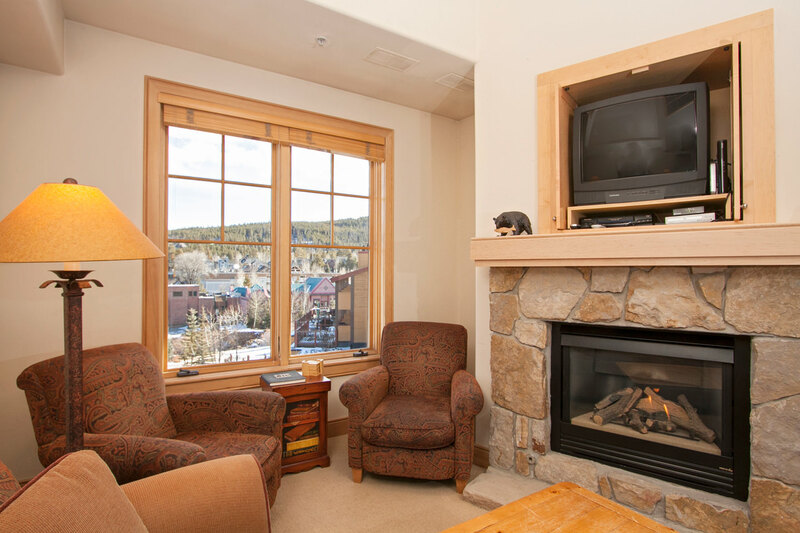 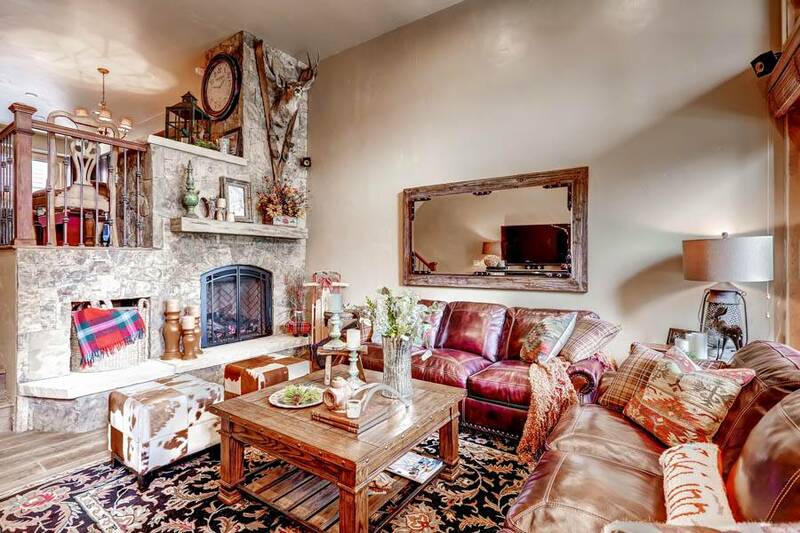 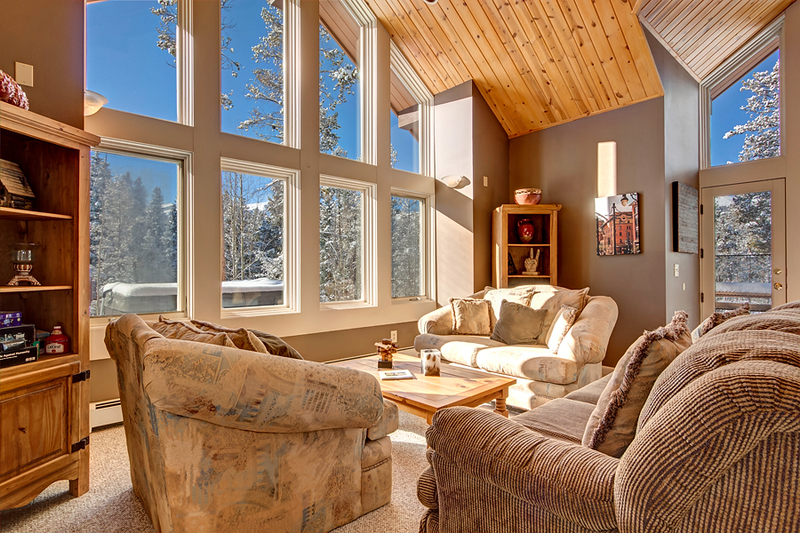 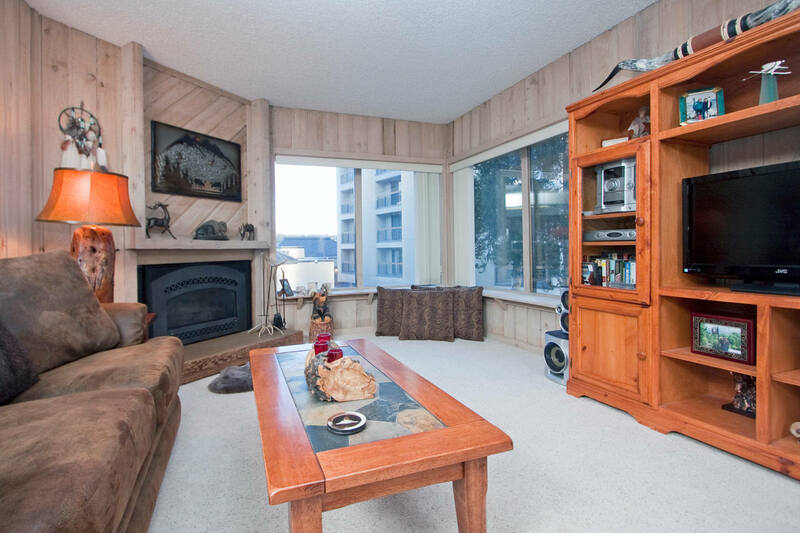 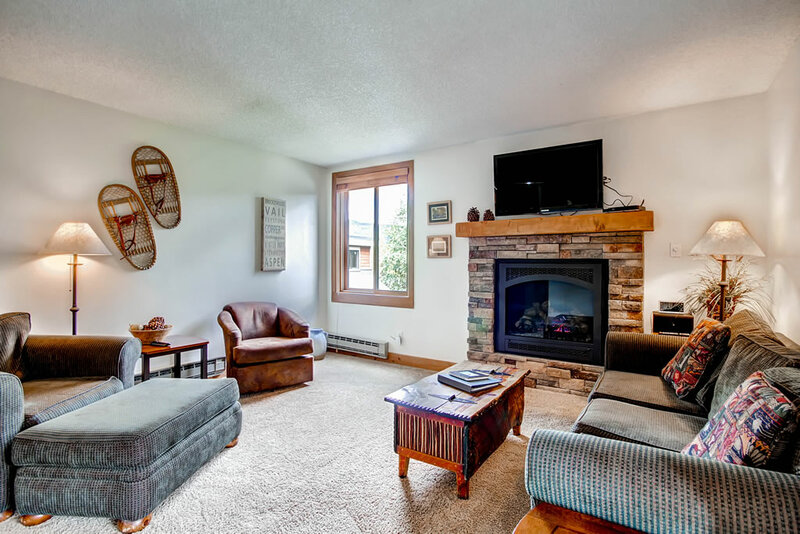 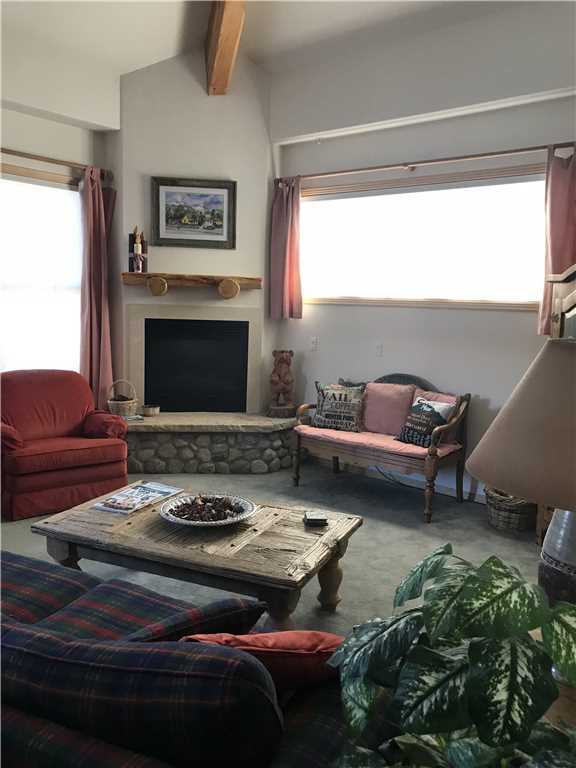 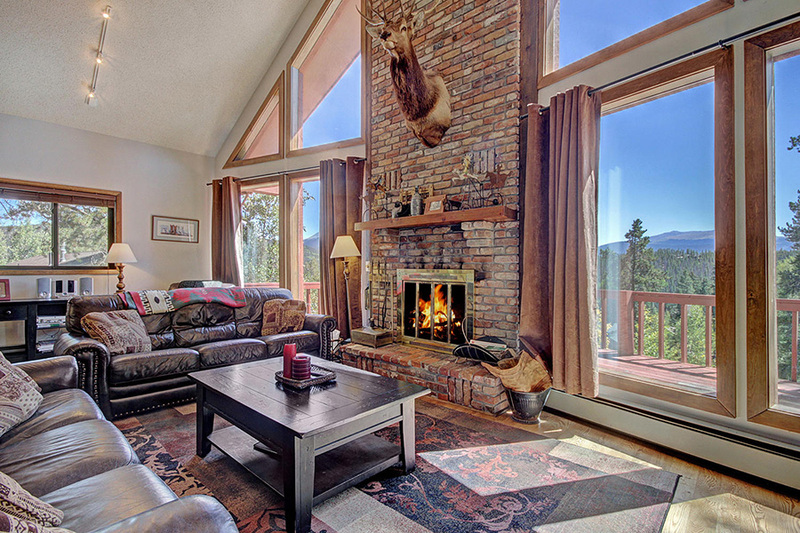 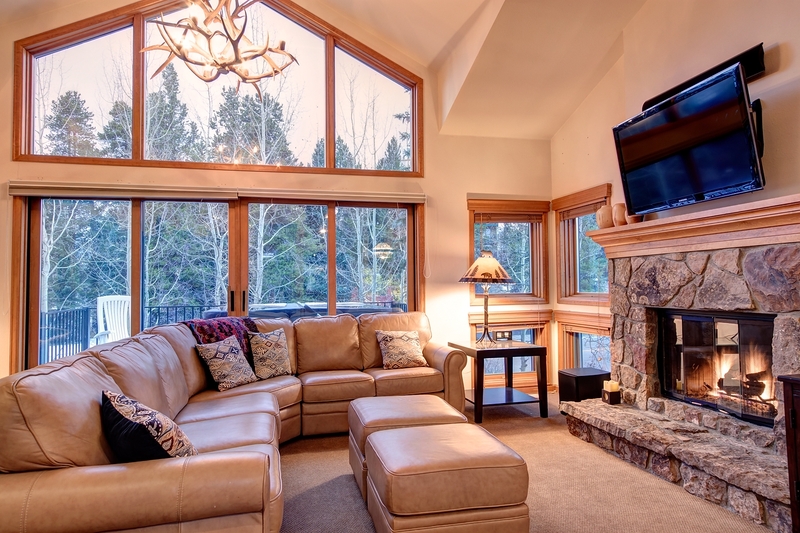 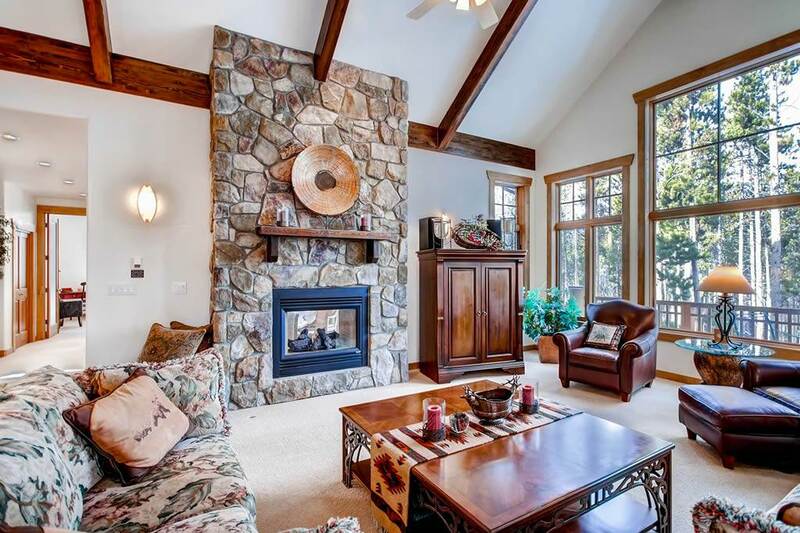 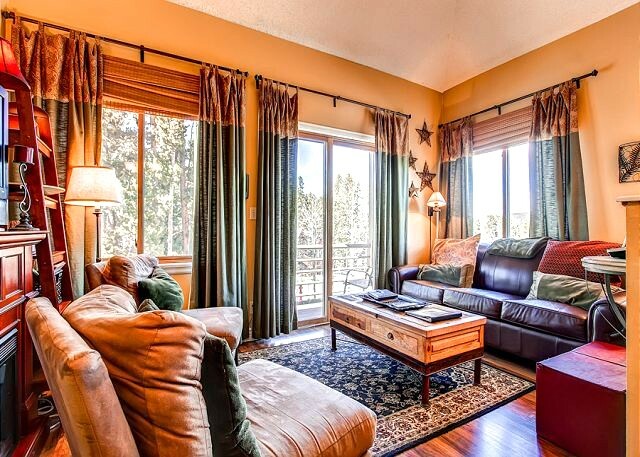 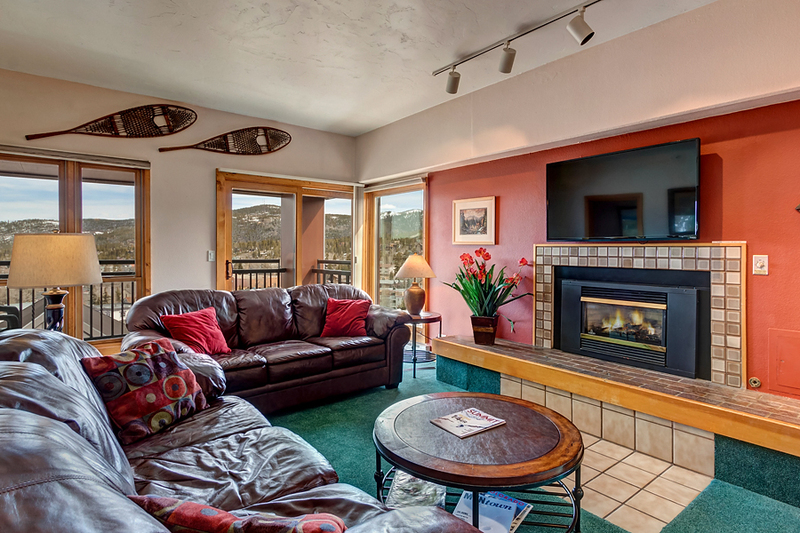 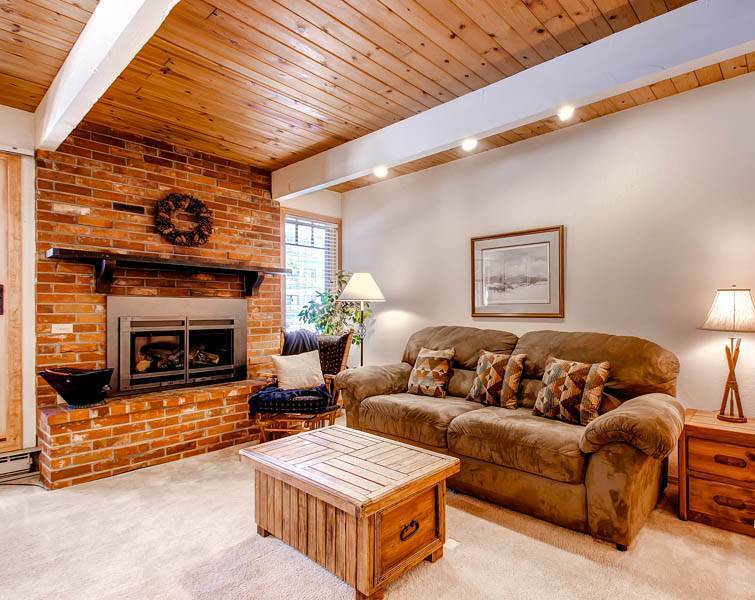 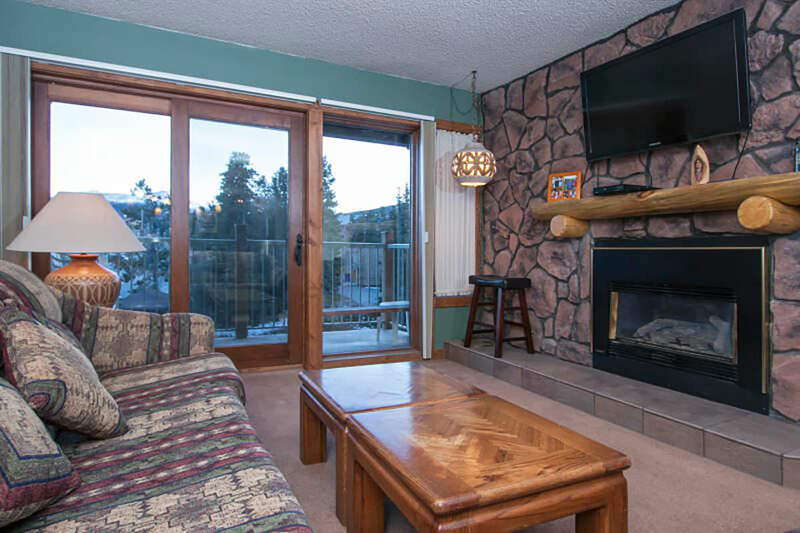 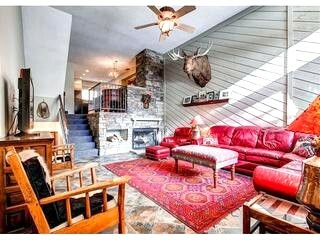 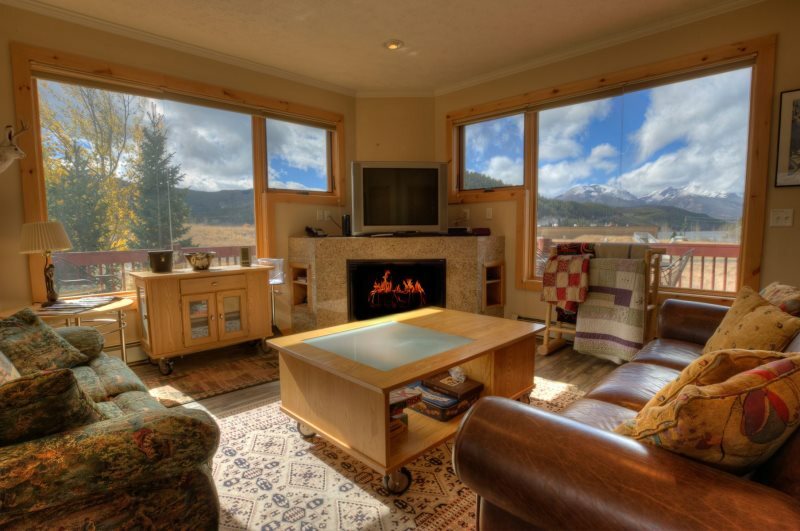 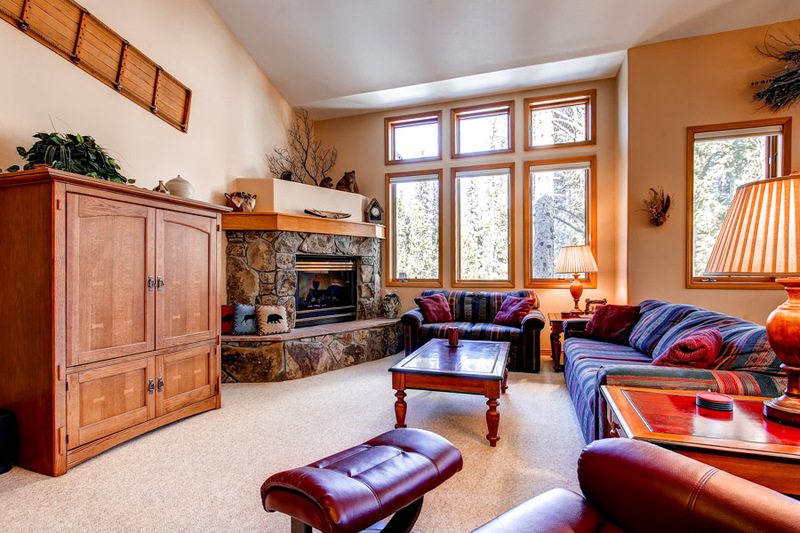 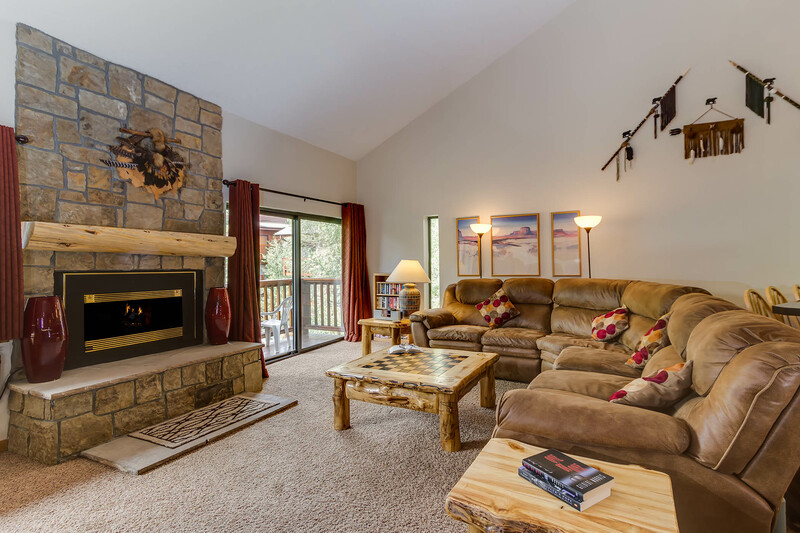 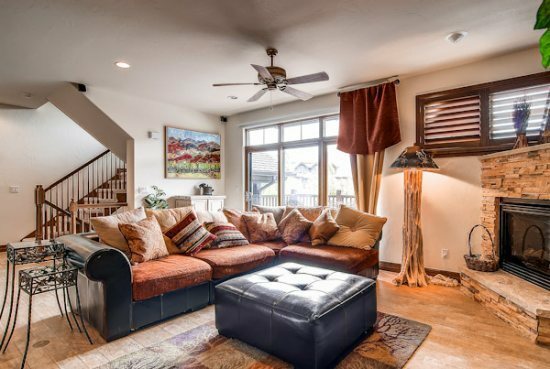 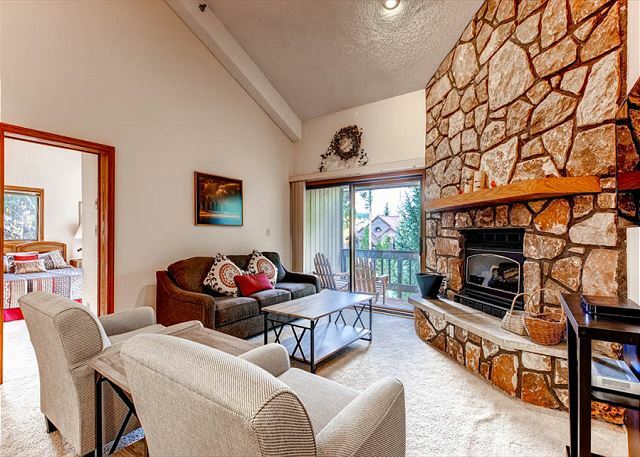 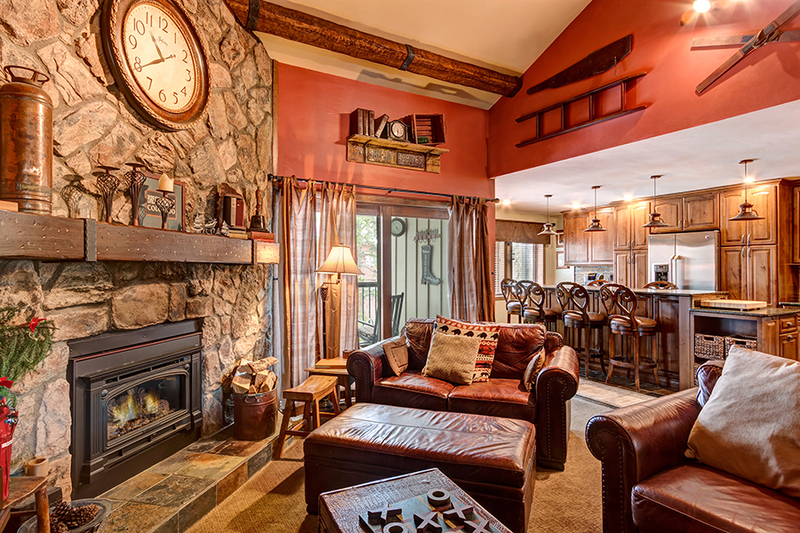 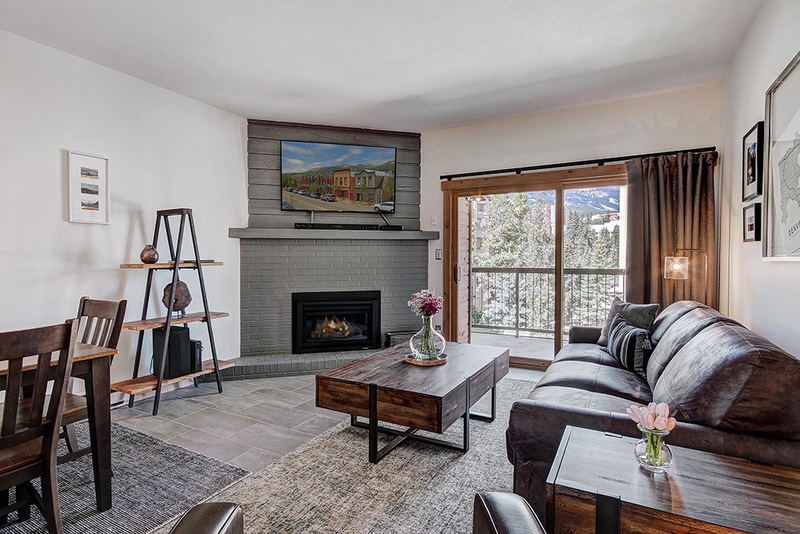 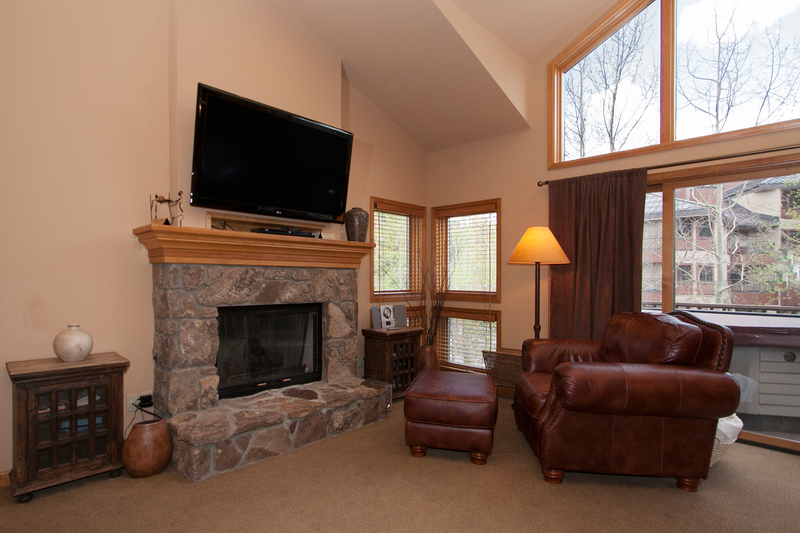 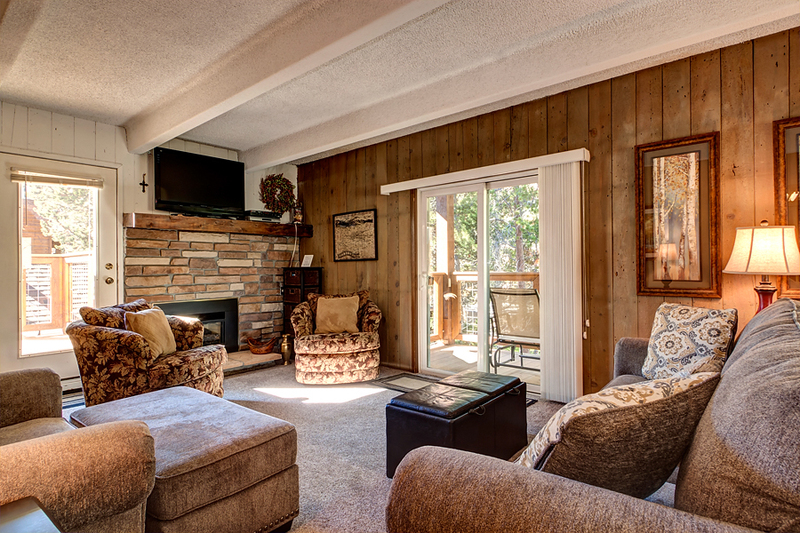 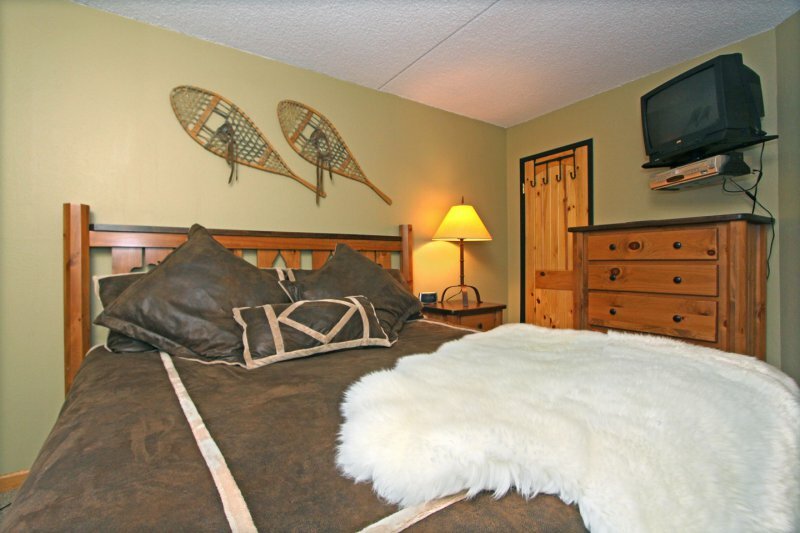 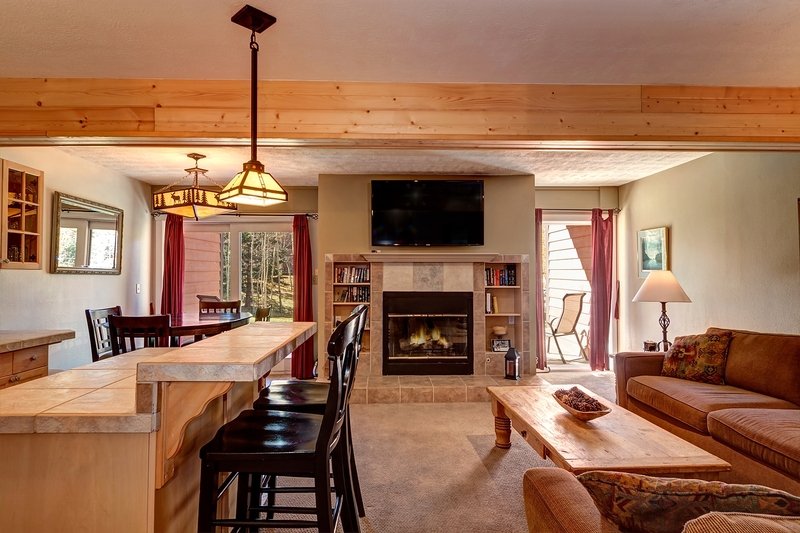 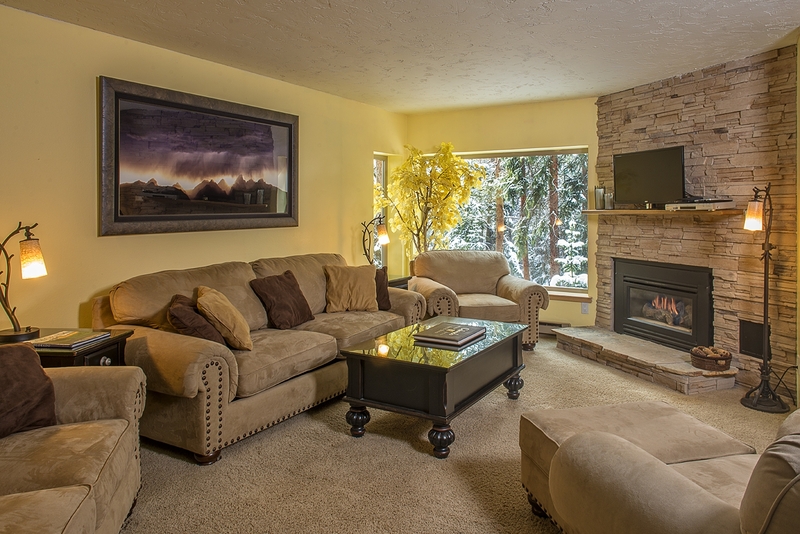 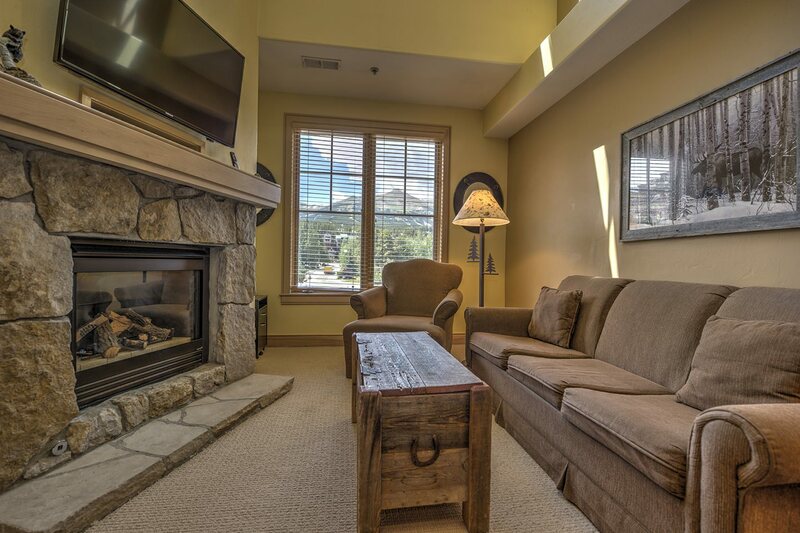 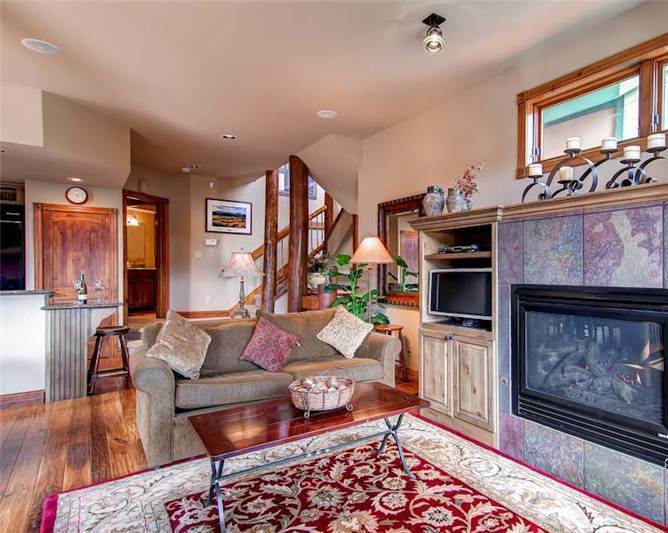 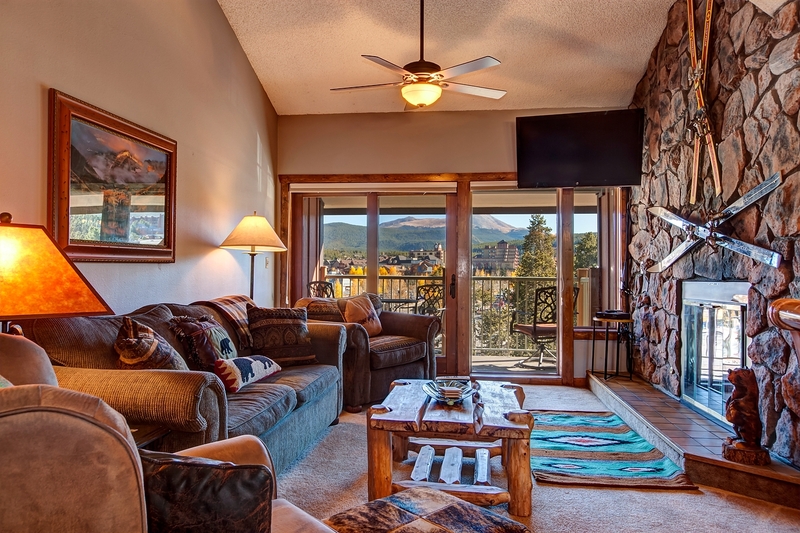 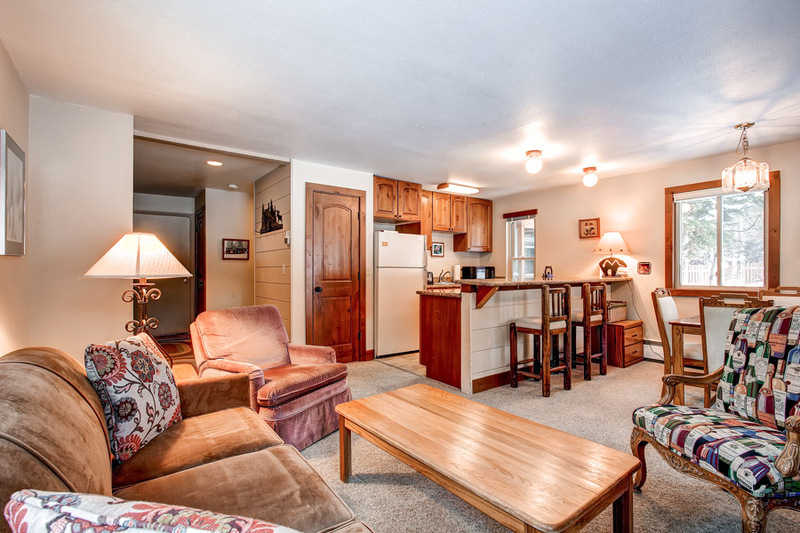 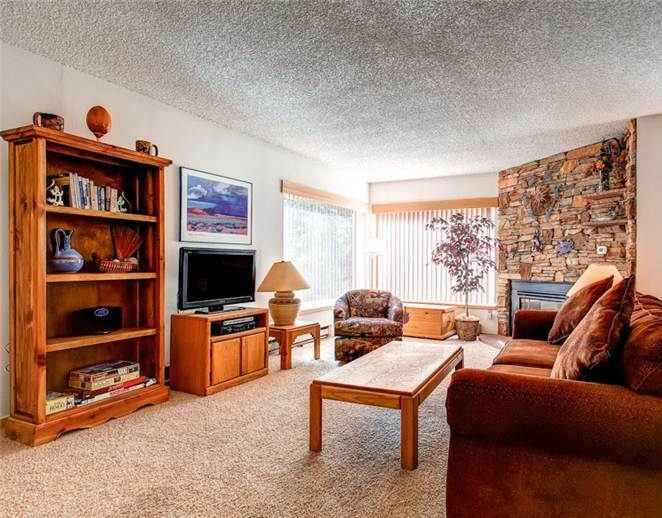 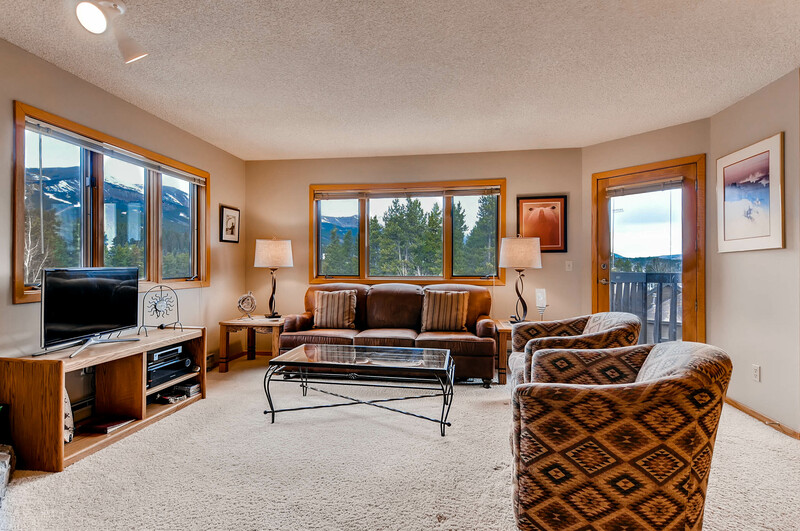 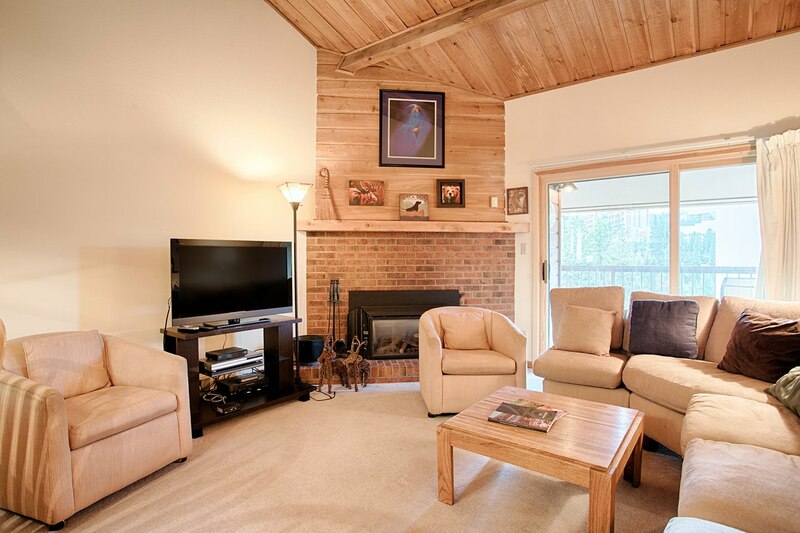 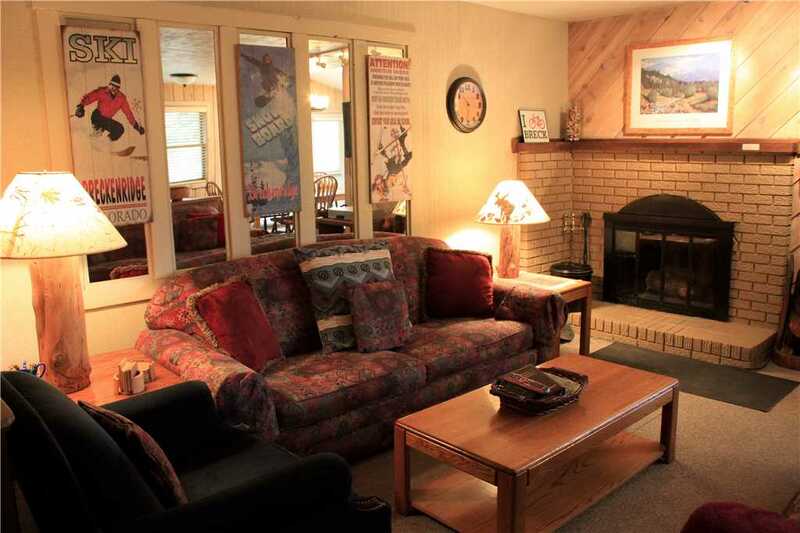 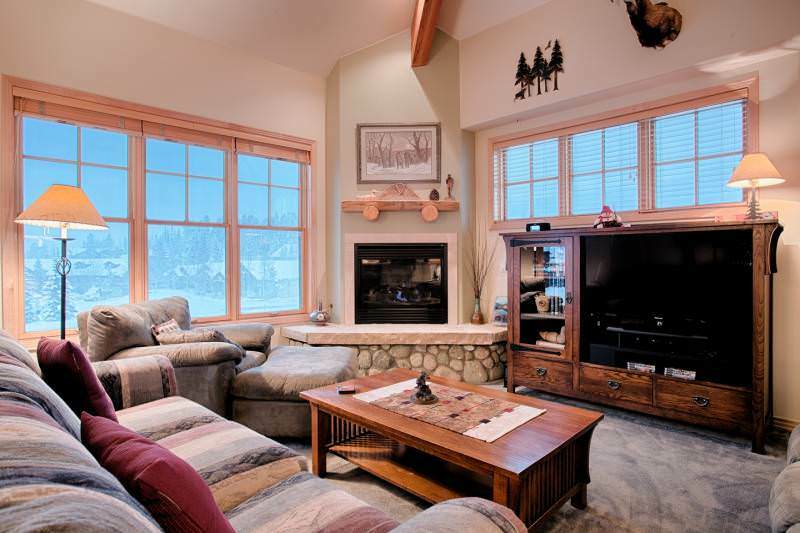 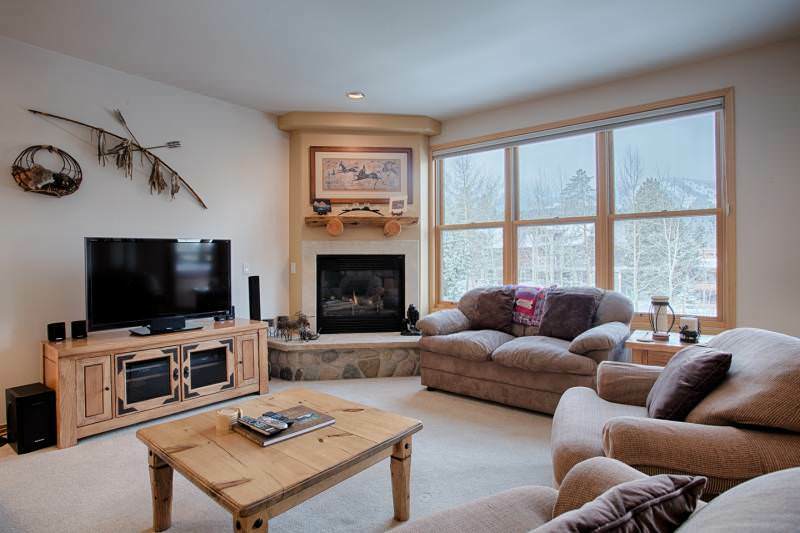 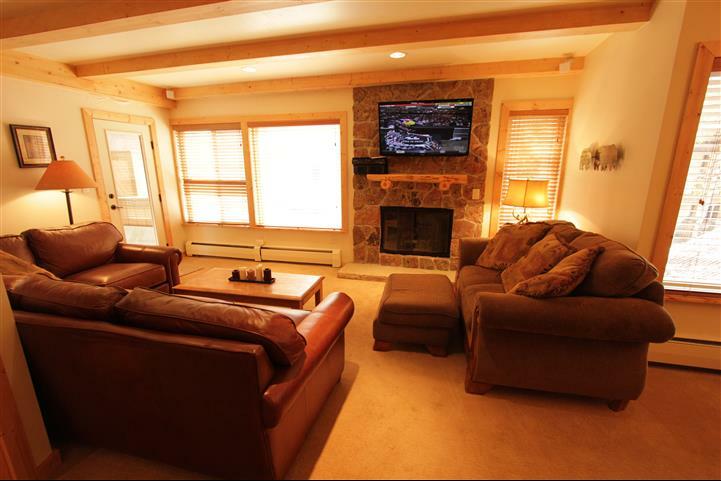 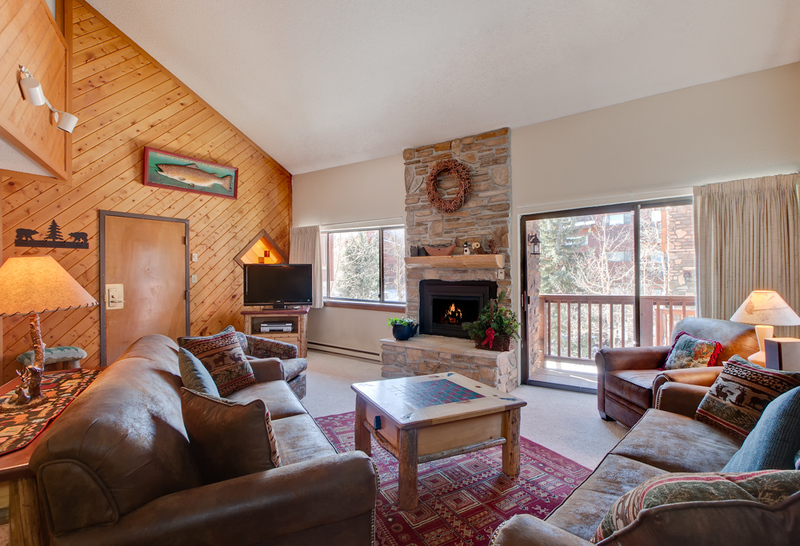 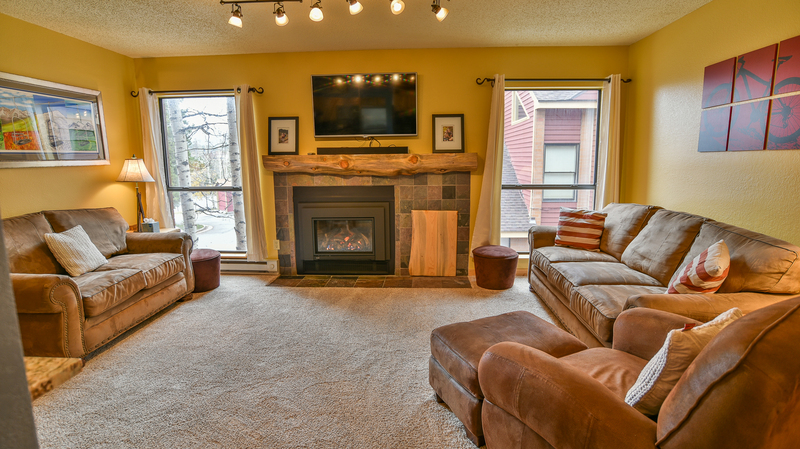 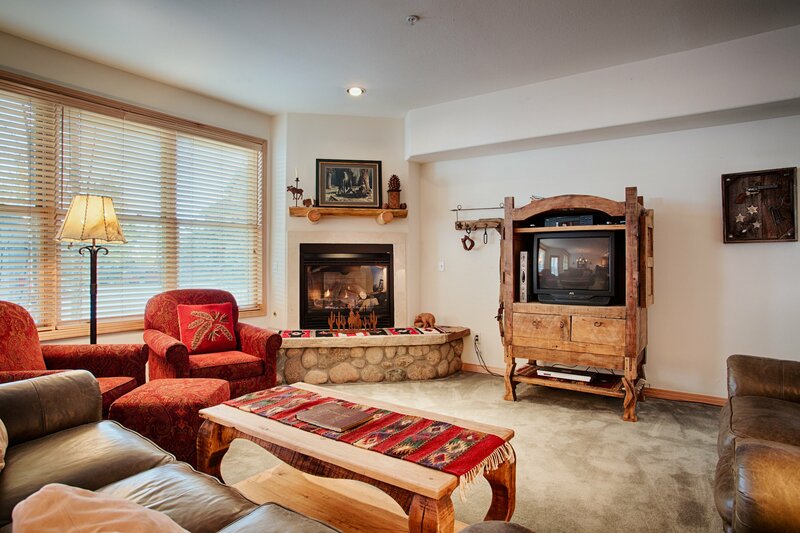 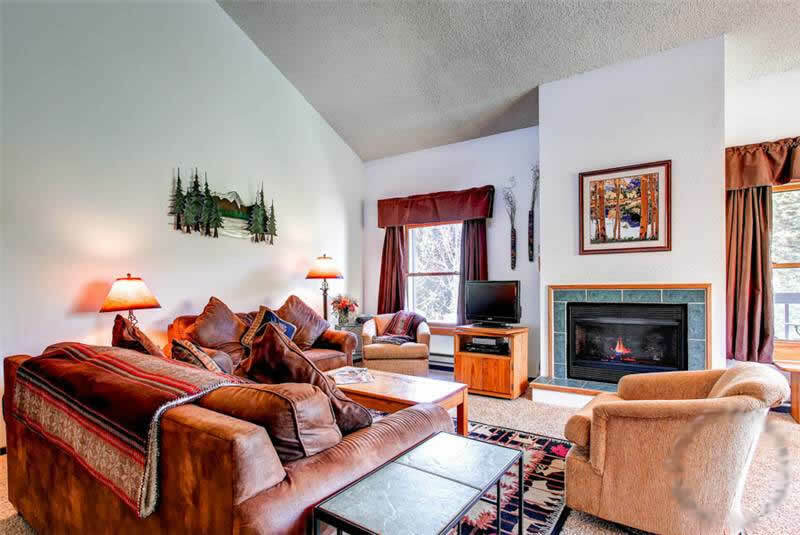 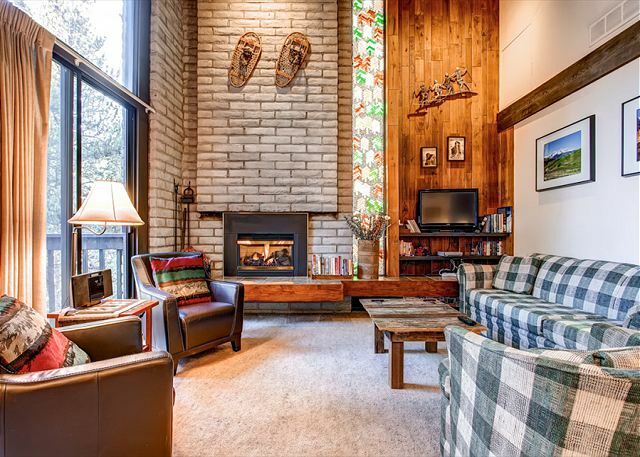 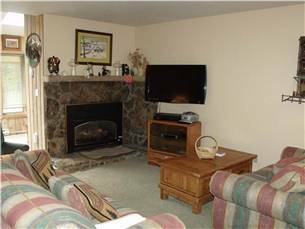 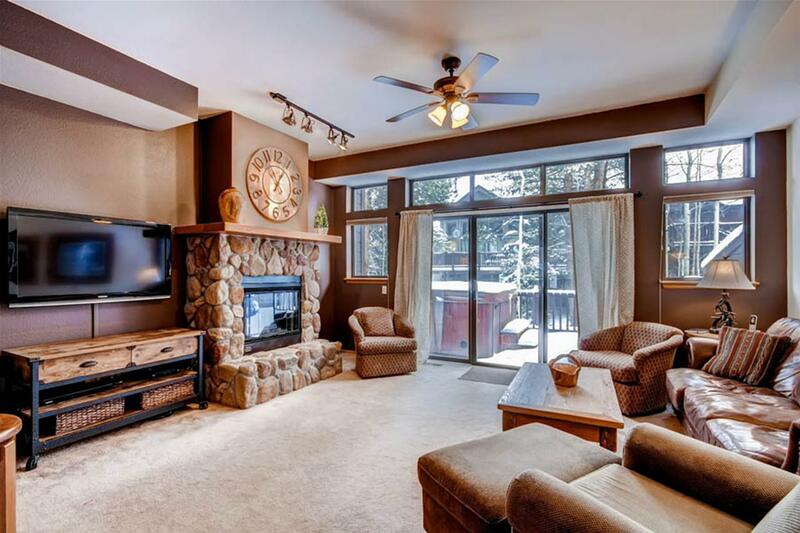 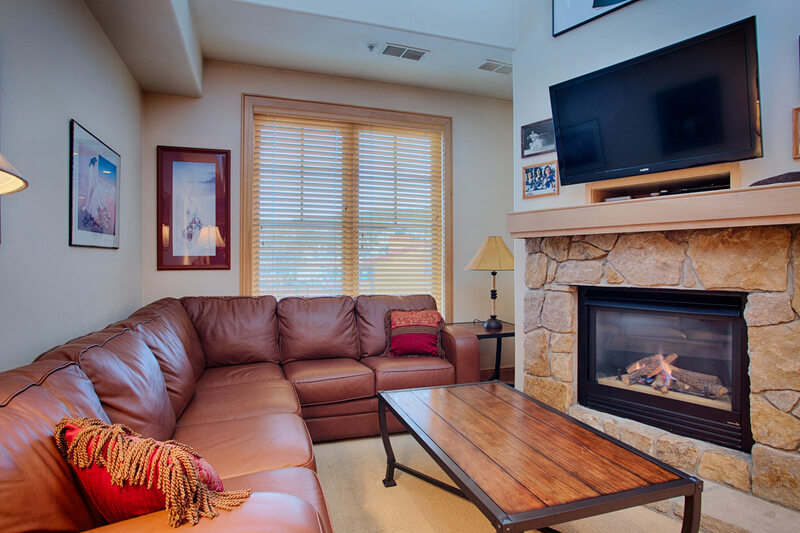 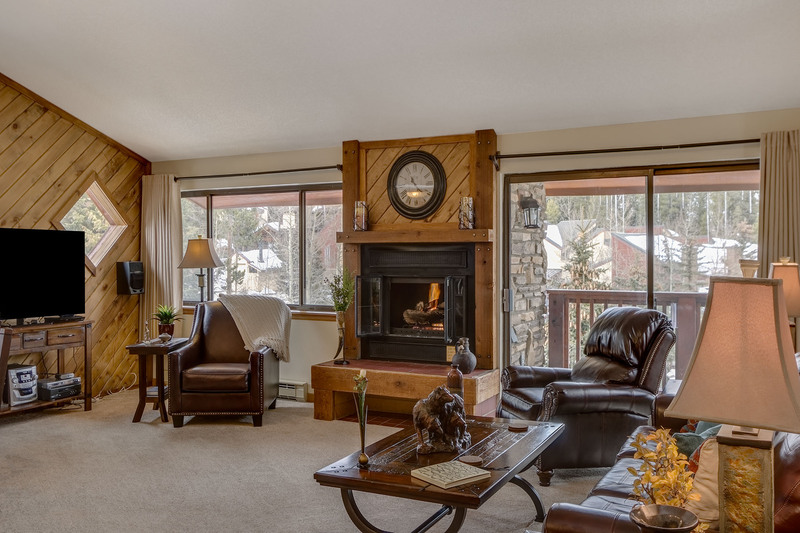 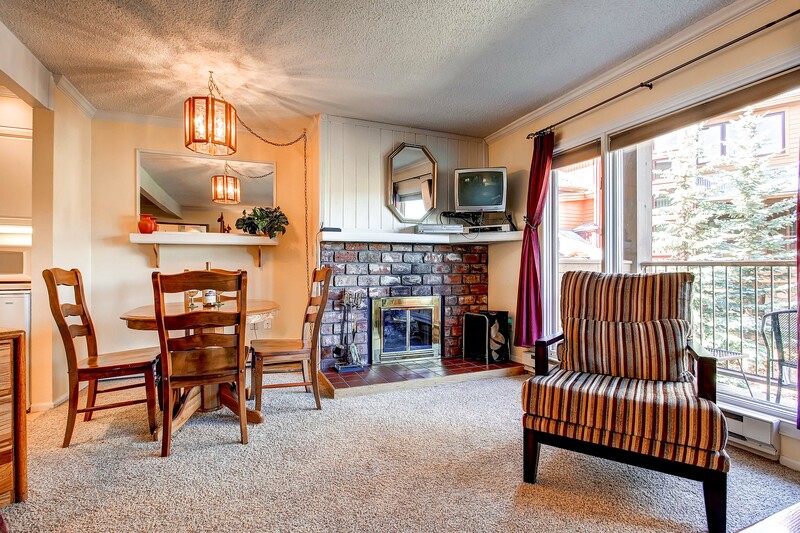 If you’d rather enjoy your vacation book then snuggle up with a cup of cocoa on the plush couch or love seat and relish in the ski slope views and fireplace warmth. 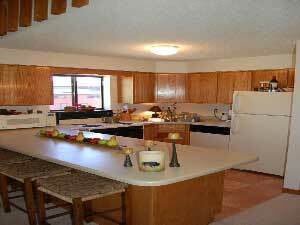 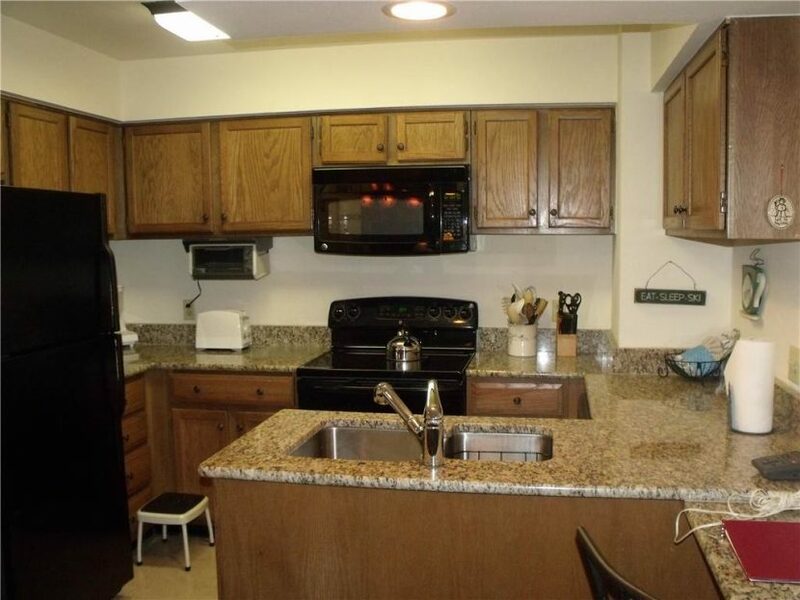 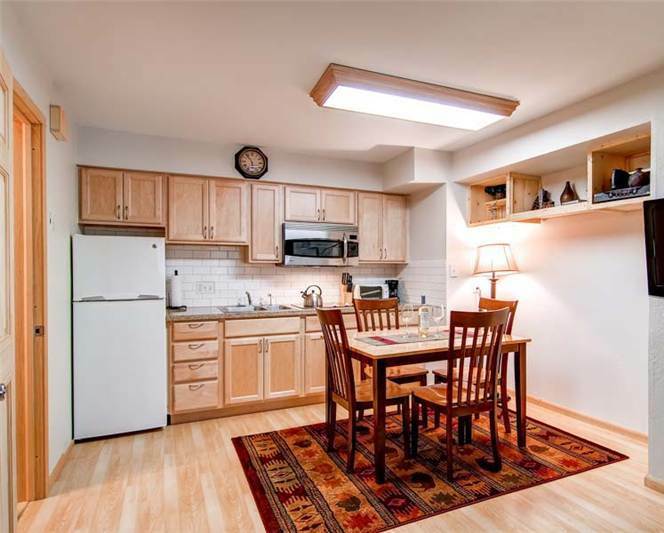 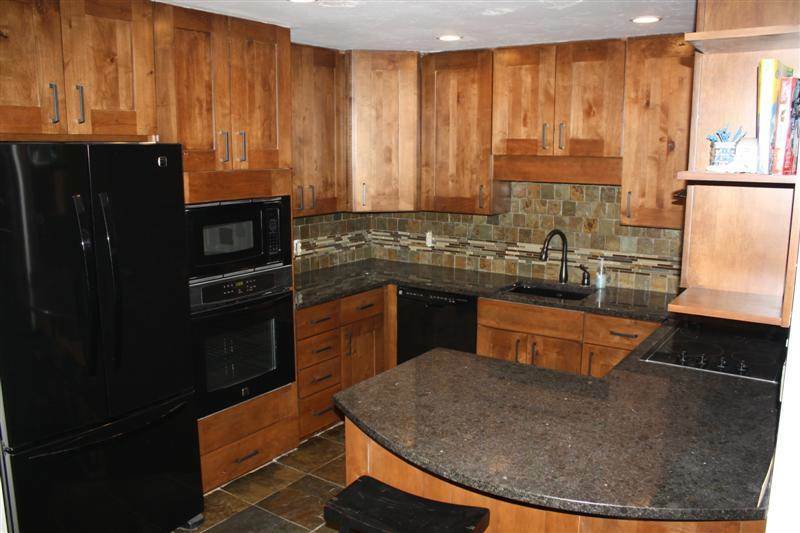 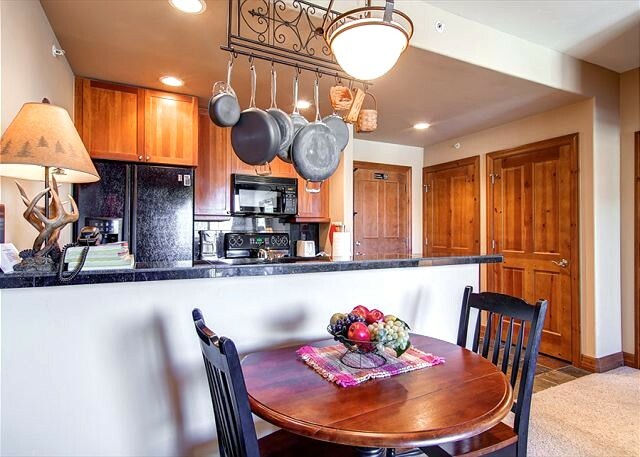 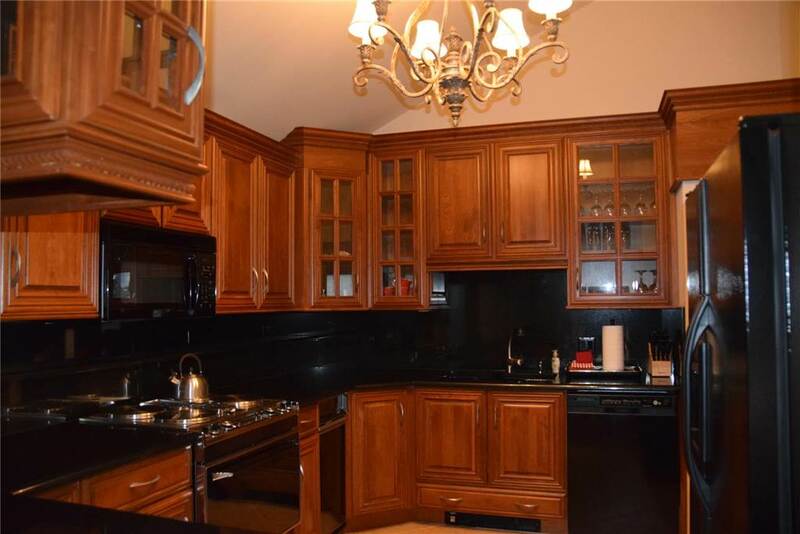 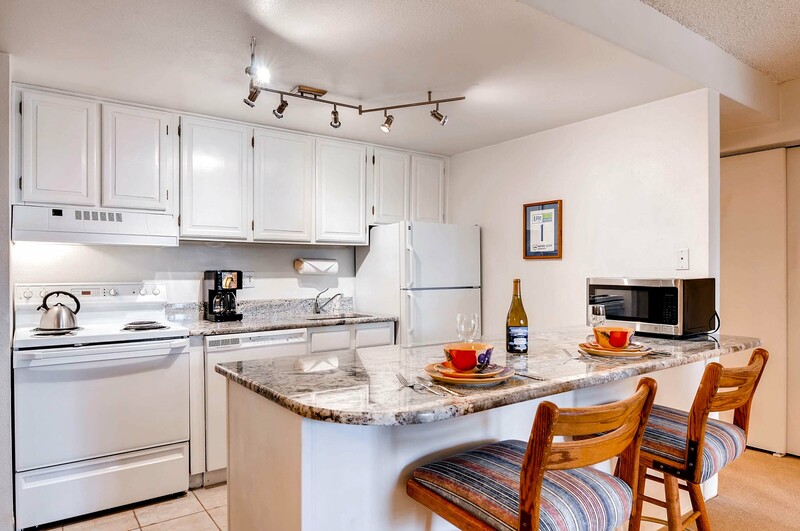 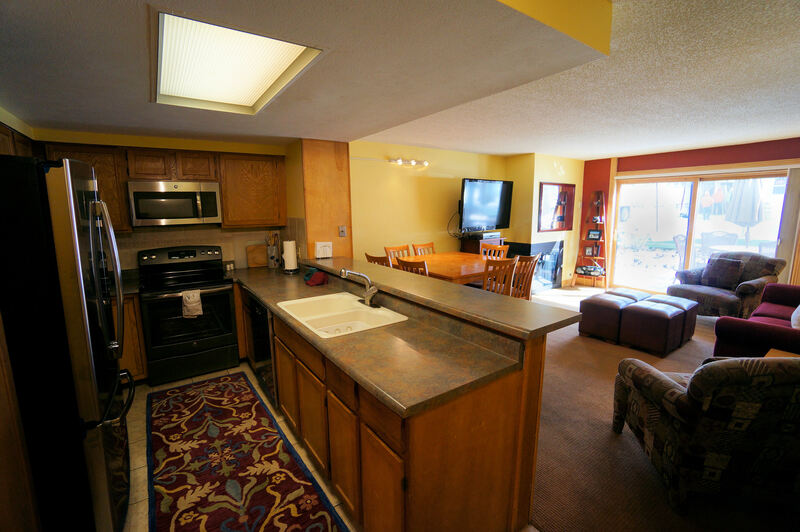 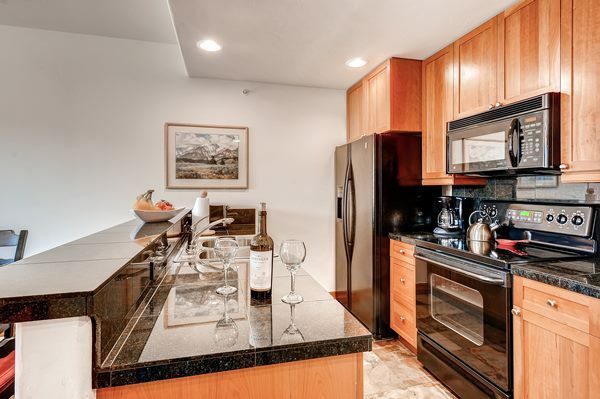 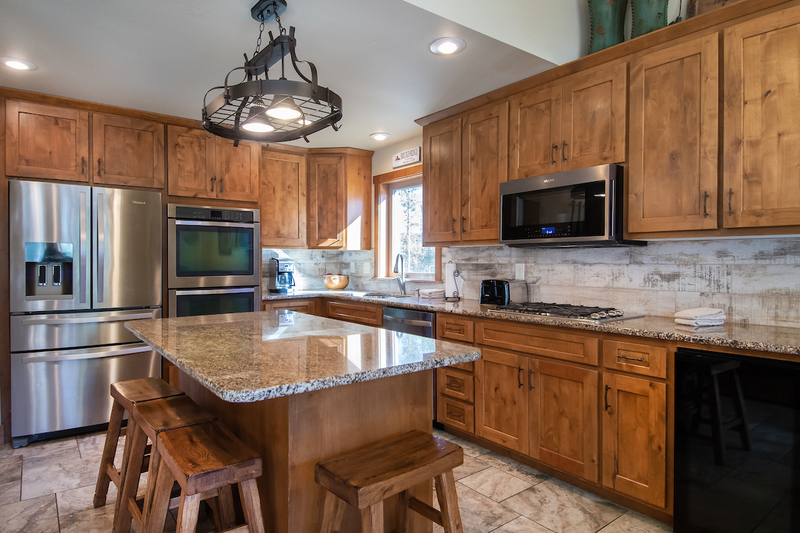 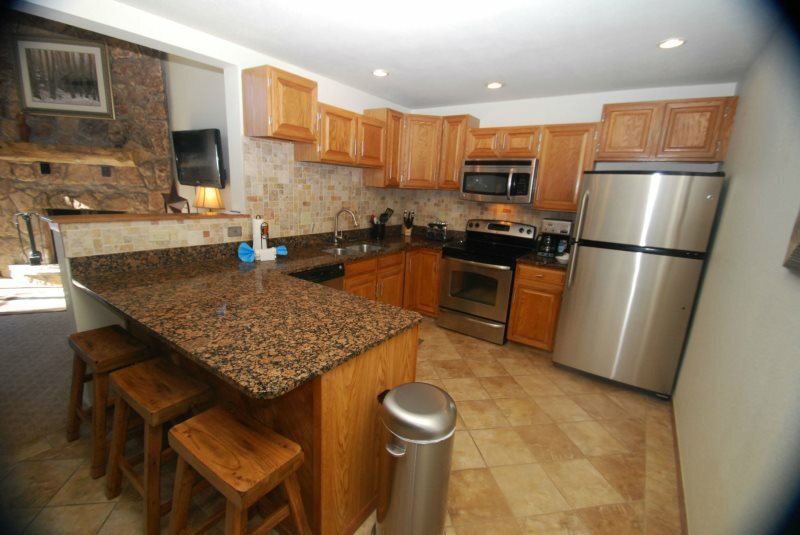 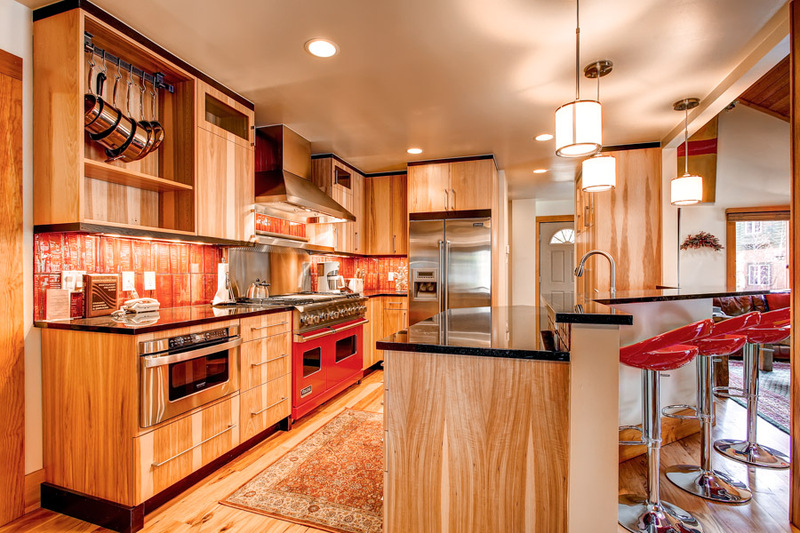 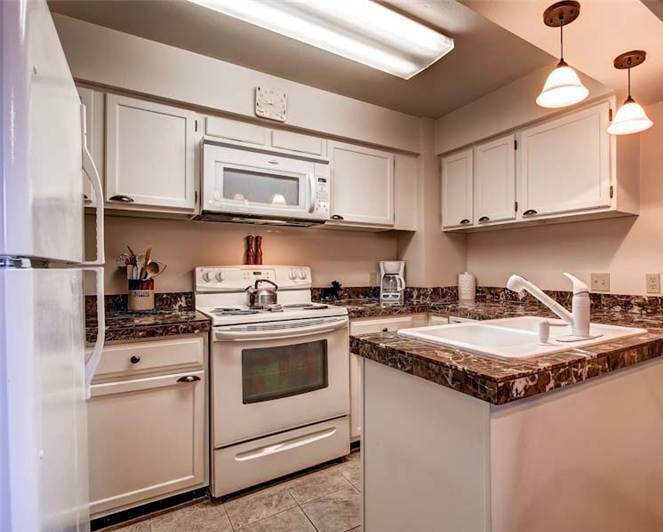 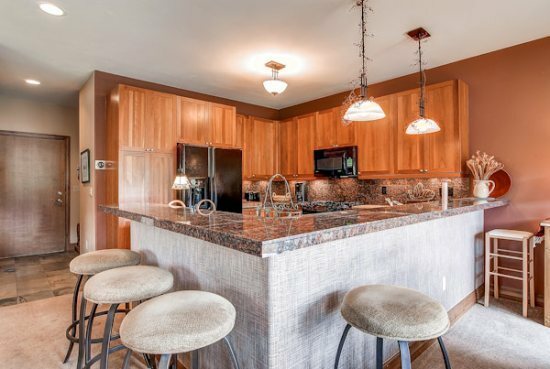 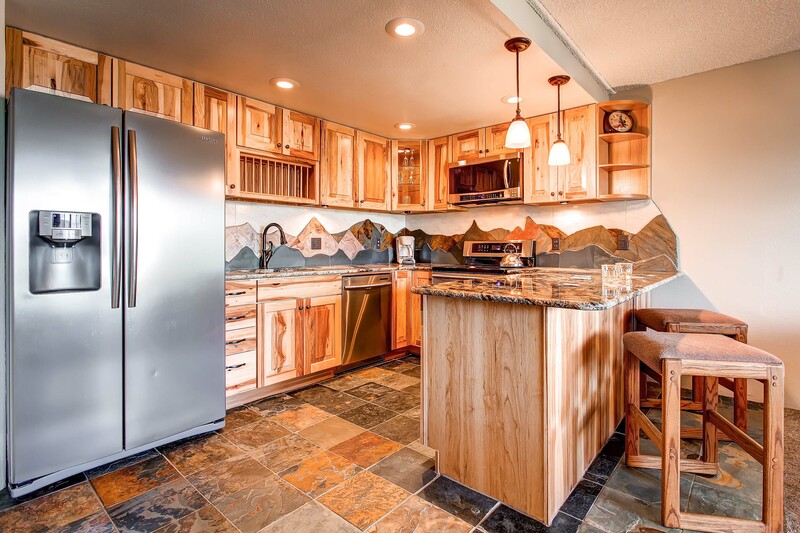 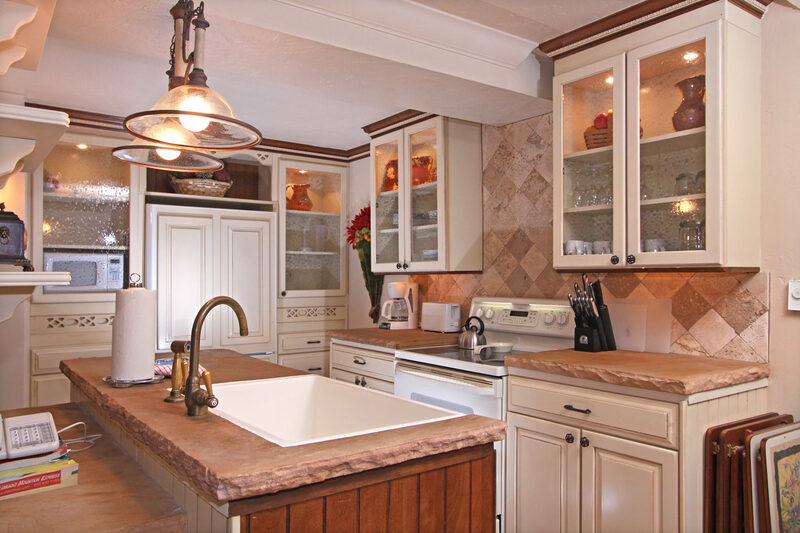 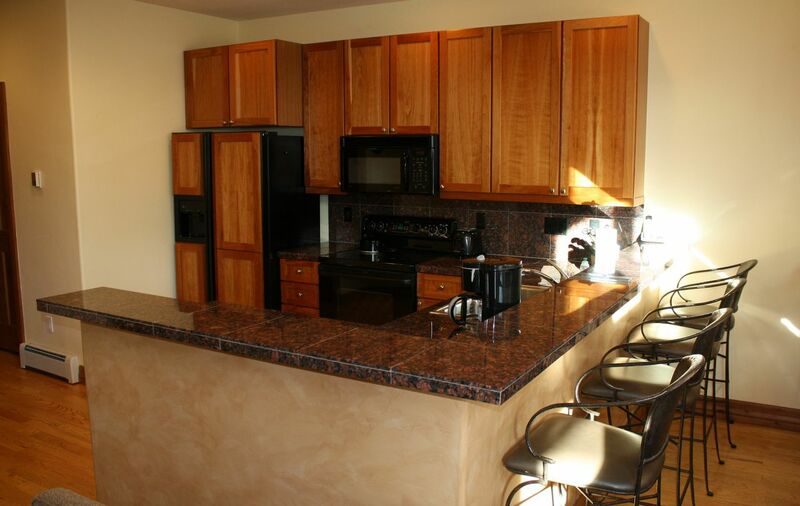 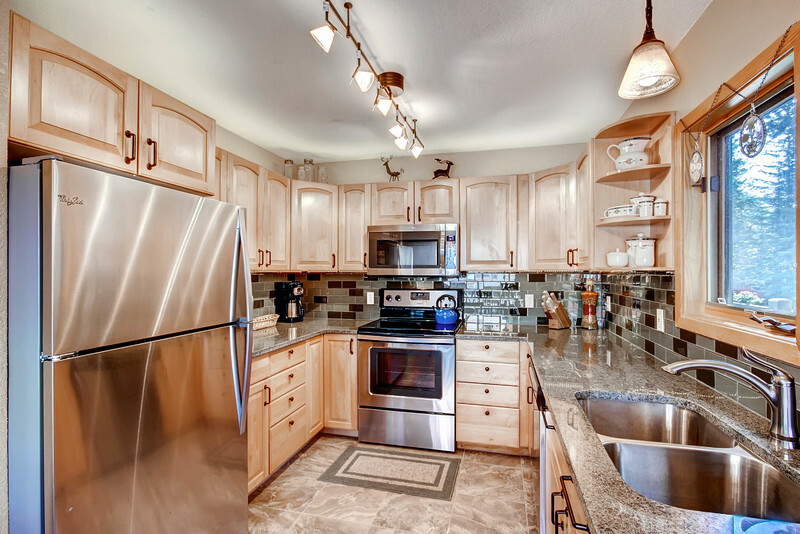 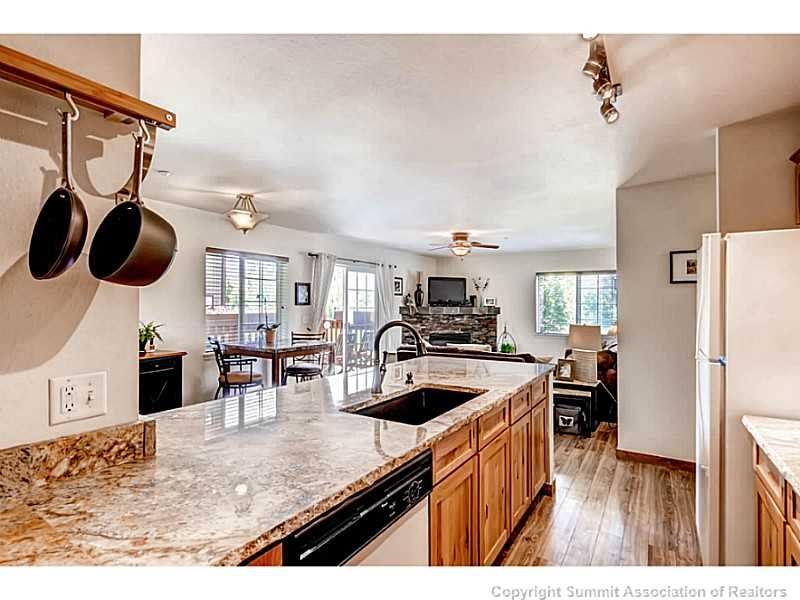 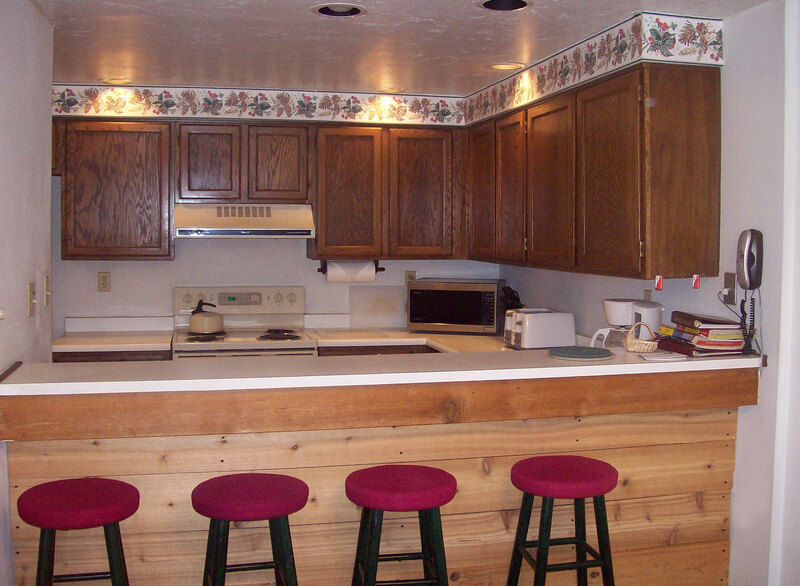 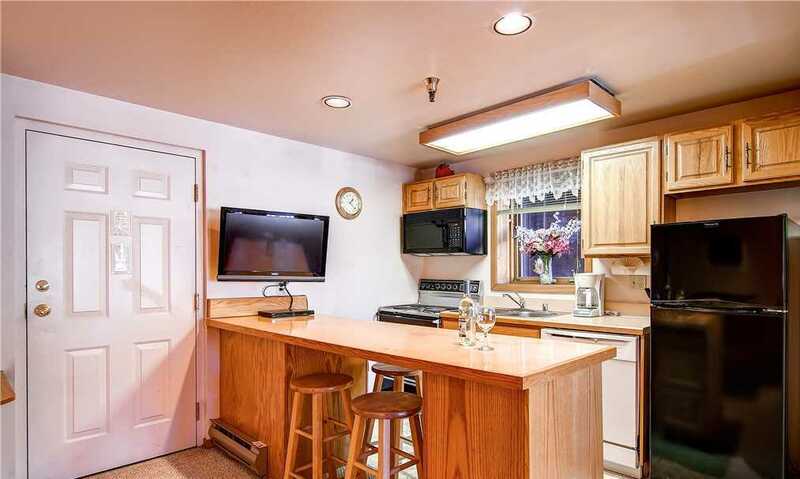 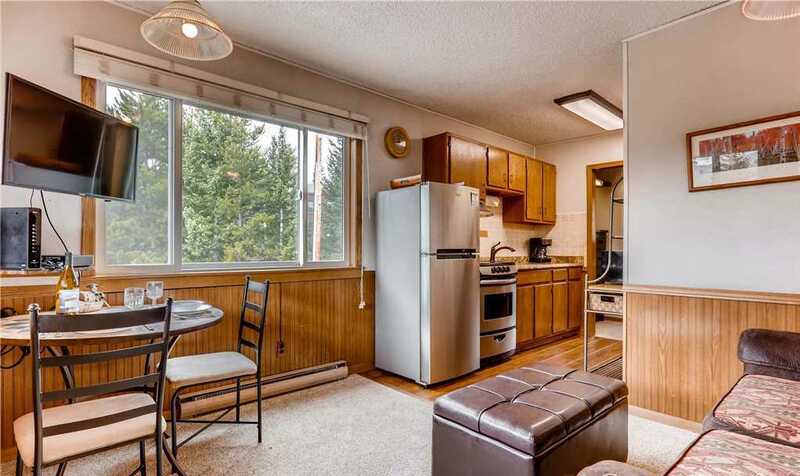 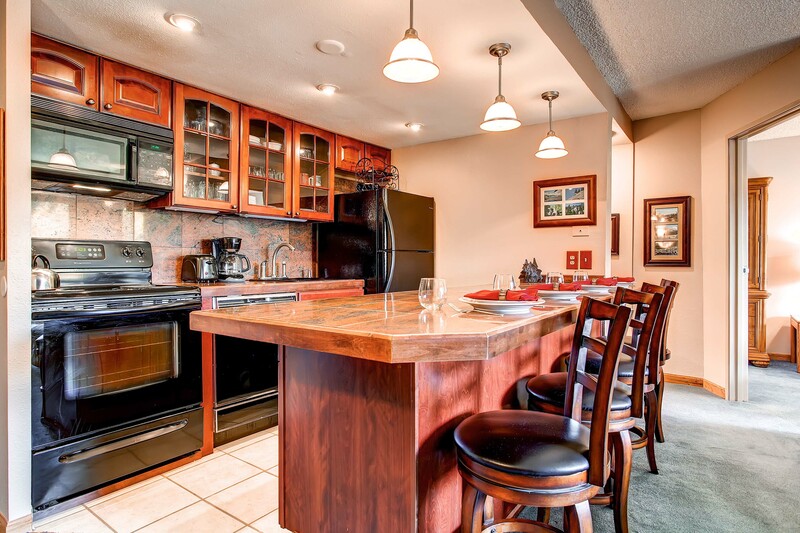 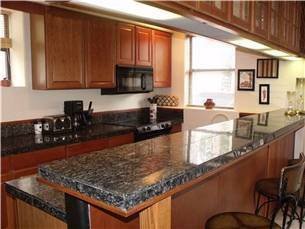 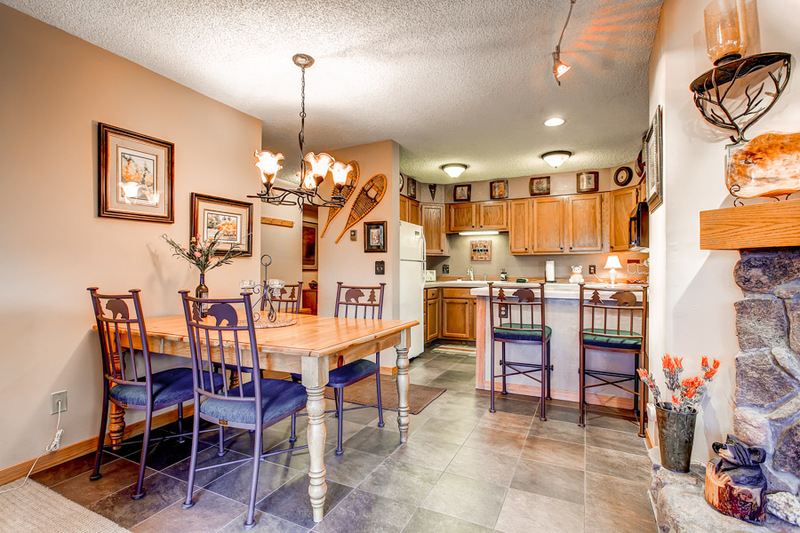 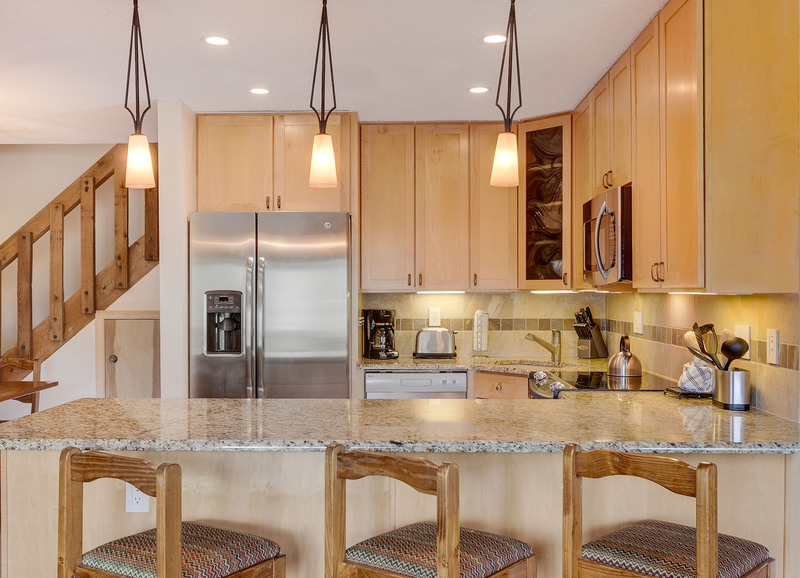 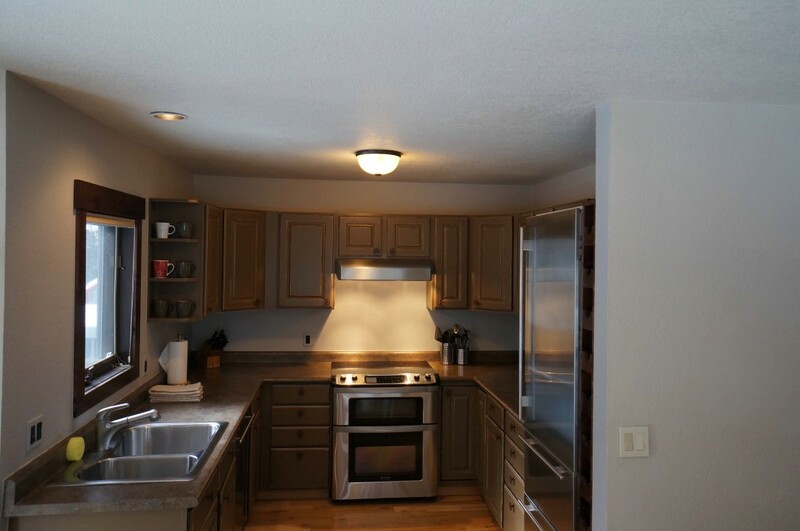 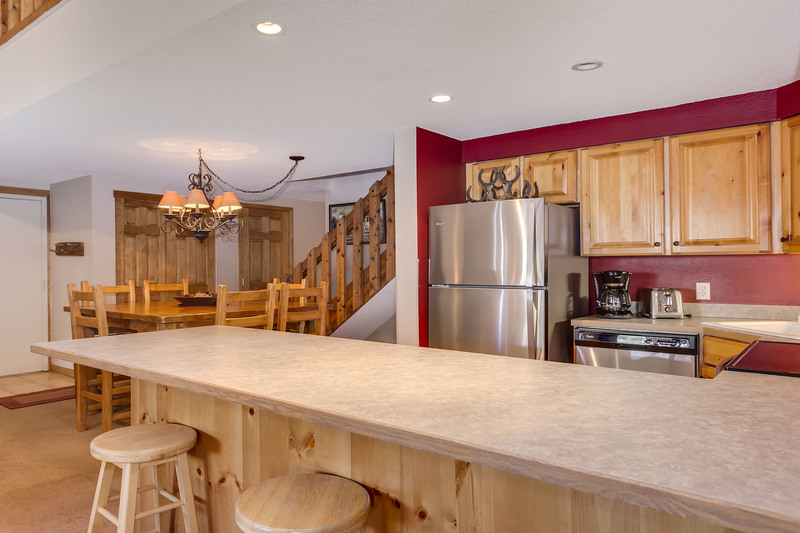 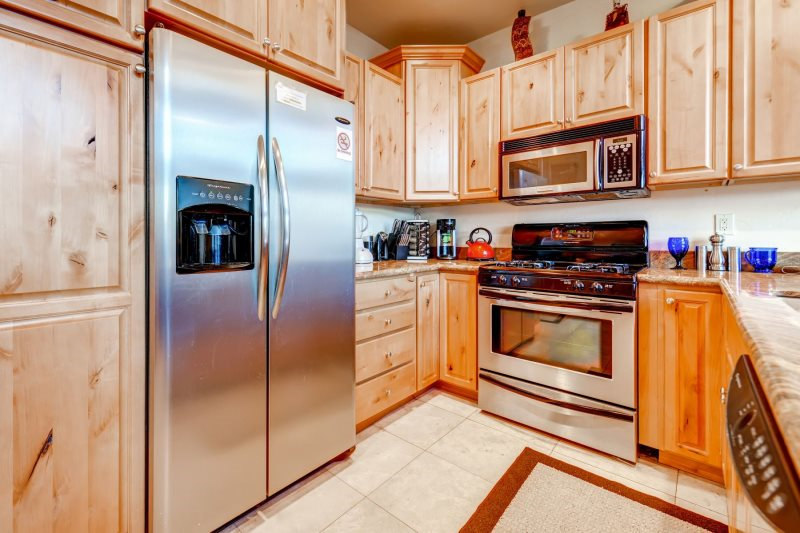 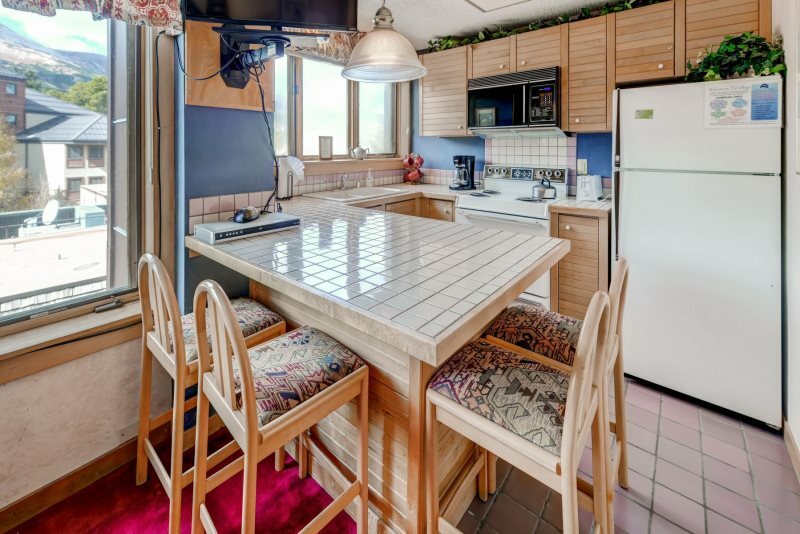 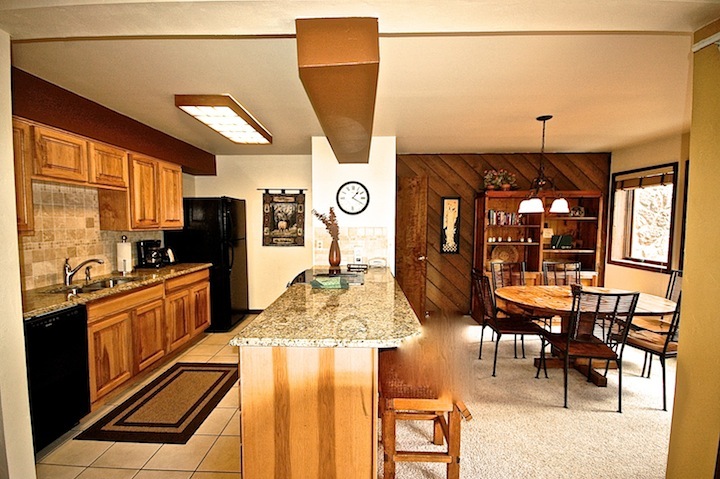 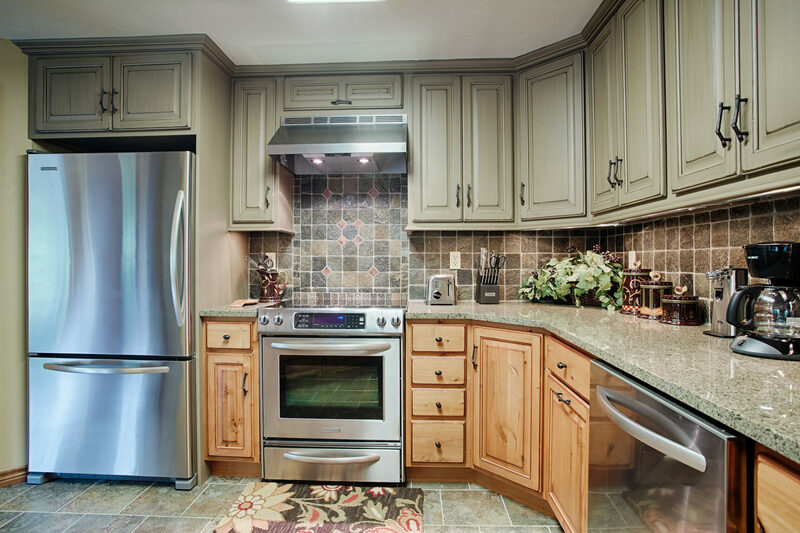 The suitably stocked, gourmet kitchen has granite countertops, a butcher block bar with seating for four people and all the necessary appliances; microwave, oven, refrigerator, stove, coffee maker and so much more! 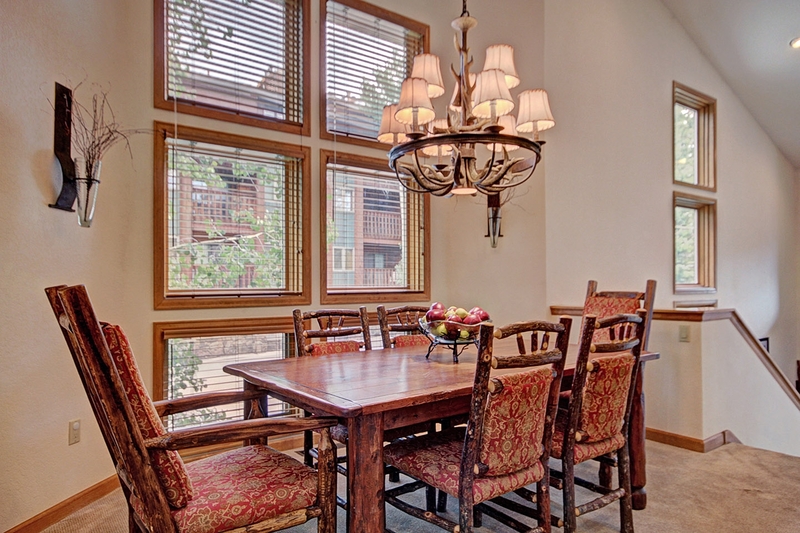 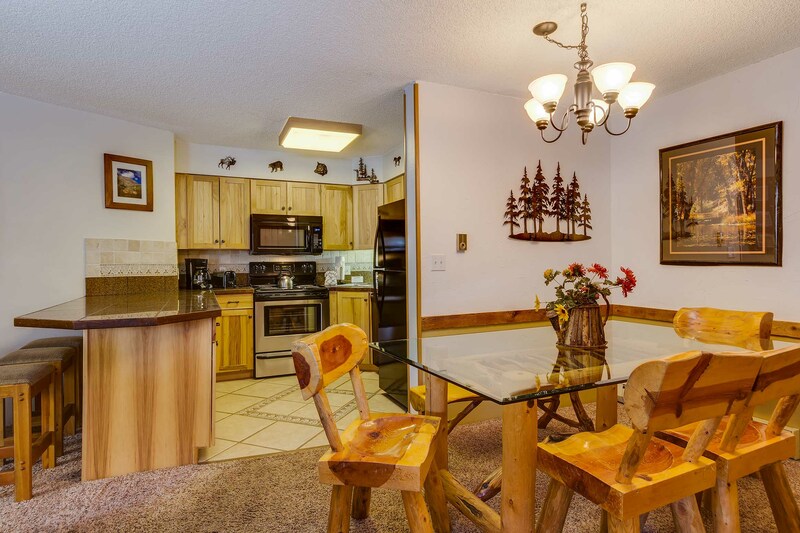 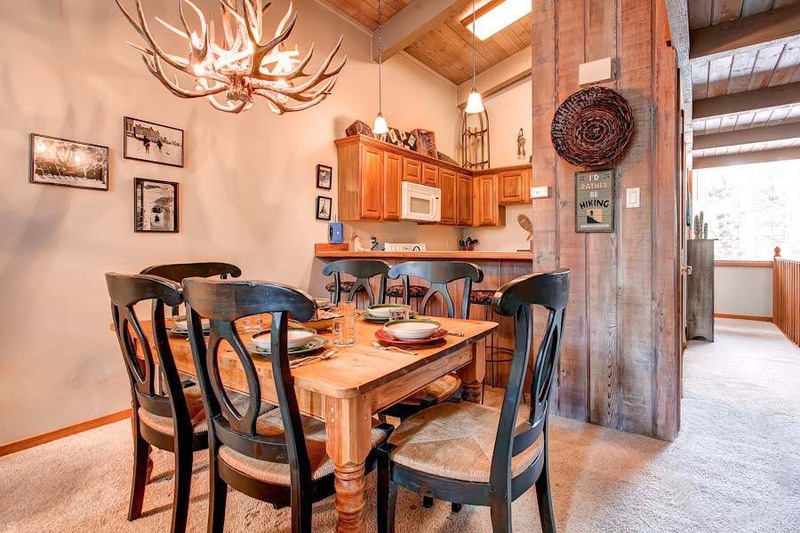 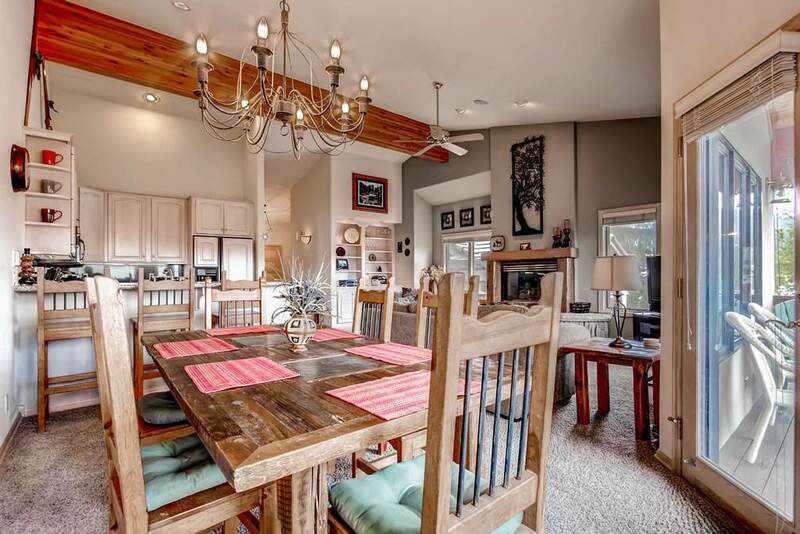 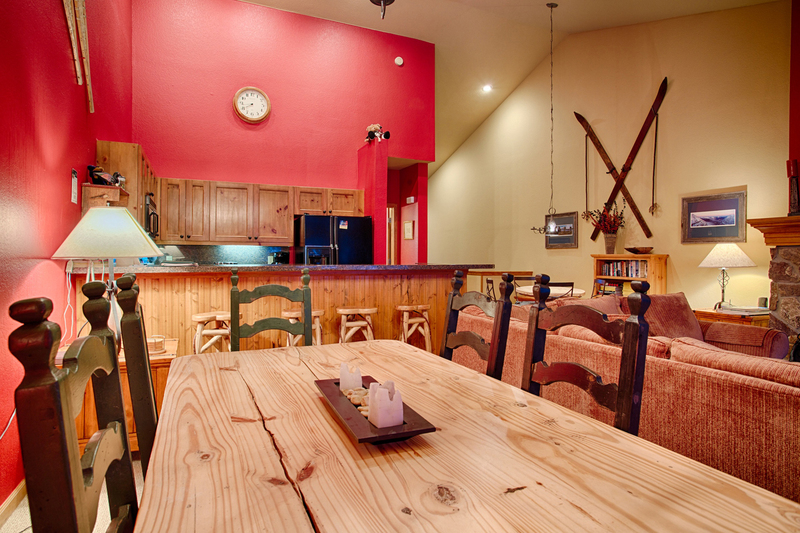 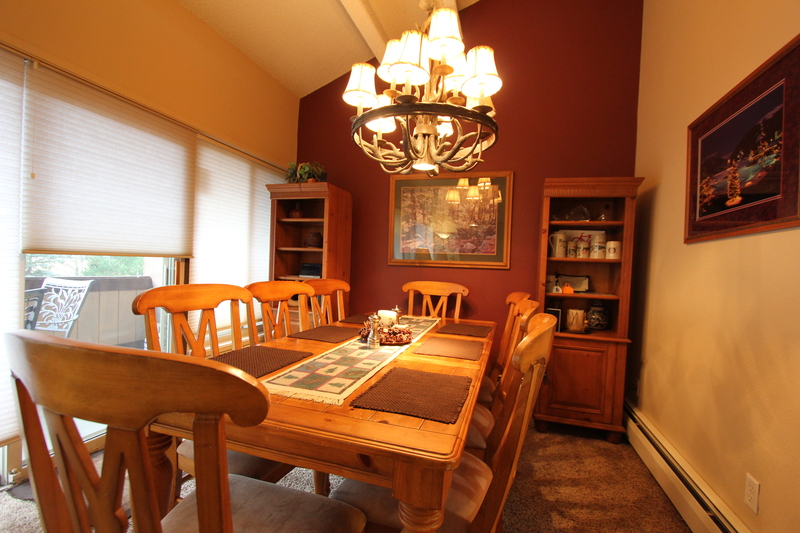 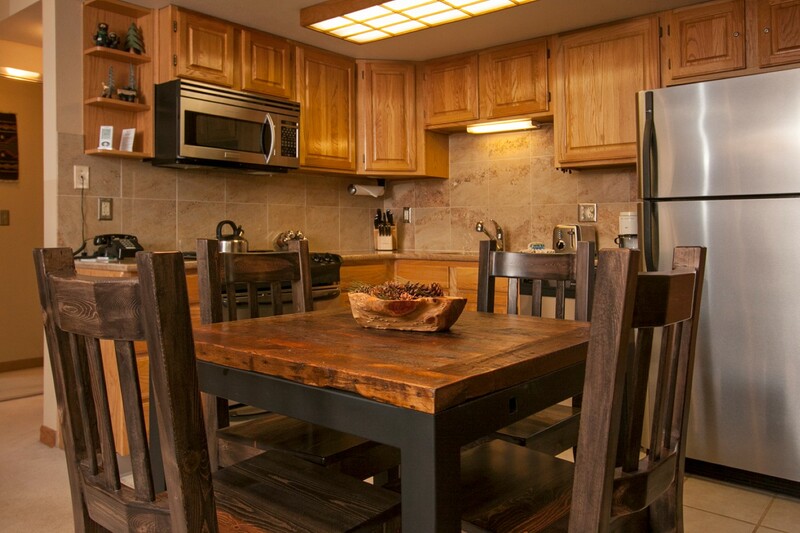 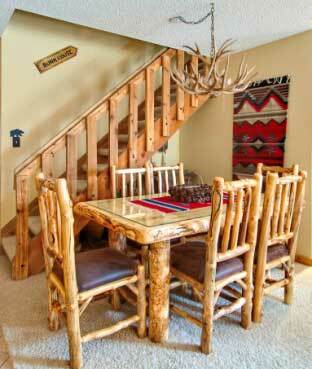 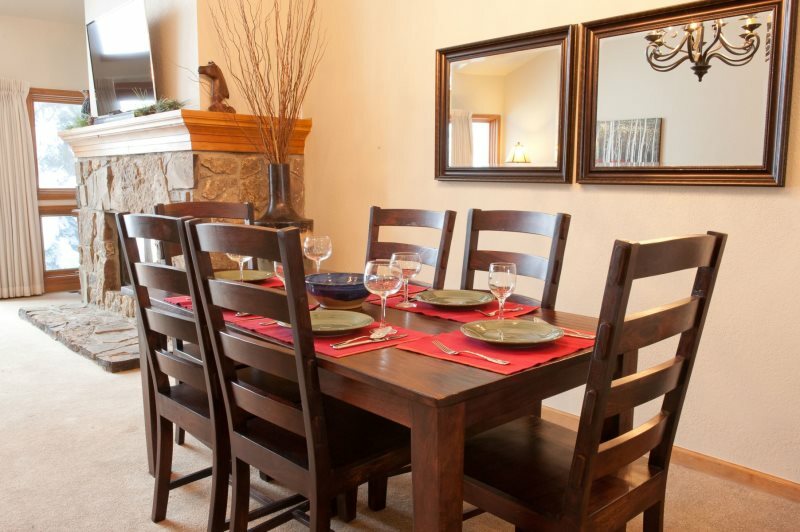 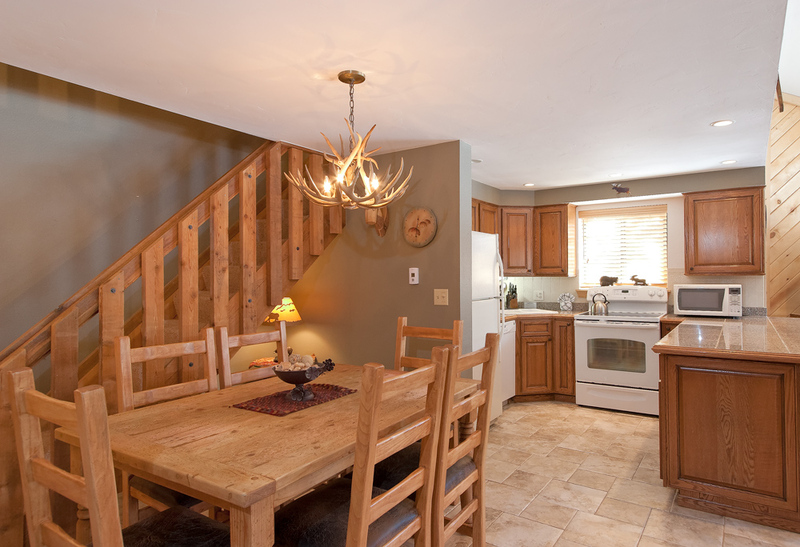 Enjoy your home-cooked meal at the rustic wood dining table for six with dinnerware and glassware provided. 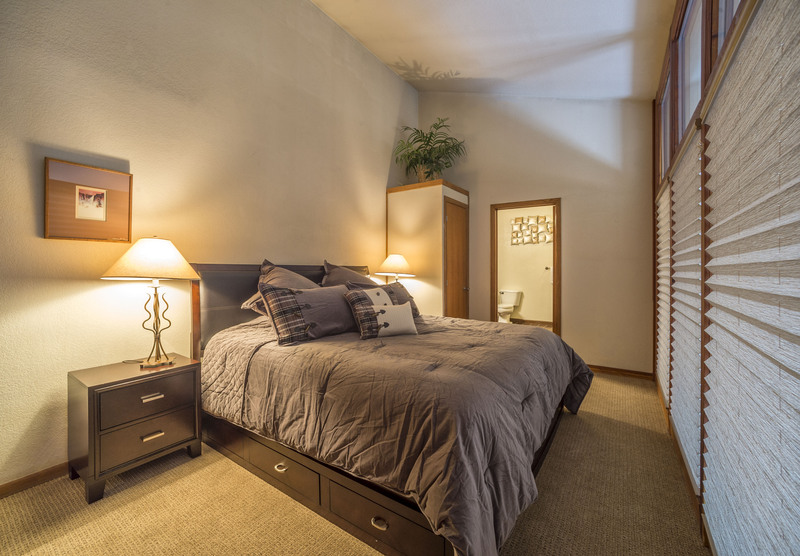 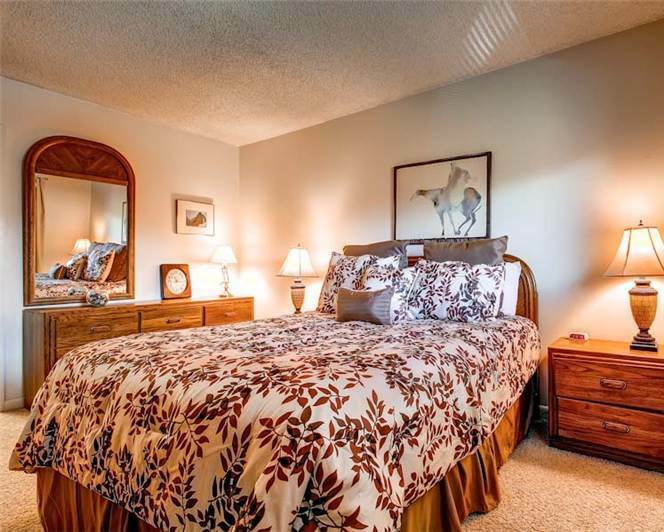 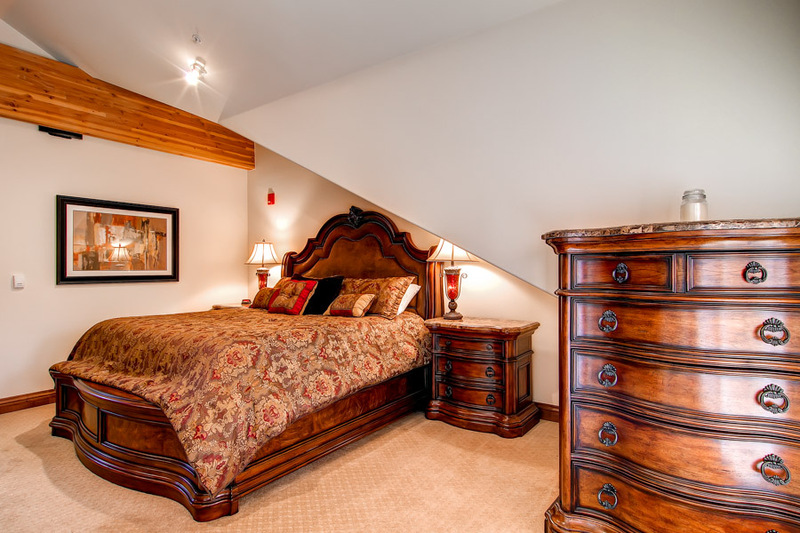 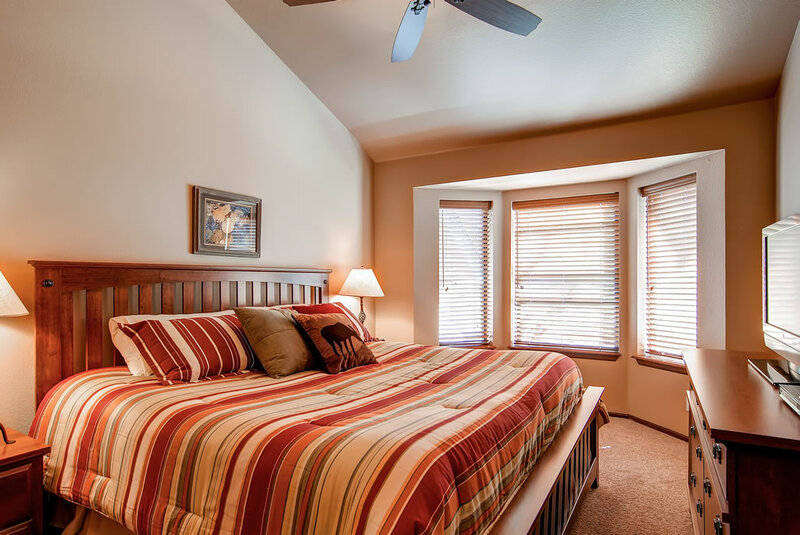 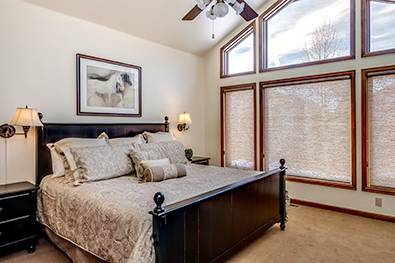 Upstairs from the main level is the master bedroom with a beautifully encased King bed, TV/DVD, cozy side chair for late night reading and a private master bathroom. 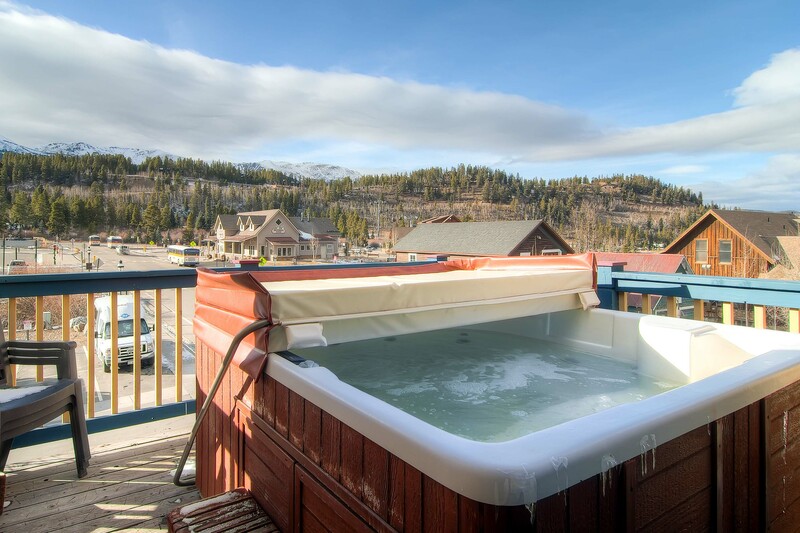 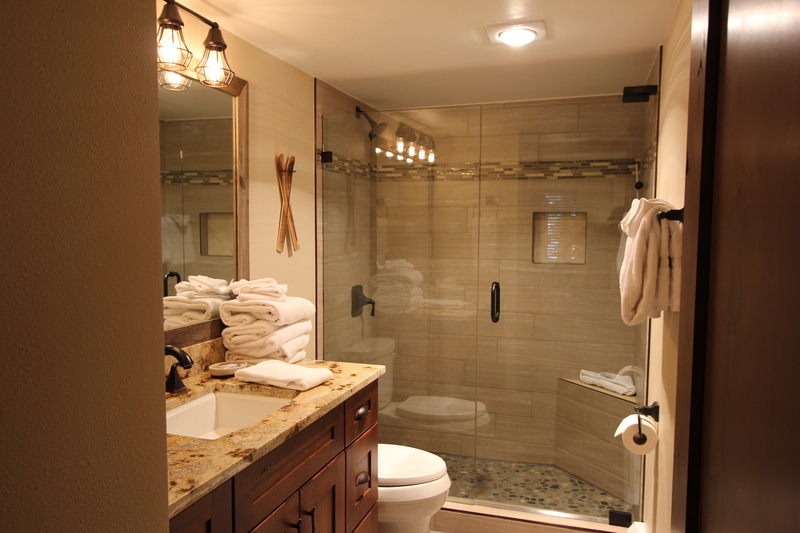 This master bathroom has a jetted bath tub, double sinks and a spacious shower all sure to relax you after a long day of skiing. 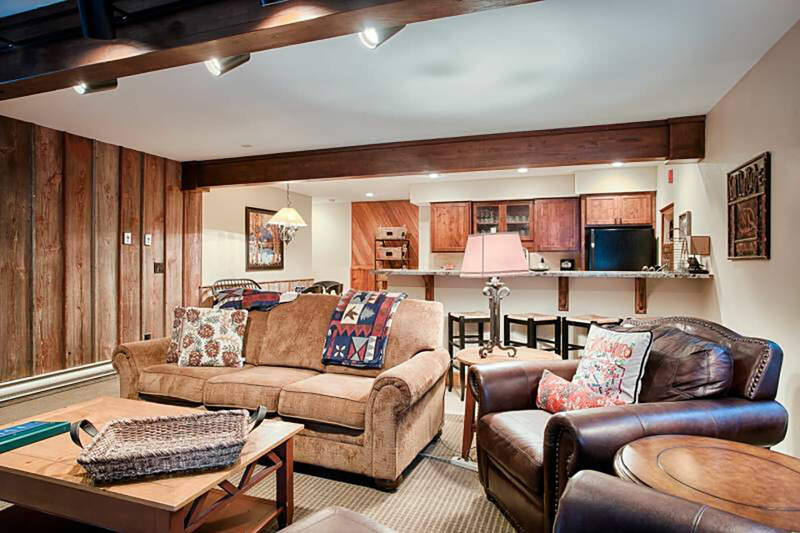 The downstairs den is the perfect late night nook. 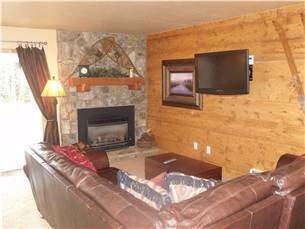 With an entertainment center featuring a 32″ flat screen TV and a plush couch, enjoy your late night DVD without waking the others. 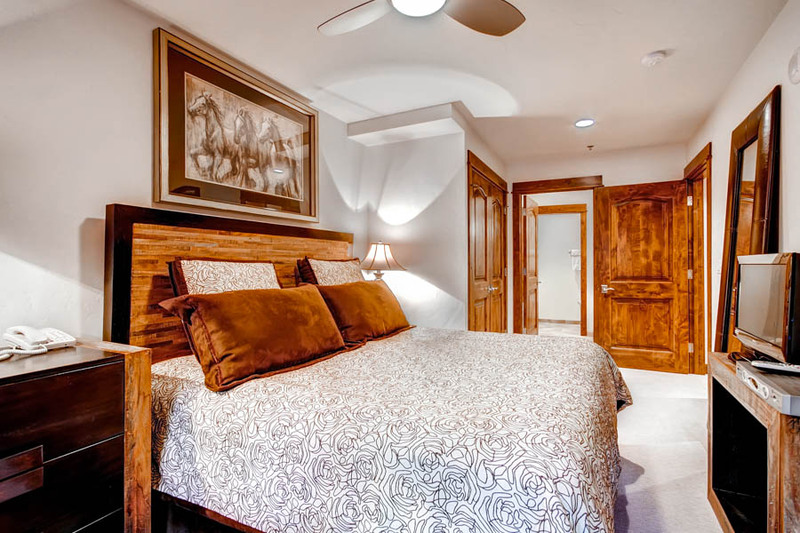 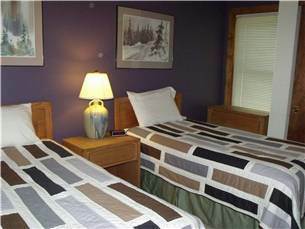 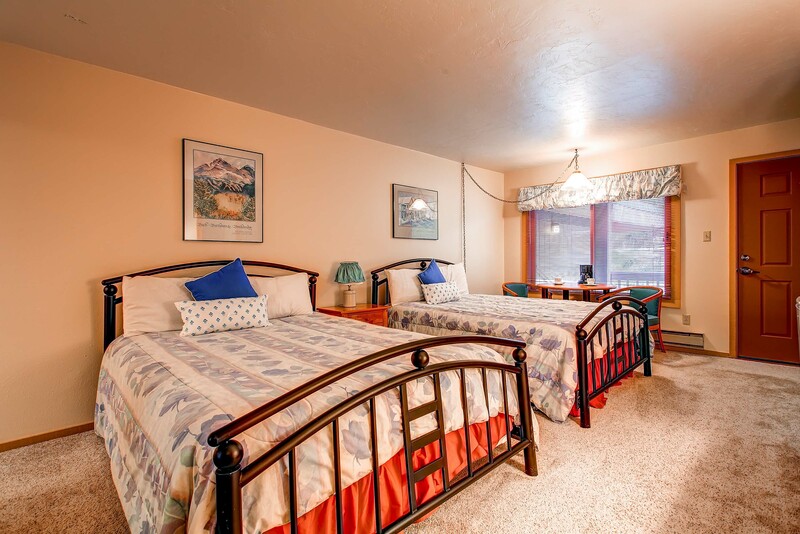 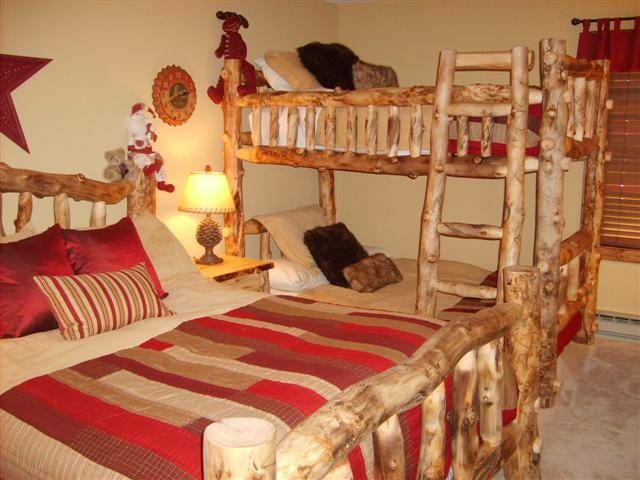 The second bedroom has a Queen bed with a private bathroom, and the third has a new, (Spring 2016), Queen bed with Trundle also with a private bathroom. 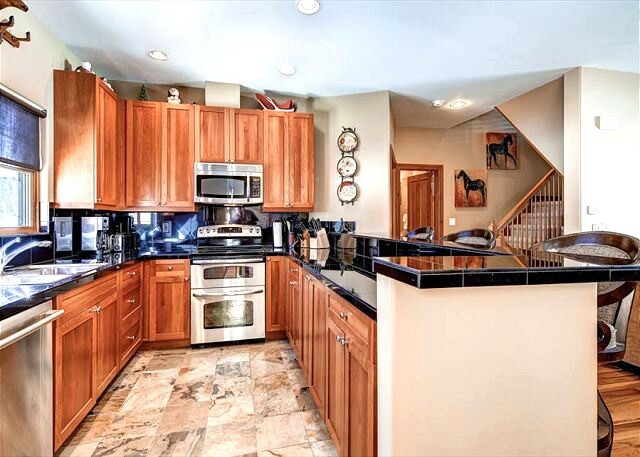 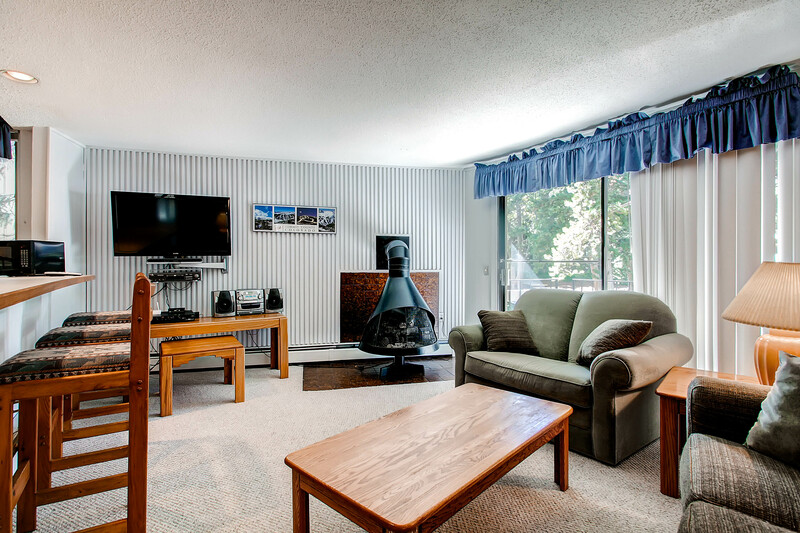 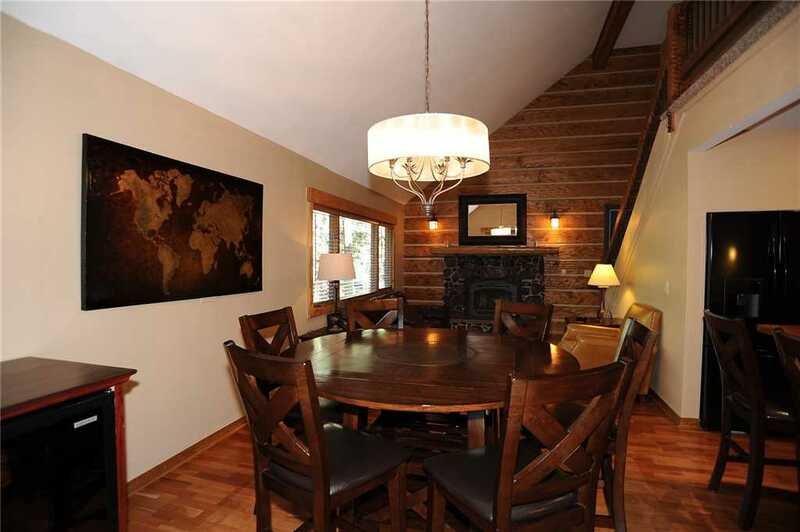 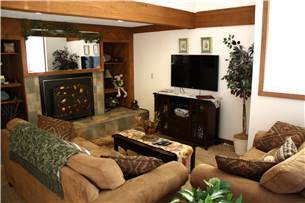 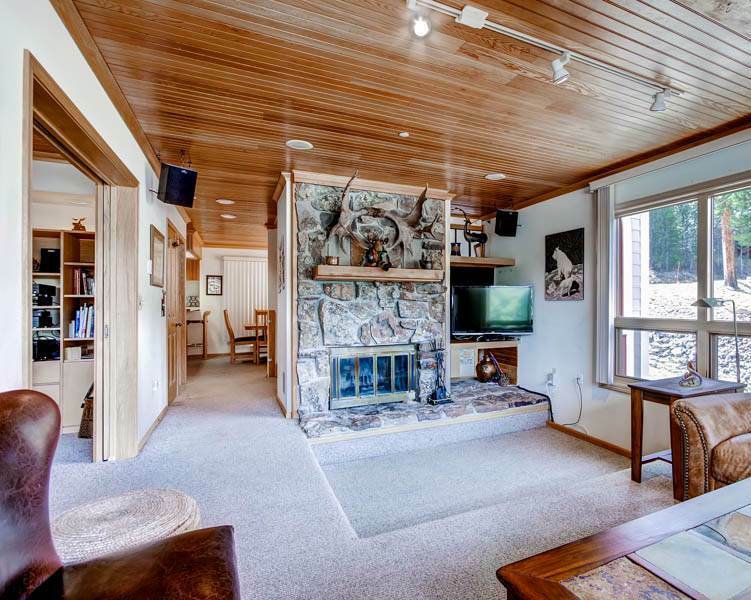 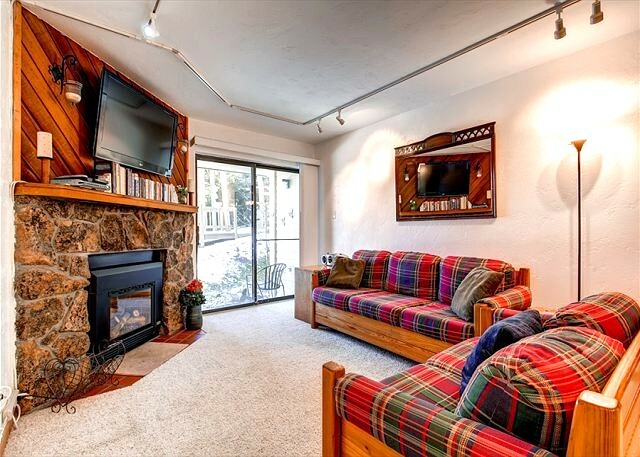 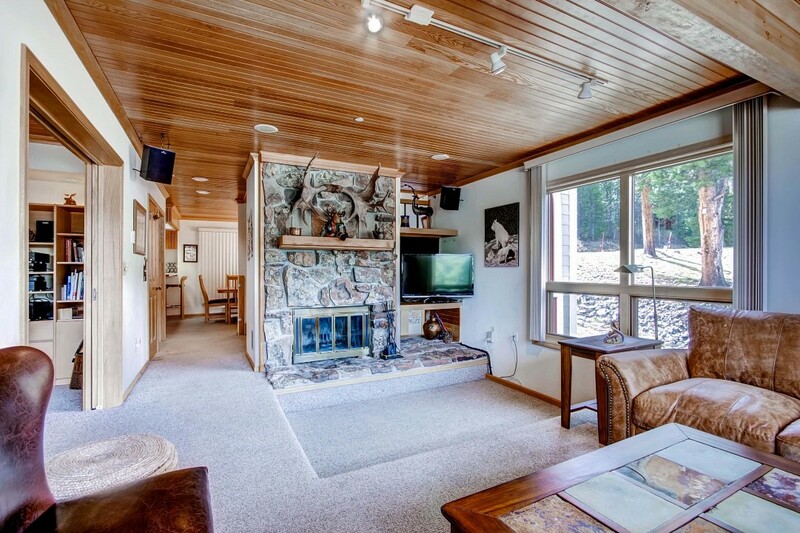 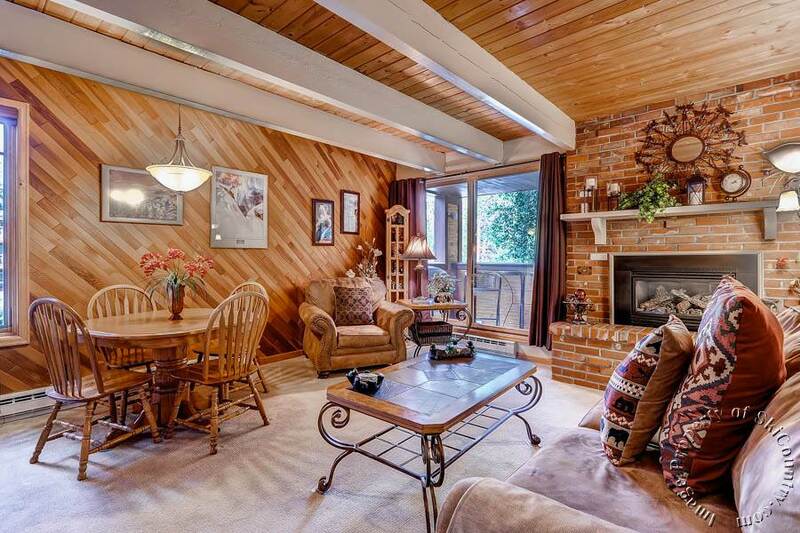 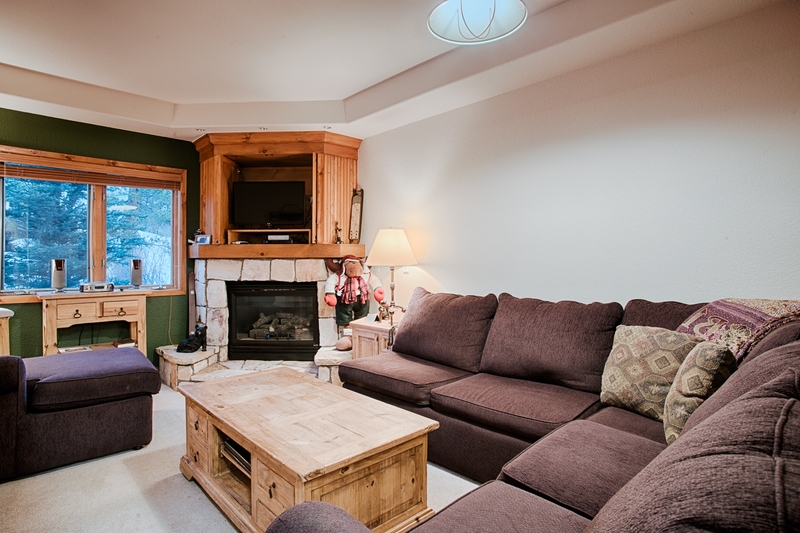 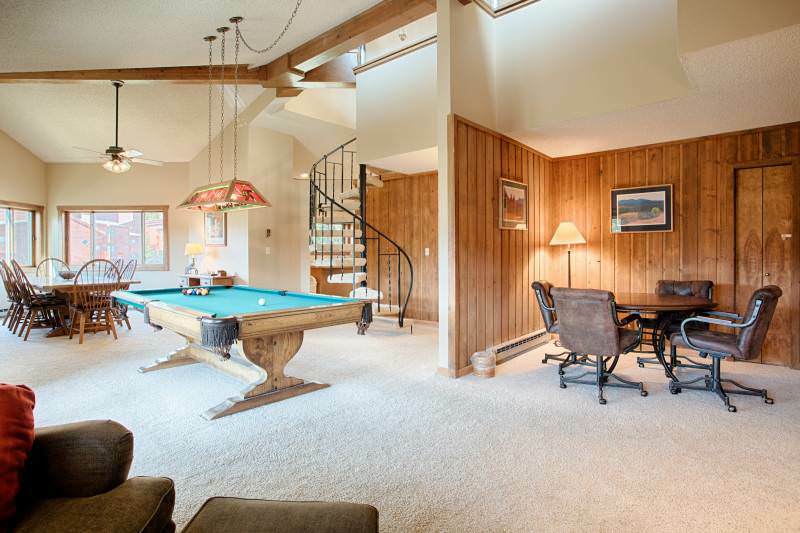 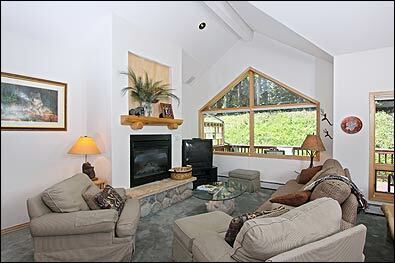 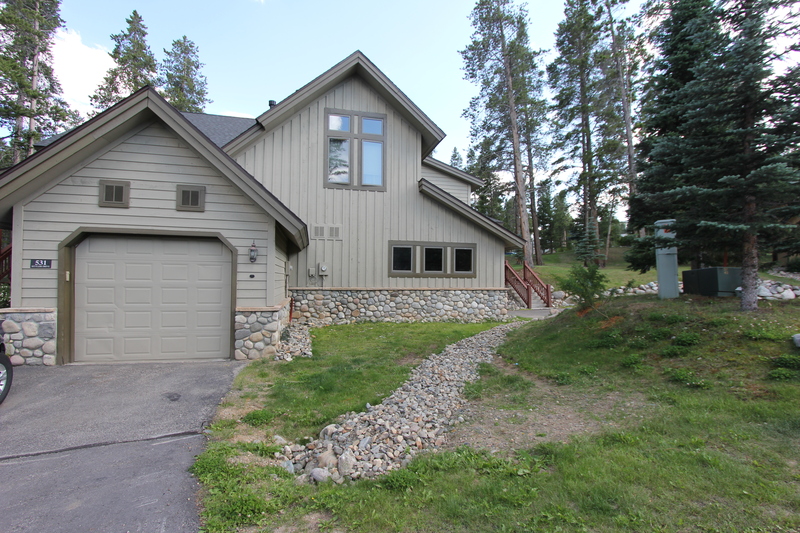 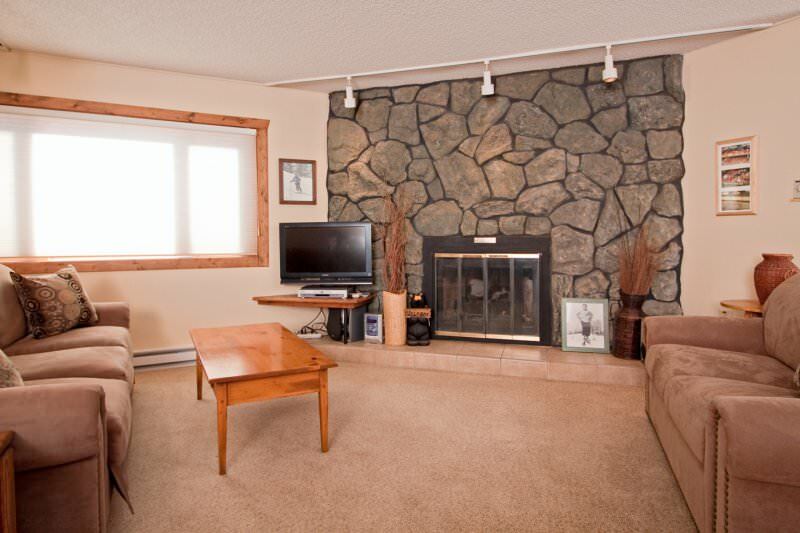 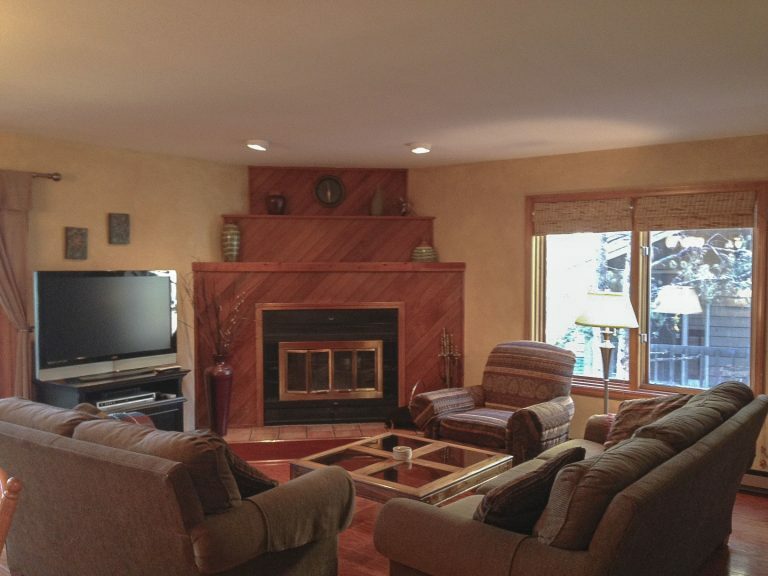 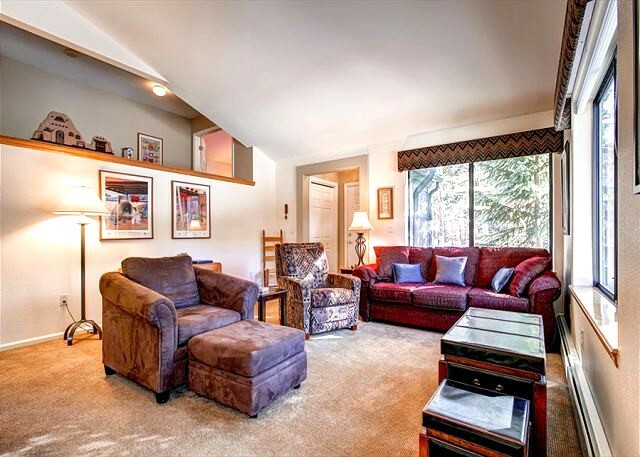 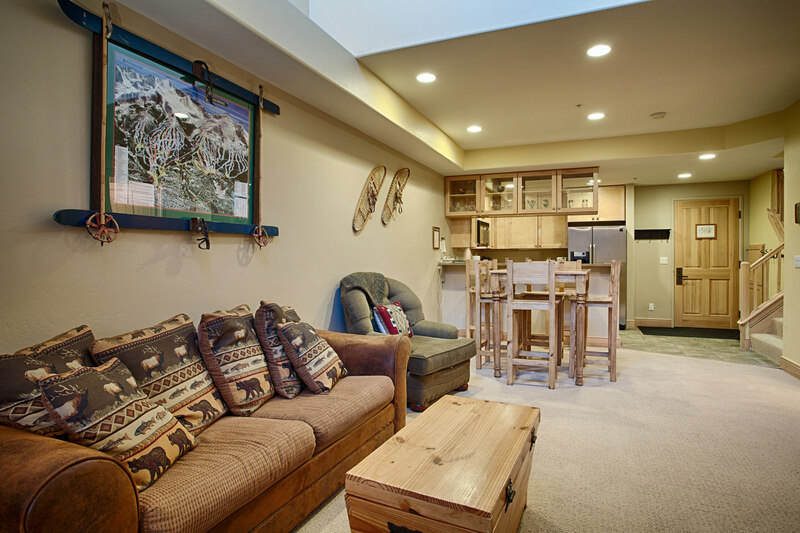 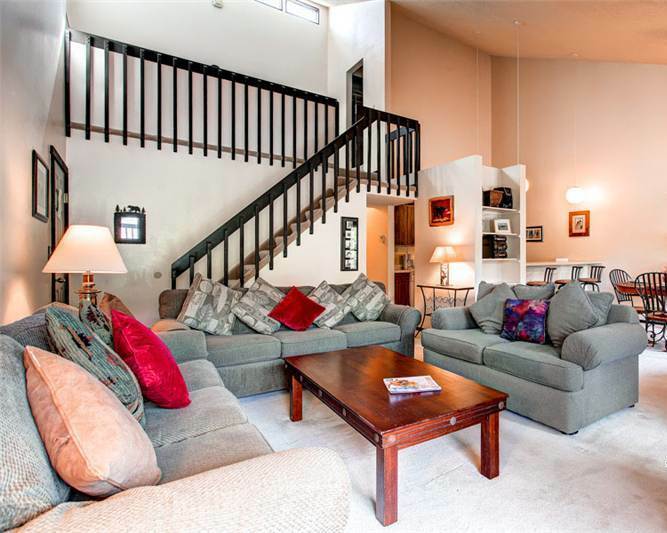 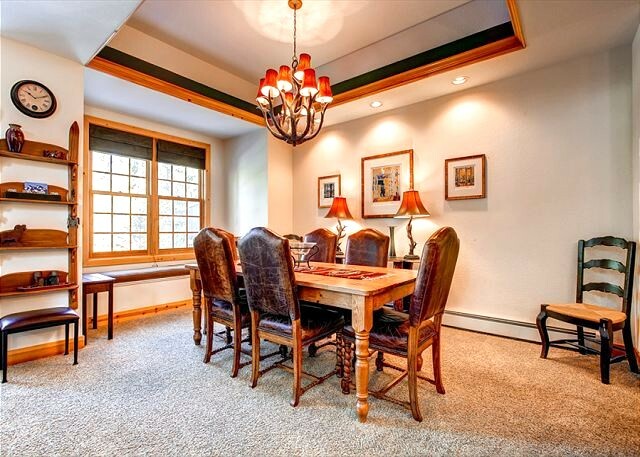 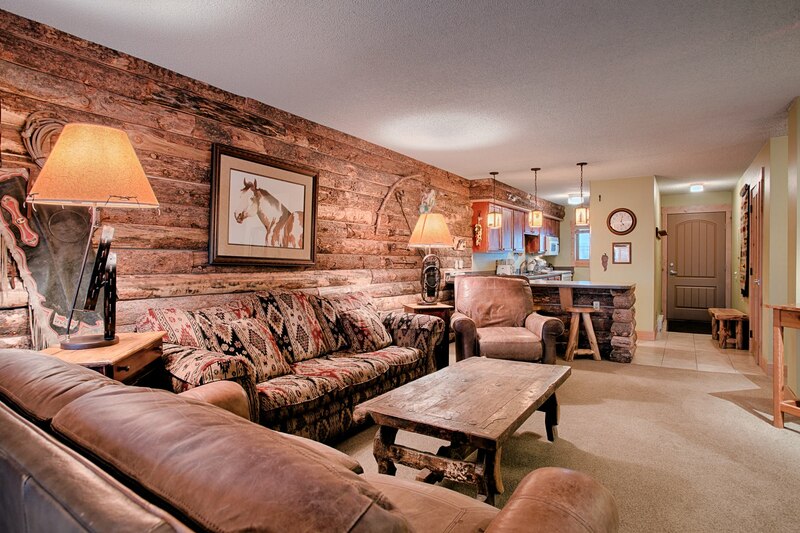 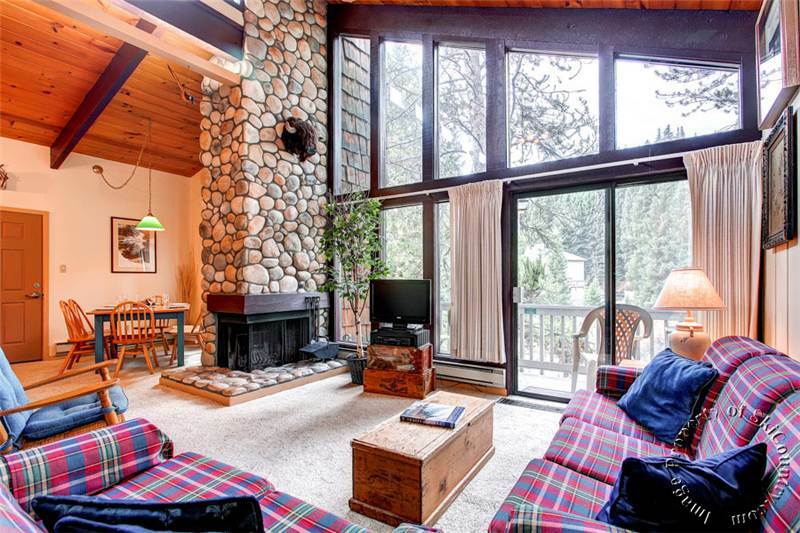 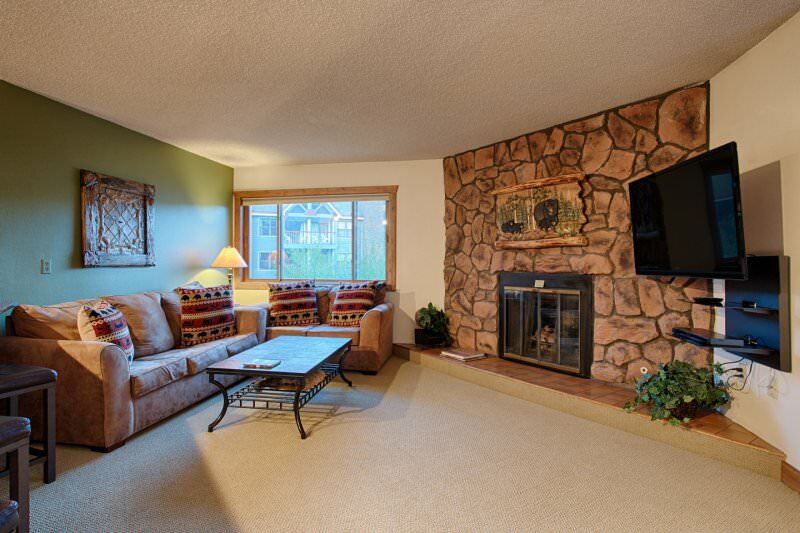 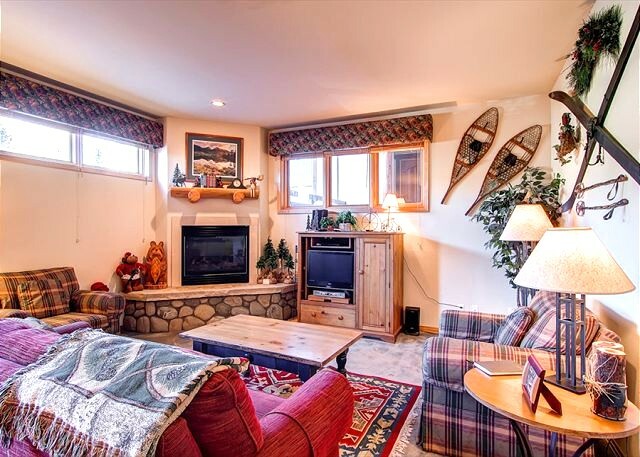 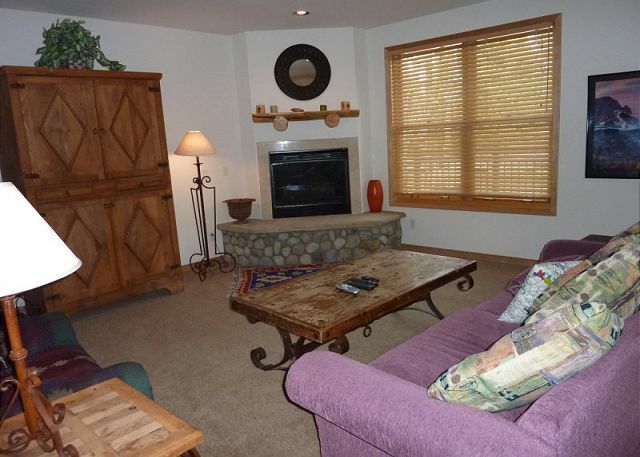 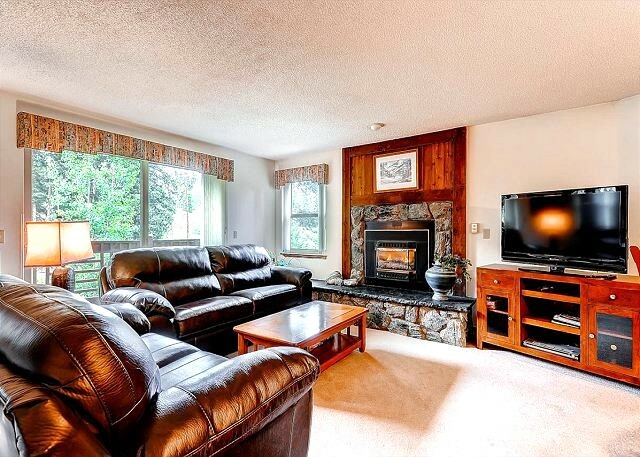 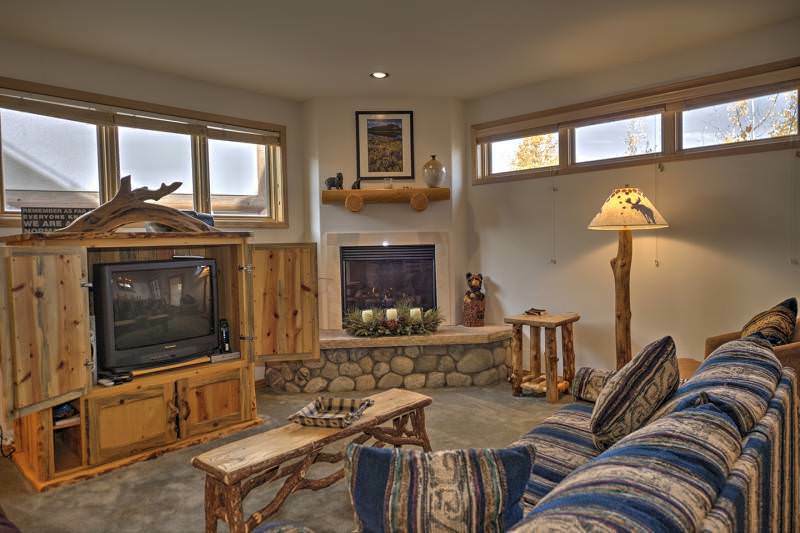 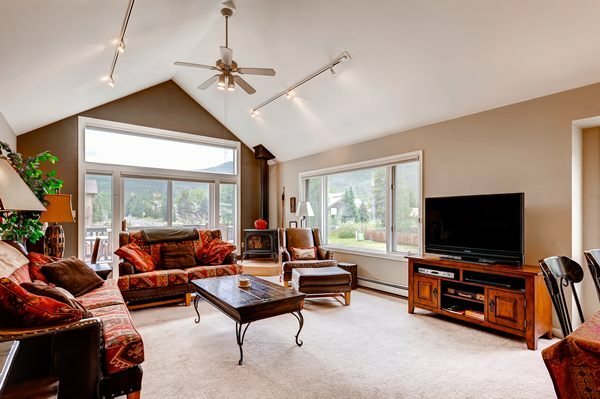 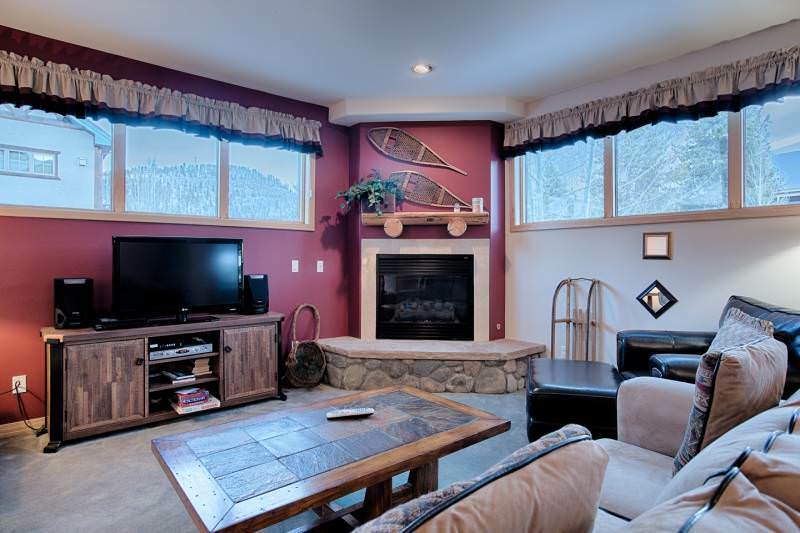 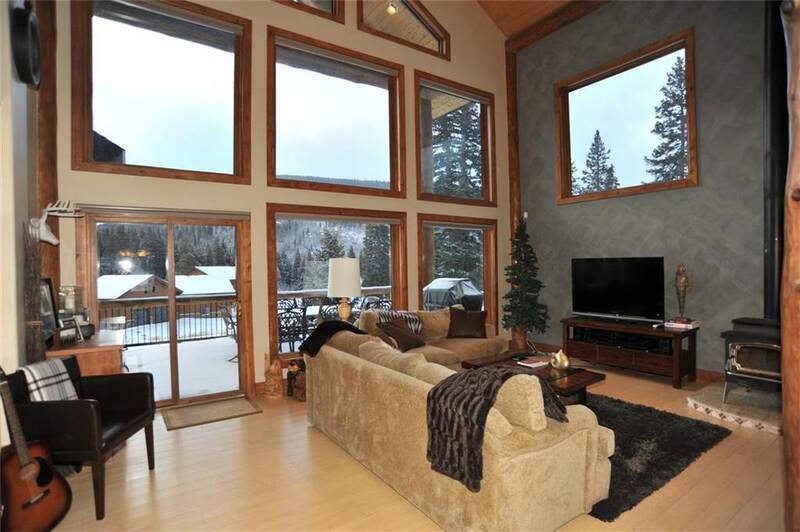 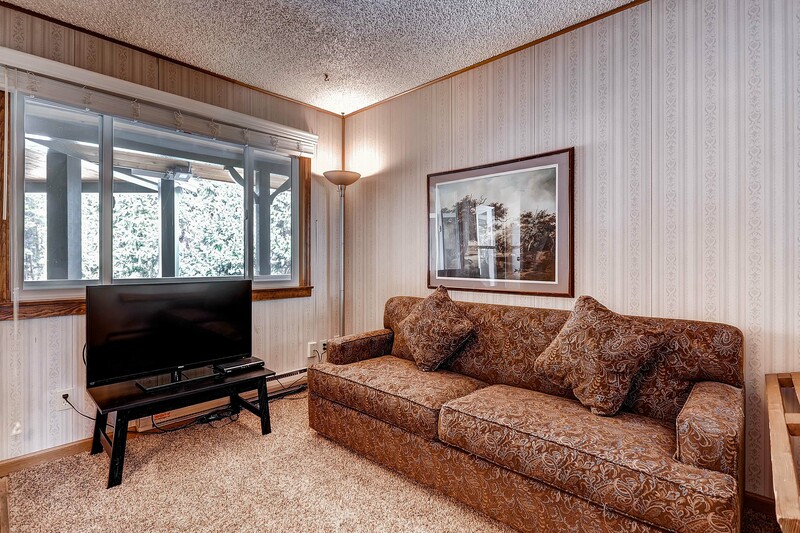 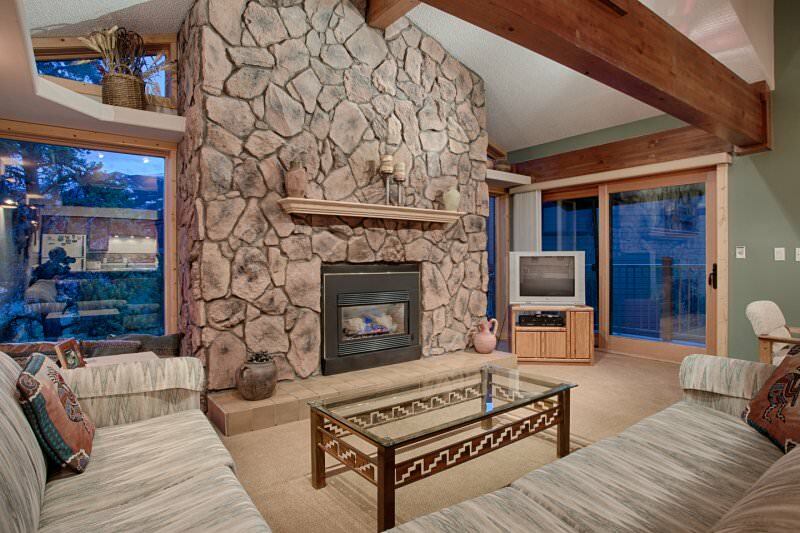 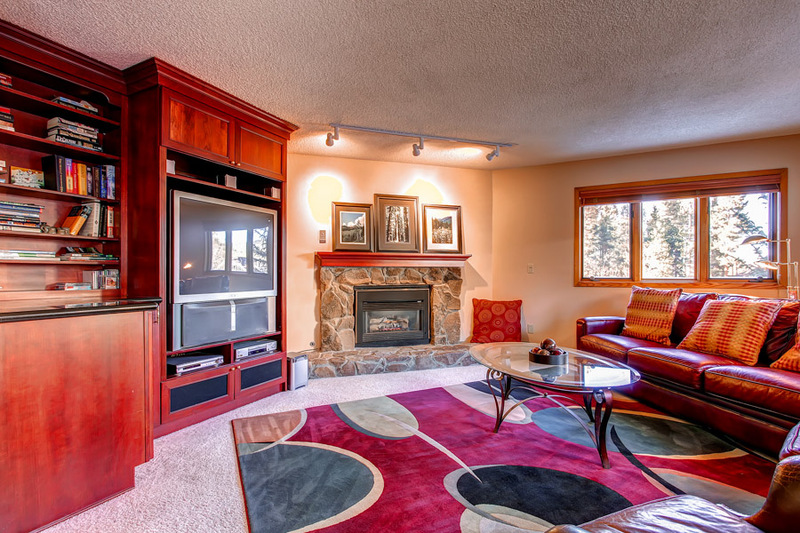 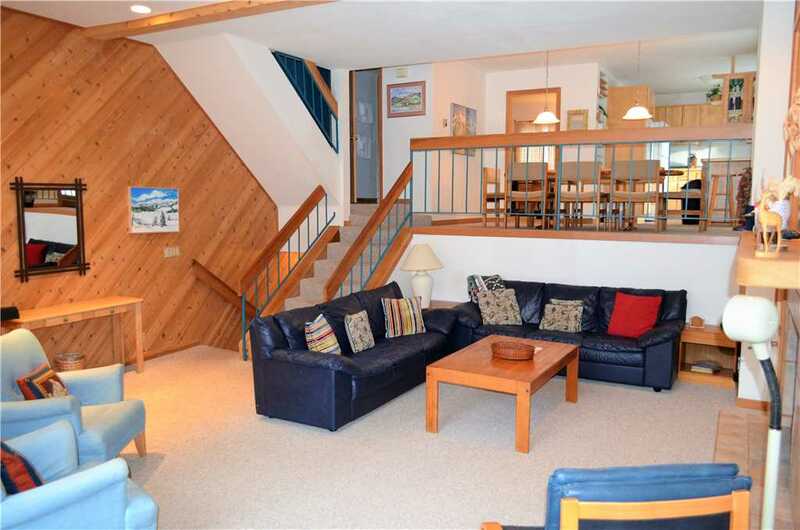 From this basement level you can walk outside and be just steps from the ski run. 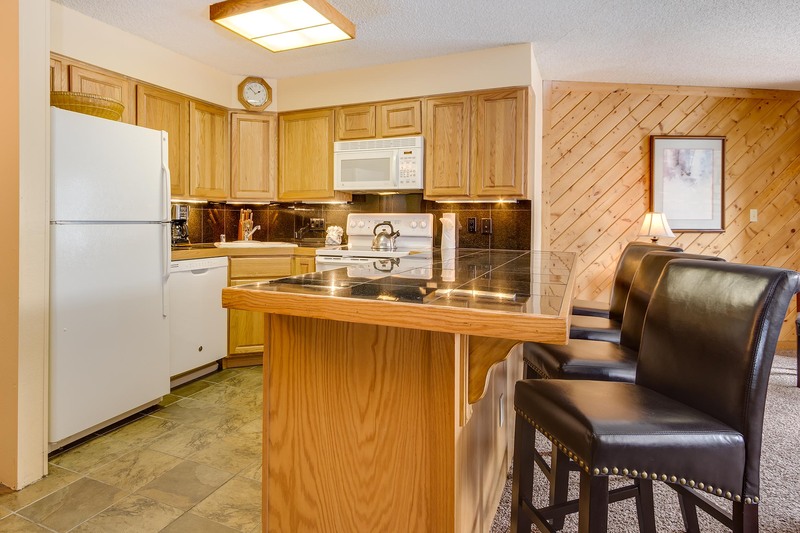 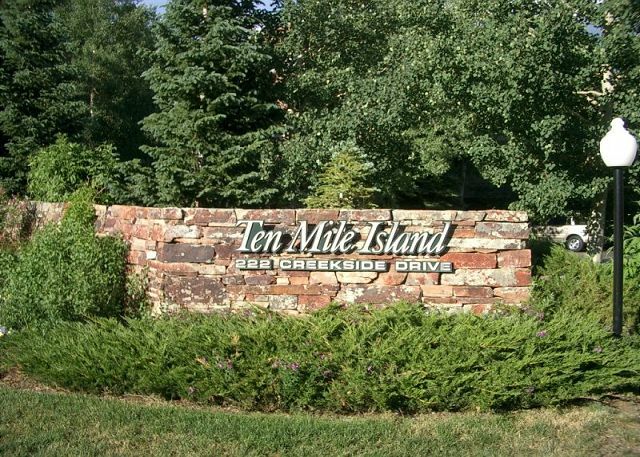 Other amenities include a private hot tub, outdoor table & chairs, Wi-Fi, full-size washer and dryer, game cabinet, and a one car garage.